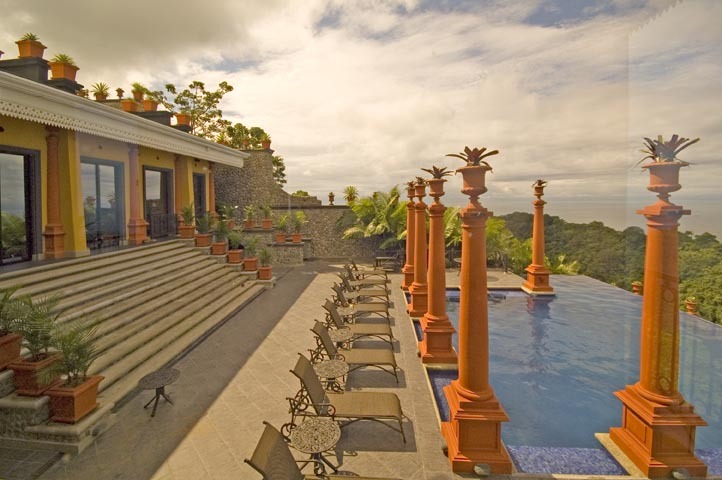 Prized not only for its location, design and décor, but also for its outstanding facilities and first class service, Villa Caletas, is a luxury boutique hotel inspired by Tropical Victorian Architecture with a touch of Neo Classical influence. 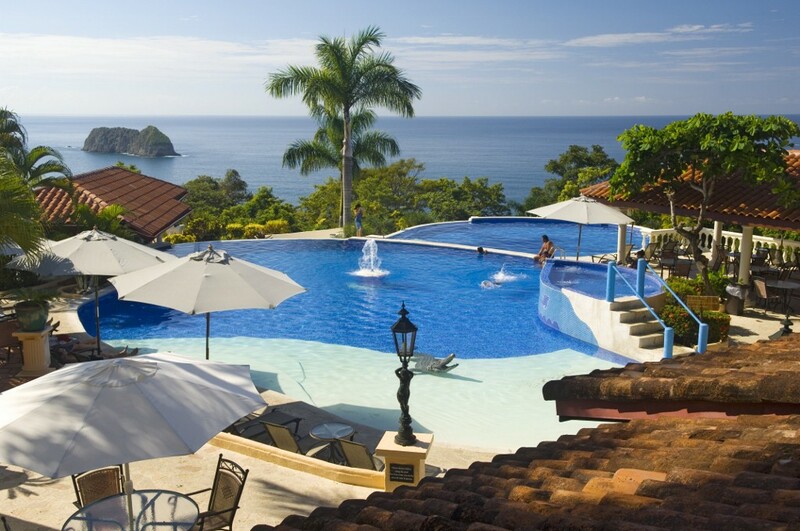 Villa Caletas offers a truly unique combination of mountain and seaside resort for the discriminating traveler. 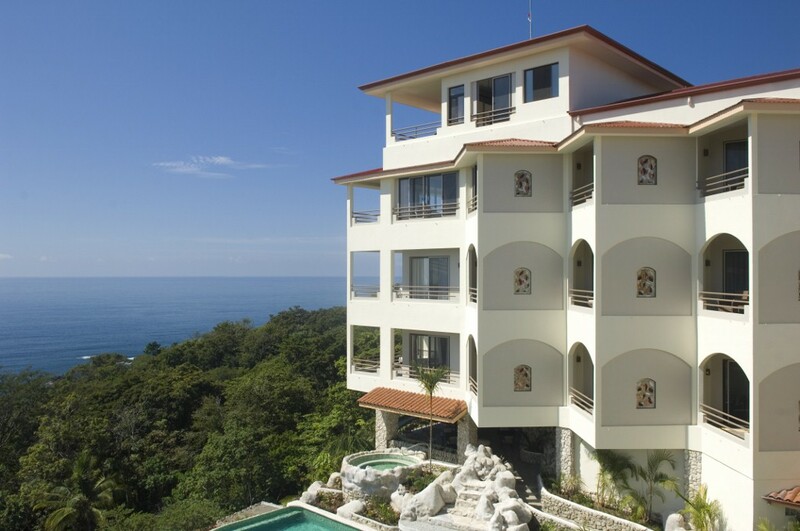 Nestled 1150 feet above the Pacific Ocean on a rainforest hilltop in the Central Pacific coast, this unique hotel overlooks the Nicoya Gulf to the crescent beaches of Jacó, Herradura with spectacular 360-degree panoramic views. 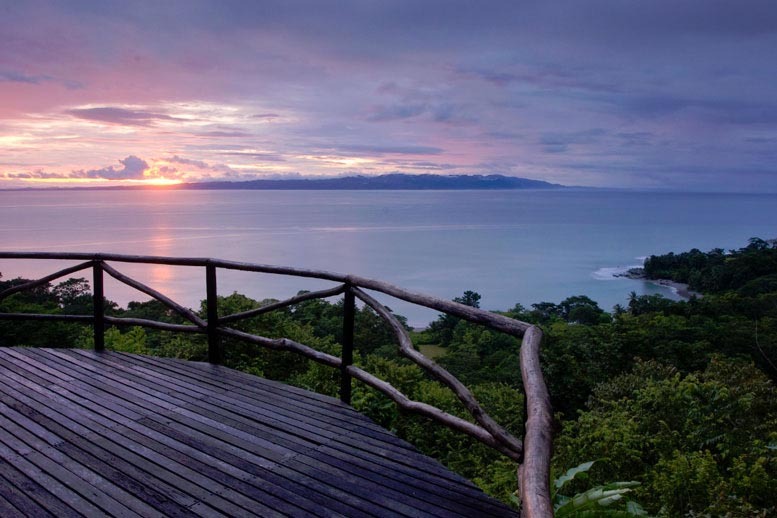 Lush tropical rainforests with the emerald green ocean next door complement some of the most breathtaking sunsets you will ever see. 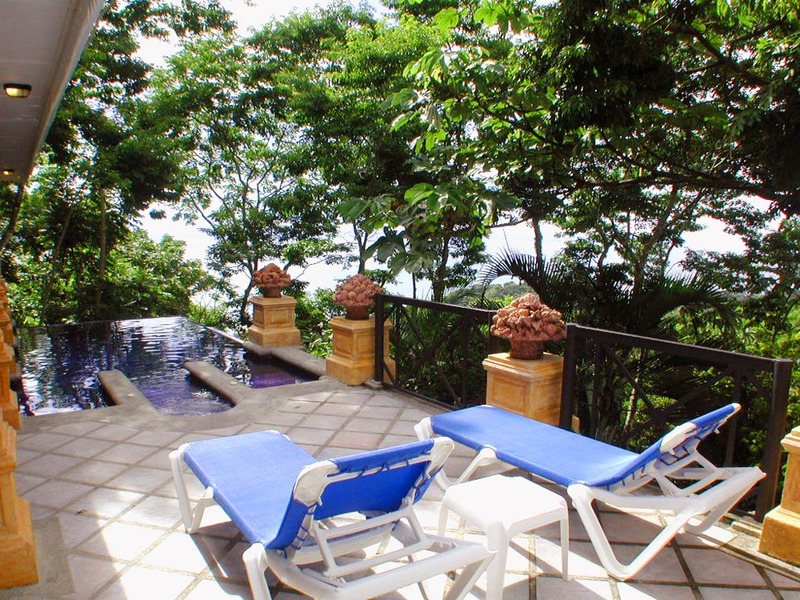 At the bottom of the mountain, Villa Caletas offers its own private beach. 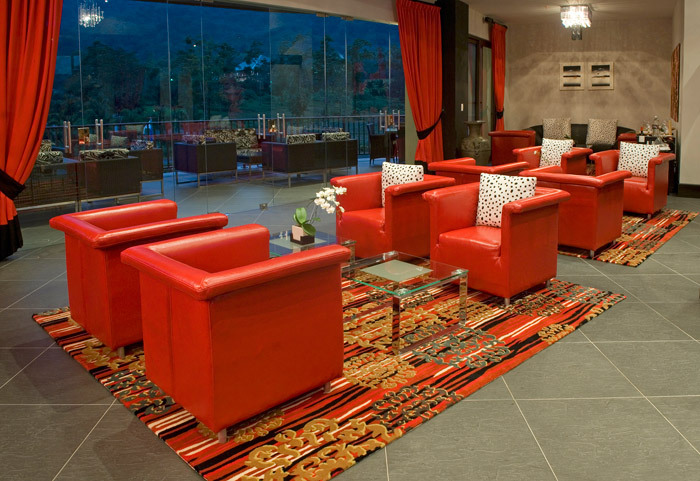 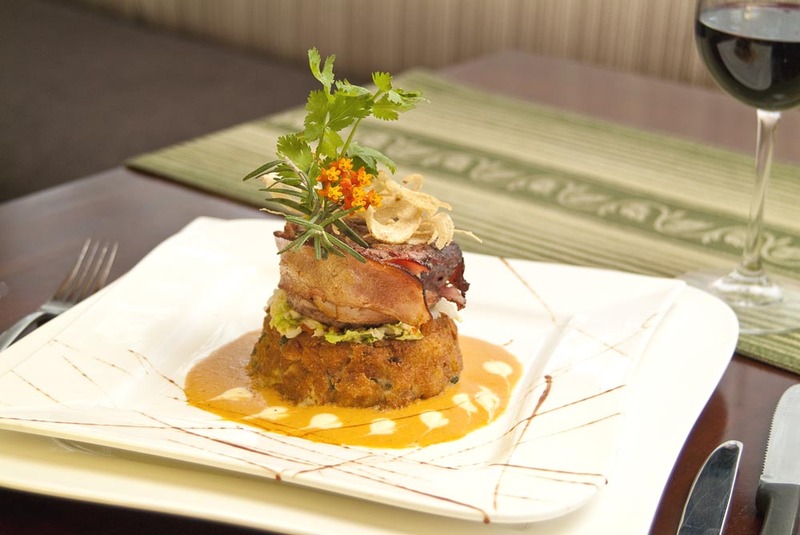 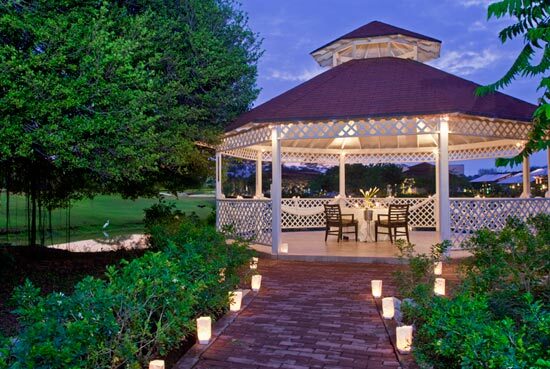 The experience at Preserve at Los Altos Resort defines the term, casual elegance. 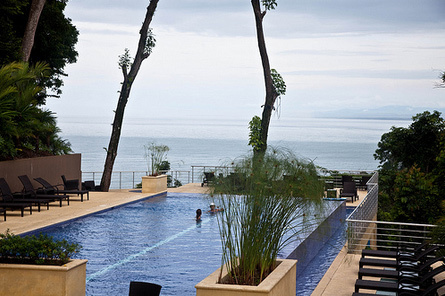 This hotel in Manuel Antonio appeals to those seeking a welcoming and unpretentious ambiance that seamlessly balances style and comfort with breathtaking natural surroundings. 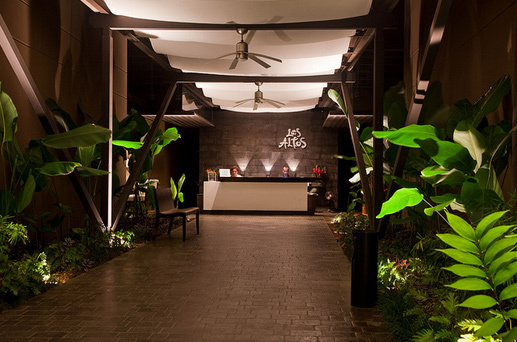 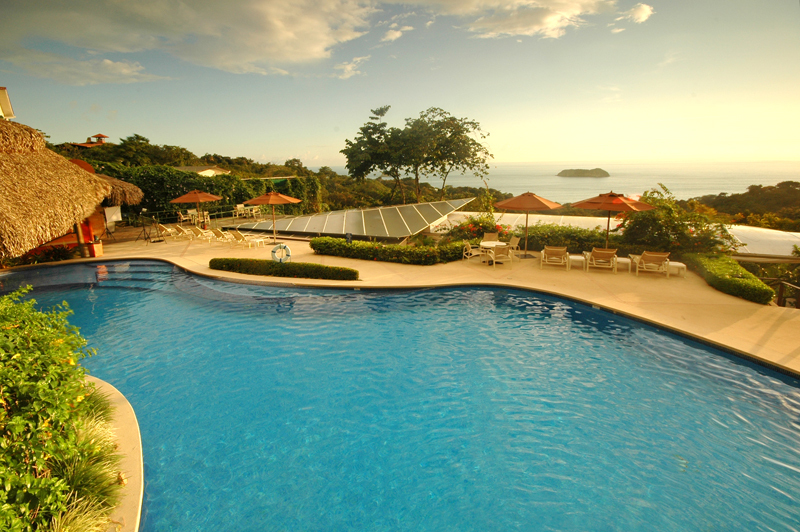 Unlike any other resort Manuel Antonio, Los Altos has synchronized elegant and spacious luxury accommodations with an attentive staff dedicated to making your stay unforgettable. 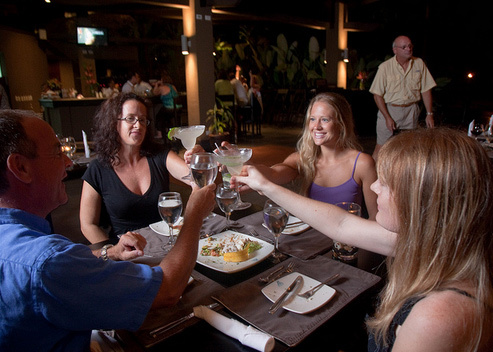 In Costa Rica there is a beautiful expression that sums up what you should expect when you’re here. 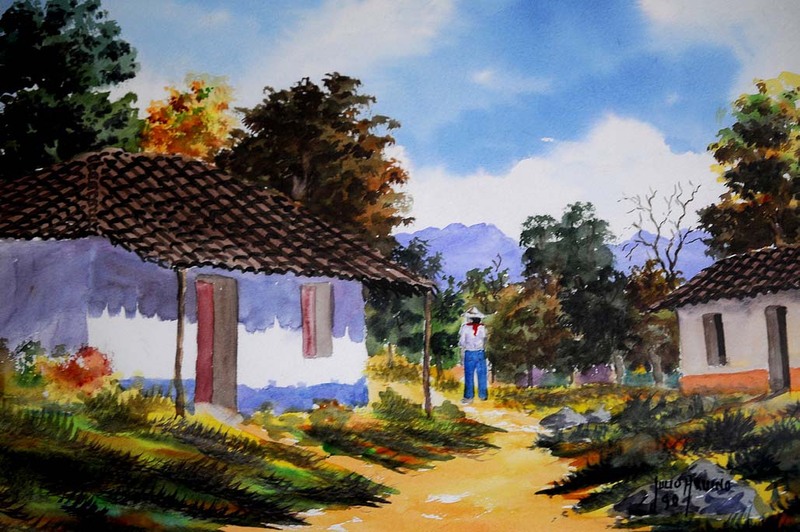 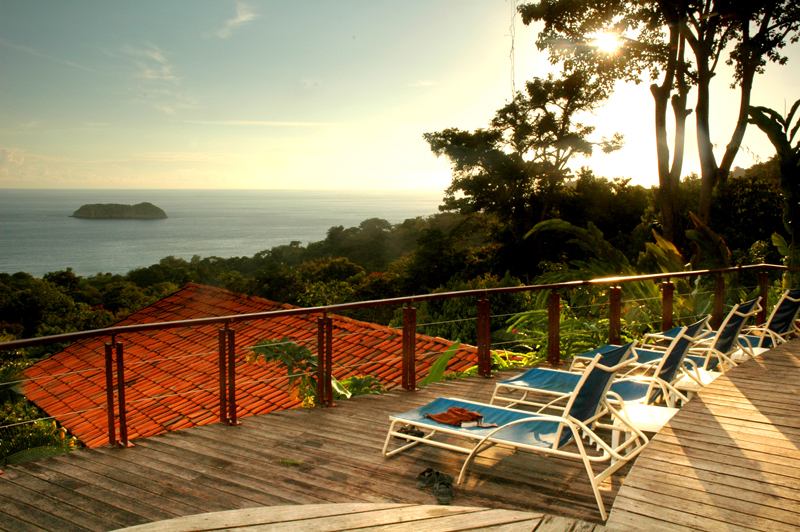 The expression, which seems to fully embody the pulse and harmony of the country, is pura vida — pure life. 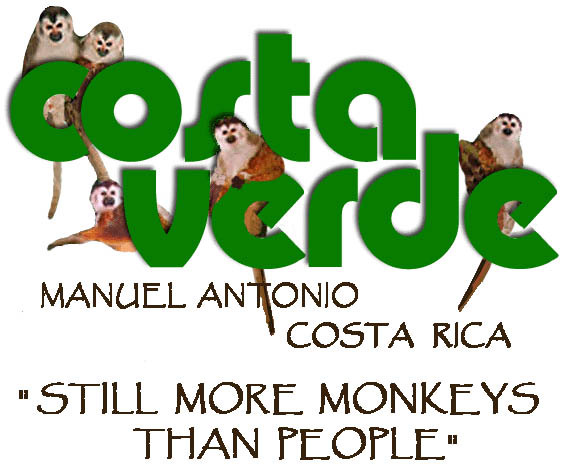 We could not agree more. 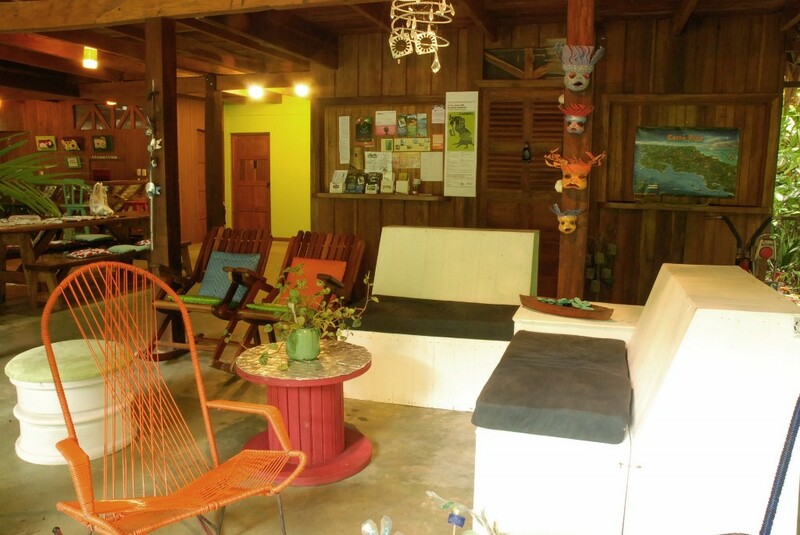 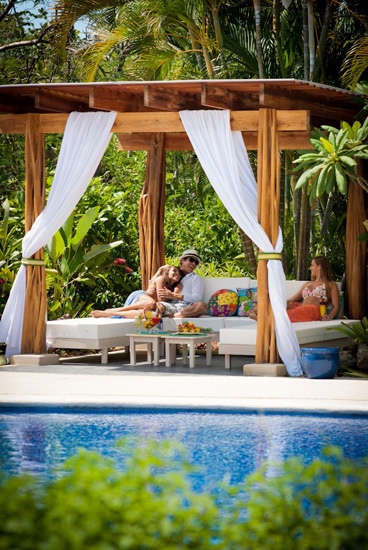 PURA VIDA…Pure Life…come live yours now. 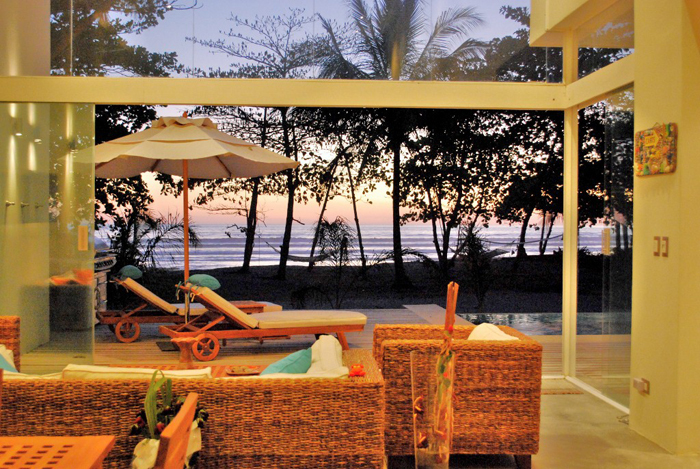 Cala Luna Luxury Boutique Hotel & Villas is located in Langosta Beach, on the North Pacific coast of Costa Rica in Central America. 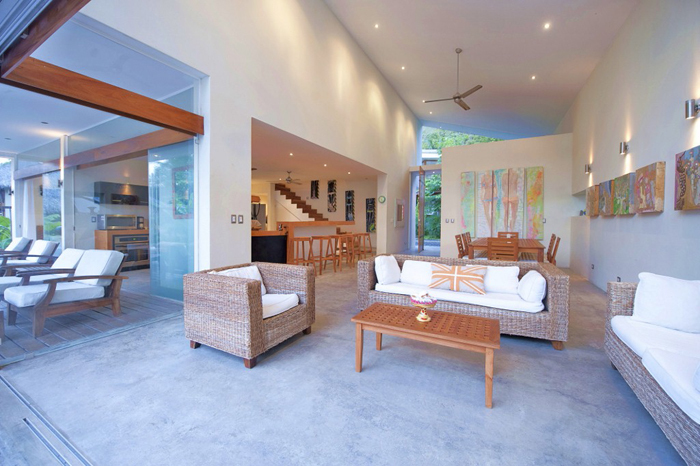 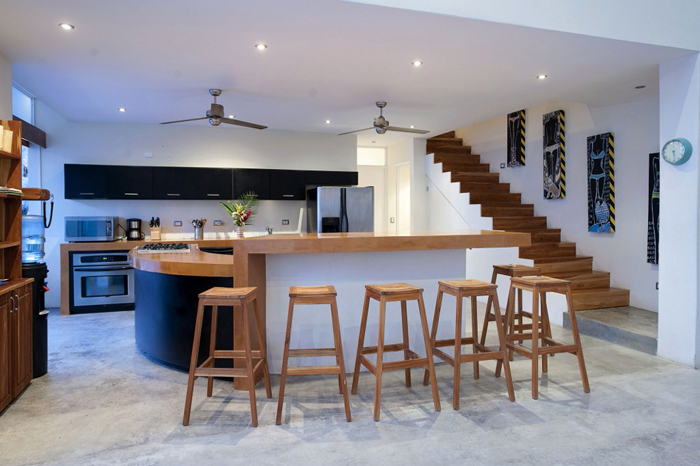 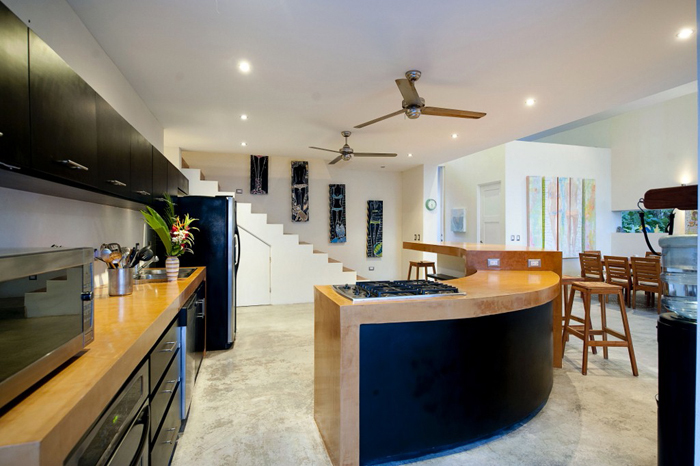 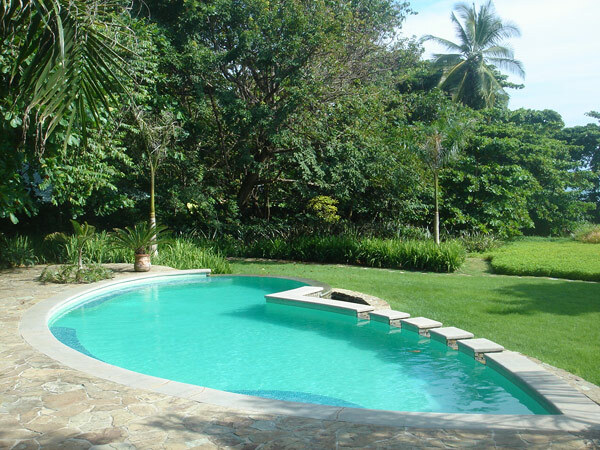 The property is adjacent to the fantastic area of Tamarindo, one of Costa Rica´s most popular beaches known for its crystal clear ocean, exquisite nature and stunning sunsets. 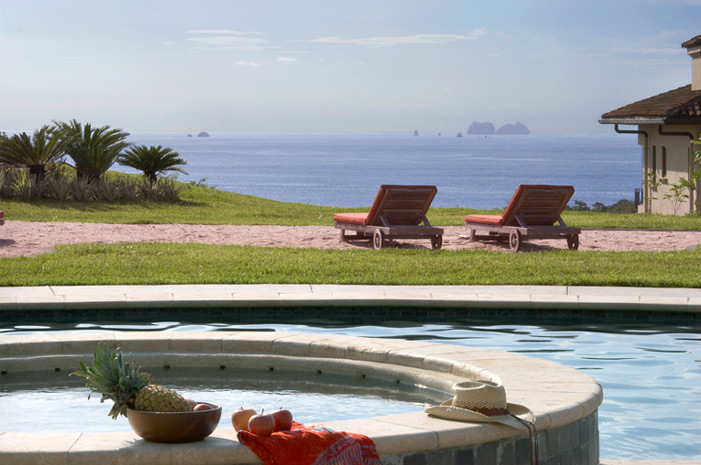 Cala Luna consists of 21 exquisitely designed spread out villas, each with a private pool, 20 fantastic hotel rooms and two superb Restaurants “Cala Moresca” and “La Caletta Lounge”. 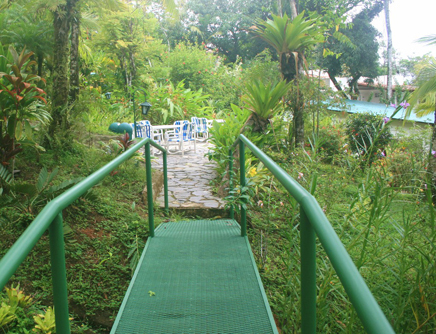 A short path takes you from the hotel restaurants and swimming pool area to the most beautiful and private beach point around. 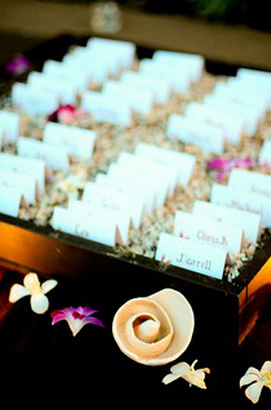 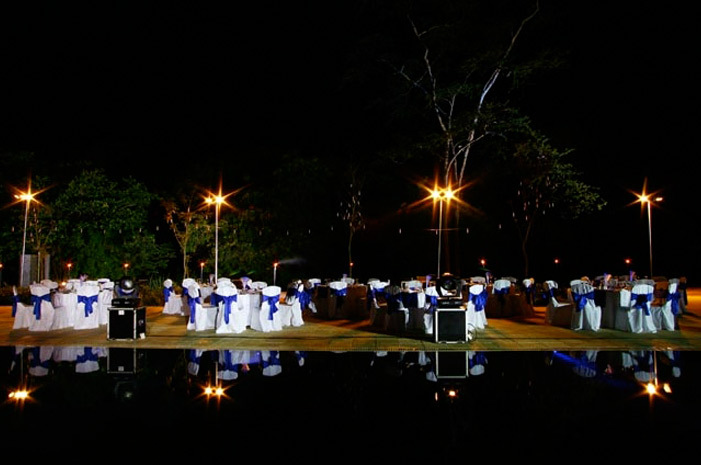 It’s pristine waters and white sand is the perfect setting for weddings and other special events for which the friendly staff of Cala Luna comes together to create memorable moments. 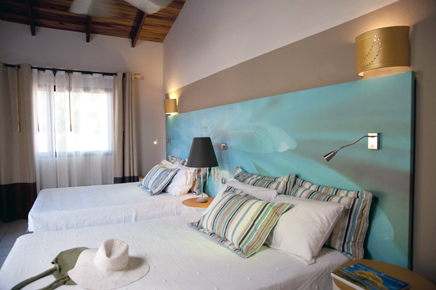 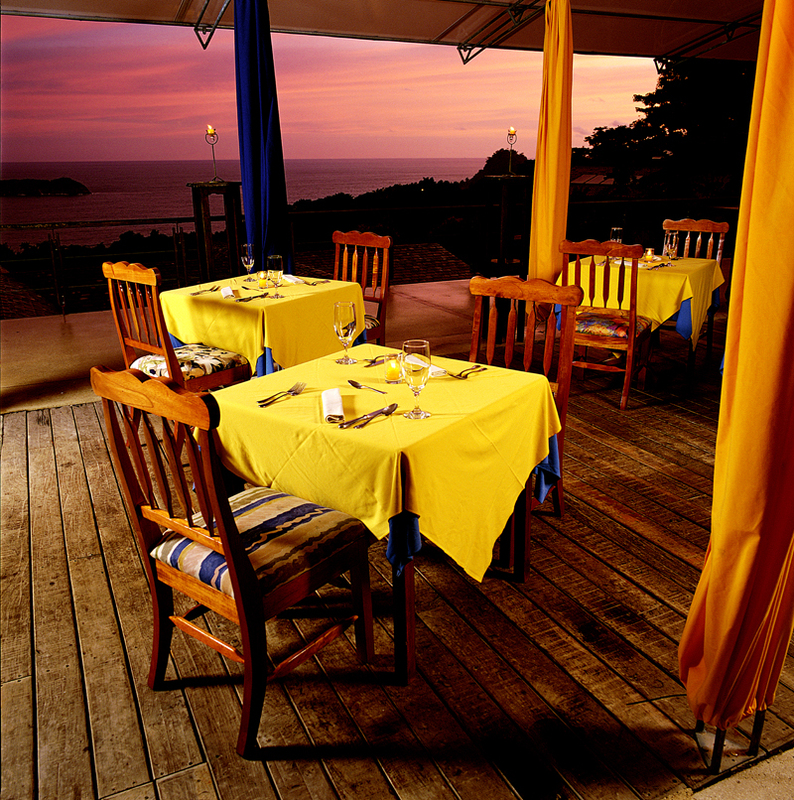 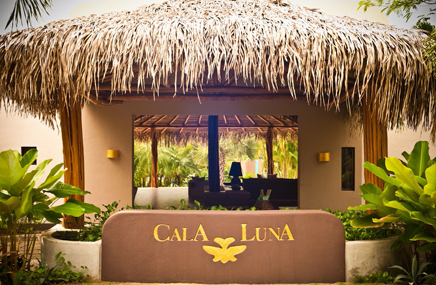 At Cala Luna hospitality is taken to another level while pampering our clients in style and sophistication. 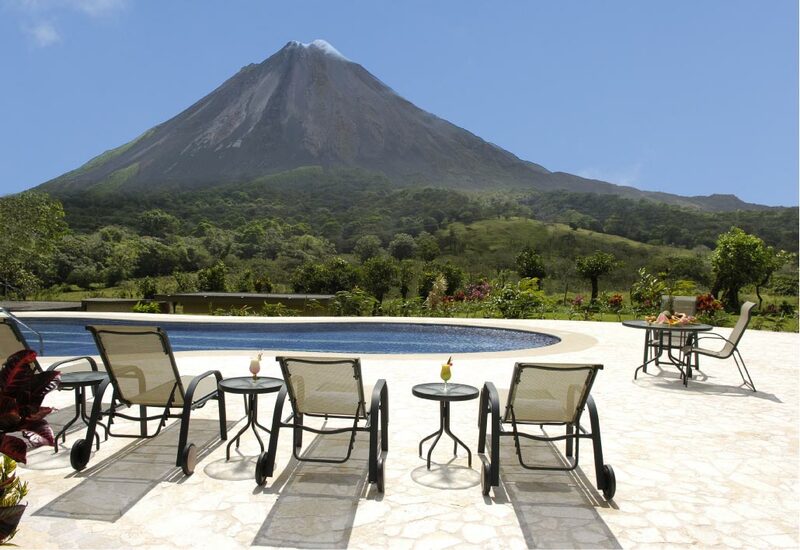 Arenal Nayara Hotel & Gardens is a luxury boutique hotel providing guests with premium amenities, personalized service at affordable rates. 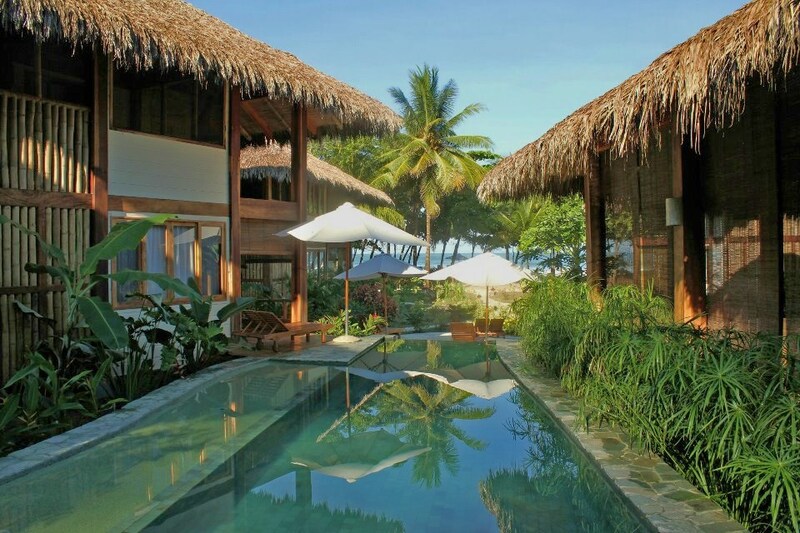 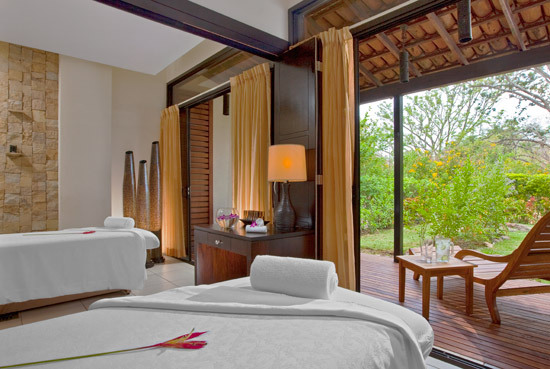 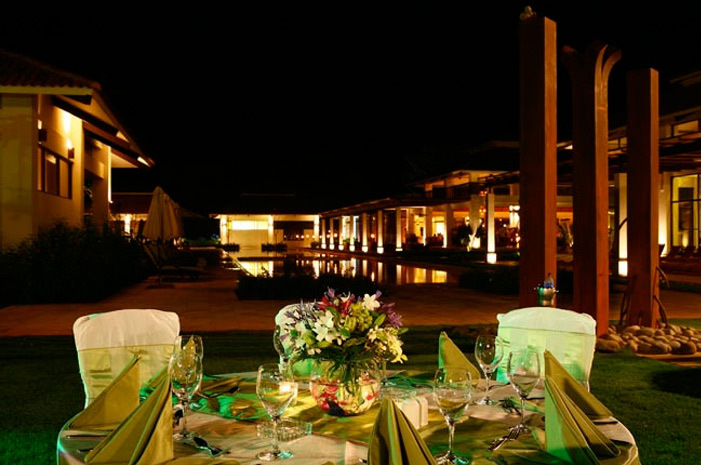 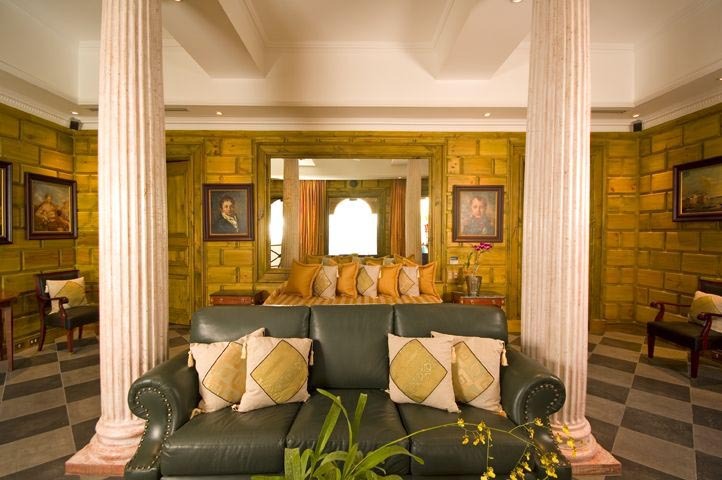 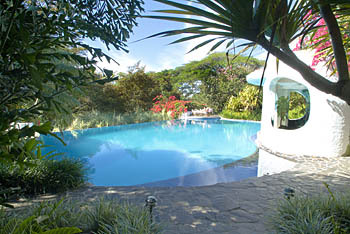 Guests have chosen the Nayara as one of the best hotels in the world in the 2011 Trip Advisor Travelers Choice Awards. 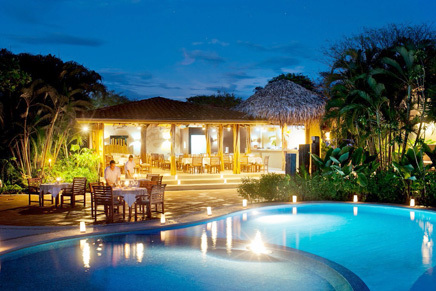 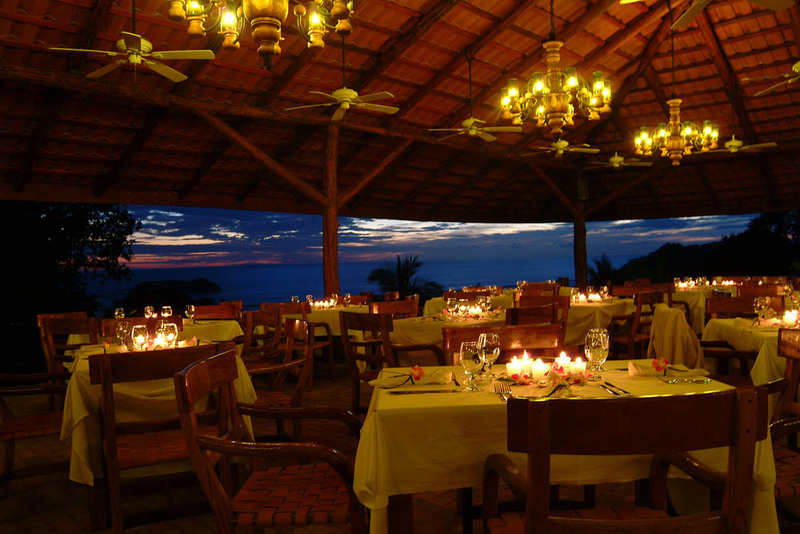 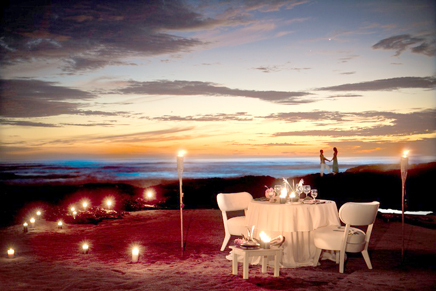 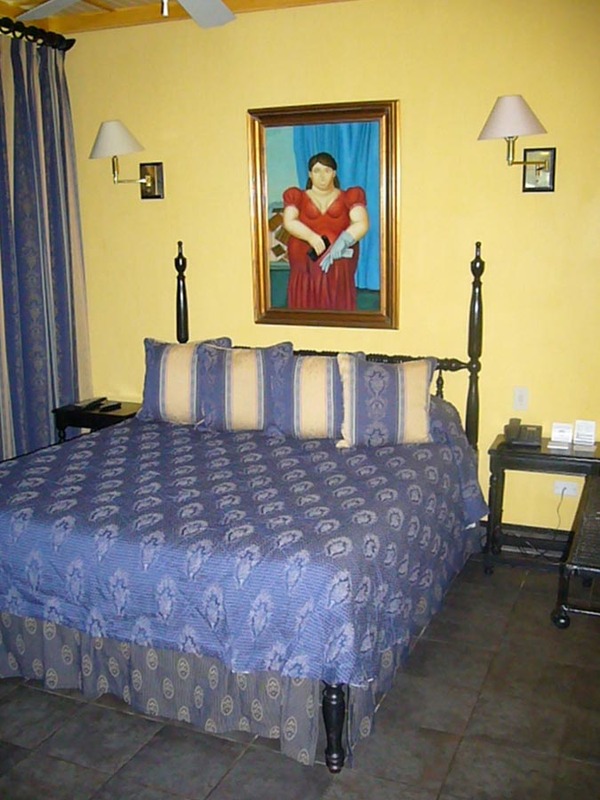 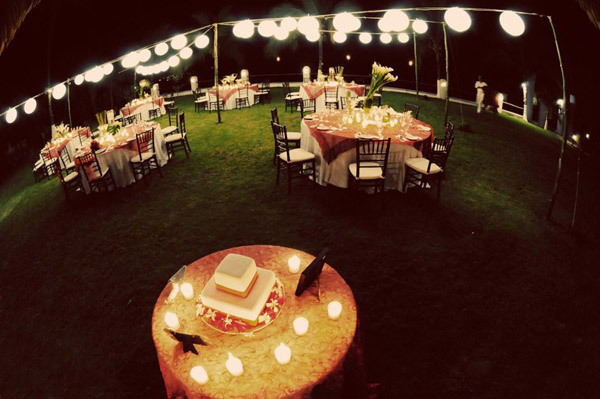 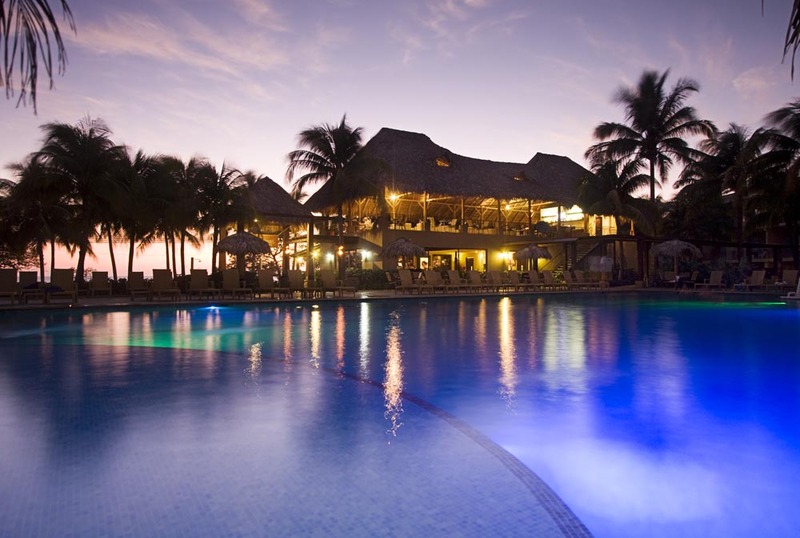 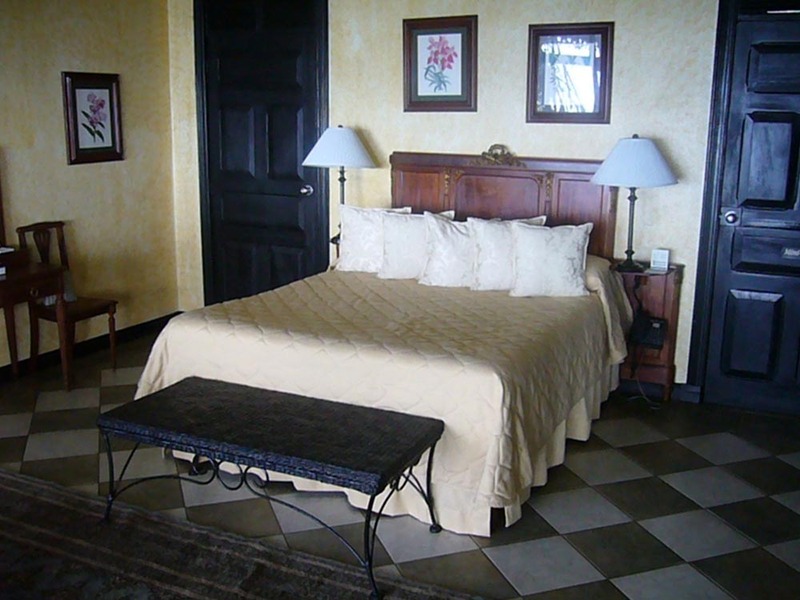 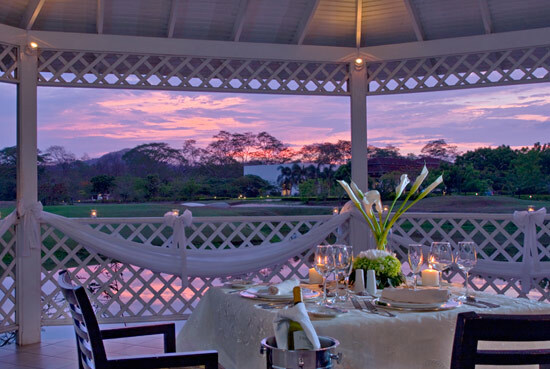 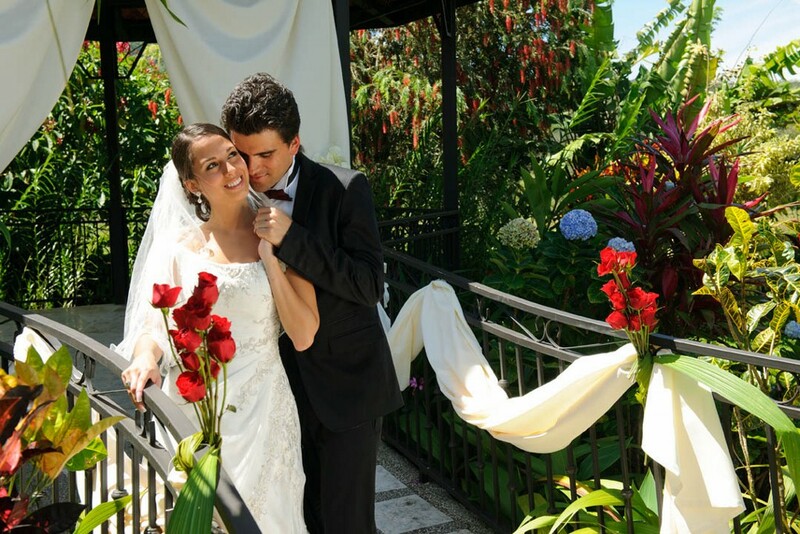 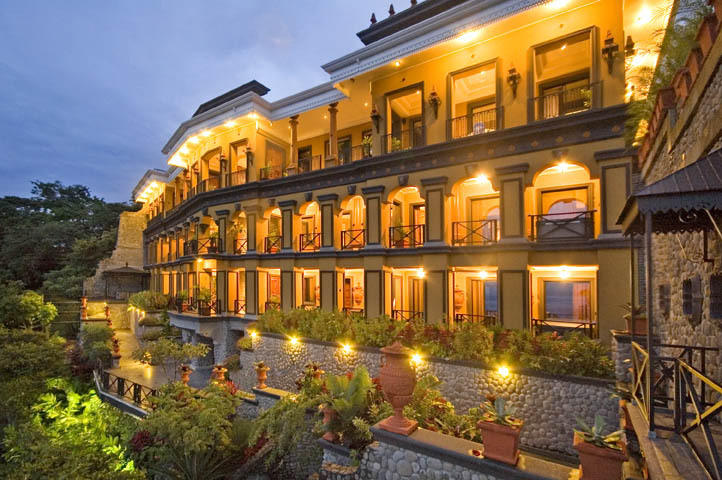 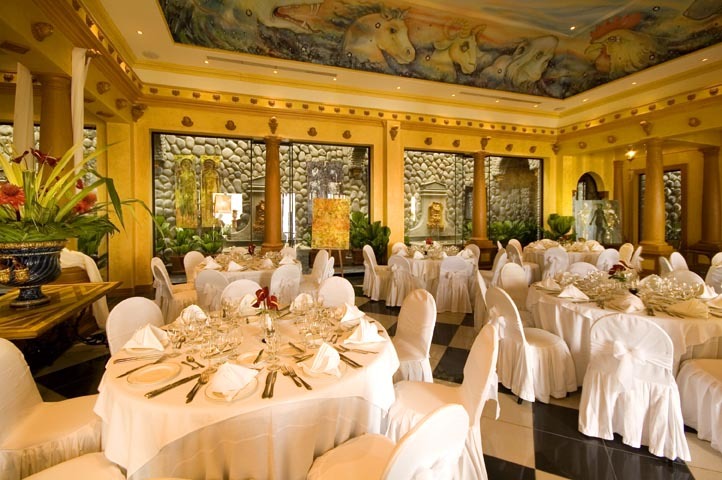 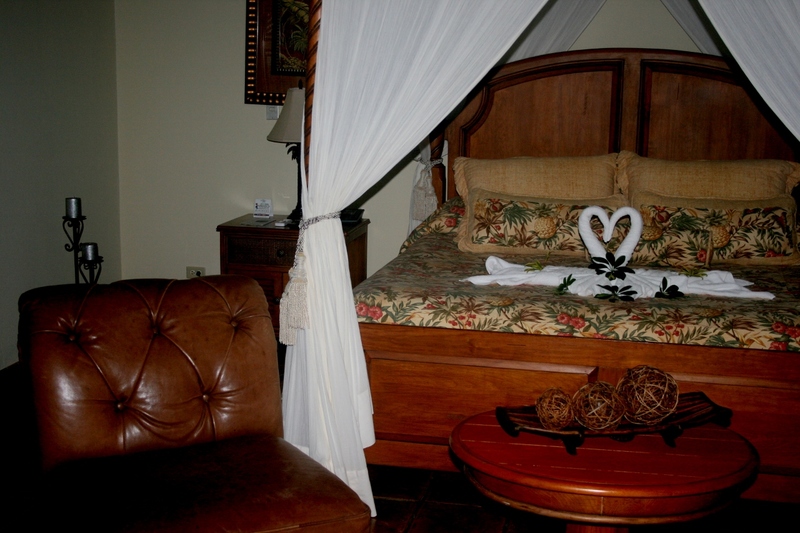 It consistently ranks as one of the most romantic hotels in Central America. 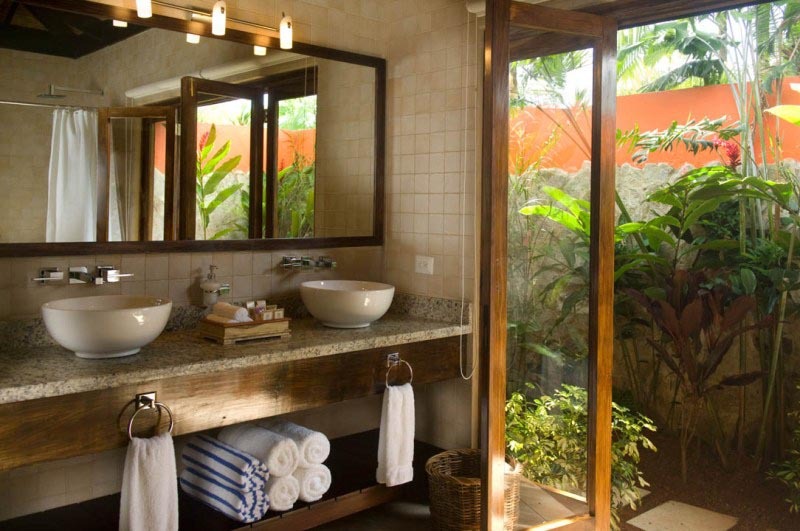 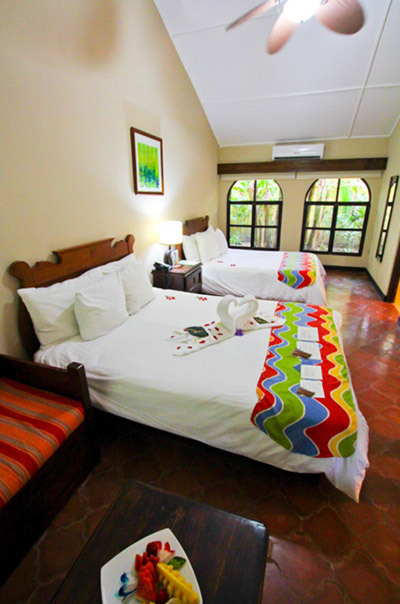 Each room is a beautiful individual casita nestled in the lush tropical rainforest and has a secluded garden with an outdoor shower and beautiful terrace overlooking the volcano with a private Jacuzzi for two. 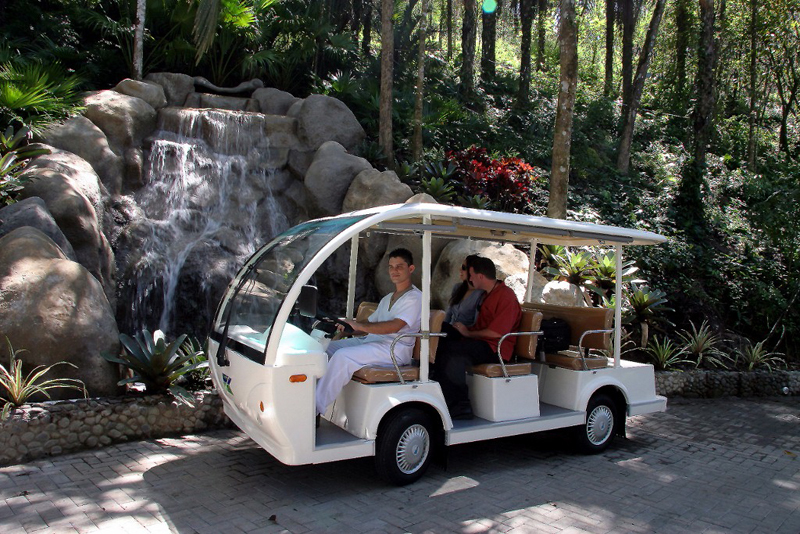 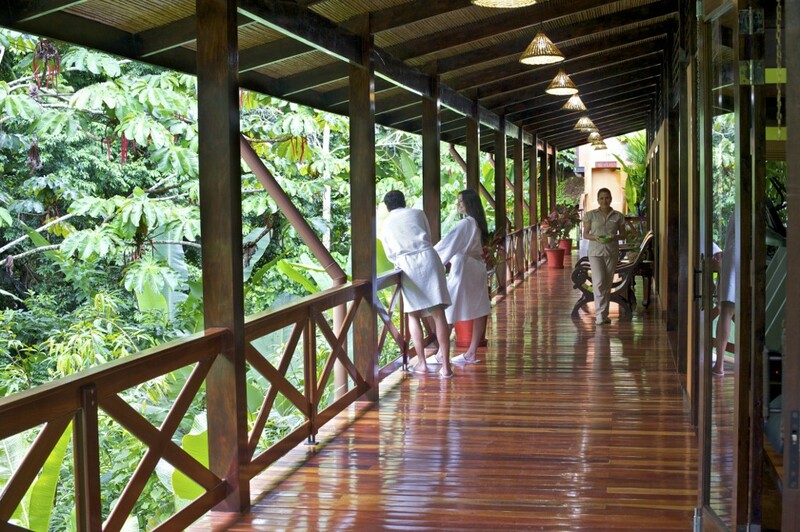 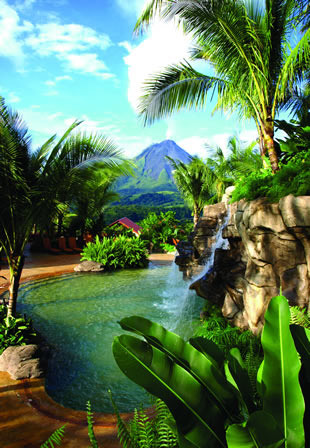 At the Arenal Nayara experience luxury and nature at the same time. 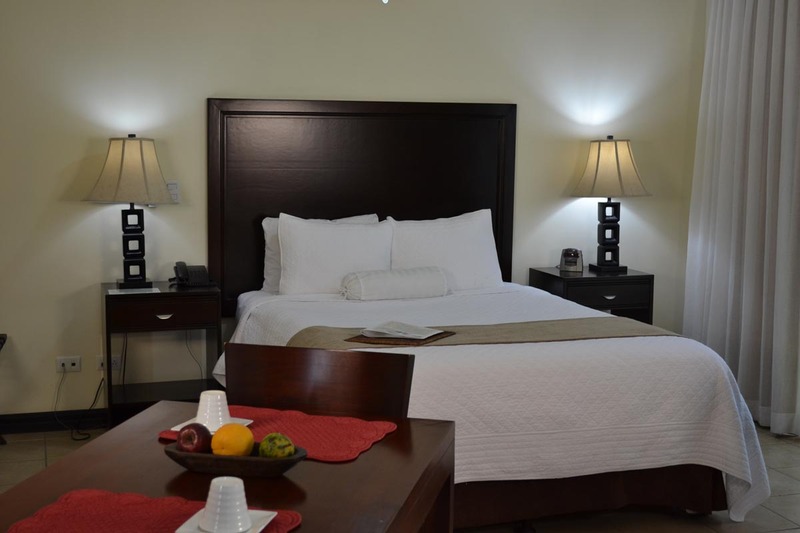 Service Include: Spa, Pool, Pool Bar, Restaurant, Win Bar, Sushi Bar, Free High Speed Wireless Internet, Free calls to the US, Jacuzzi in all room balconies, a plasma 27″ cable TV, DVD / CD, player, iPod stand, safe box (laptop capacity) 300 thread count 100% cotton linens, feather beds and down comforters. 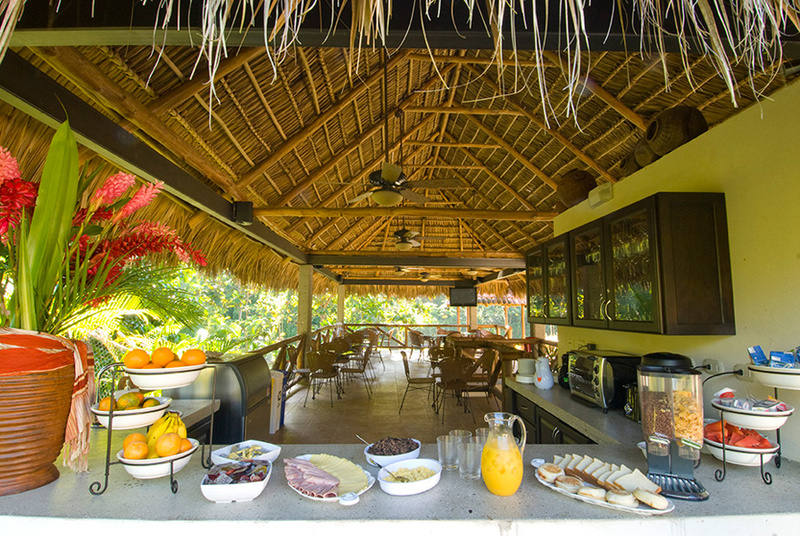 A visit to the Pacuare Lodge is a journey to a magical place where the beauty and diversity of tropical nature delight the senses, authentic Costa Rican hospitality makes you feel like part of the family and the outdoor adventures range from exhilarating to sublime. 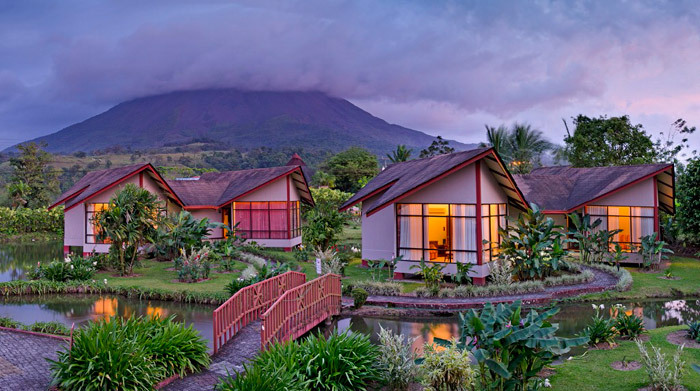 The lodge’s comfortable bungalows and elegant suites are nestled between a pristine wilderness reserve and the Pacuare River, Costa Rica’s most spectacular white water route. 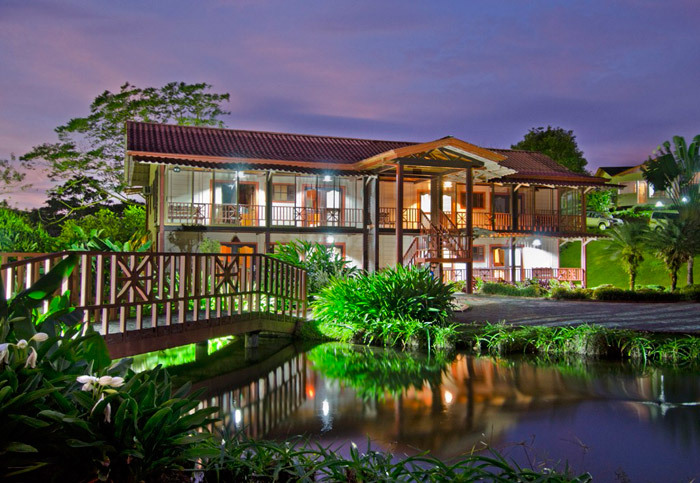 It is surrounded by tropical rainforest where colorful birds and butterflies flit through exuberant foliage and the songs of toucans and oropendolas complement the soothing sound of flowing water. 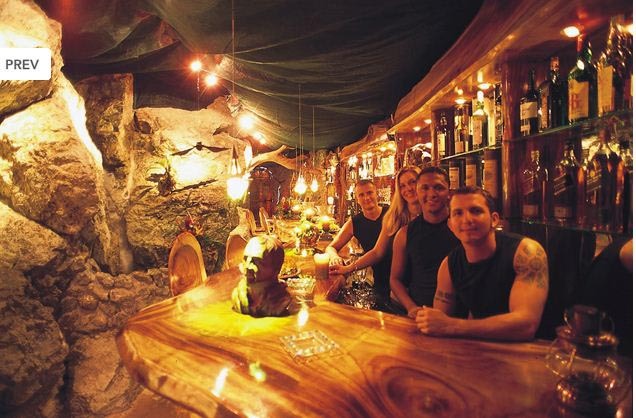 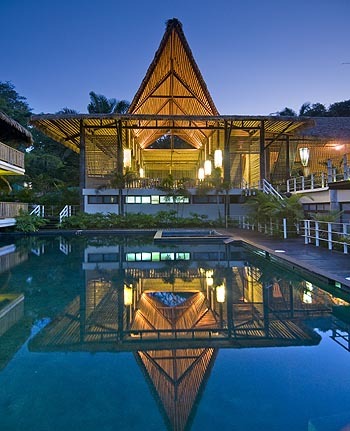 The Pacuare Lodge is truly unique, a jungle lodge where gourmet dinners are accompanied by candlelight and a wine list, and where adventure travel activities are complemented by a spa, honeymoon packages and suites with private pools. 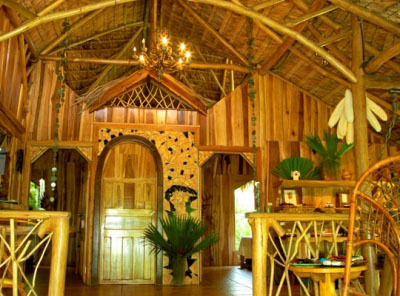 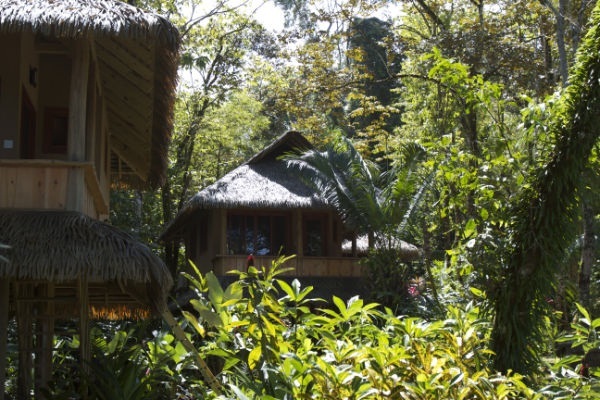 It is also an exemplary ecolodge that conserves Â 300 hectares (740 acres) of rainforest, and is committed to mitigating tourism’s impact through eco-friendly accommodations and projects that benefit local communities. 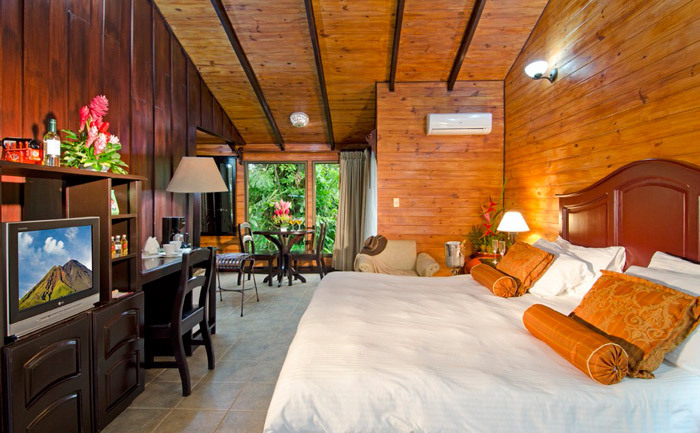 Such good practices helped the Pacuare Lodge earn the Rainforest Alliance Verified seal and the highest rating under the Costa Rican government’s Sustainable Tourism Certification. 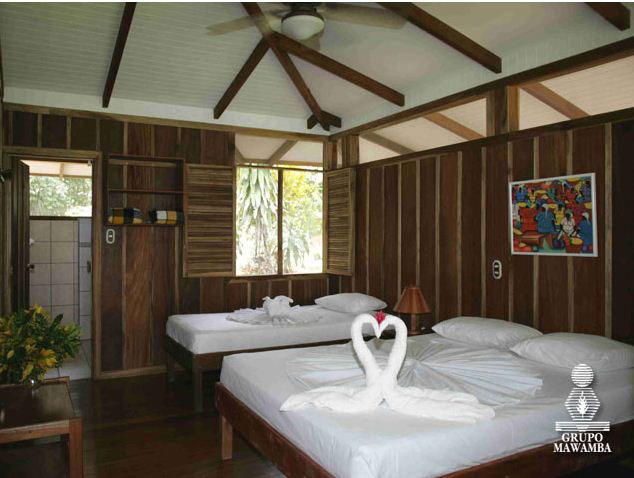 The lodge also maintains the highest safety standards, and a dedication to details and friendly service that makes every stay special. 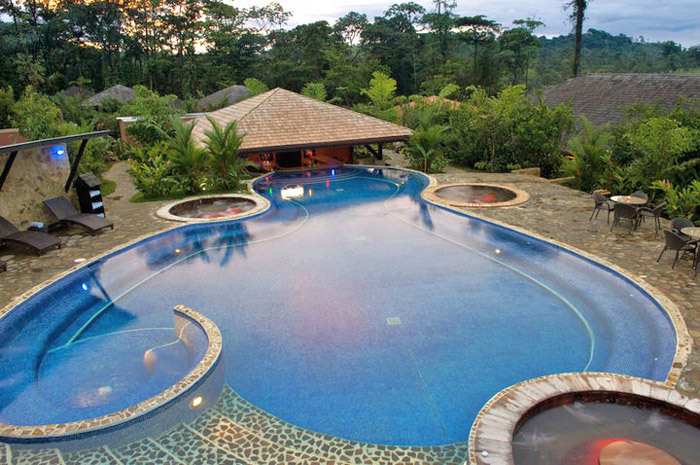 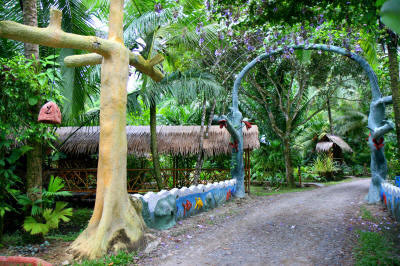 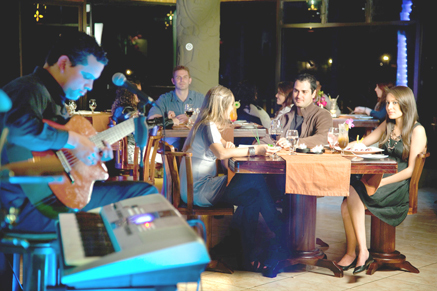 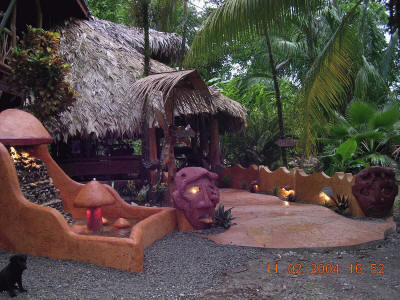 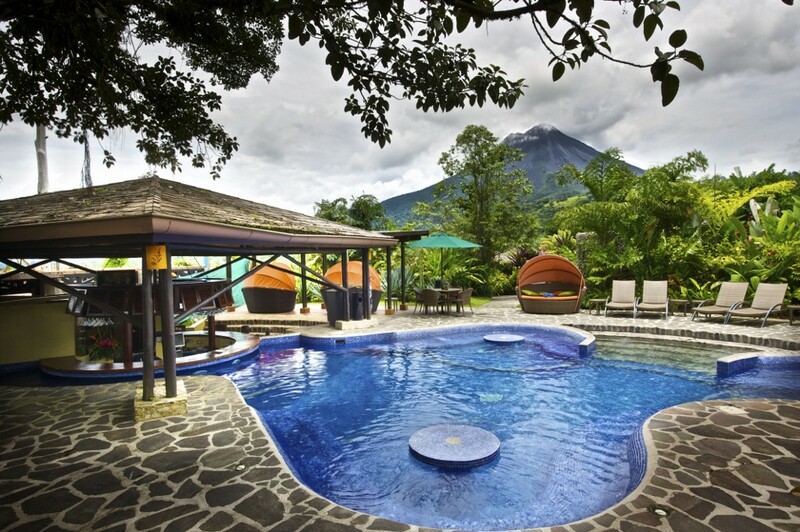 It is hardly a coincidence that so many people say the Pacuare Lodge was the highpoint of their Costa Rica vacation. 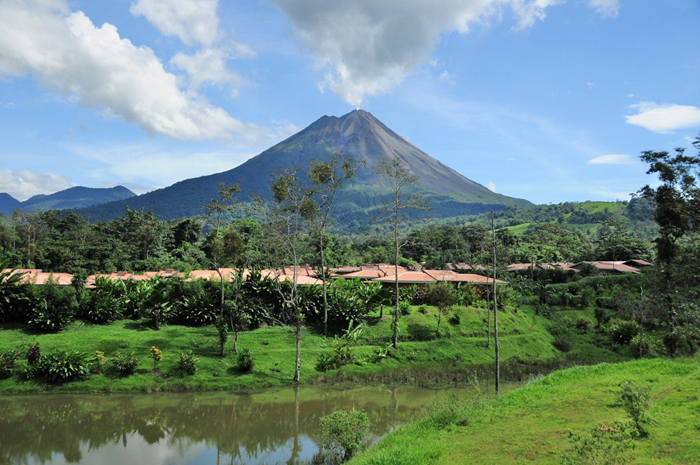 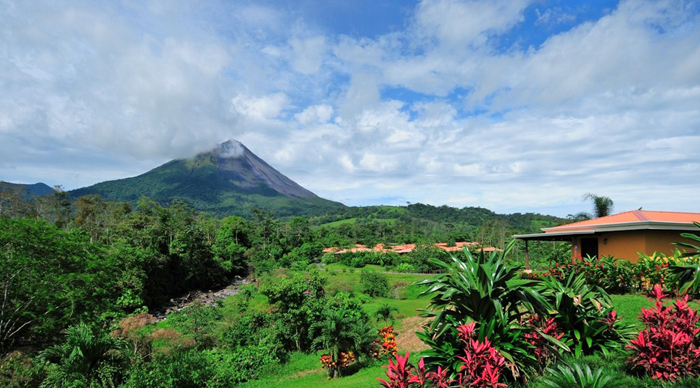 Marvel at the perfect cone-shaped Arenal Volcano, one of the most visited spots in Costa Rica. 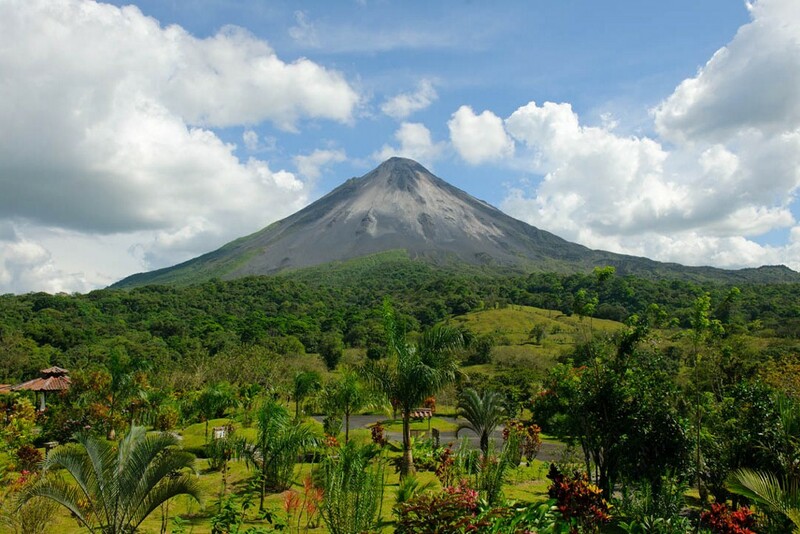 Once considered among the four most active volcanoes in the world, the mighty Arenal Volcano is much quieter now, but it still heats the thermal springs in the area and offers a spectacular show of smoke and ash. 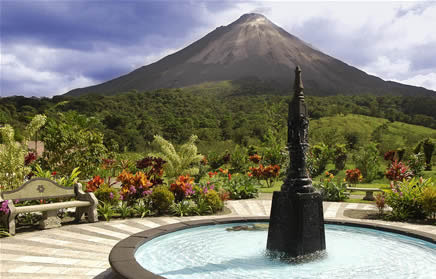 The surrounding area is incredibly green and lush, owing to the volcanic soil. 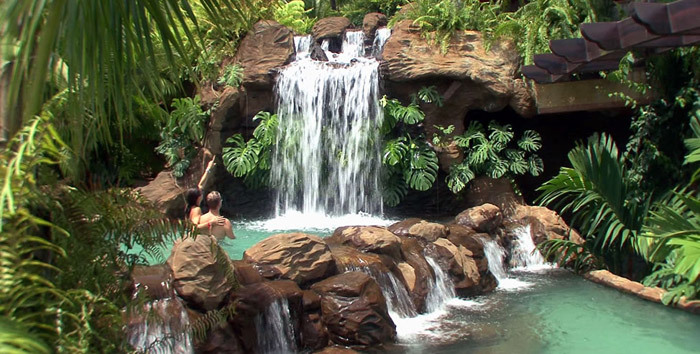 Waterfalls, canyons, rivers and natural hot springs complete the picture postcard ambience. 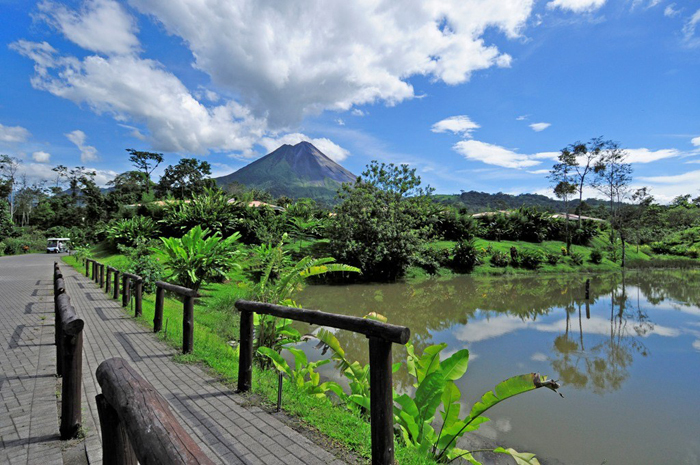 Nearby Lake Arenal is ideal for windsurfers seeking the perfect wind. 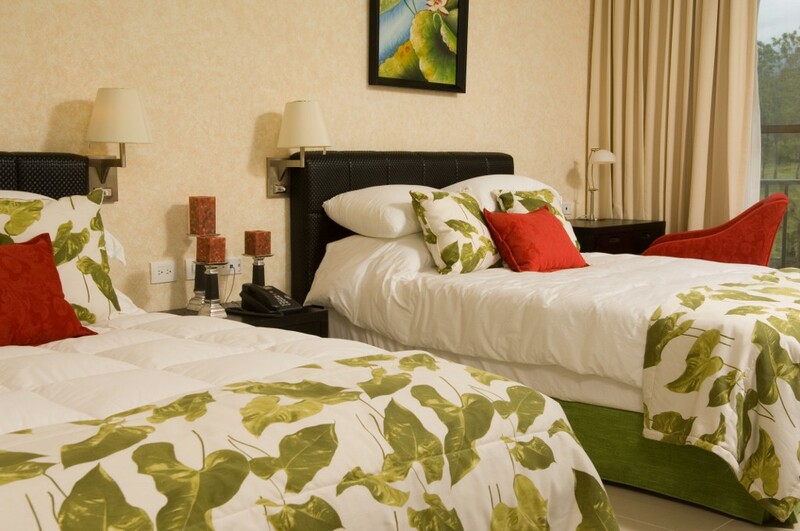 All rates for hotels are based on double occupancy. 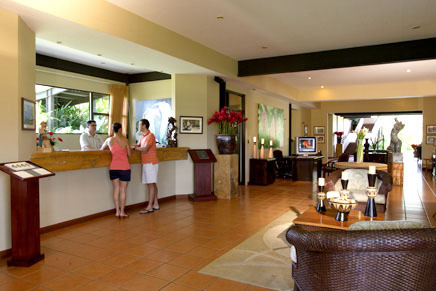 In all hotels in Costa Rica, please add a 13% for taxes, if it is not already included. 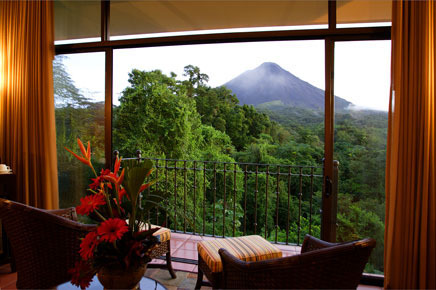 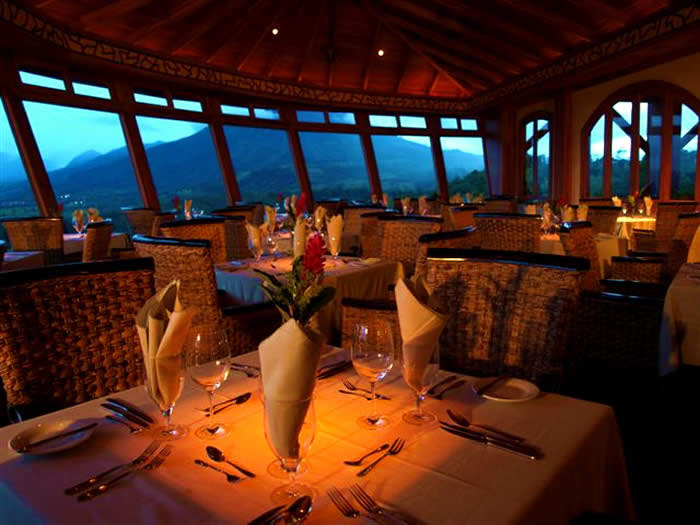 Arenal Manoa offers marvelous views of Arenal Volcano. 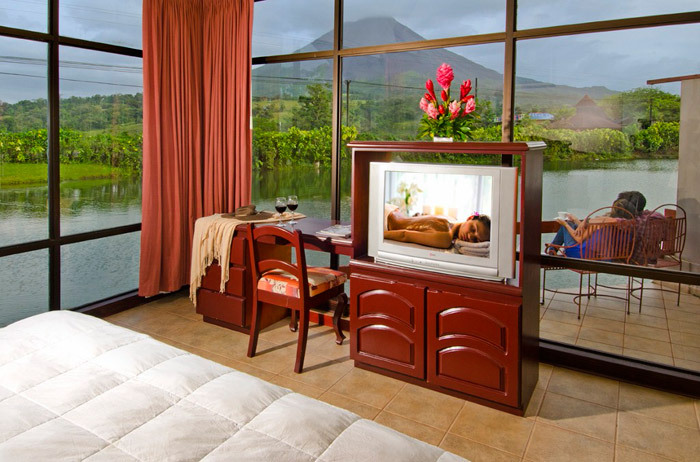 Surrounded by spectacular gardens, pastures and wildlife, you’ll rejuvenate in rooms offering panoramic views of the arenal volcano. 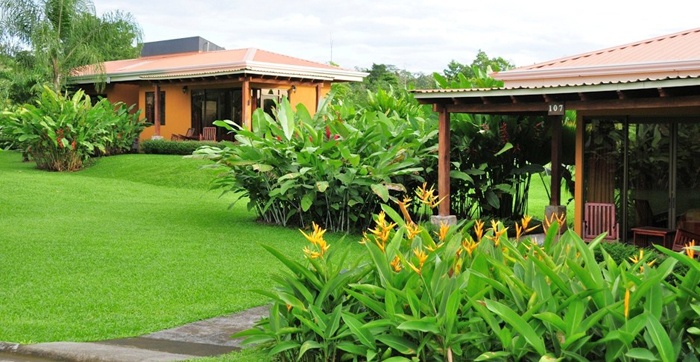 Stroll the spacious gardens, meditate among lush flora and fauna, or take in the daily operations of a typical Costa Rican farm. 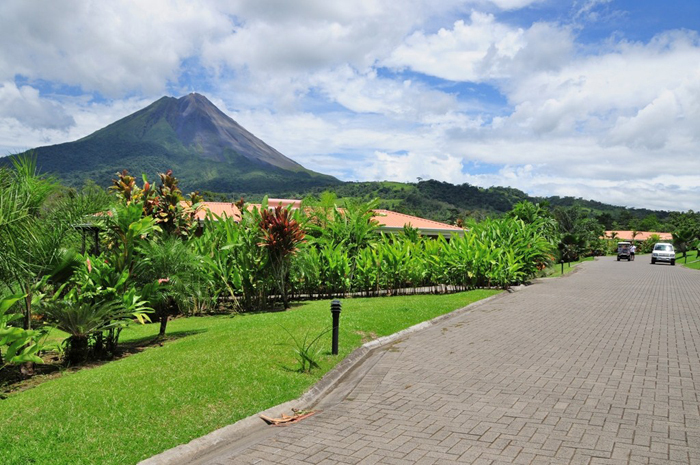 The Arenal Manoa is close to a wide range of tour opportunities including zip lining, horseback riding and hiking. 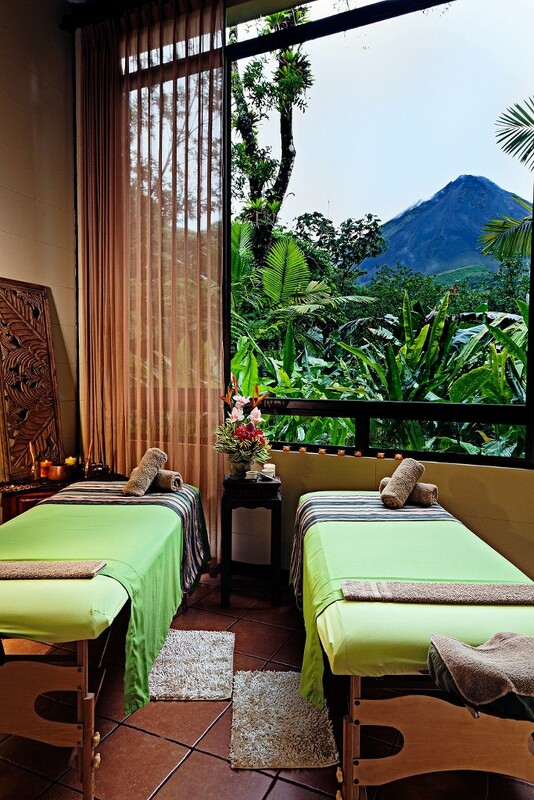 The Royal Corin Resort & Loto Spa has 54 rooms with an elegant design, quiet atmosphere in harmony with the natural wealth of the area in sight of the majestic Arenal Volcano. Each room has fantastic view of the volcano mainly because of the excellent architectural design of this five stories hotel. 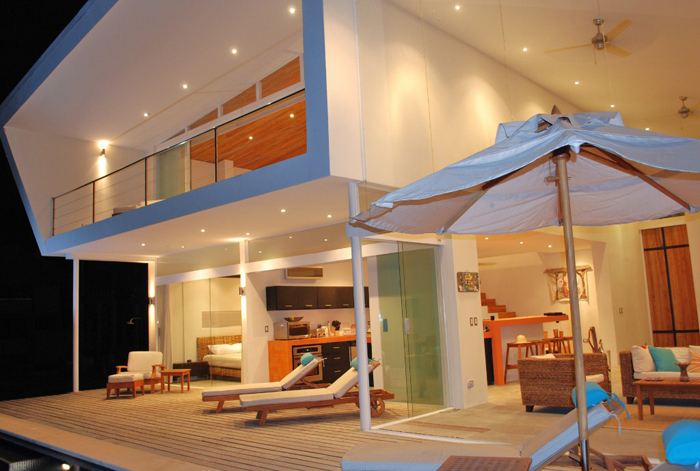 Three floors are strictly for lodging. 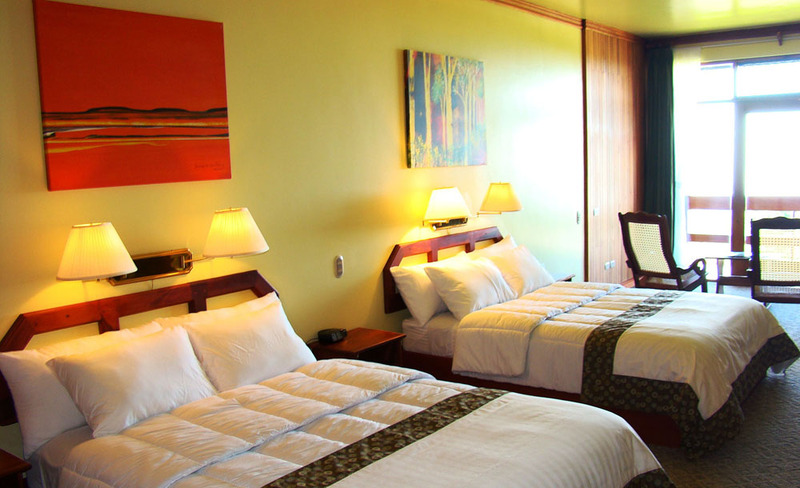 The Royal Corin means an excellent chance to rest and enjoy several sports with recreation options. 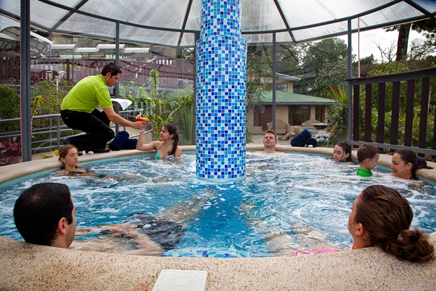 Royal Corin has a great area of thermal waters inside their facilities.The special location transforms into a very private area for your comfort and peace. 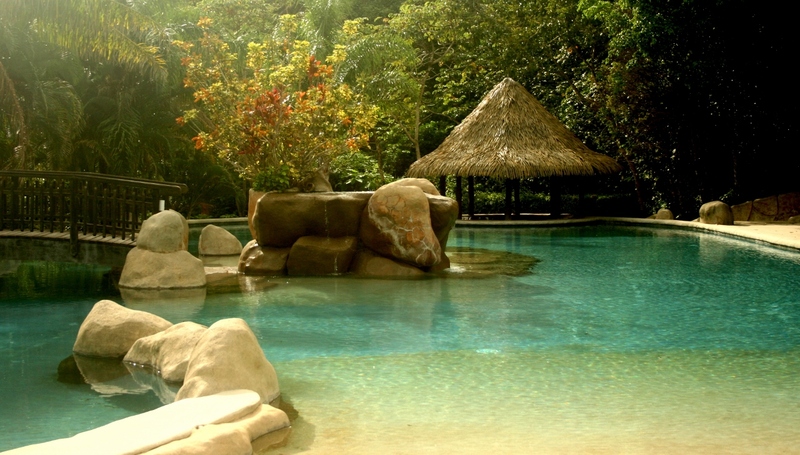 In front of the hotel you will find three pools of hot springs with different temperature each. 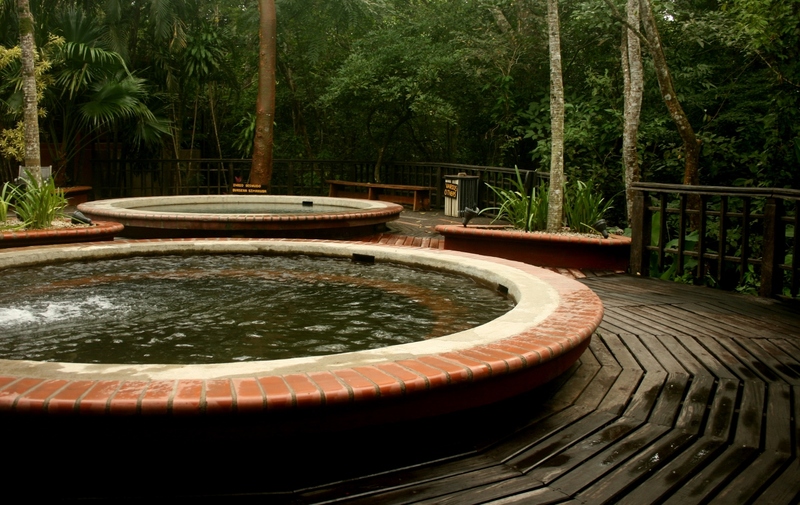 The river of thermal water is also conditioned with four jacuzzis and a small river also fed by the hot springs. 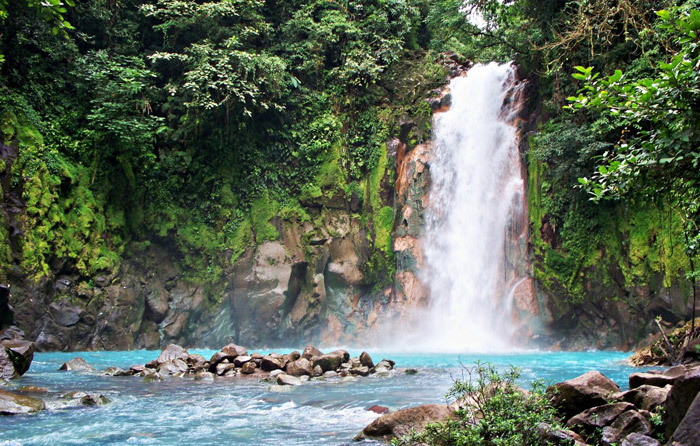 Warm waterfalls by the river will allow you to admire such an impressive view. 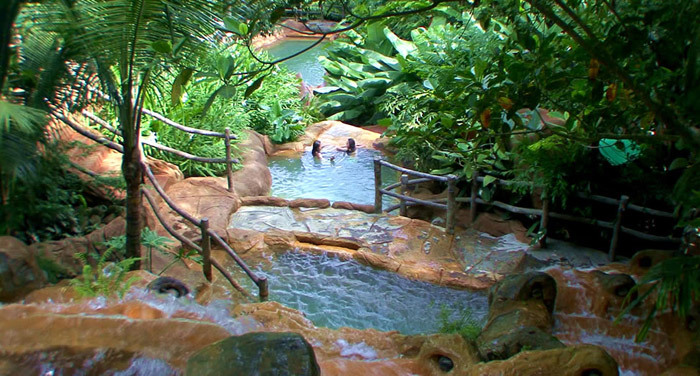 A natural sauna of thermal waters is under the waterfalls, in a quite wide area where you will live an unique experience. 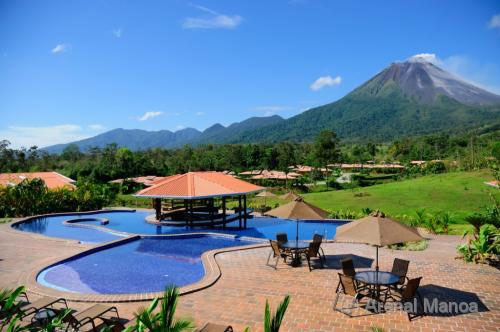 This family-run oasis is located 10 kilometers northwest from La Fortuna in San Carlos and boasts breathtaking views of the majestic Arenal Volcano. 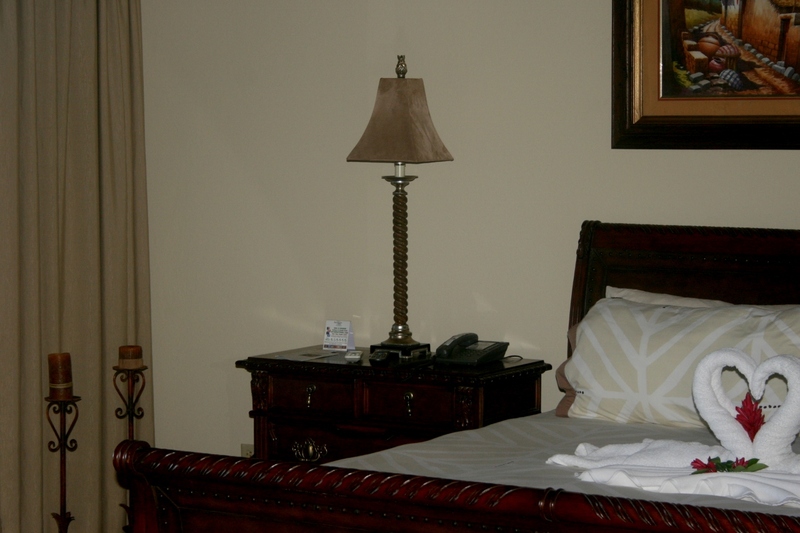 You arrive as a guest but leave as a friend after experiencing the unparalleled hospitality of the staff and comfort of the accommodations. 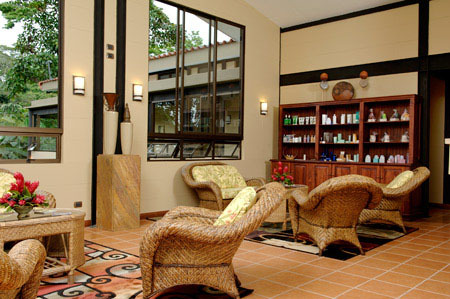 Indulge at the Kioro Hot Springs and treat yourself to the very best in relaxation treatments at Spa Neidin. 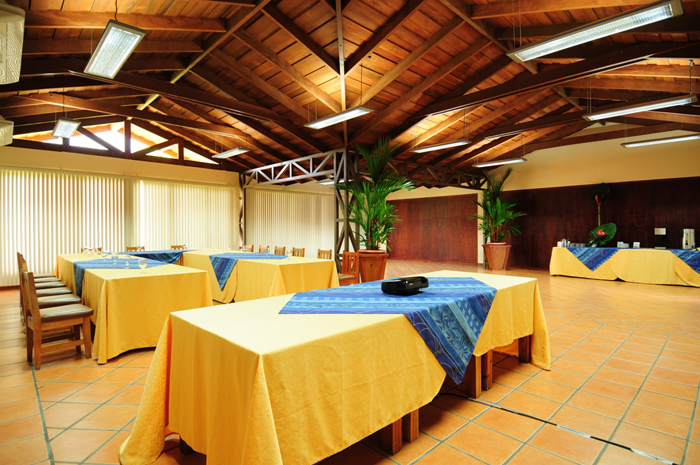 Conference facilities are available. 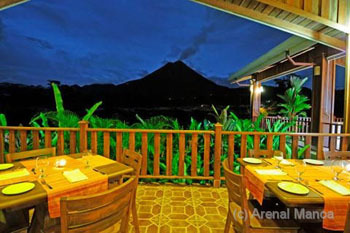 Service Include: International food restaurant, Snack Bar, Private hot springs only for guests, Temperate pool, Spa, Conference rooms facilities, Game room (ping-pong, pool, board games,) Gift shop, Free Internet Connection, Mini gym, Laundry service, terrace with direct view to the volcano, hydro-massage, air conditioning, safe deposit box, minibar, coffee maker. 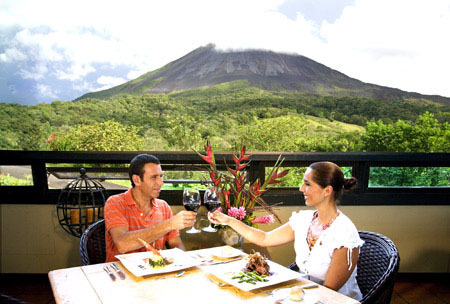 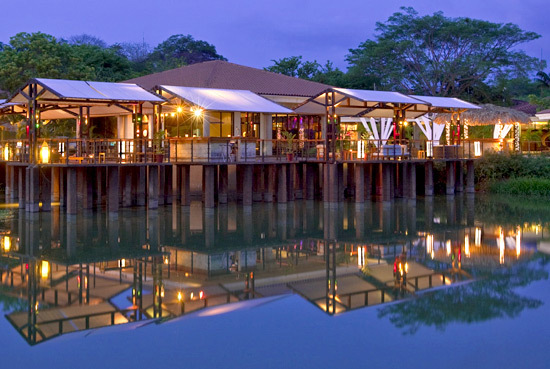 The Springs Resort and Spa at Arenal offers a diverse range of opportunities for relaxation, dining, recreational activities, adventure and sightseeing that’s second to none. 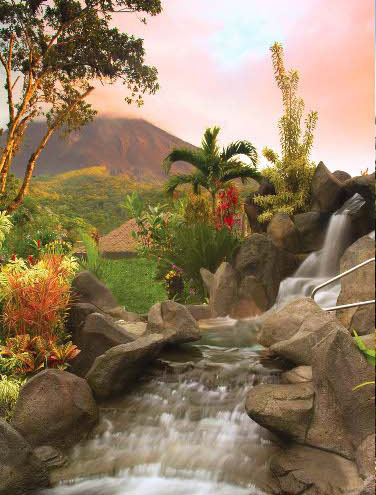 From natural springs, pools and waterfalls to the spectacular view of the Arenal Volcano, an impressive full service Spa, and exquisitely designed accommodations, The Springs offers even the most skeptical traveler something to marvel at. 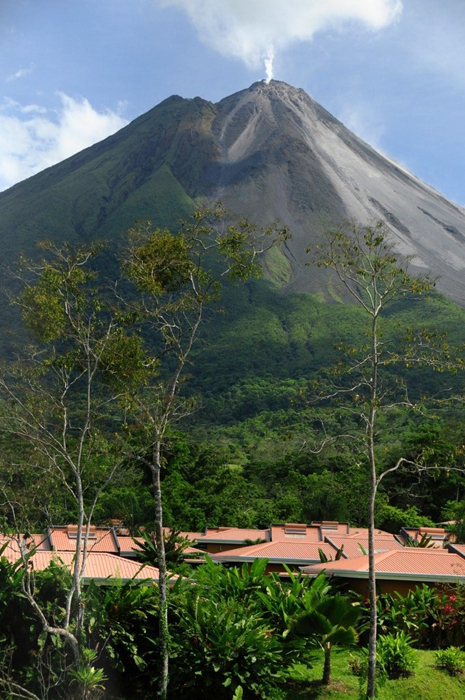 Perched one thousand feet above the Arenal Valley on a mountain ridge just 6 kilometers north of the active volcano (yet safely out of reach of the government declared “danger zone”), you will experience views unlike anything you’ve ever seen before. 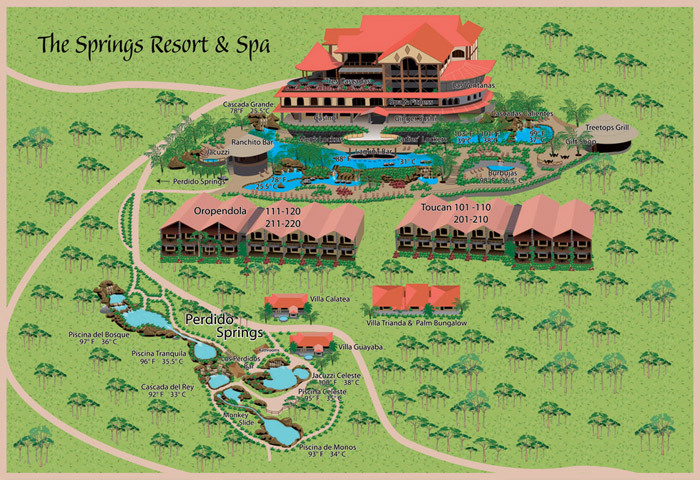 Services include: The Springs Wildlife Preserve with 25 rescued jungle cats and monkeys, Casino & Gaming, The Springs Spa and Fitness Center, Unique dining experiences, Onsite hiking, horseback riding, bird watching, hot springs, each room with private terrace with volcano view, hammocks, bathrooms with Jacuzzi. 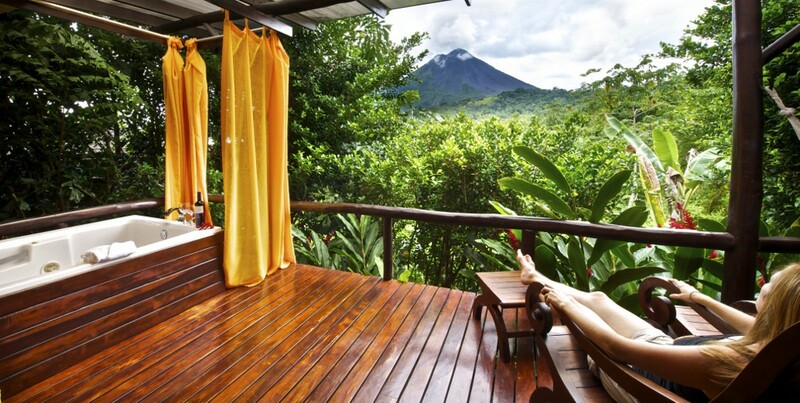 Just by the foot of the Arenal Volcano stands Montaña de Fuego Hotel & Spa, a hotel inspired by its great natural environment, surrounded by 35 hectares of tropical forest on a private reserve. 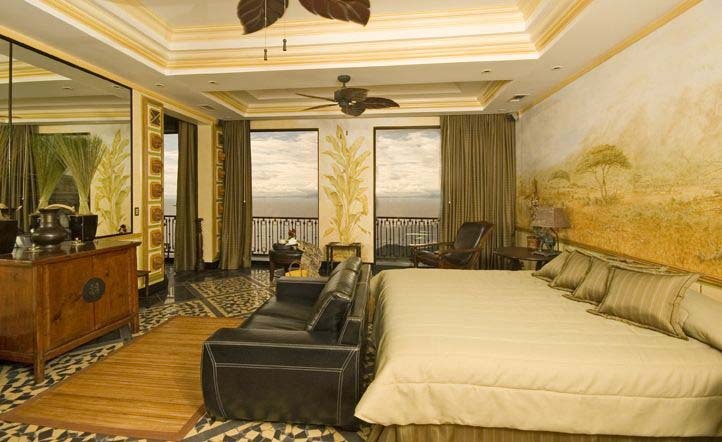 66 rooms in total, 5 different types of rooms. 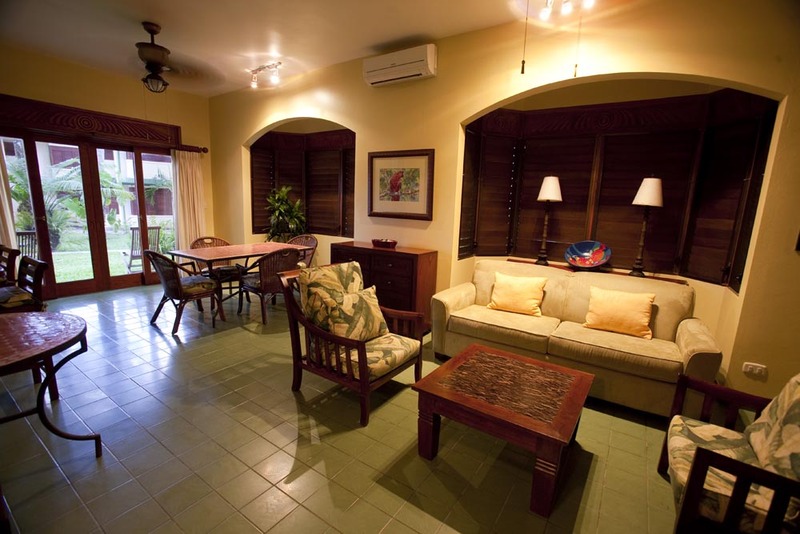 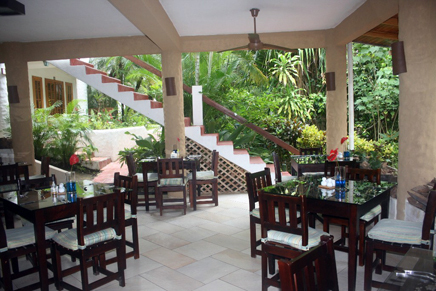 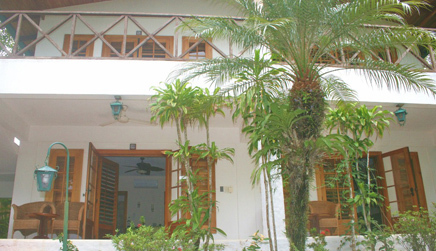 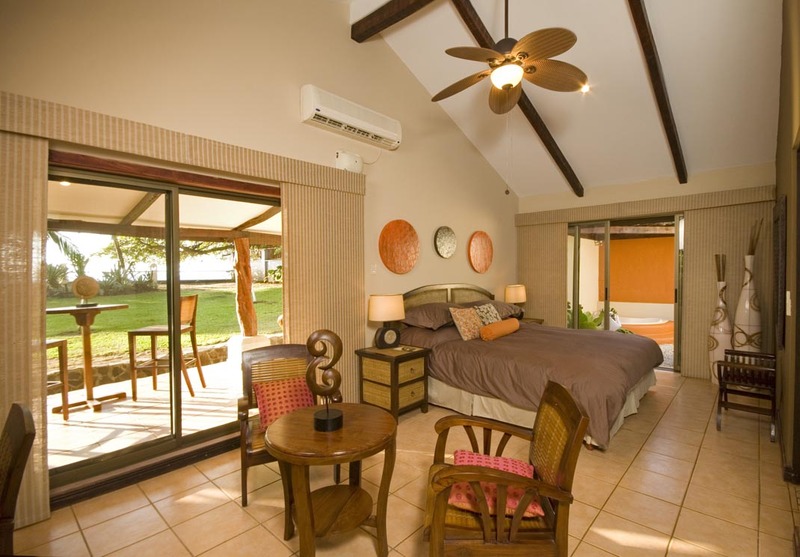 Suites, Deluxe Bungalow, Standard Bungalow, Family Cantarana Rooms and Junior Suite Bungalows. 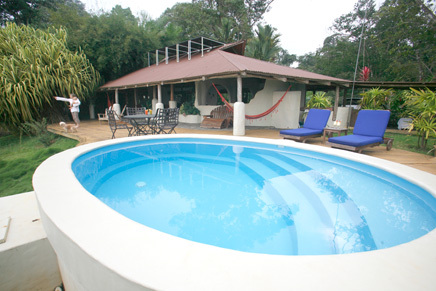 Swimming pool, Spa, Restaurant, private terraces, great views, lake and more. 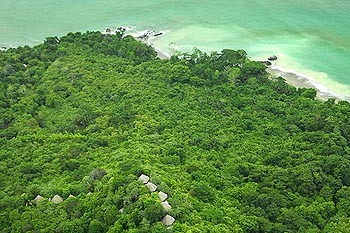 Visit beaches with white or black sand adjacent to forests dense with lush vegetation. 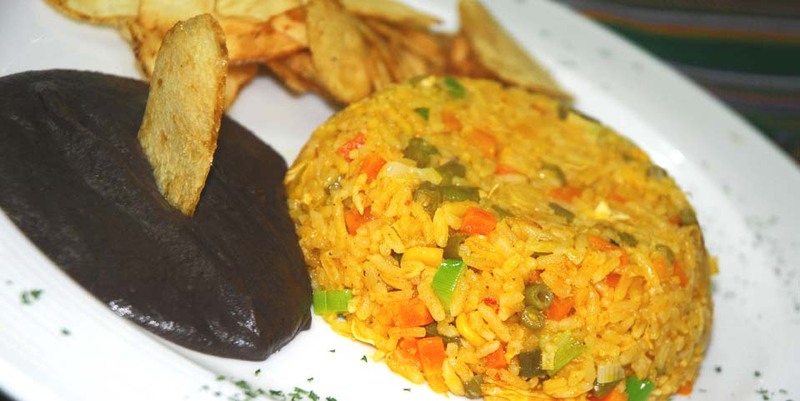 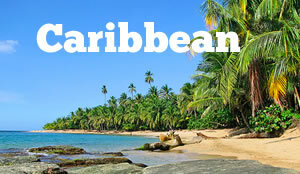 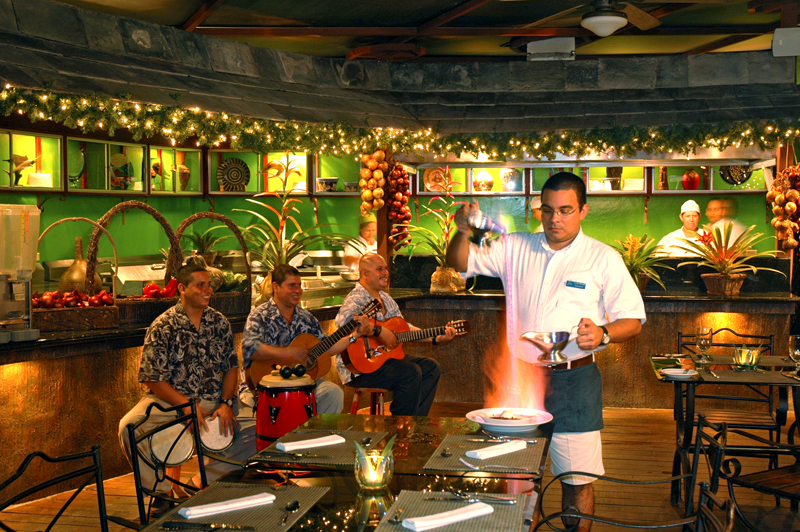 The strong Afro-Caribbean influence will deepen your experience as you get a taste of the true local, exotic culture here. 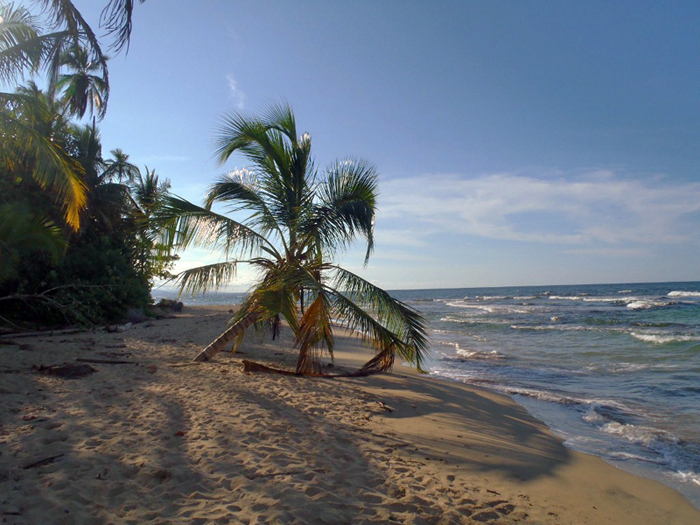 From June to October you can even bear witness to green turtles spawning at the beaches of the National Park of Tortuguero, also a magnet for sports fishermen and birdwatchers. 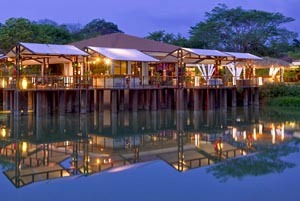 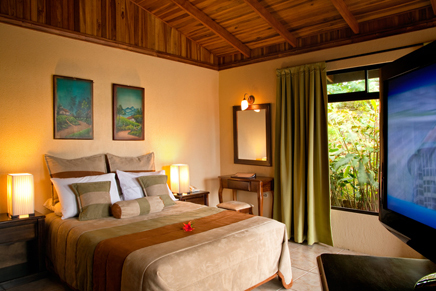 Le Caméléon is a boutique hotel located in Puerto Viejo de Limón, on the Caribbean coast of Costa Rica. 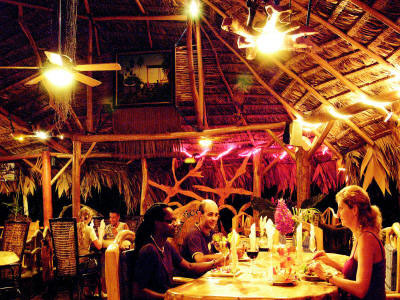 With its laid back attitude and Caribbean life style, Puerto Viejo has it all: long walks on the pristine beaches, exotic flora and fauna in a wildlife refuge, snorkeling or diving among the many reefs in crystal clear waters, world-class surfing, mountain biking, kayaking and cultural visits to indigenous communities. 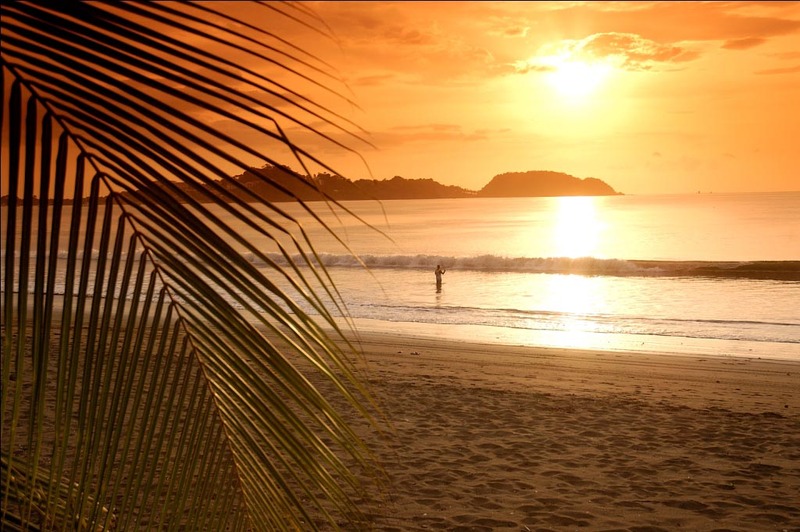 Cocles Beach with its beautiful golden sand is walking distance from the hotel. 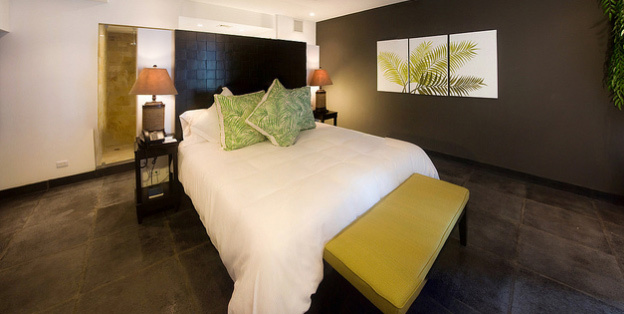 The hotel is contemporary with natural elements and a minimalist decor that creates a relaxing and elegant atmosphere, specially designed for the upscale traveler. 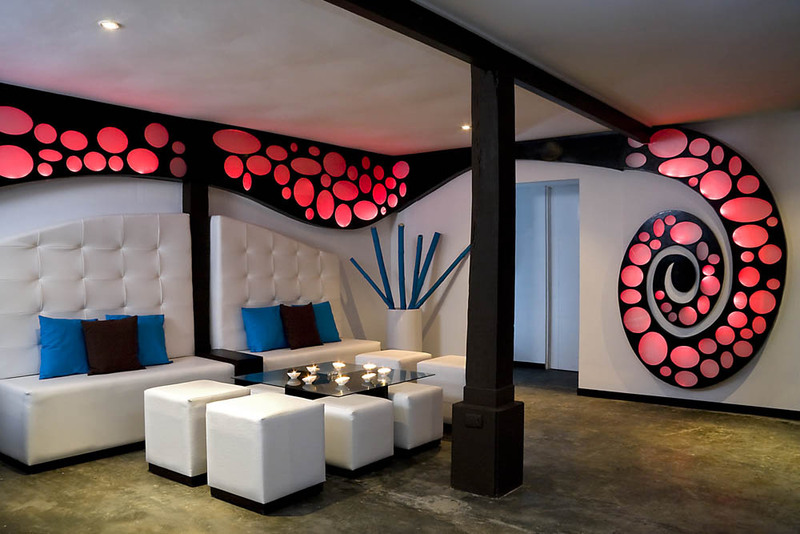 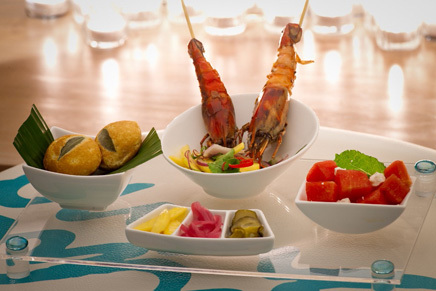 The hotel features Le Numu, the international cuisine restaurant that will delight the most discriminating guests, and Numu Bar, the international bar to enjoy an exclusive selection of beverages and music. 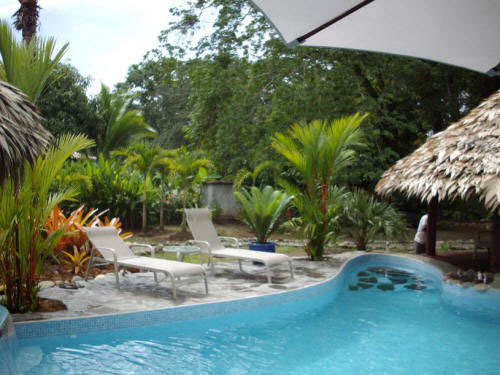 Located on the beach road 1 ½ kilometers from the town of Puerto Viejo, La Costa de Papito is a lush tropical “Garden of Eden” on the edge of the jungle or as the locals call it, “where the jungle meets the sea”. 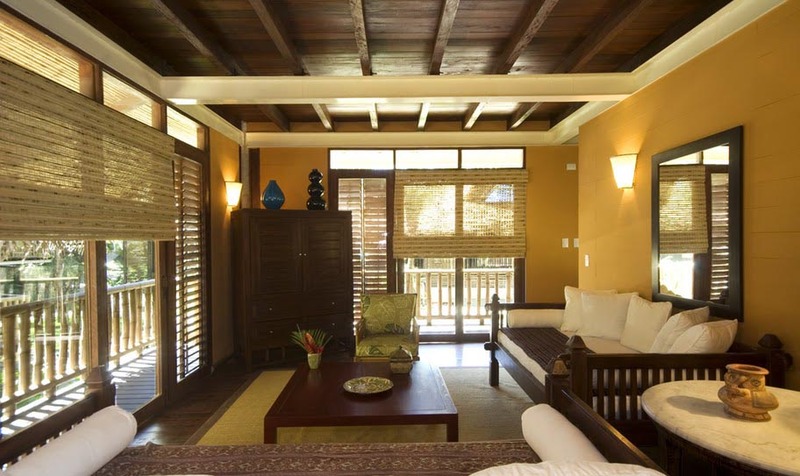 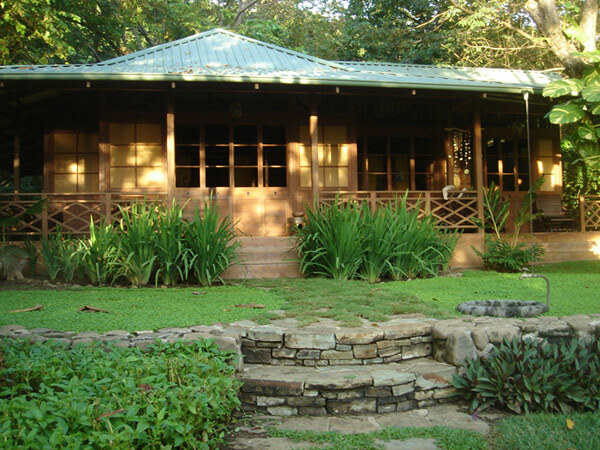 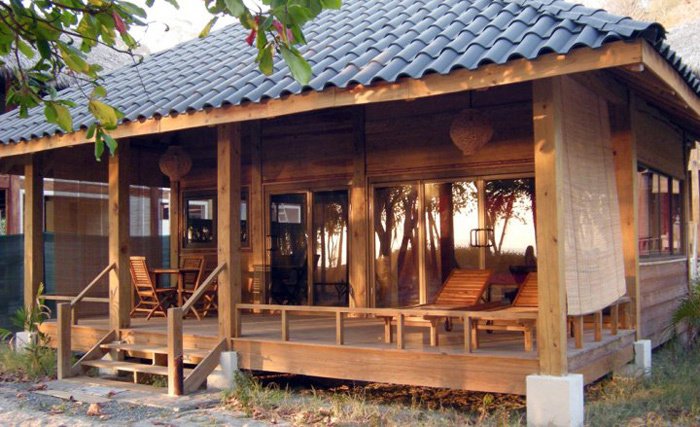 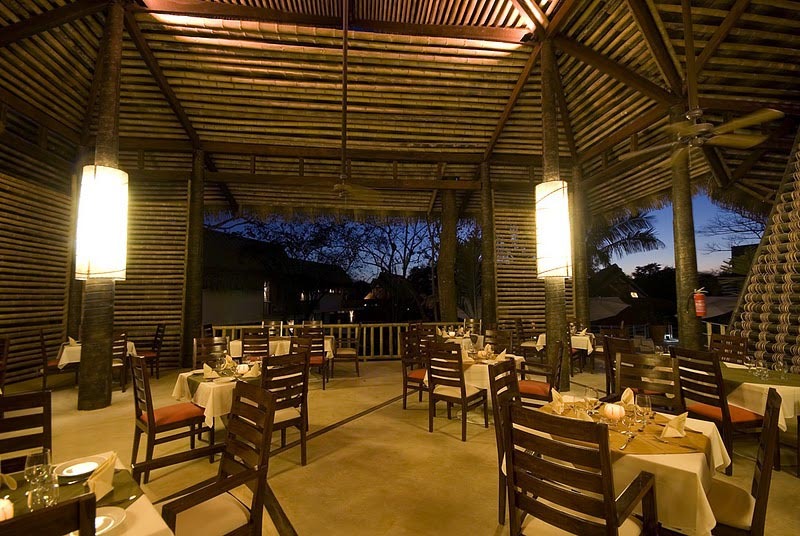 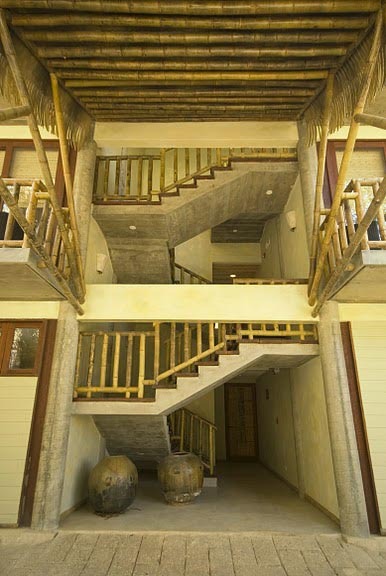 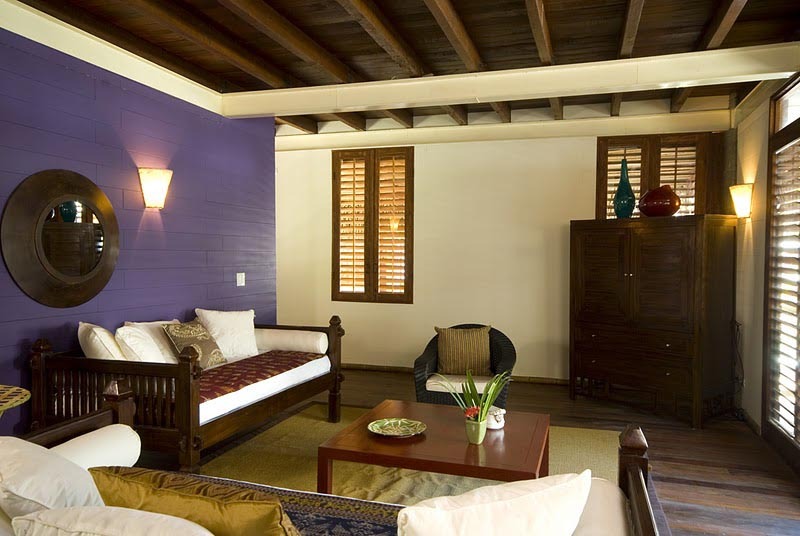 The site is comprised of inviting bungalows that are elegant, individually designed rustic wooden structures. 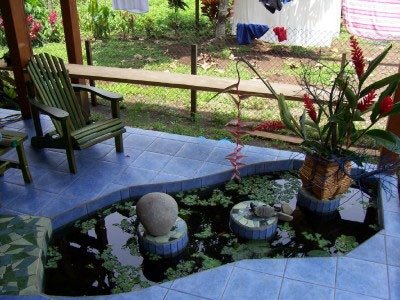 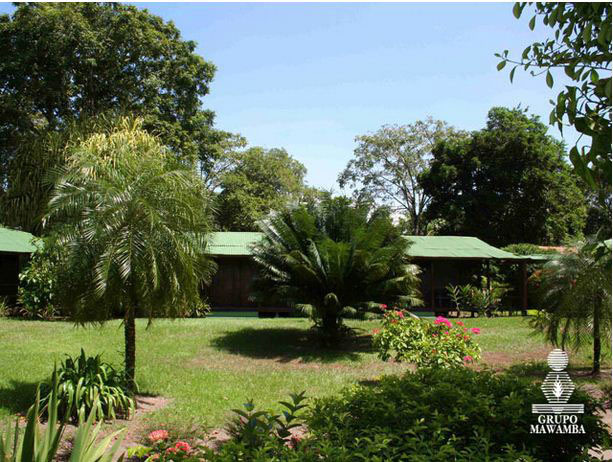 There are 13 strategically located in a lush 5 acre tropical garden. 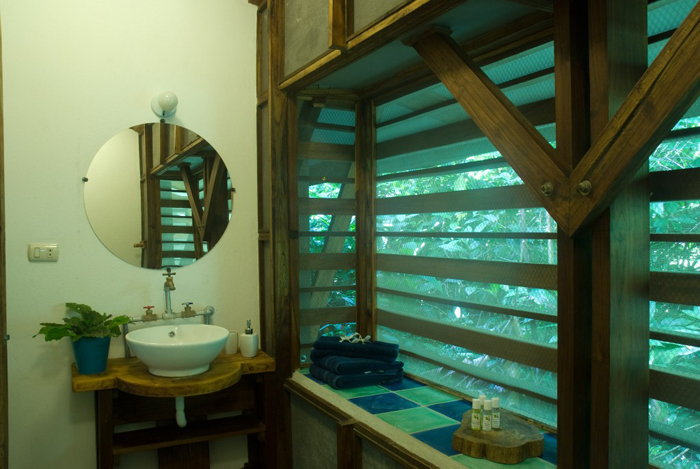 Large windows open onto a world of butterflies, birds, iguanas and docile sloths. 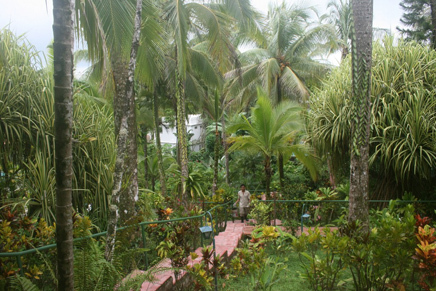 Not to mention tropical fruit trees and flowers. 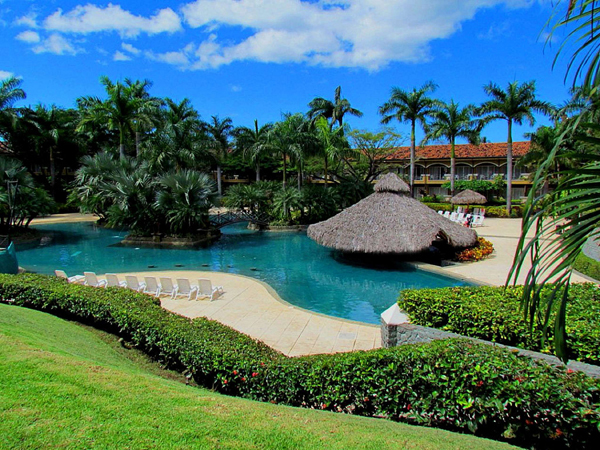 This is paradise. 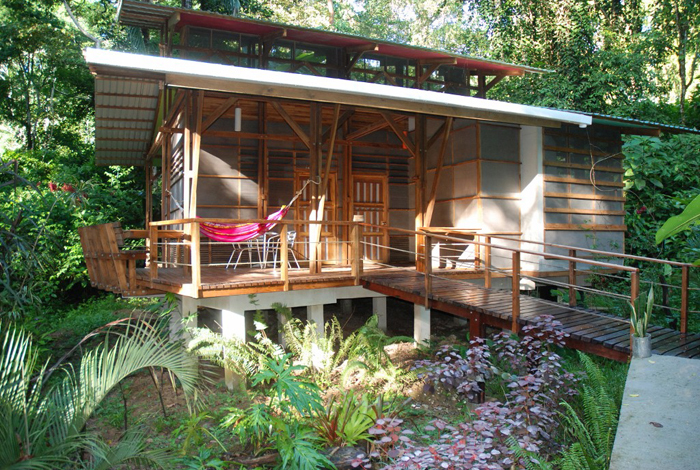 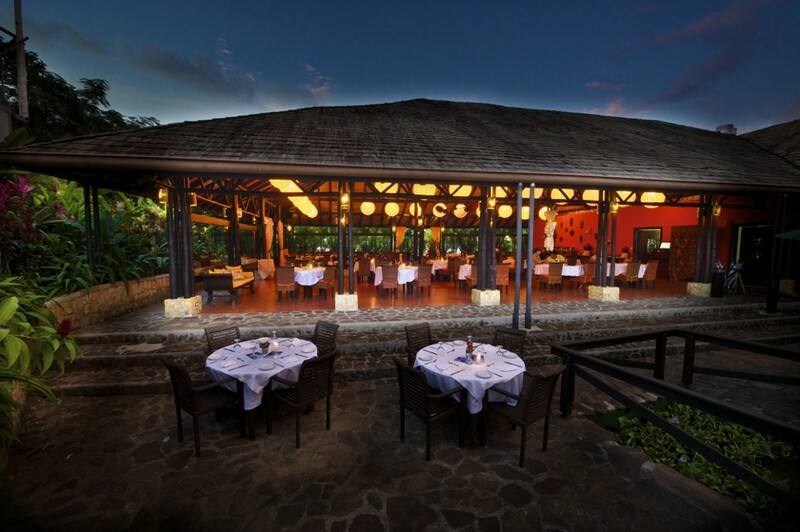 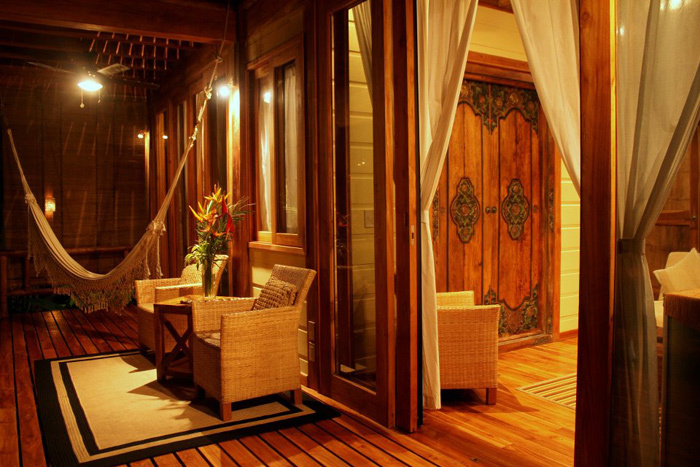 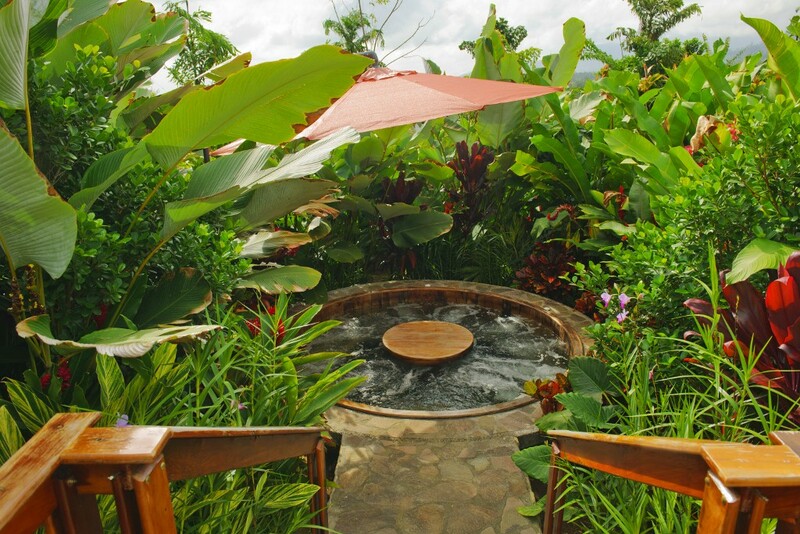 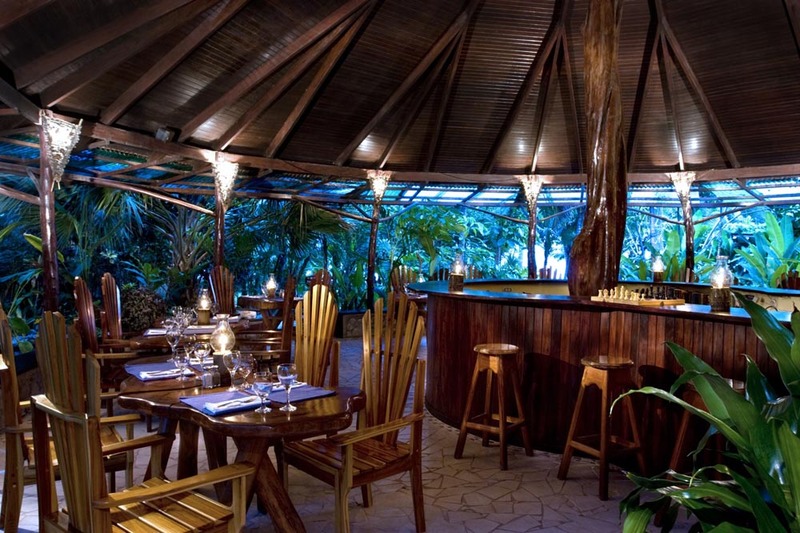 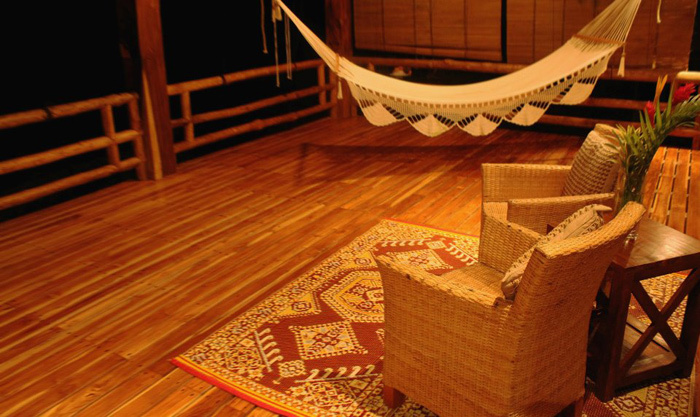 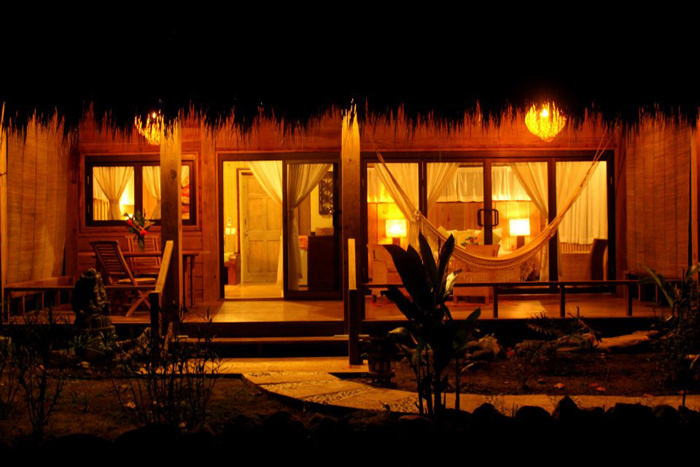 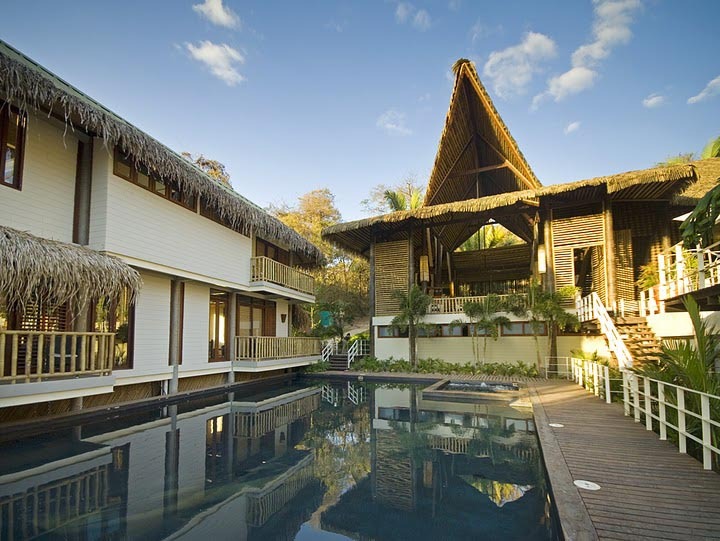 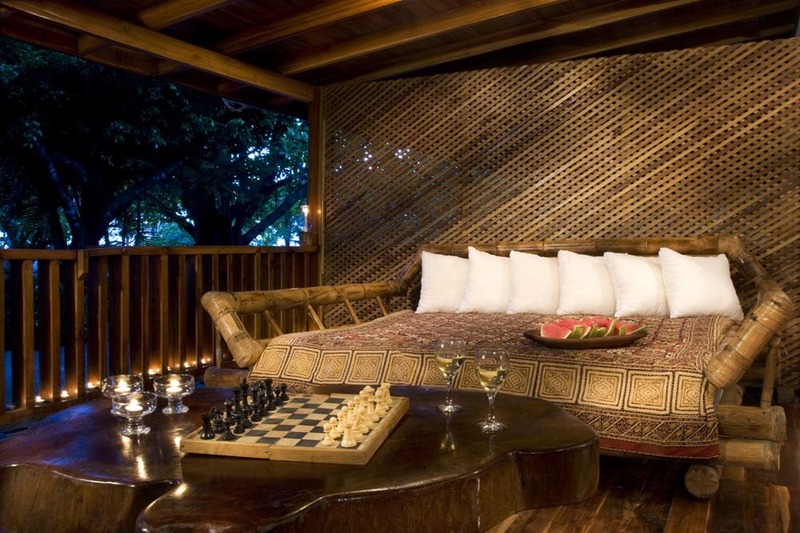 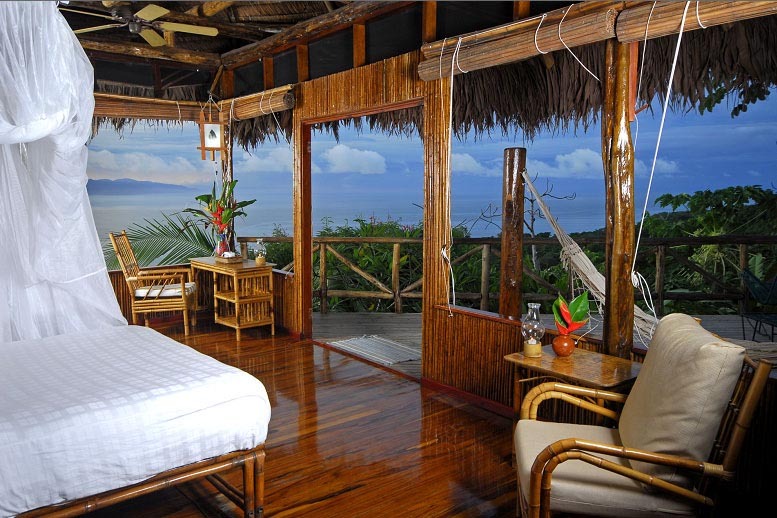 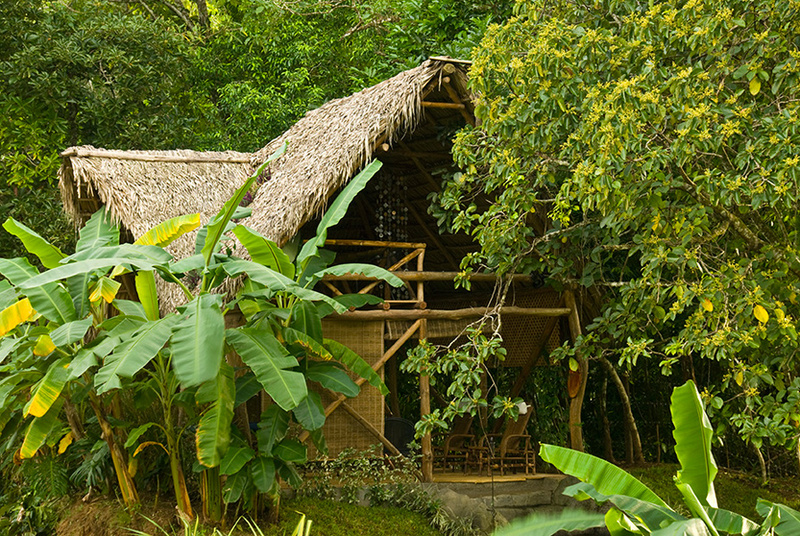 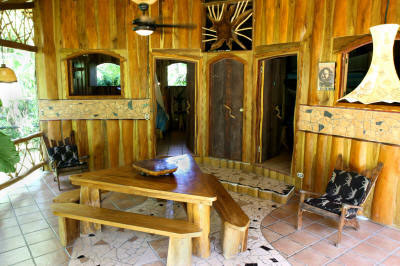 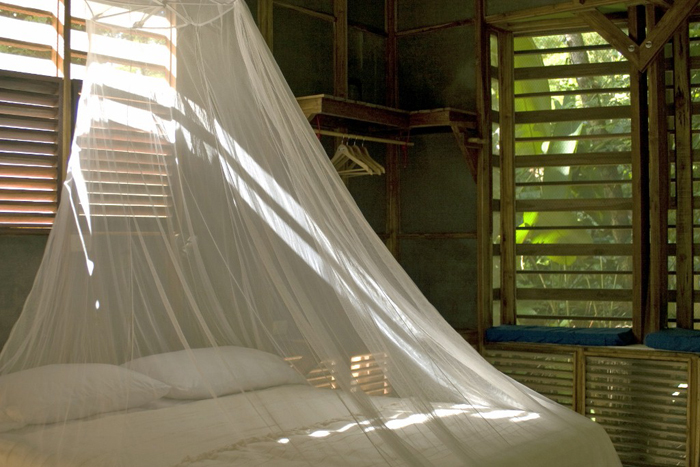 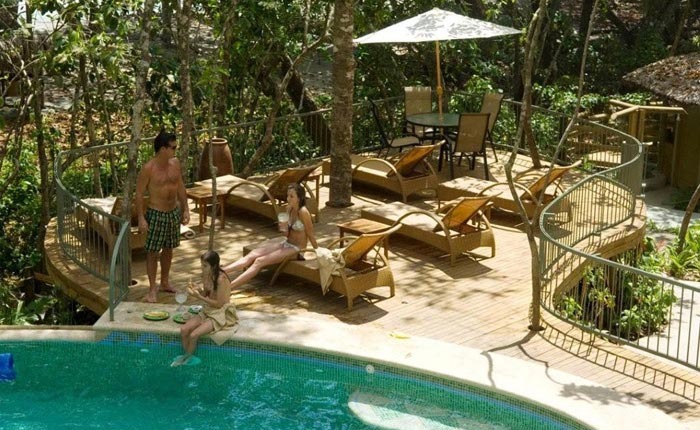 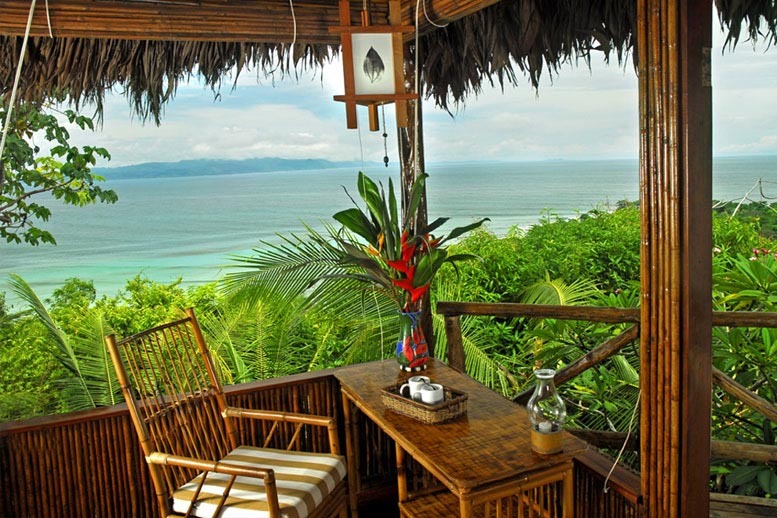 The Mawamba Lodge offers its guests a hideaway to enjoy nature on Costa Rica’s Caribbean Coast. 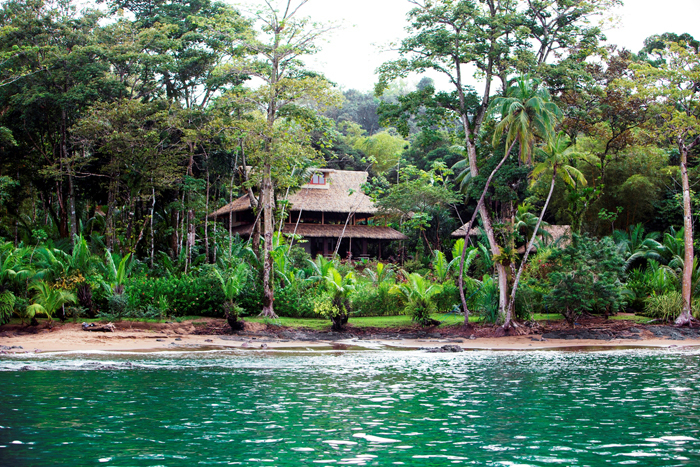 The unique location of the lodge on a sandbar between the Torteguero canals and the Caribbean Sea allows direct access to the beach and the canals. 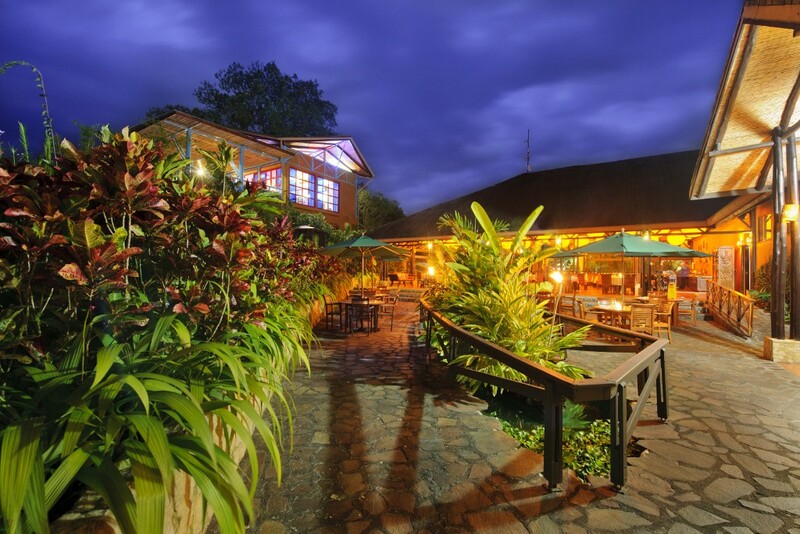 Covering 15 acres, Mawamba Lodge is a nature lovers paradise combining rustic accommodations with the lush rainforest. 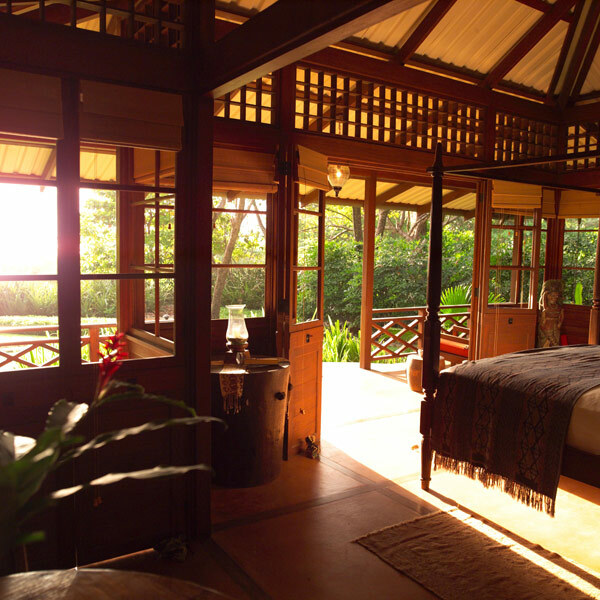 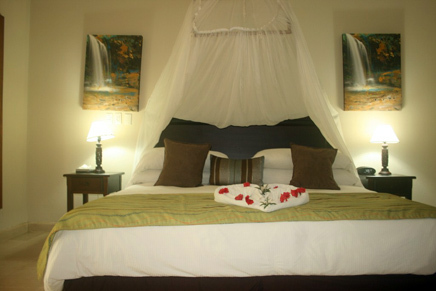 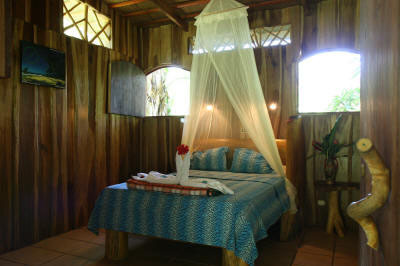 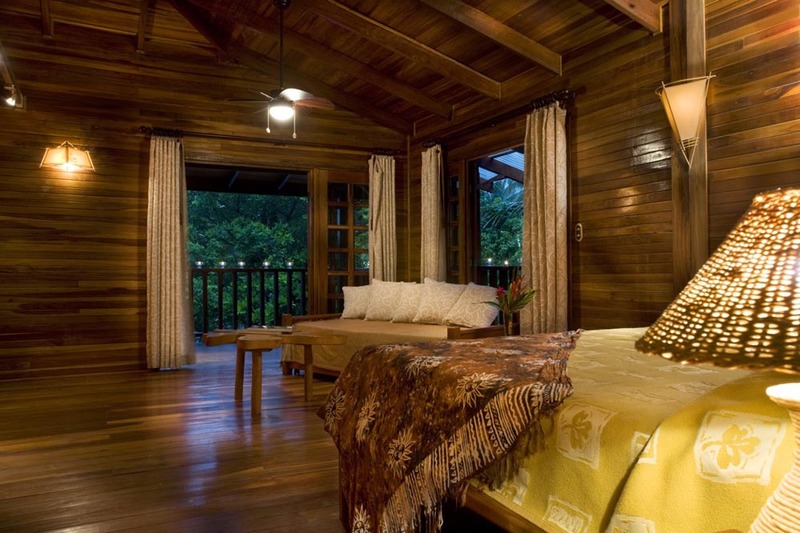 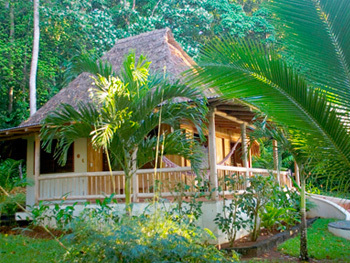 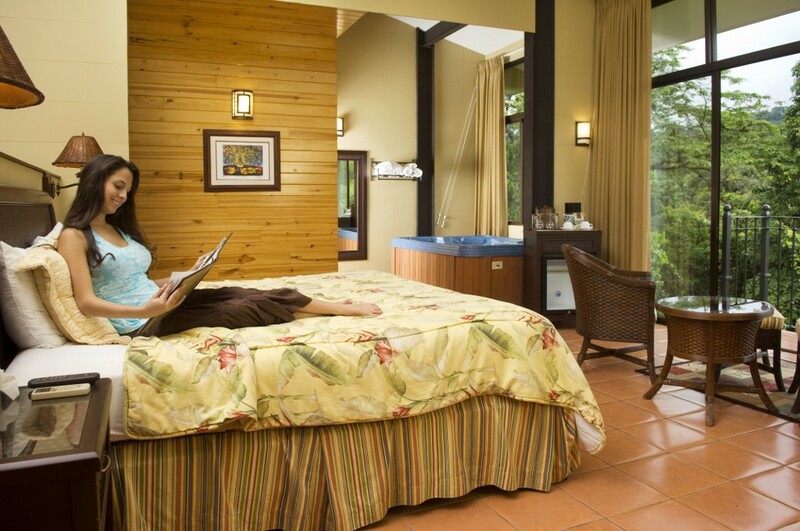 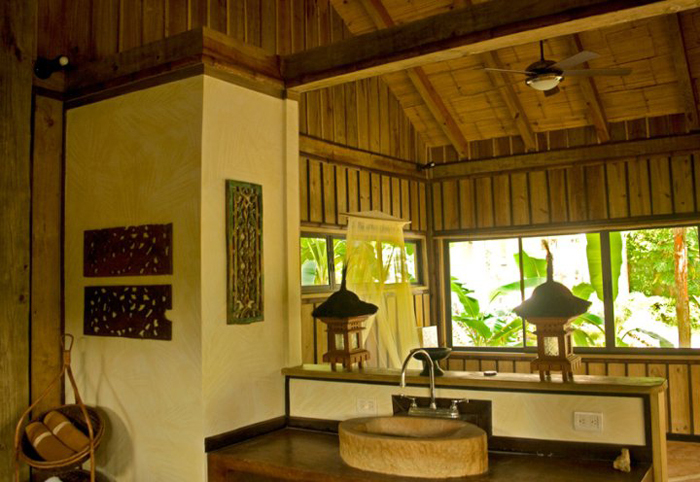 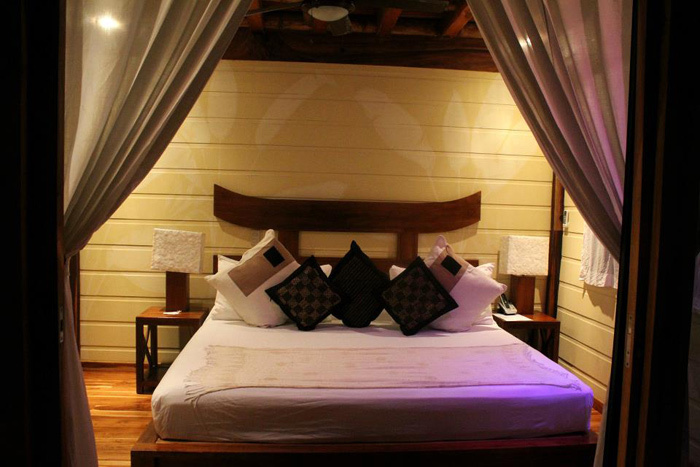 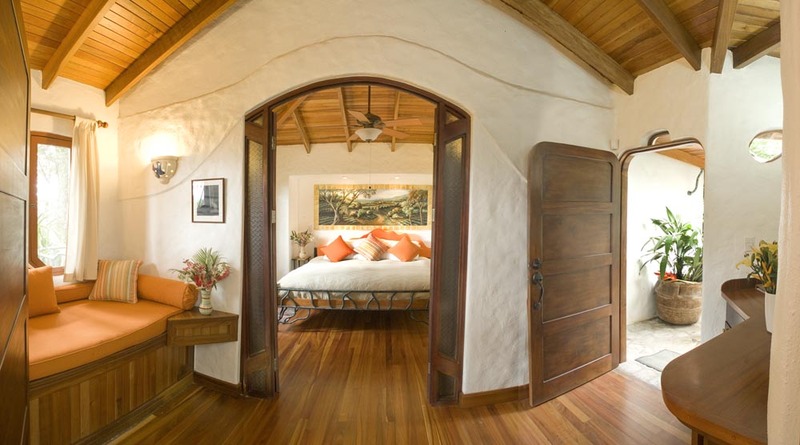 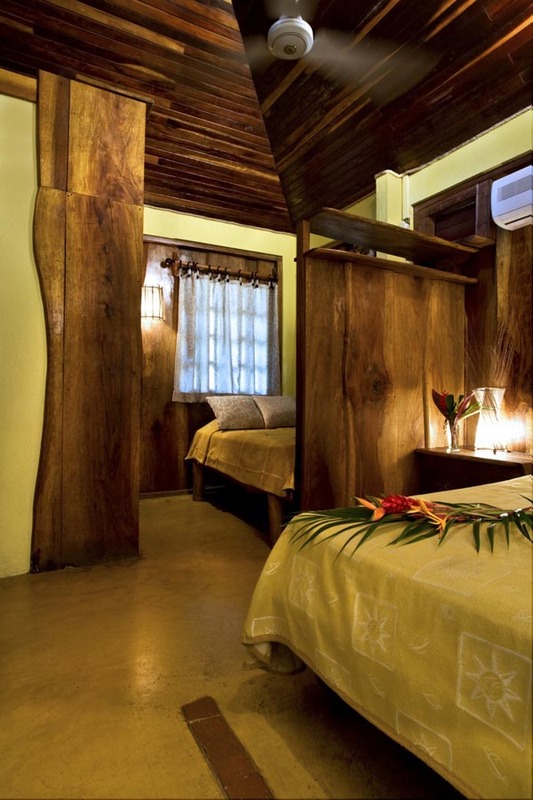 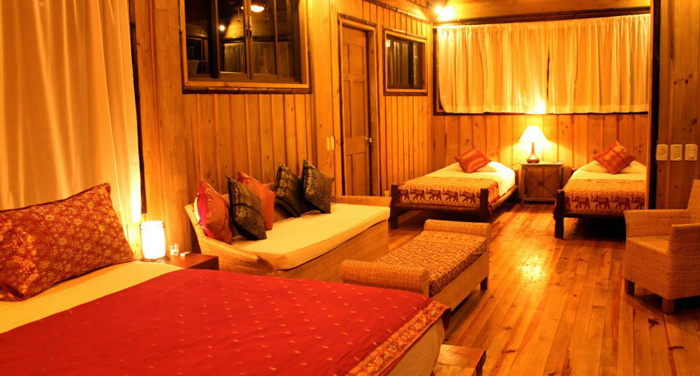 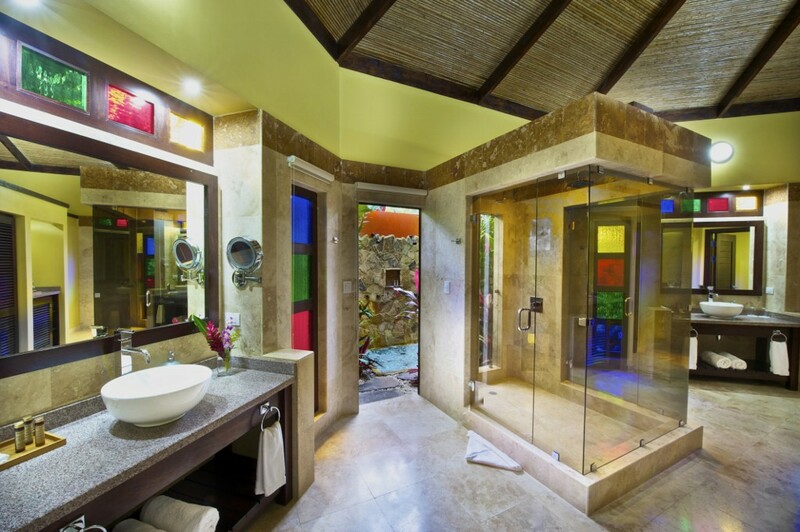 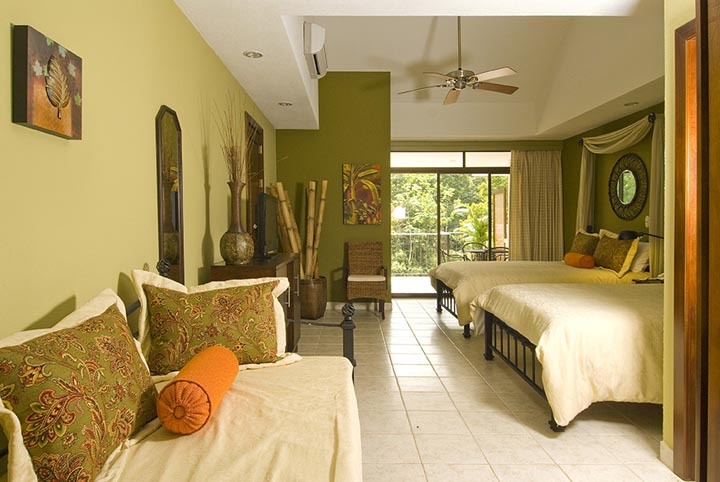 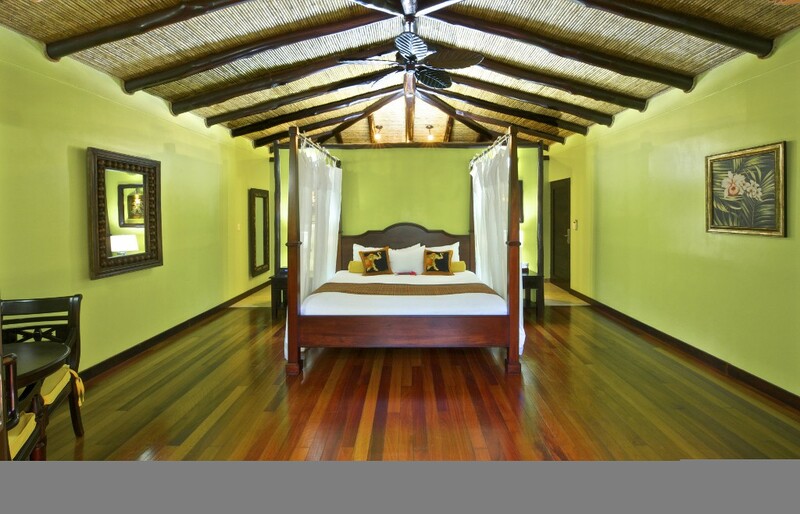 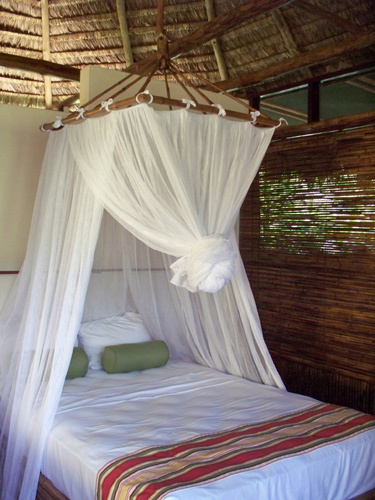 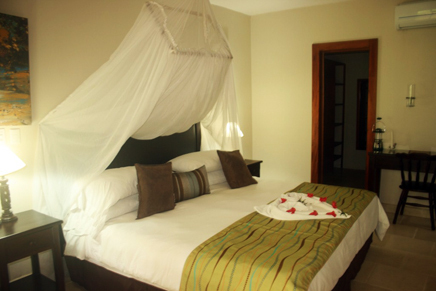 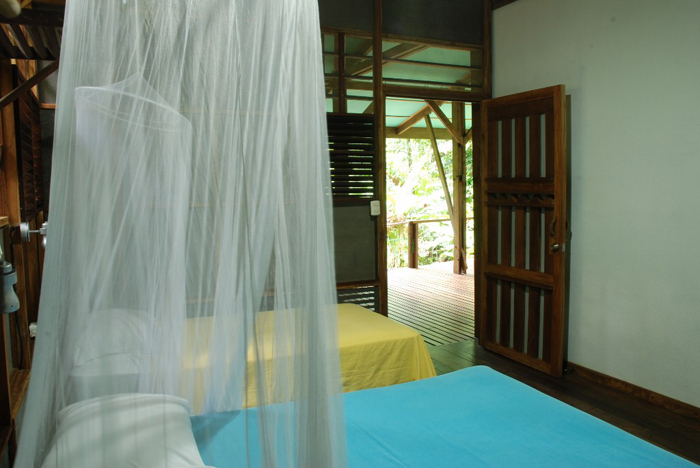 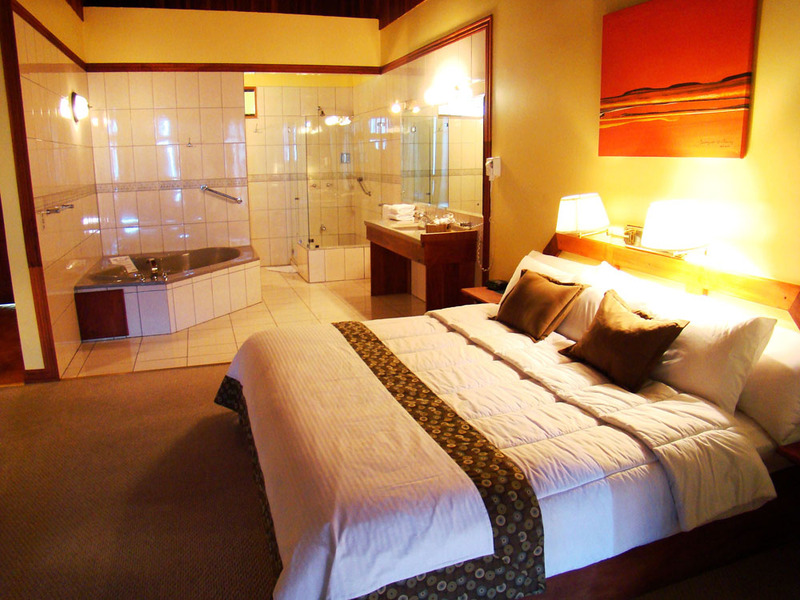 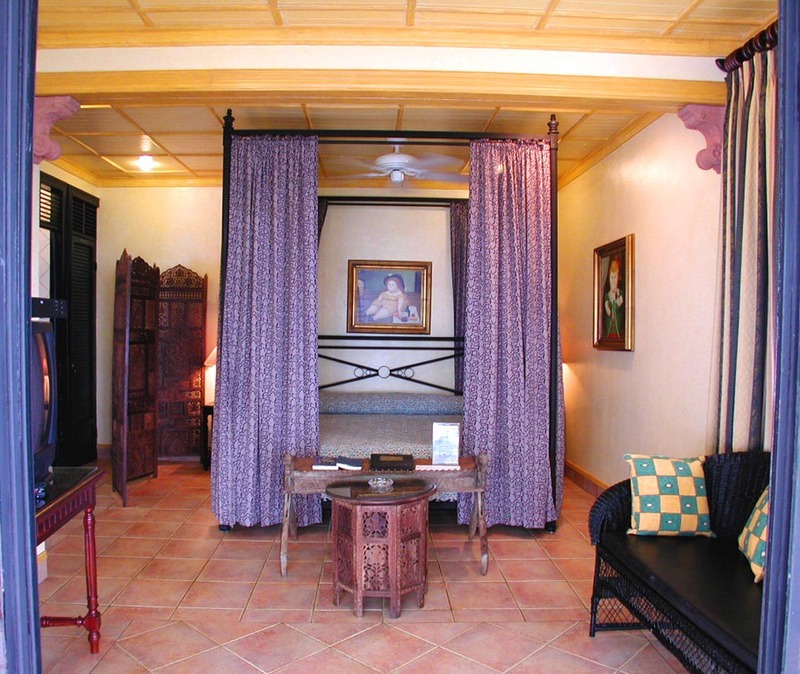 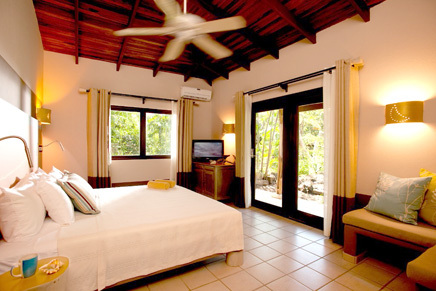 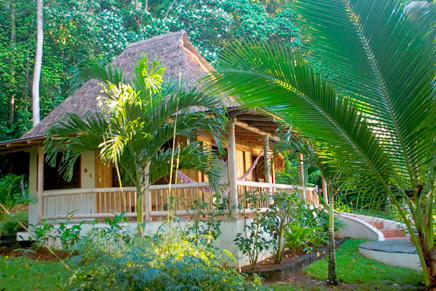 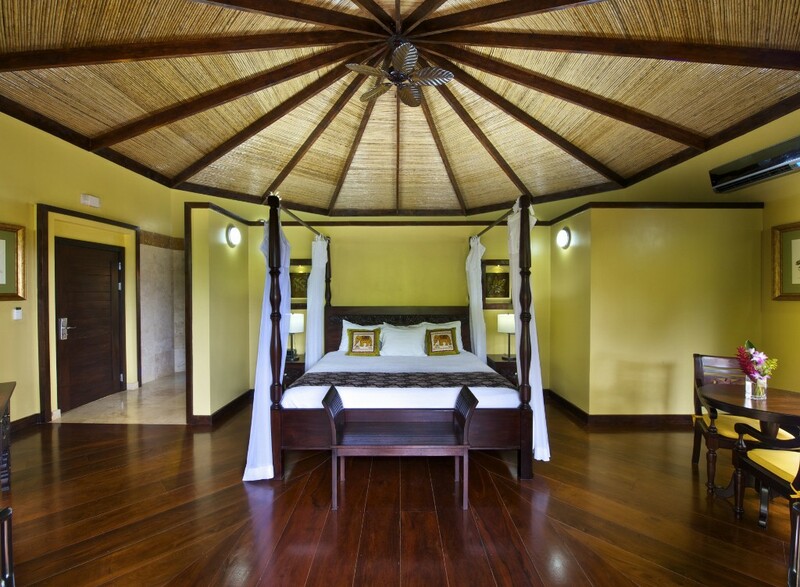 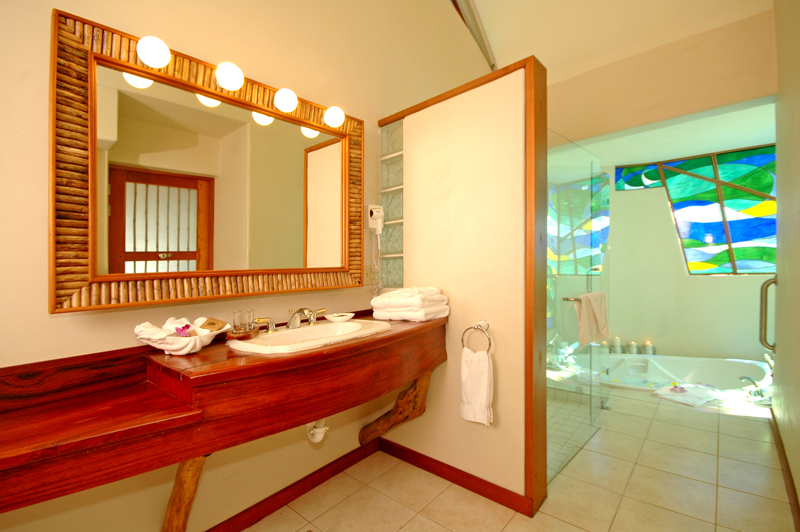 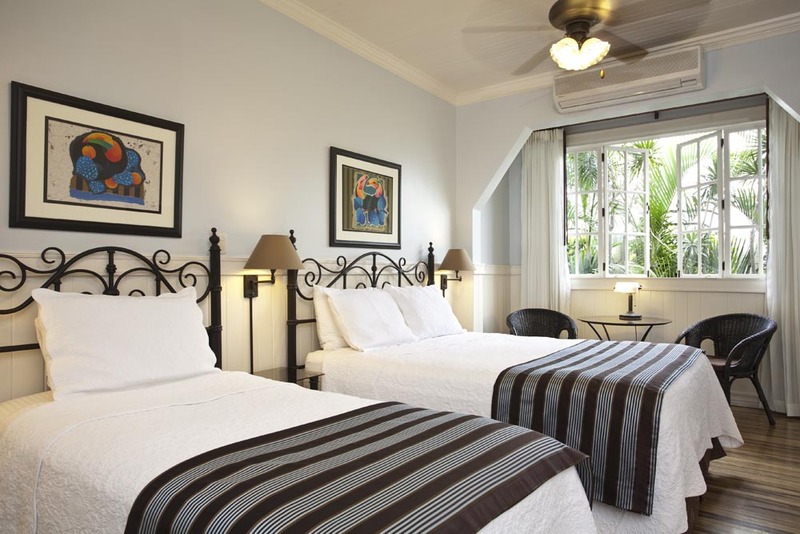 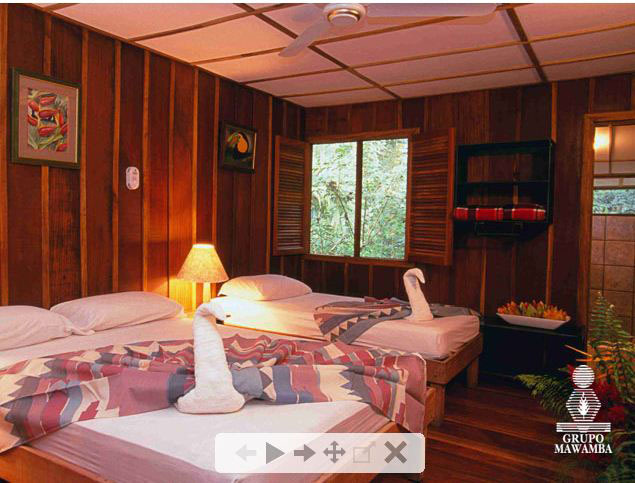 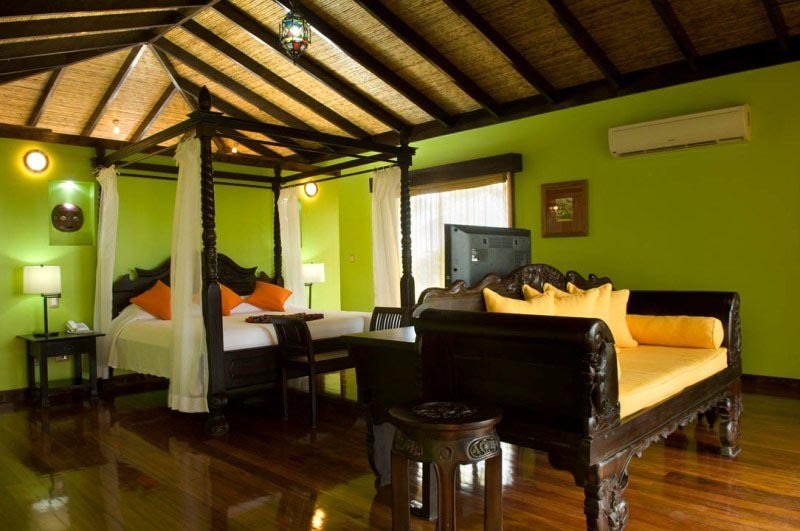 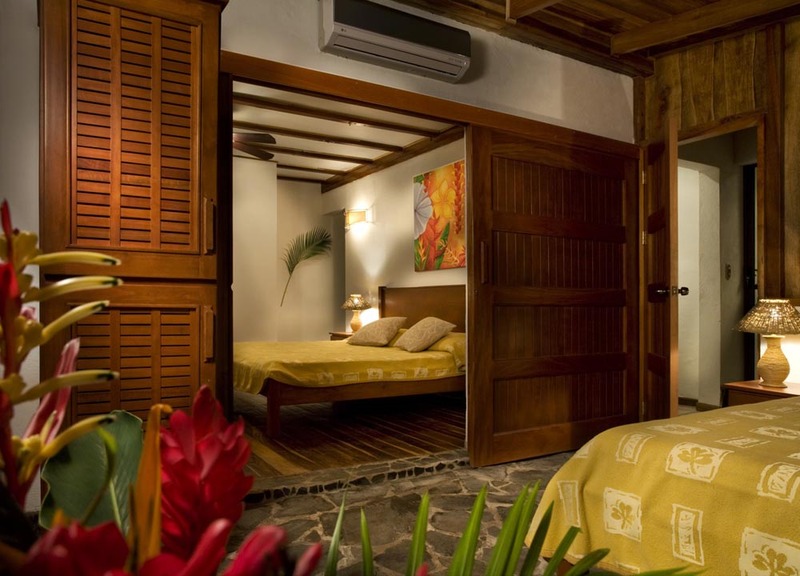 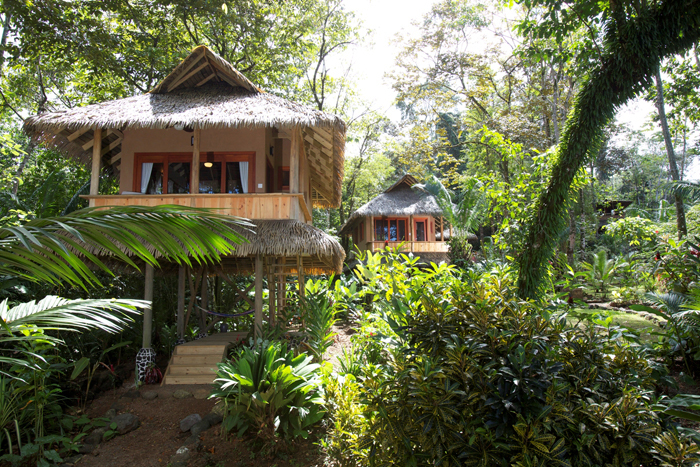 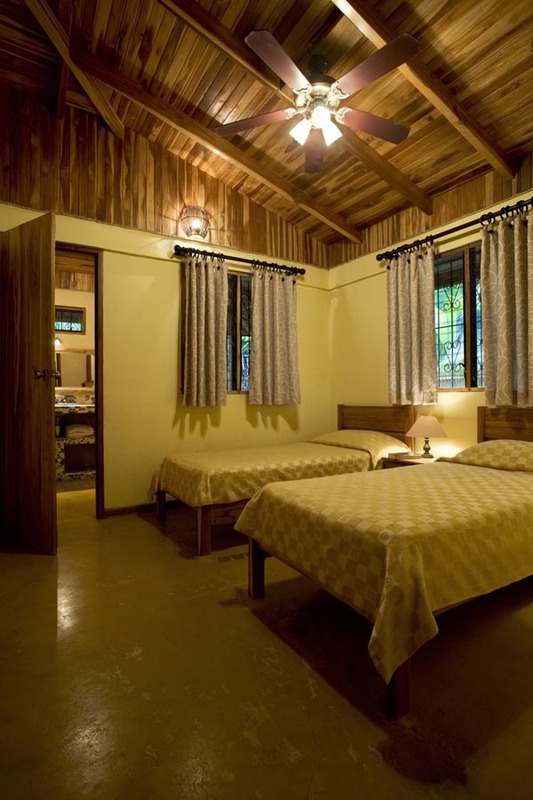 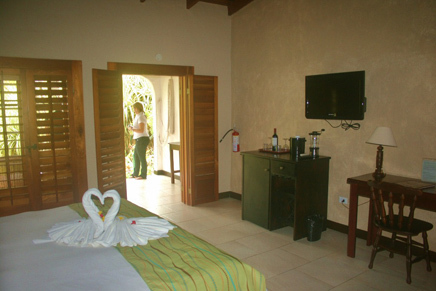 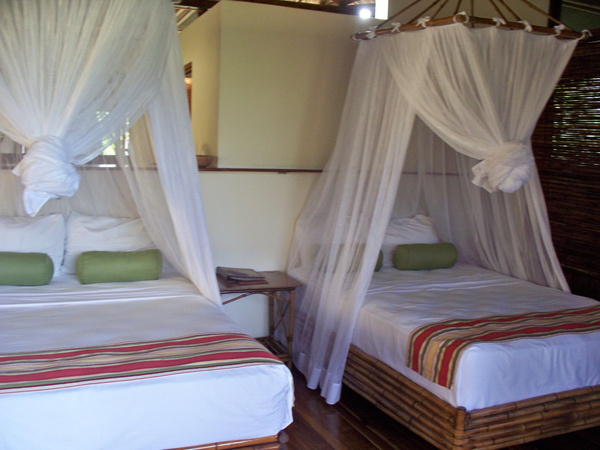 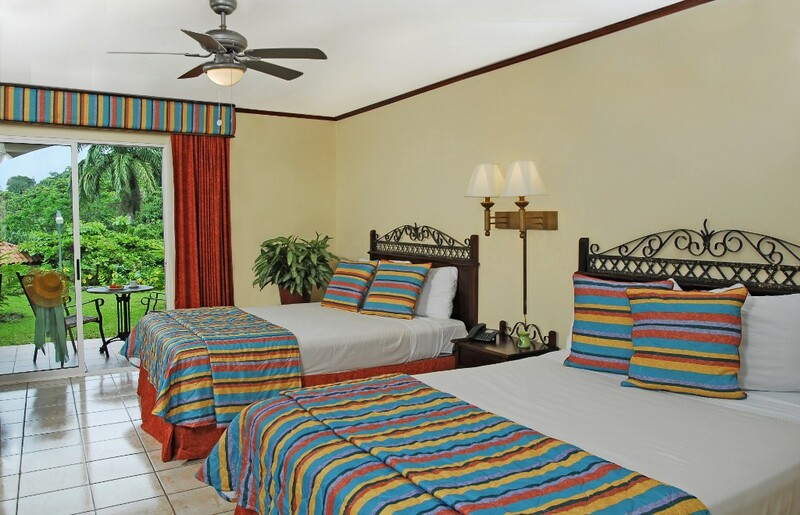 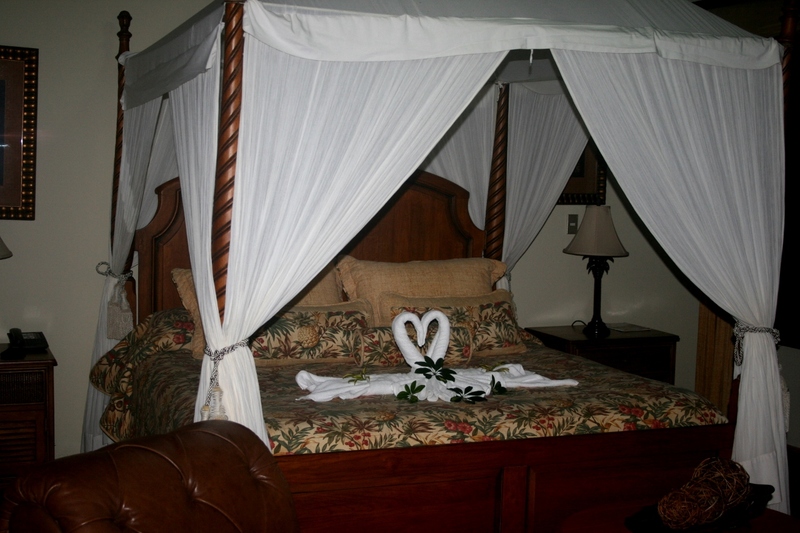 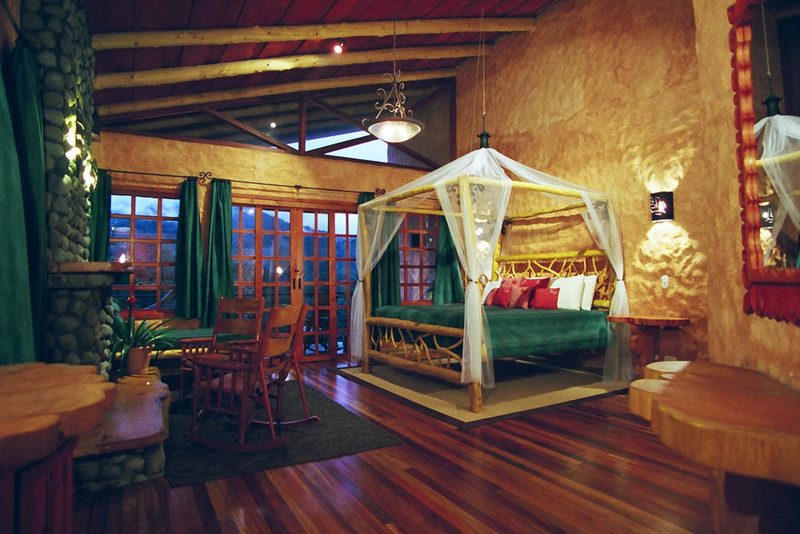 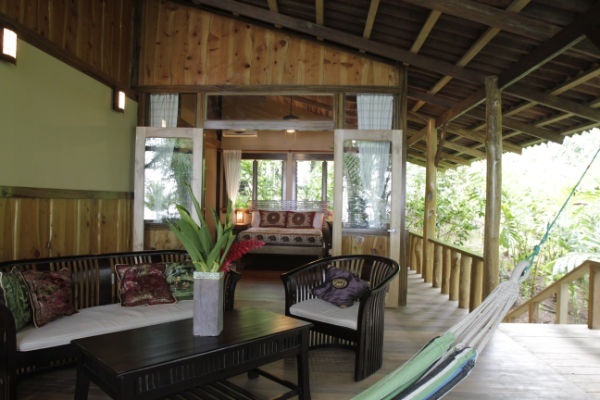 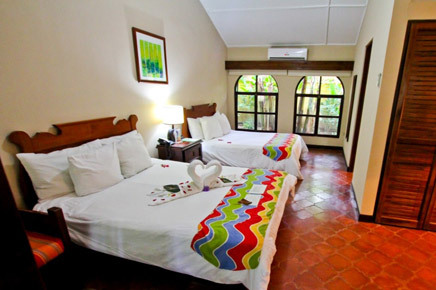 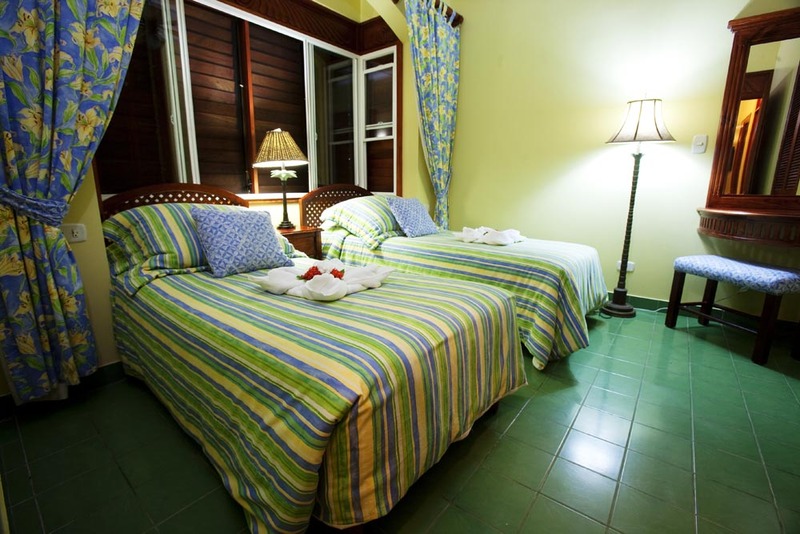 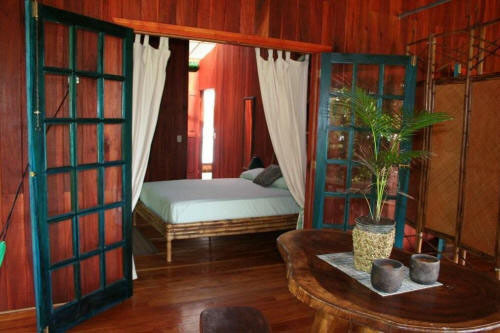 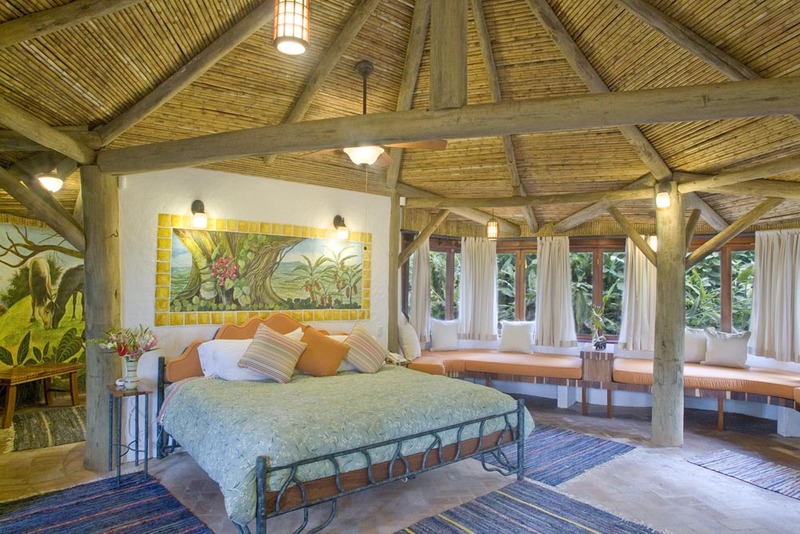 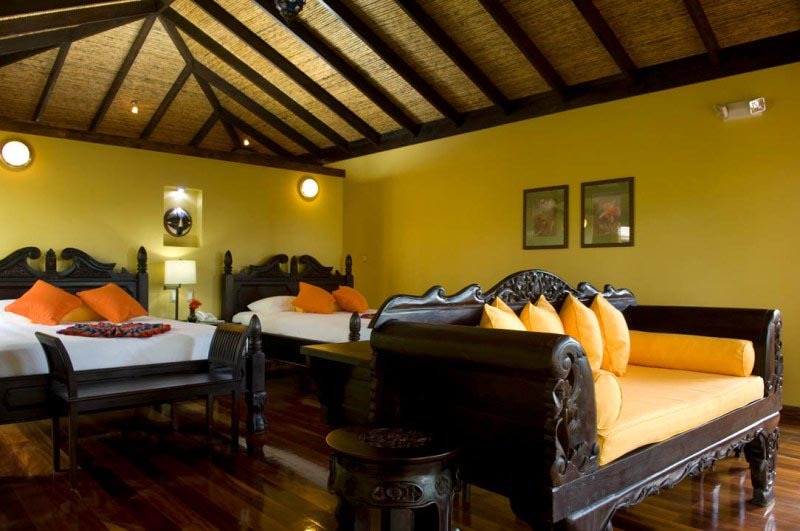 Each room is built in the rainforest and is equipped with one double and a single bed or 3 single beds. 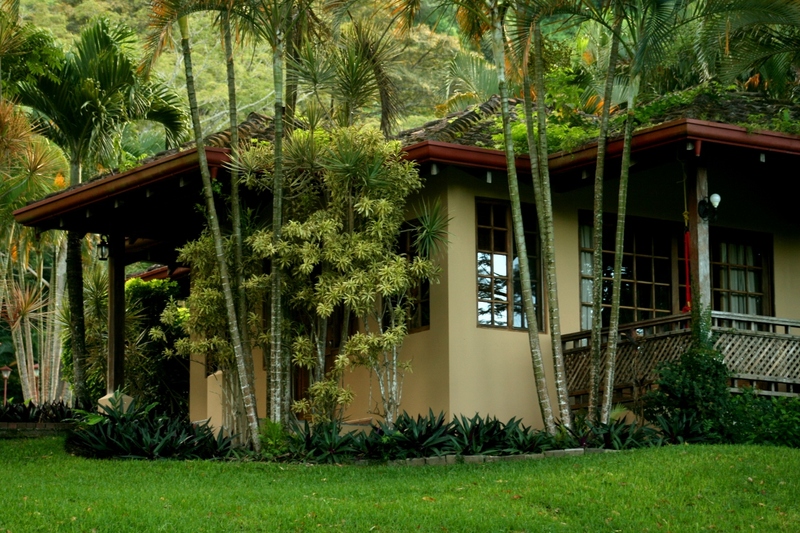 Being in the rain forest means you will get tranquil garden views, exuberant jungle vegetation, exotic birds and wildlife. 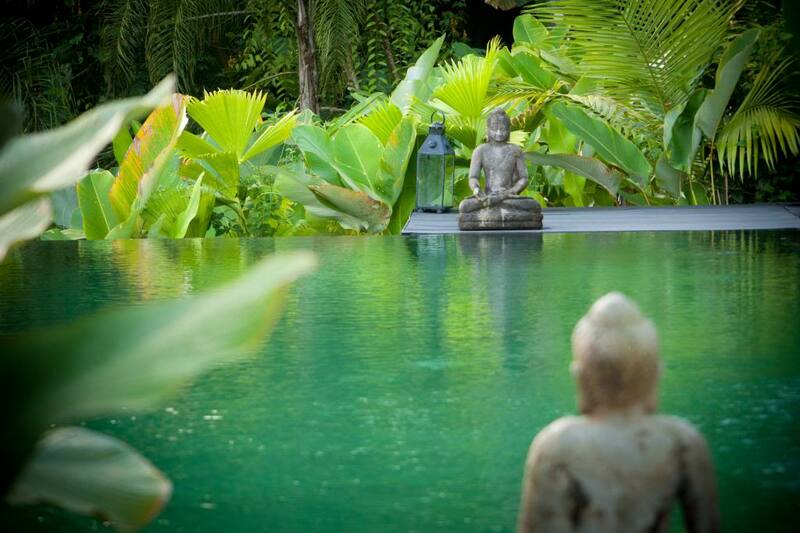 It is a perfect balance of nature. 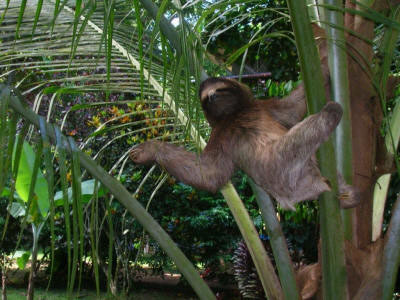 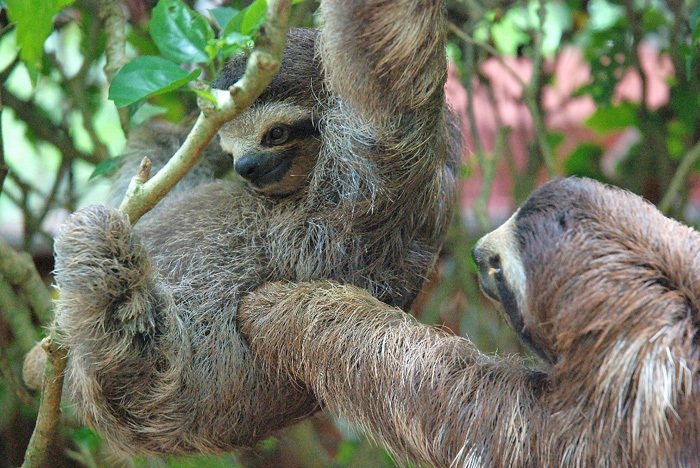 Kukula is the name given to sloths (Bradypus tridactilus) by inhabitants of the south Caribbean region of Costa Rica. 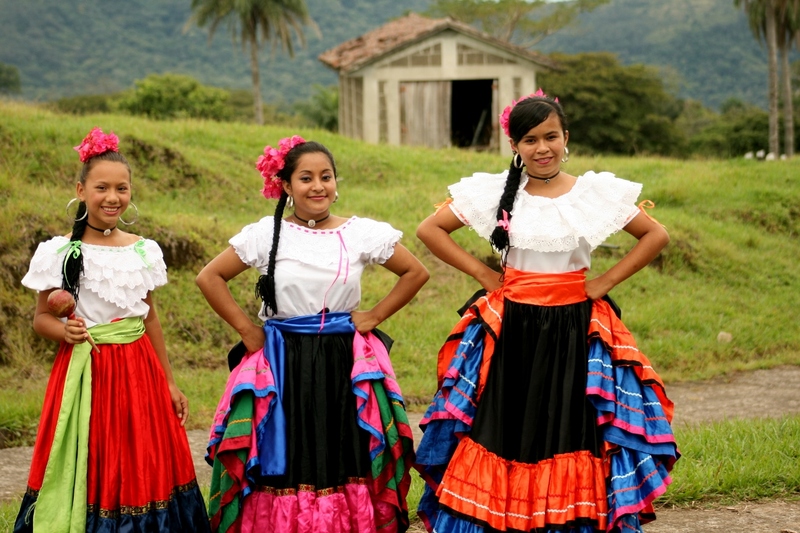 No one knows the exact origin of the word but it is believed to derive from one of the many indigenous languages. 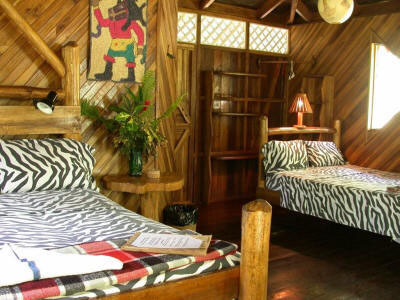 La Kukula Lodge is situated in the heart of the south Caribbean jungle of Costa Rica, yet only 300 metres from the white sands of Playa Chiquita /Puerto Viejo de Limon. 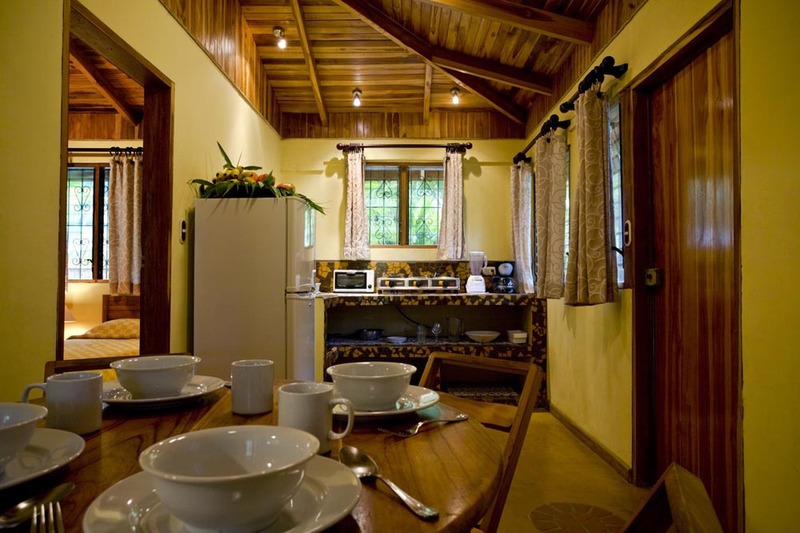 With 8 rooms available, our lodge is ideal for visitors looking to relax and revitalize themselves. 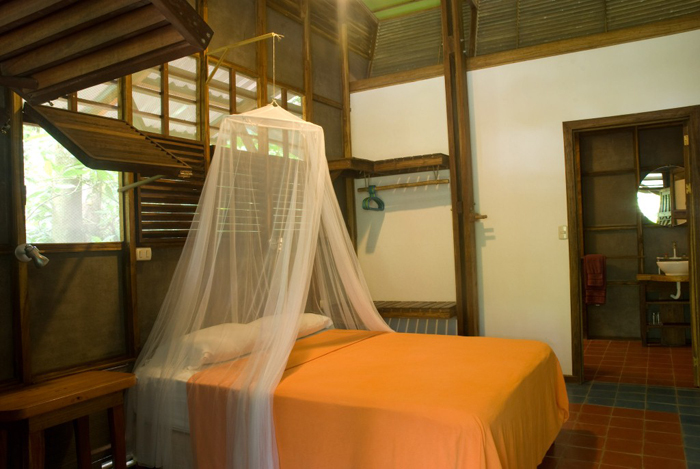 Each room is en suite, equipped with hot water, fans and mosquito nets, and has fantastic views from private terraces onto the sylvan garden. 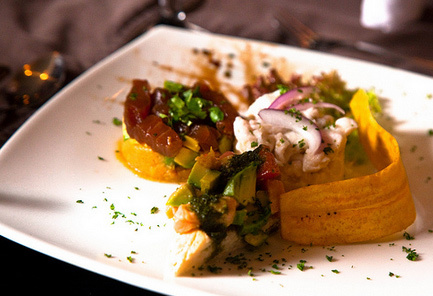 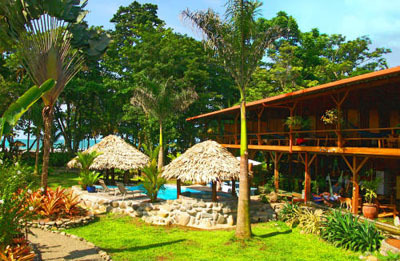 Experience authentic Costa Rica. 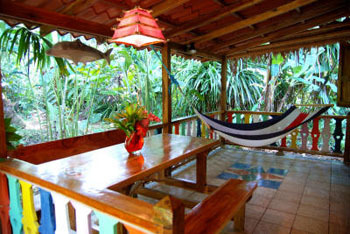 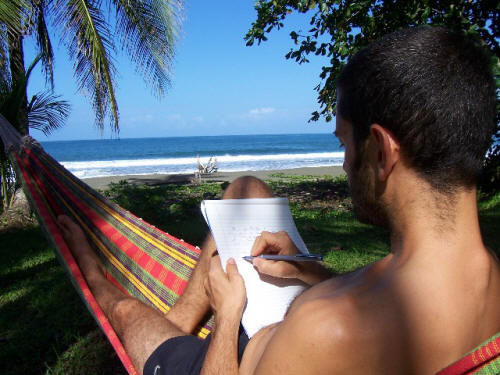 Banana Azul in Puerto Viejo is Costa Rica for the traveler who wants a genuine vacation near a beautiful beach that stretches for miles. 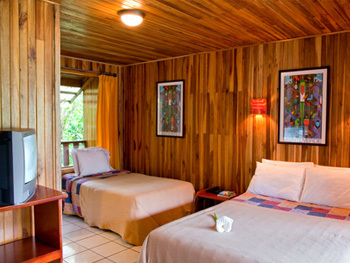 Your hosts Colin (from Vancouver, Canada) and Roberto (from San Jose, Costa Rica) have built a hotel out of local hardwoods boasting 12 beautiful guest rooms, all with private bath and free wireless internet, Banana Azul accommodates adventurous travelers looking for a comfortable, tranquil place to stay while visiting the Caribbean Coast of Costa Rica. 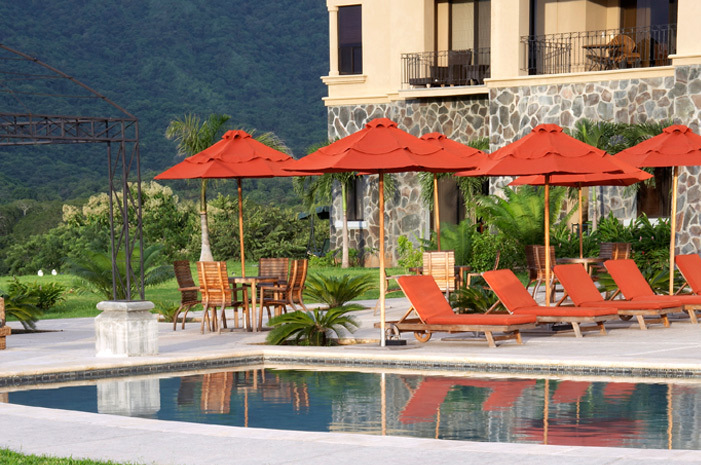 Relax under one of the new shade ranchos and enjoy some poolside bar service. 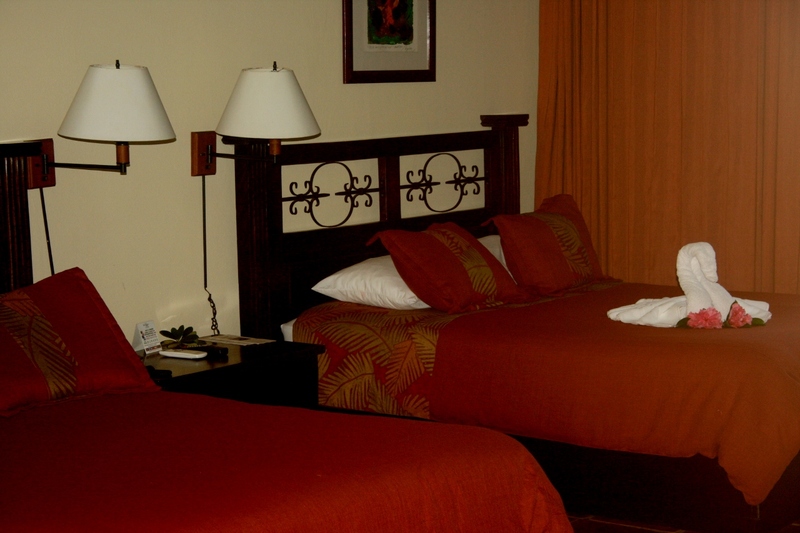 All rates for hotels are based on double occupancy. 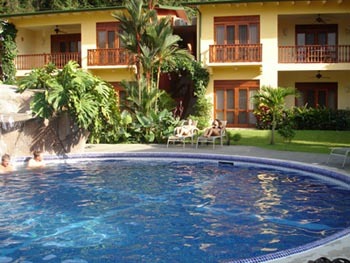 In all hotels in Costa Rica, please add a 13% for taxes, if it is not already included. 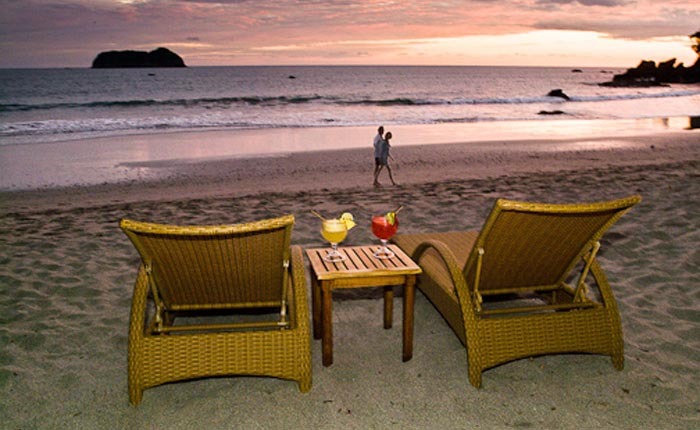 Arenas Del Mar is a beach and nature resort located adjacent to Manuel Antonio National Park on the Pacific coast of Costa Rica. 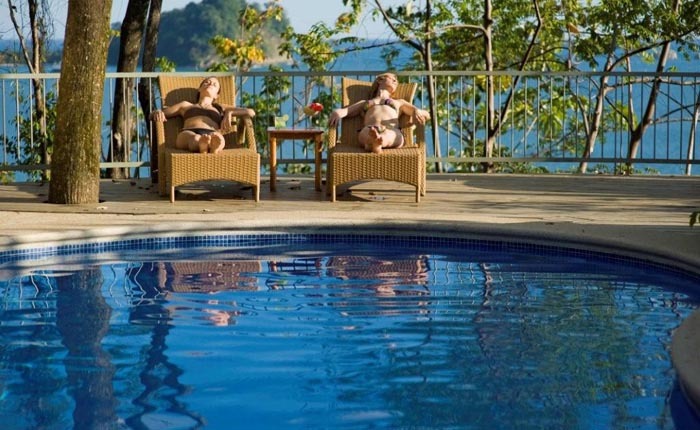 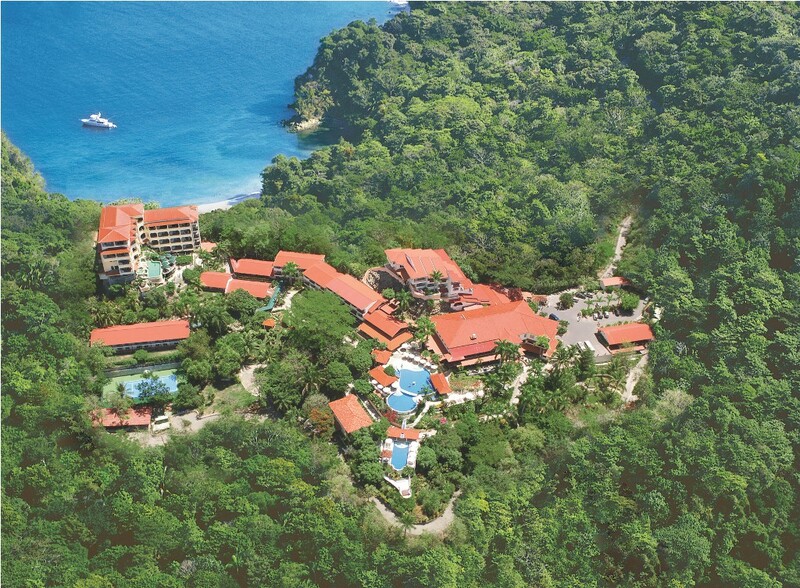 This Manuel Antonio resort caters to tourists looking for more than just another high end resort experience.The Arenas Del Mar Hotel offers a luxurious experience in a spectacular beach and rainforest setting. 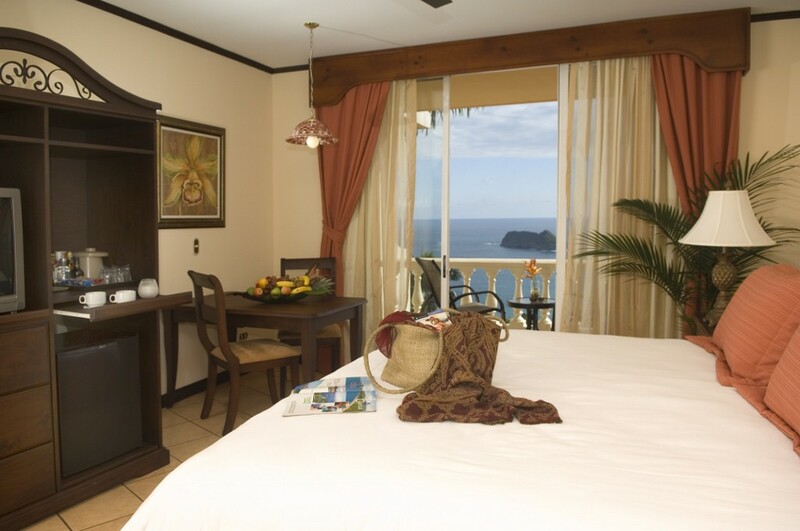 Guest rooms, apartments and suites offer spectacular ocean views, upscale dining in two hotel restaurants with a focus on fresh local products and personalized service that exceeds expectations. 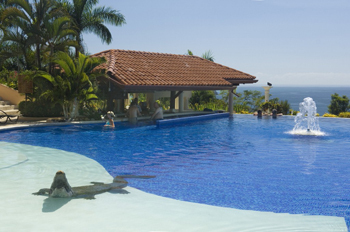 At Parador Resort & Spa you can lounge for hours at the infinity swimming pool gazing at the incredible views while sipping on your favorite cocktail, relaxing and reading your favorite book at the adult pool, or simply take advantage of the different recreation activities. 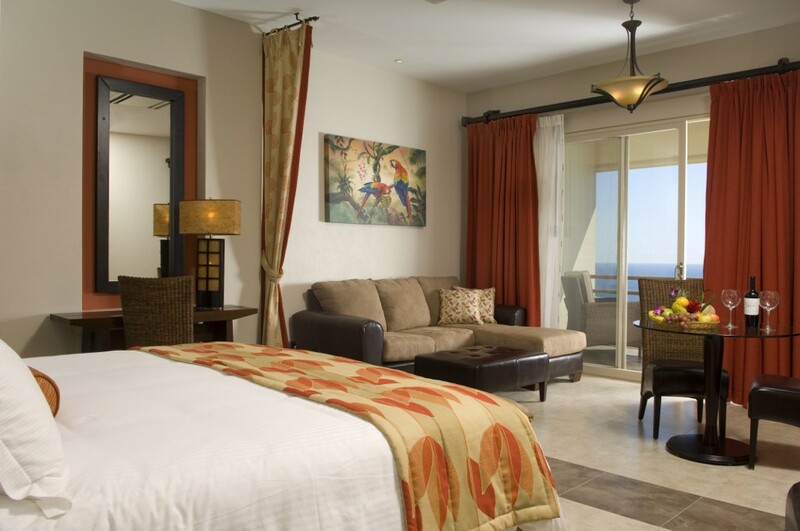 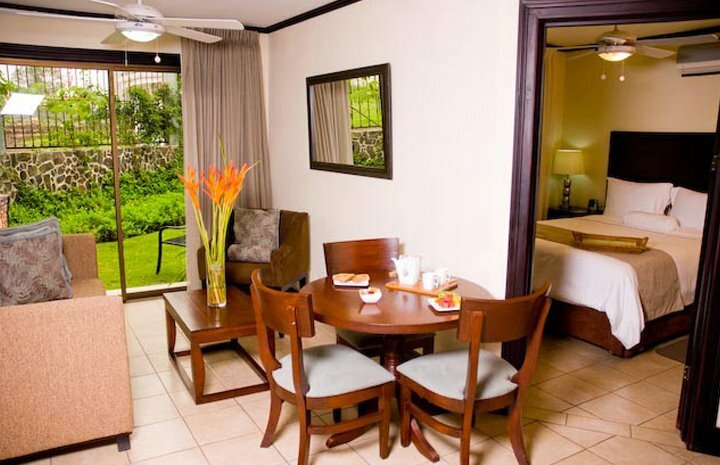 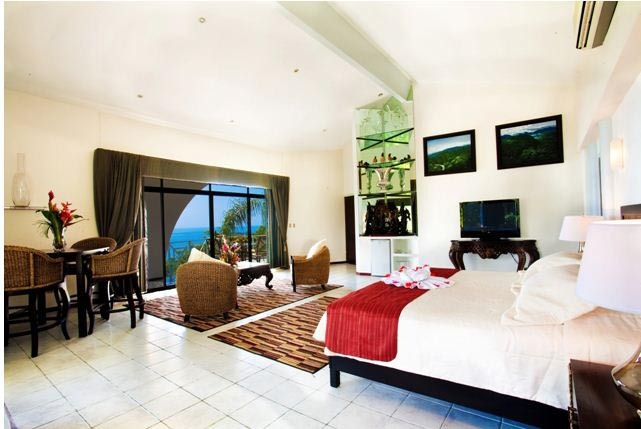 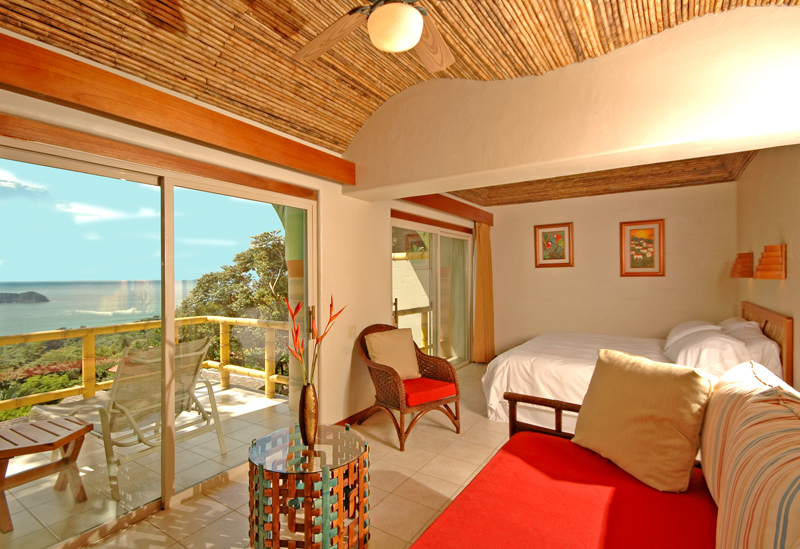 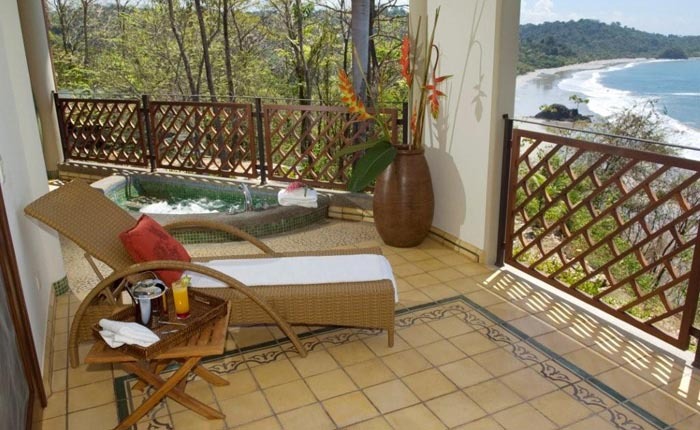 All rooms have balconies or terraces with views of either the rainforest or the ocean. 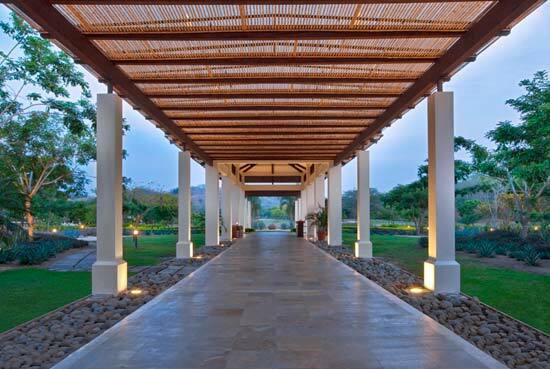 The newly opened “Pacifica Spa” at Parador Resort and Spa, provides treatments and an atmosphere for your total inner peace and relaxation. 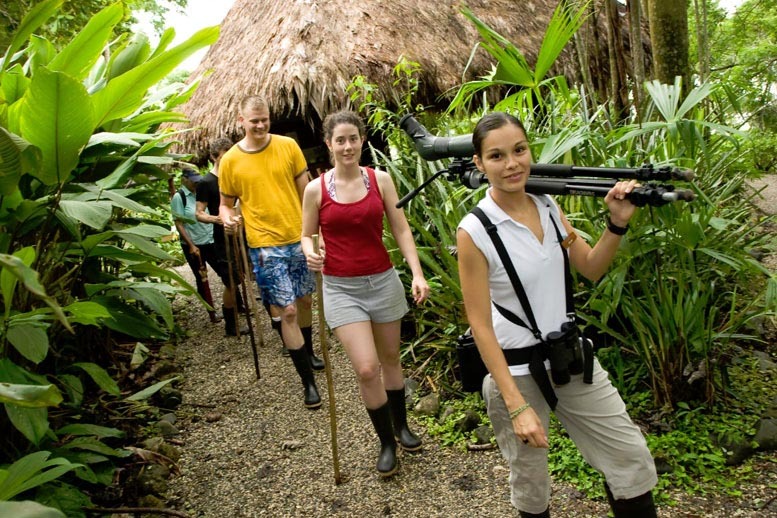 Explore the 12 acre premises including lush gardens and mysterious jungle landscapes where you are almost guaranteed to see wildlife, such as white-faced and titi-monkeys, sloths, iguanas, coudamandas, and many species of birds. 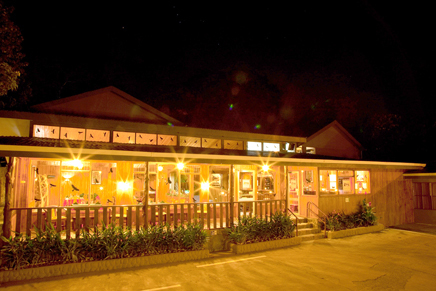 La Fragata Restaurant & Tapas Bar offers you a choice of fine dining experiences, with the best in International cuisine, tropical cocktails and Premium brand drinks. 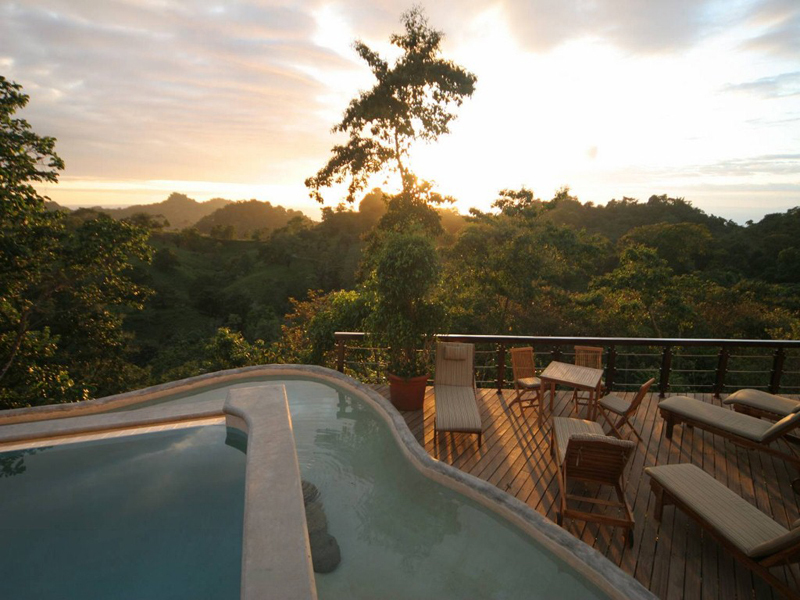 Located along Costa Rica’s Central Pacific coast, Si Como No is a uniquely special Manuel Antonio Resort Spa and Wildlife Refuge that sits atop one of the most idyllic hillsides in Manuel Antonio. 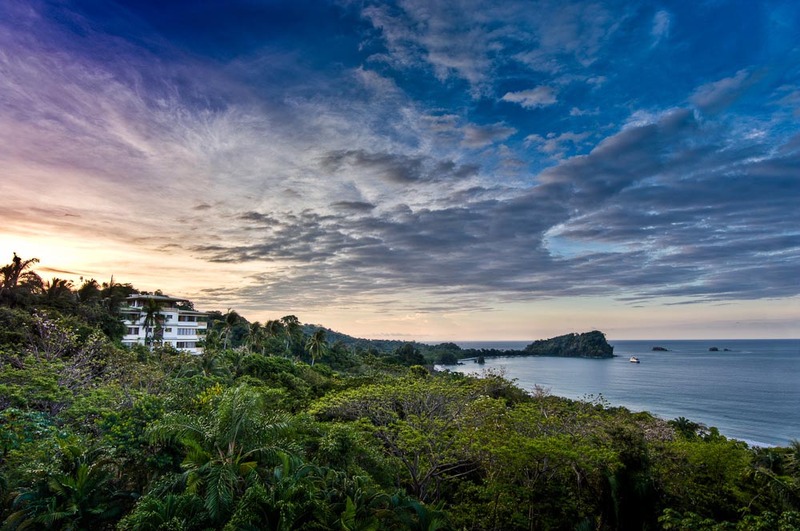 The resort’s lush jungle terraces and brilliantly vivid gardens overlook the sparkling ocean just above world-renown Manuel Antonio National Park. 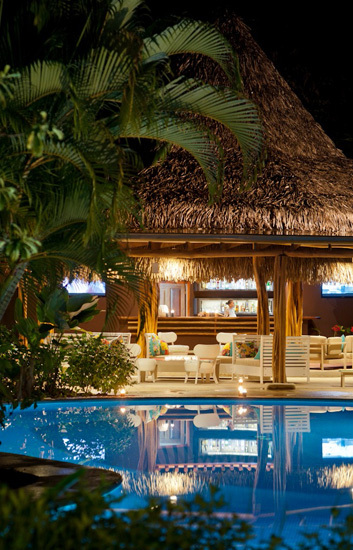 Borrowing its name from the local expression, “si como no” (sure, why not), this stunning Greentique Hotels resort is the perfect combination of Pura Vida attitude and barefoot luxury. 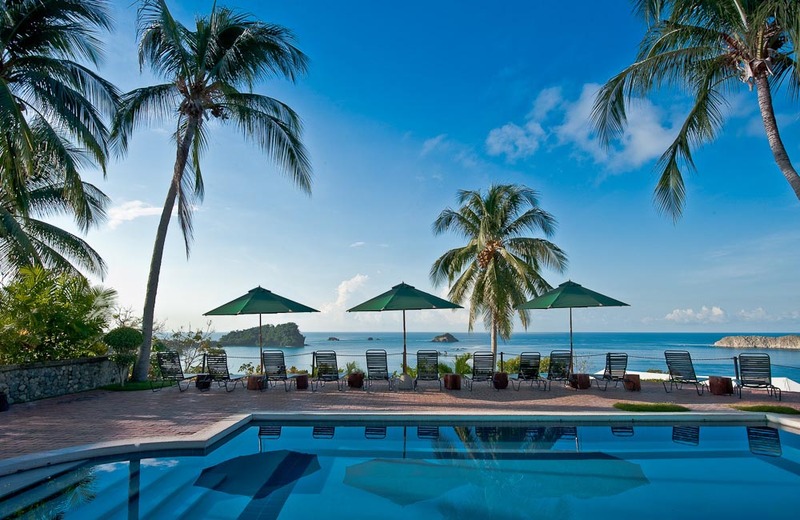 Of all the resorts in Manuel Antonio, you won’t find a more luxurious, laid-back environment than that of the award-winning Si Como No hotel. 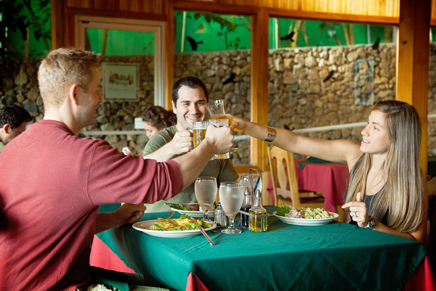 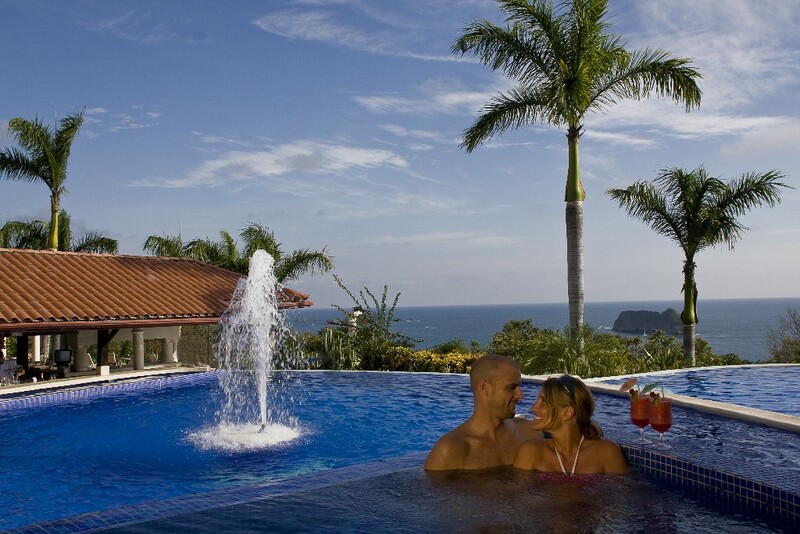 Ideal for families or couples seeking comfortable, well-appointed accommodations, it features a full array of spa & other resort amenities, superb dinning, custom designed nature-based tours and adventure activities – each designed to deliver both value & the authenticity of an exceptional Costa Rican experience. 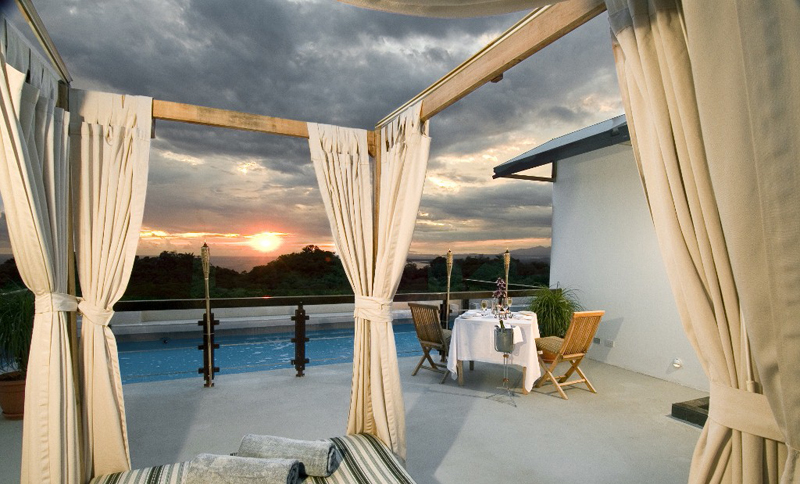 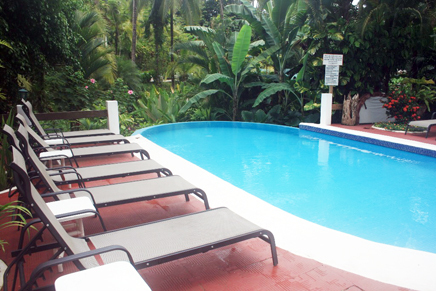 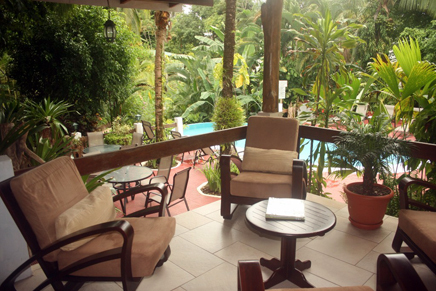 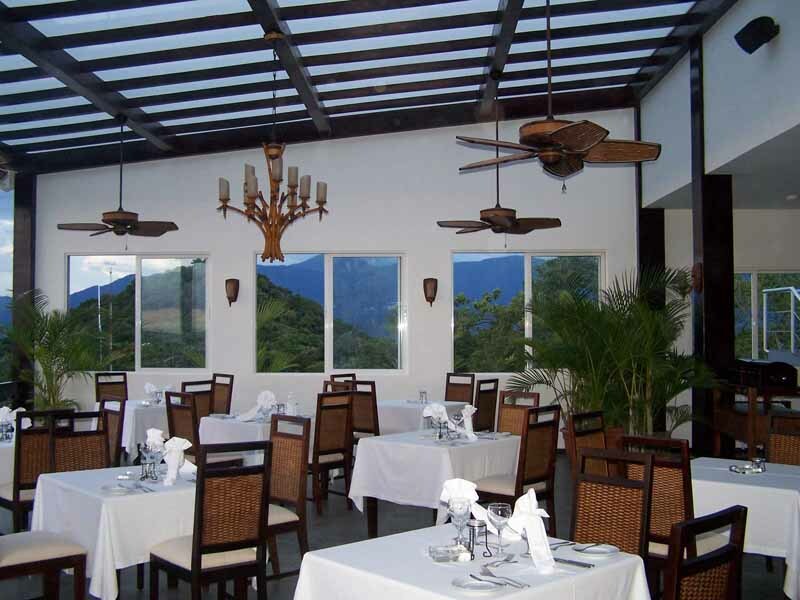 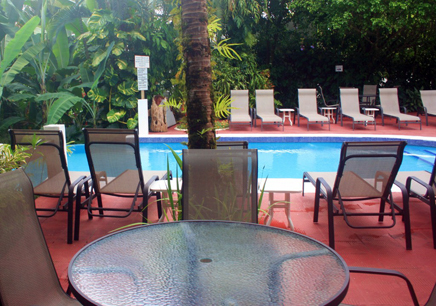 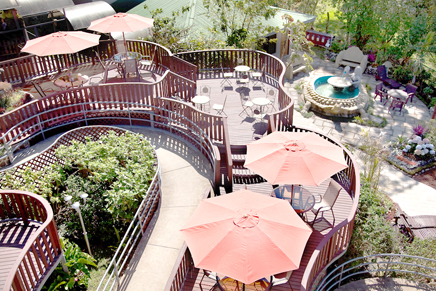 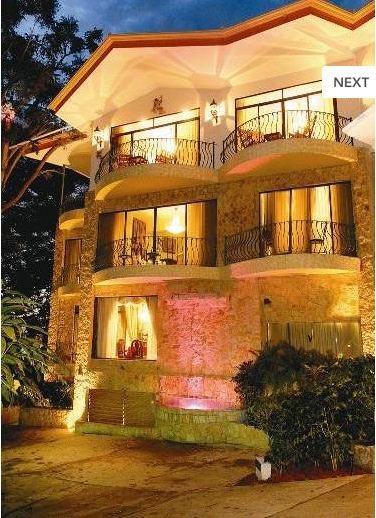 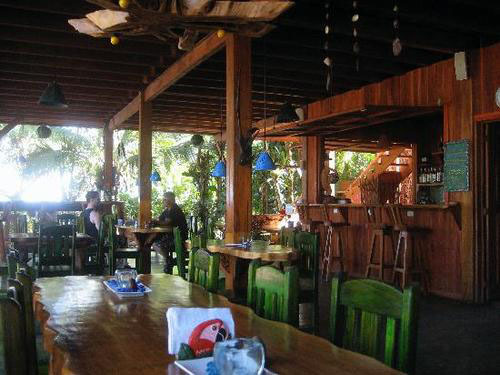 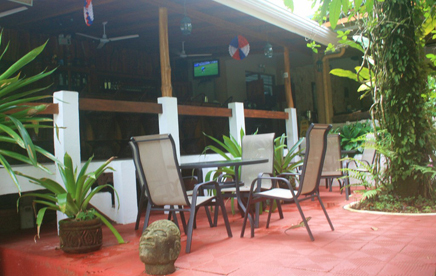 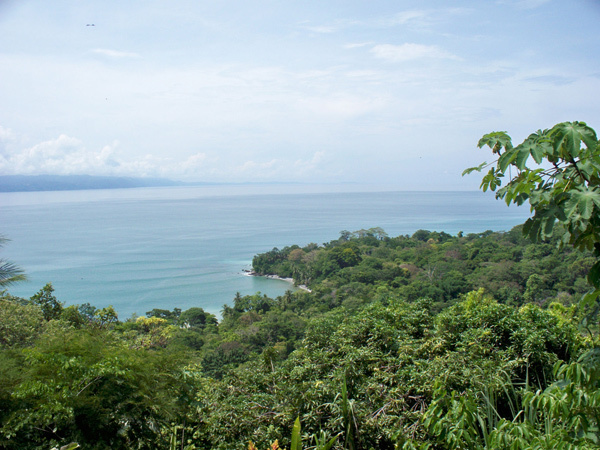 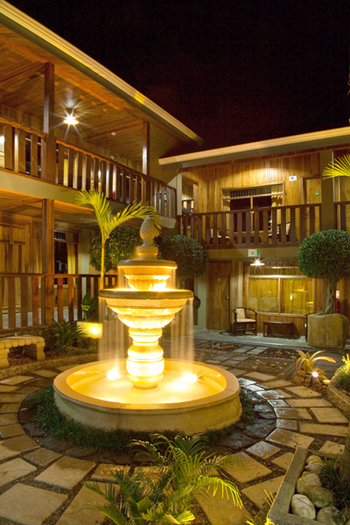 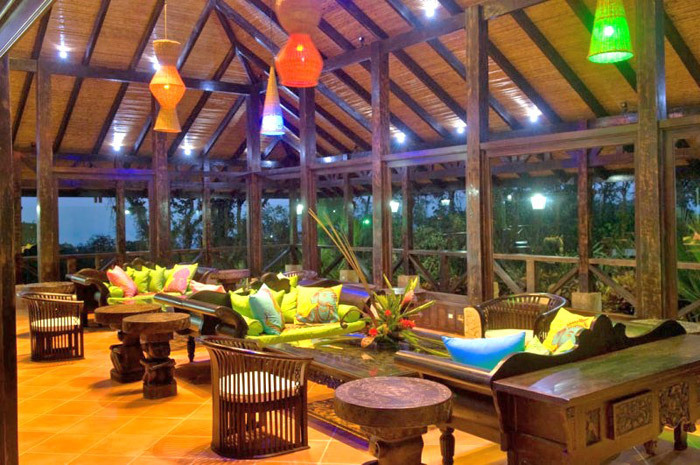 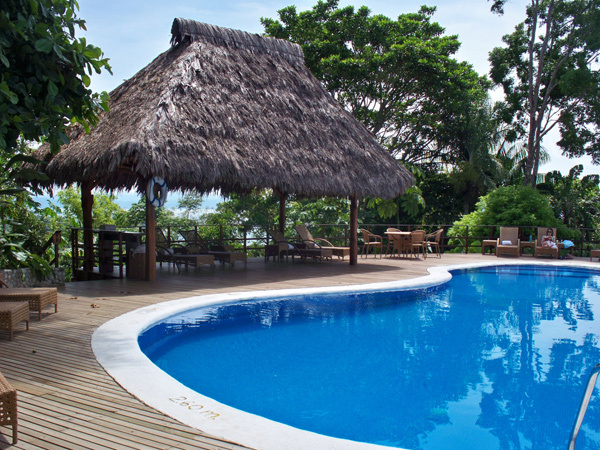 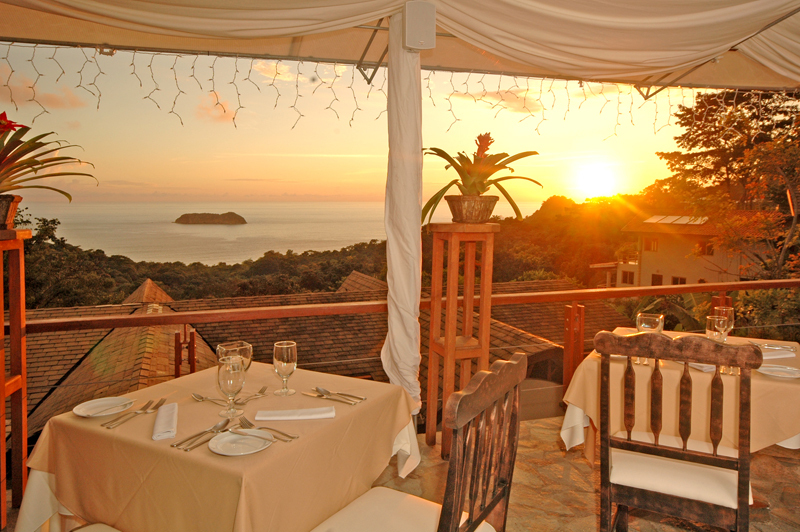 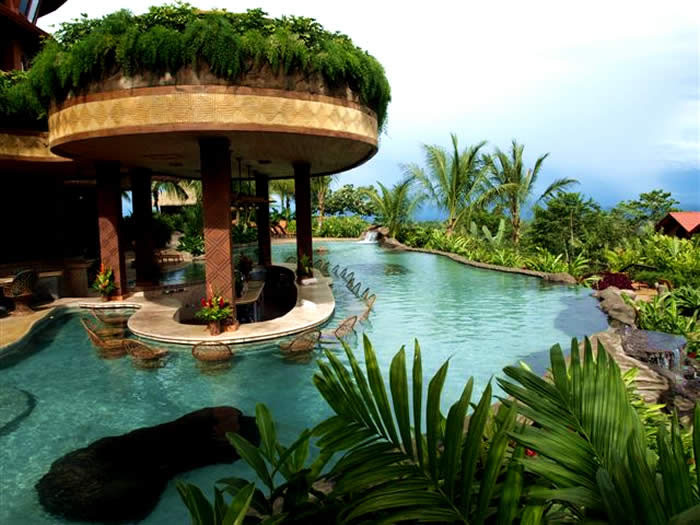 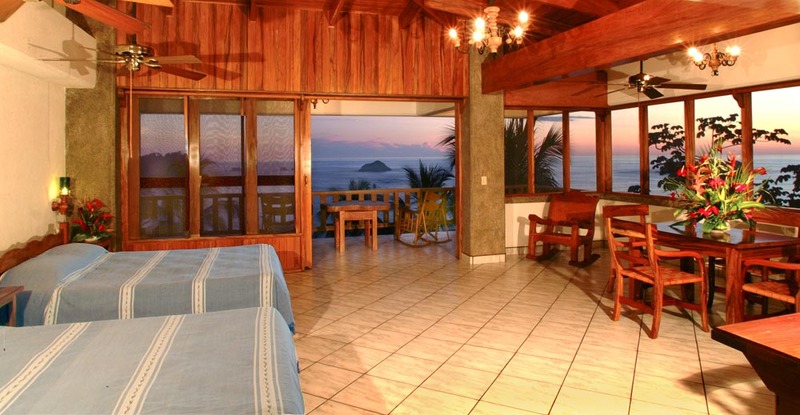 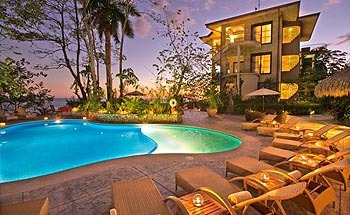 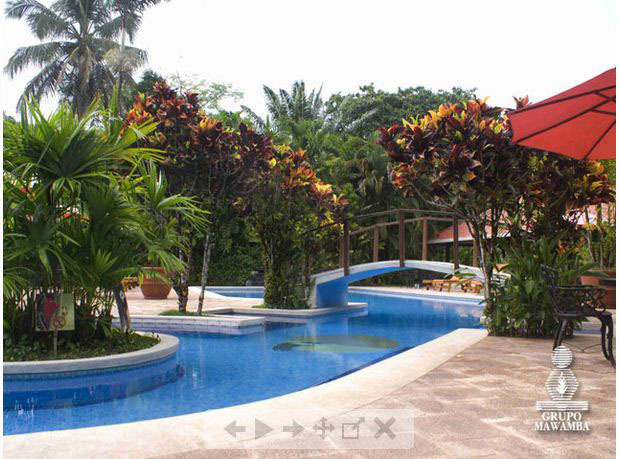 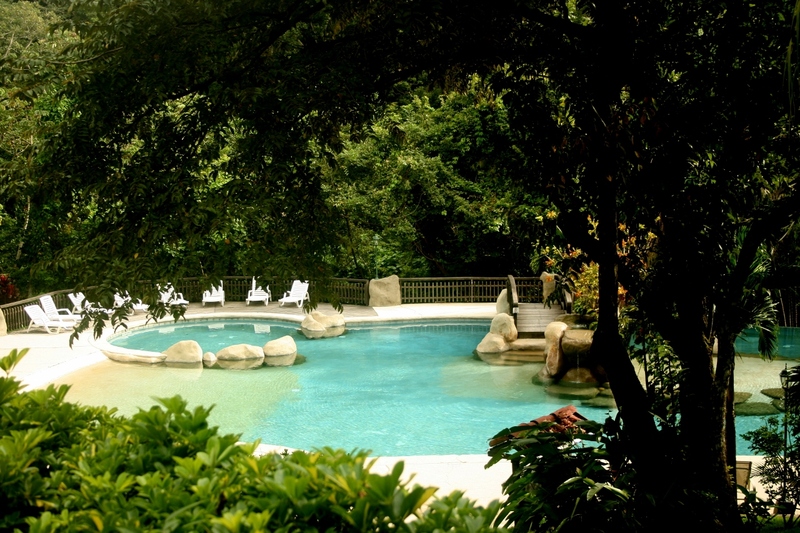 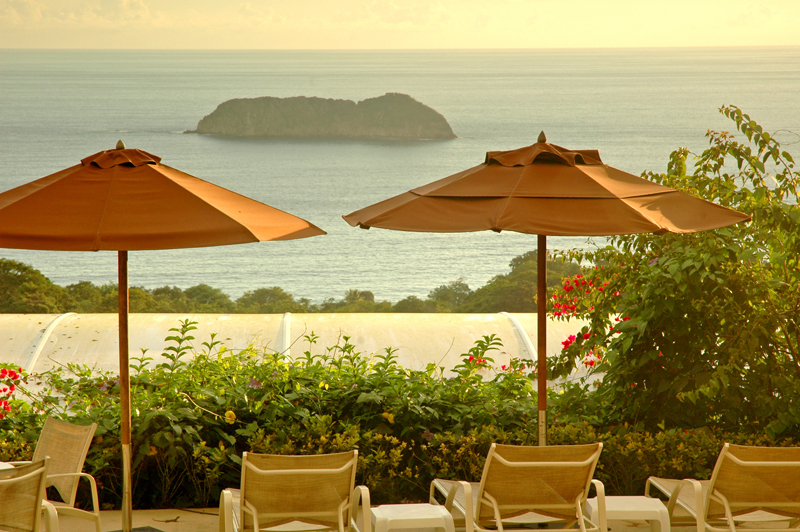 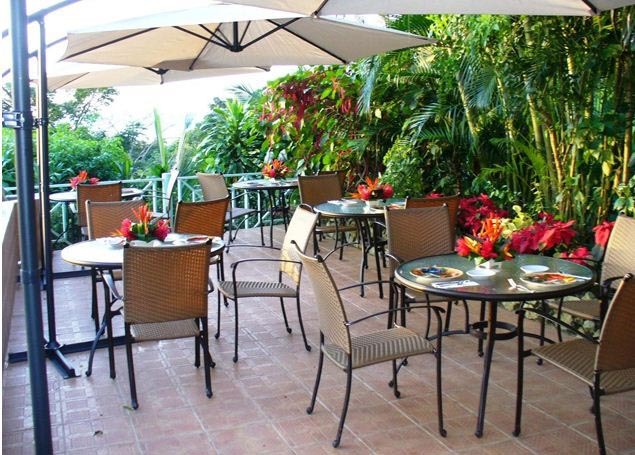 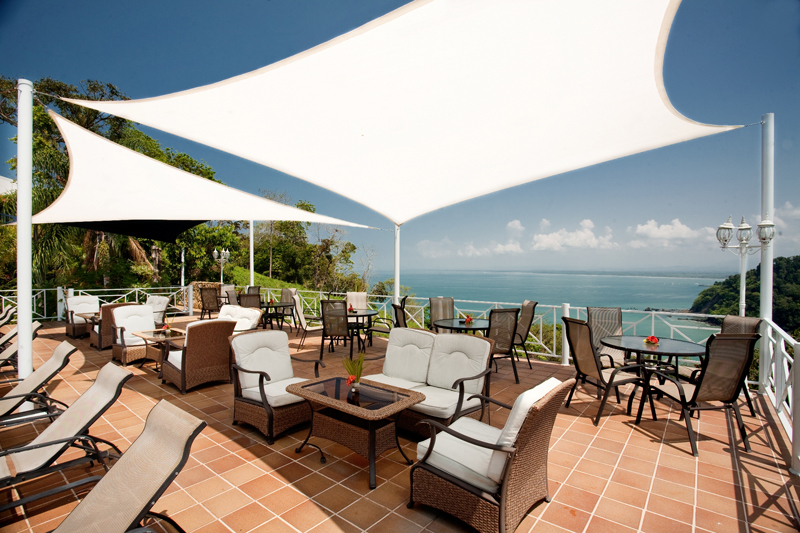 La Mansion Inn is situated on a mountainside, overlooking the Pacific Ocean and Manuel Antonio National Park. 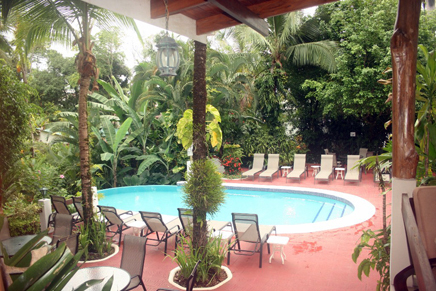 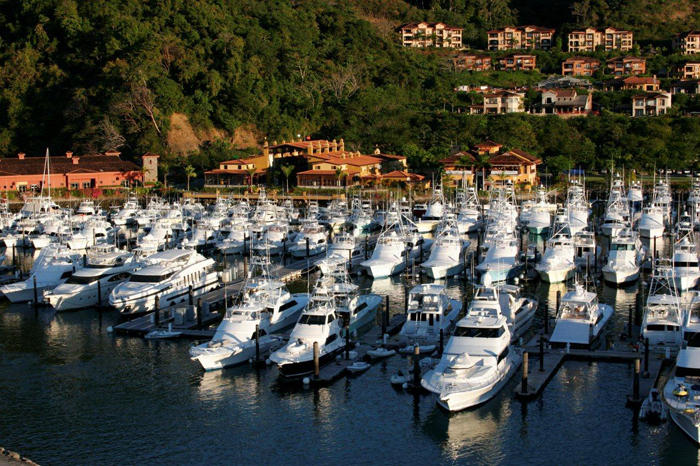 The Inn is just minutes away from pristine beaches, sport fishing at Quepos harbor, and only 15 minutes from the local airport (Nueva Linea). 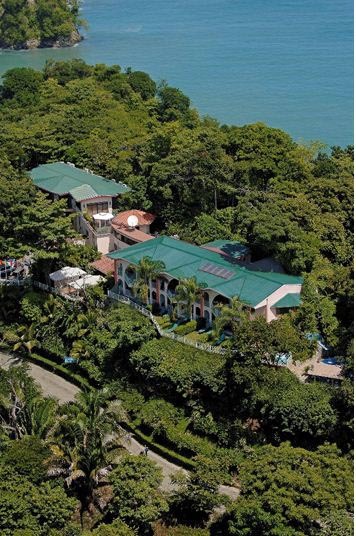 Located in Manuel Antonio, near Costa Rica’s famous National Park, La Mansion is nestled into one of the last remaining “natural zoos” of the world. 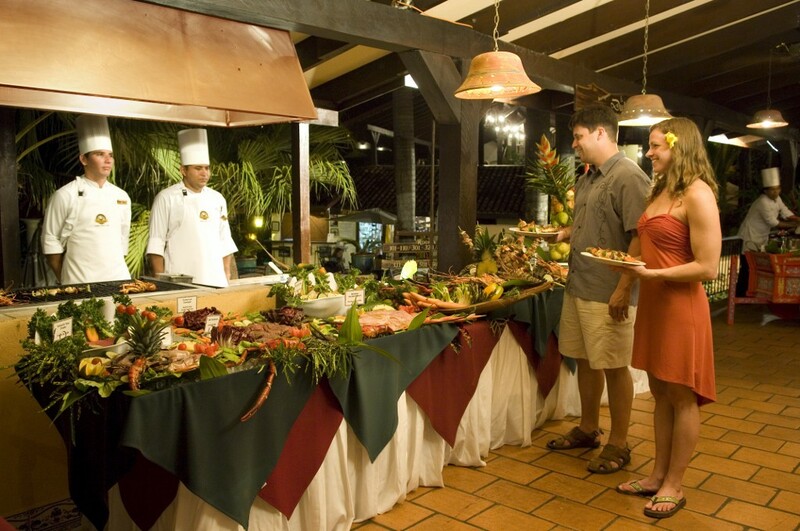 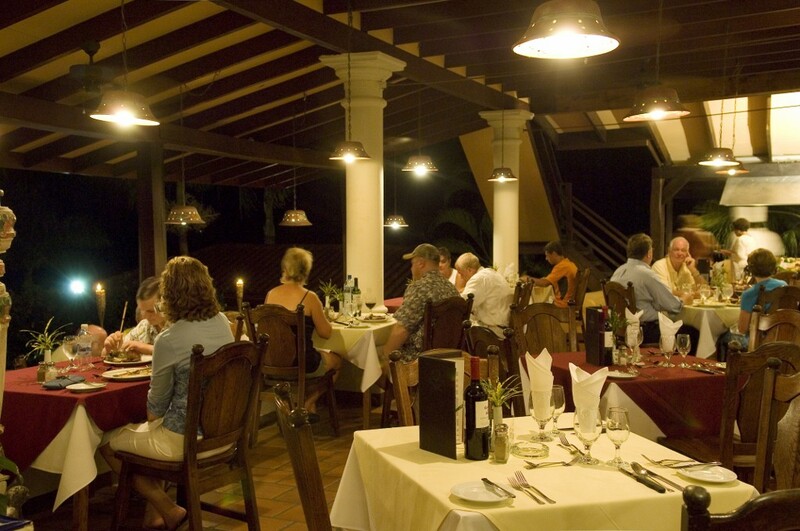 The Inn specializes in fresh seafood, such as lobster, shrimp, tuna, mahi mahi, whole fish, snapper and mussels. 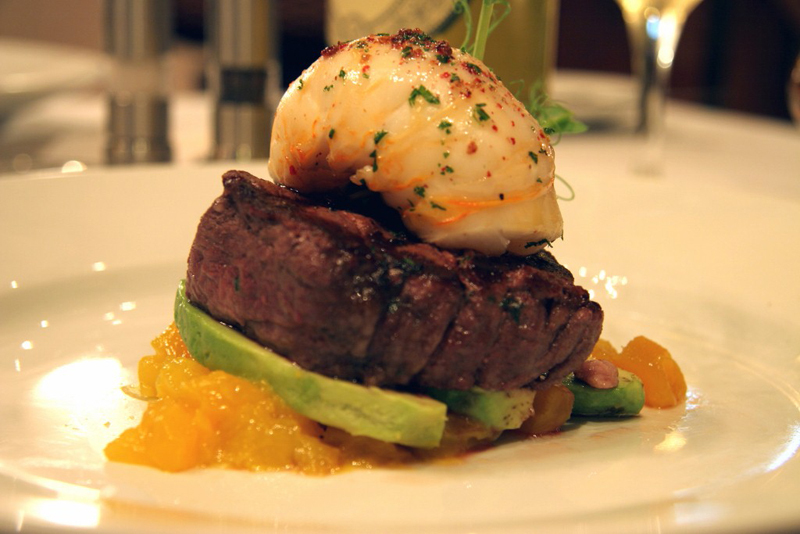 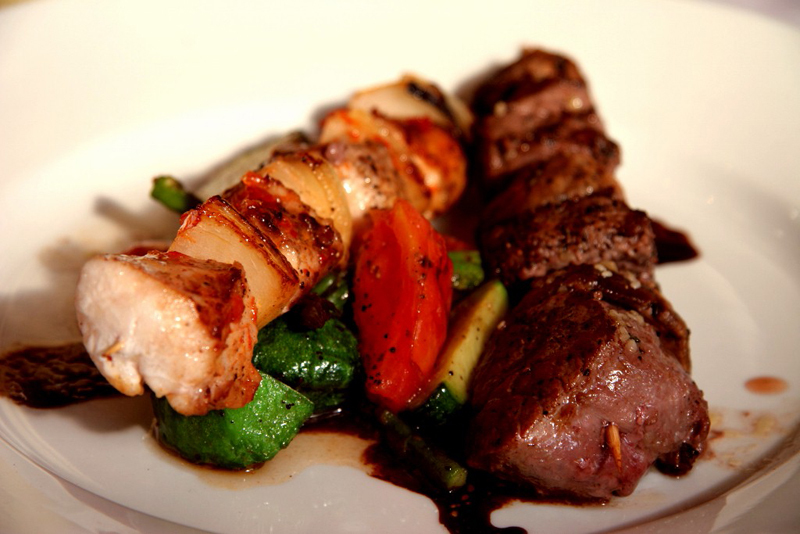 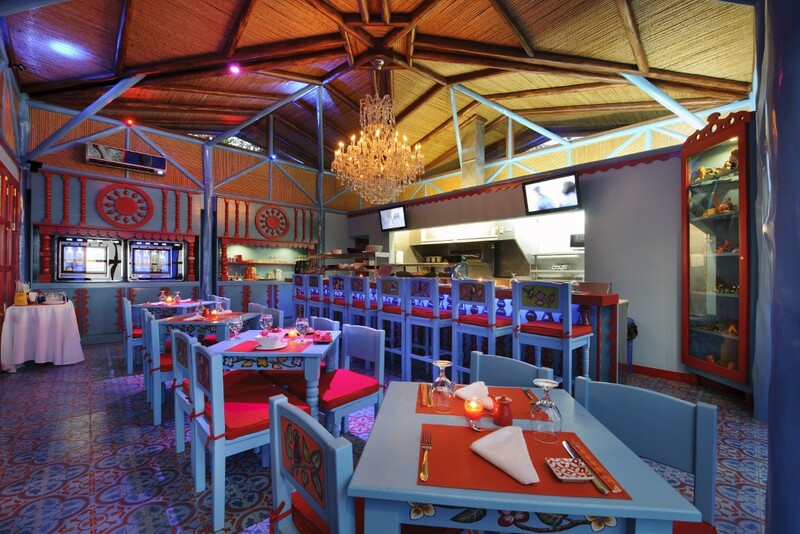 You’ll also discover the best filet mignon and steaks in town. 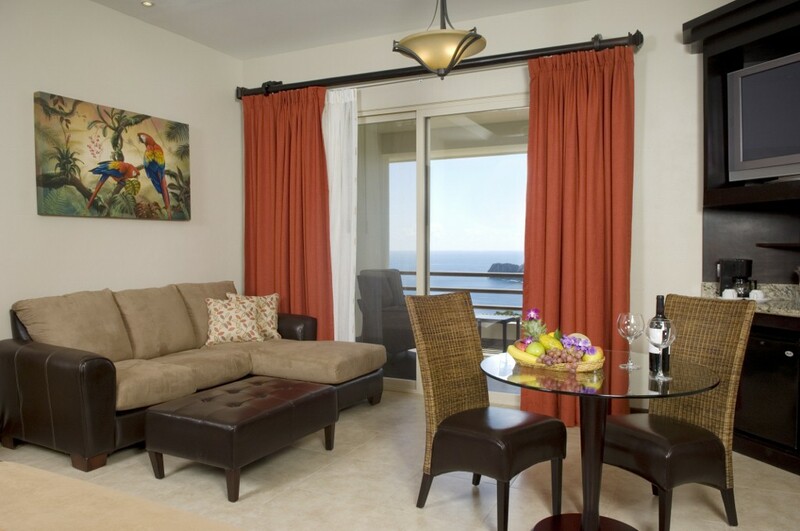 Dine inside or outside in the sky lounge or in the privacy of your own room or suite. 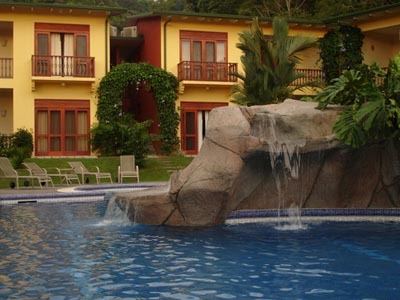 Gaia Hotel and Reserve, located in Manuel Antonio, is an adults only 5 star luxury boutique beach hotel and resort and a member of “Small Luxury Hotels of the World”. 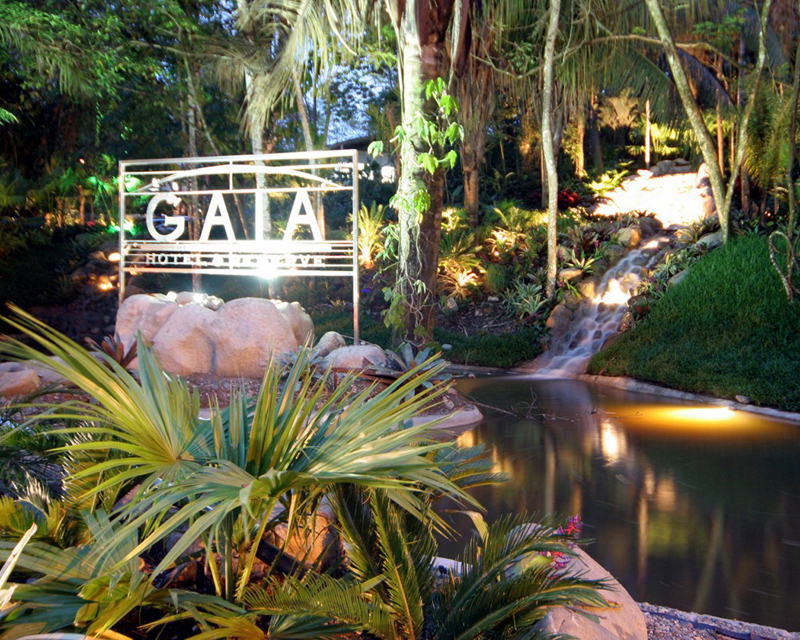 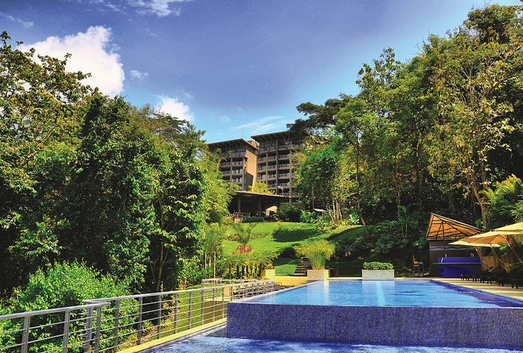 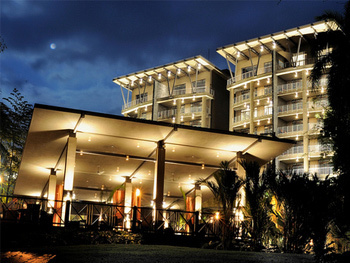 The Gaia Hotel achieves an ideal blend of modern amenities and natural scenery. 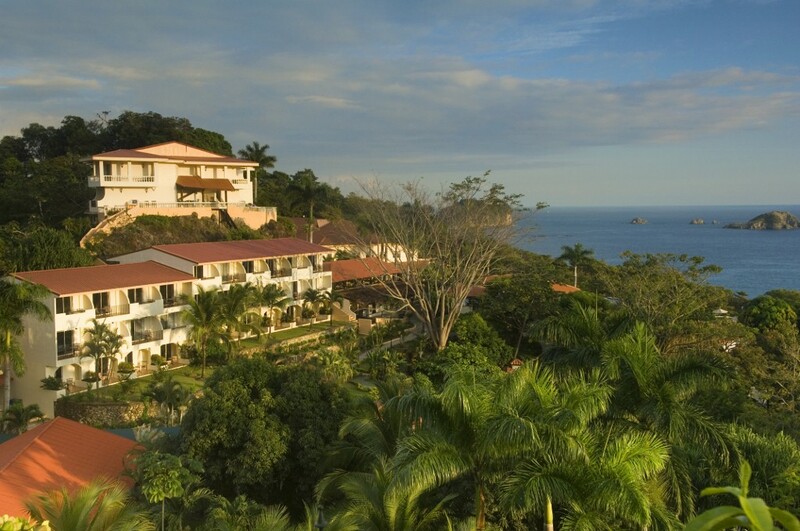 Nestled in the magnificent coastal forests of Costa Rica, the hotel’s well-appointed, terraced suites and villas offer views of lush and pristine wild surroundings that are beyond compare. 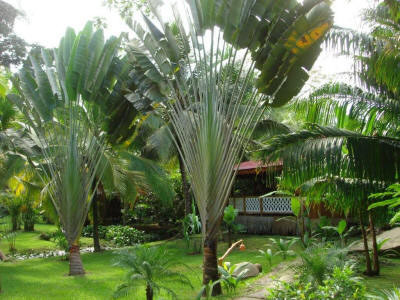 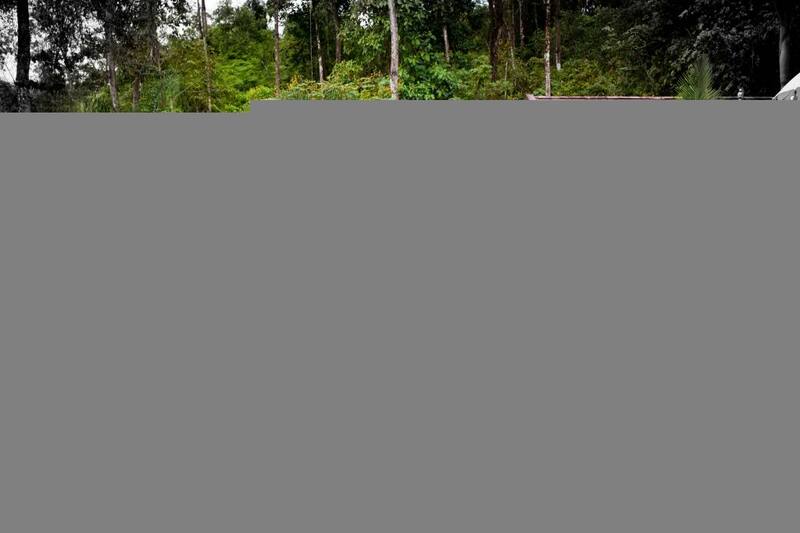 National Park and is surrounded by dense jungle filled with exotic wildlife and quaint little open-air restaurants, bars and small boutique hotels (not the mega resorts). 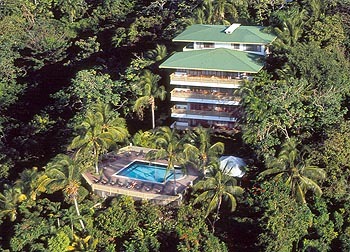 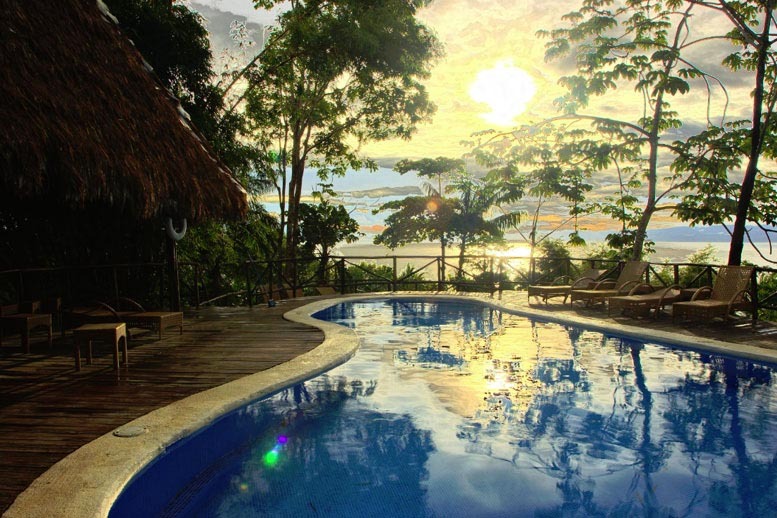 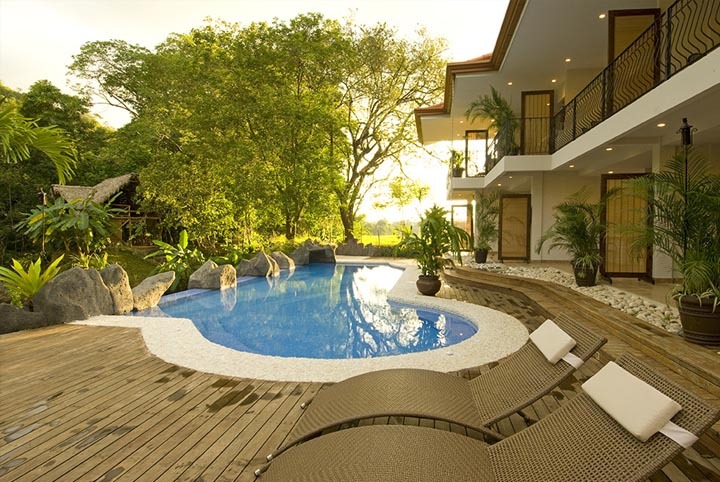 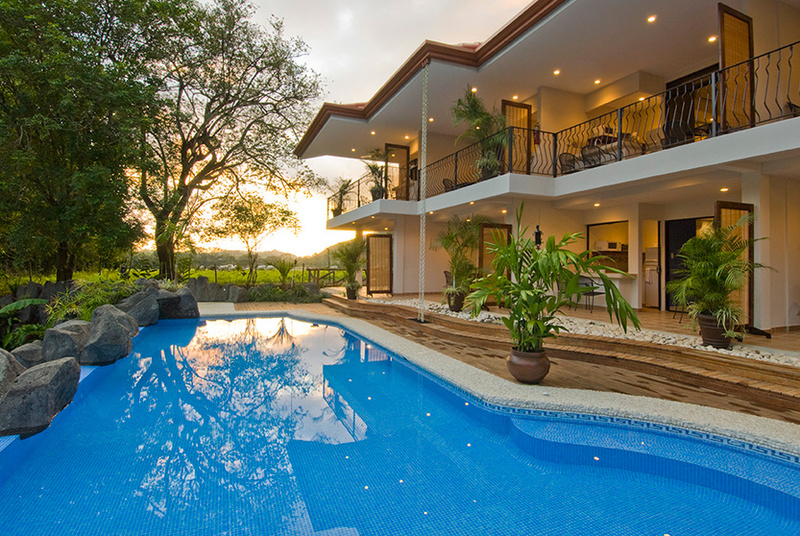 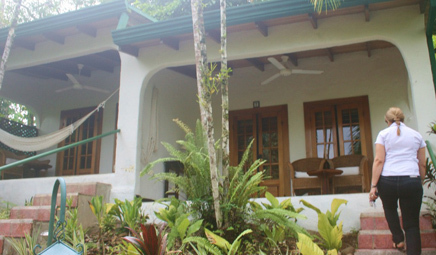 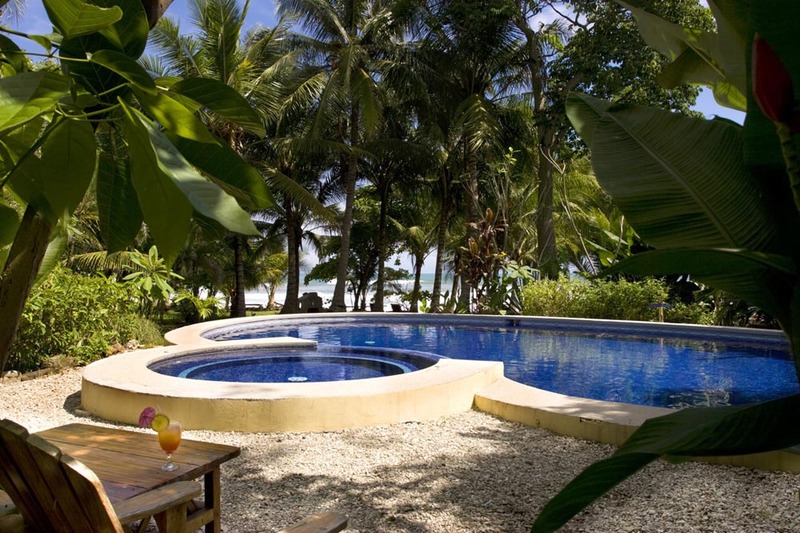 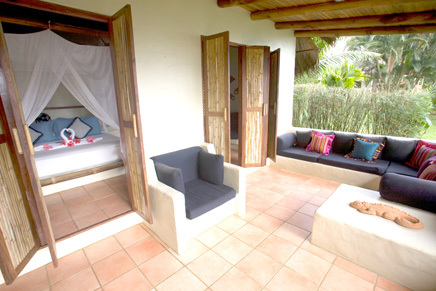 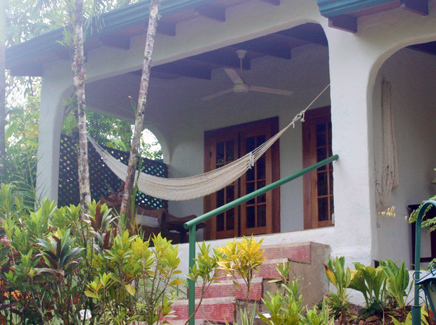 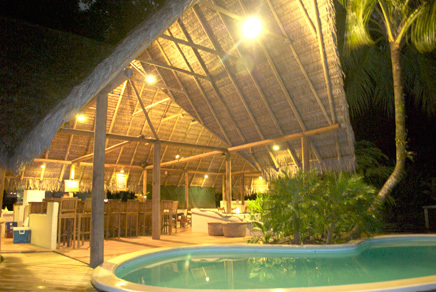 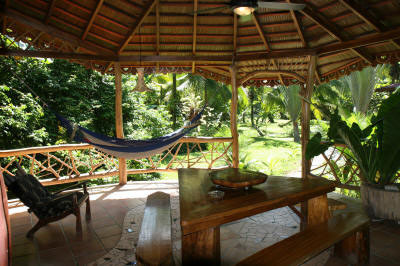 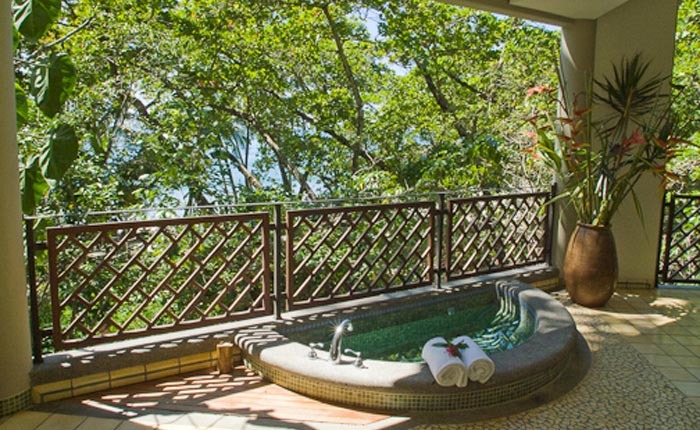 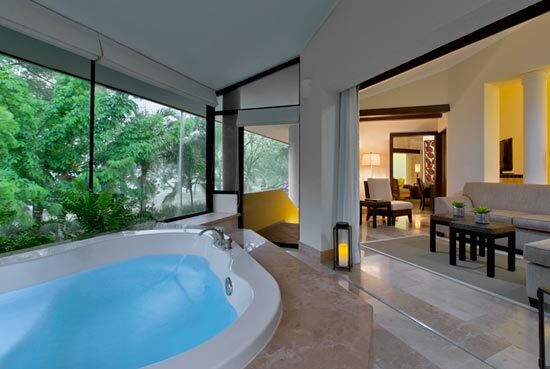 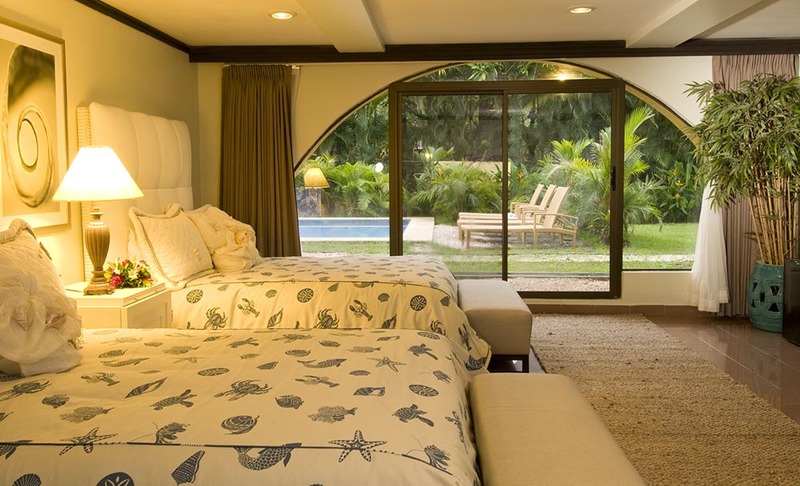 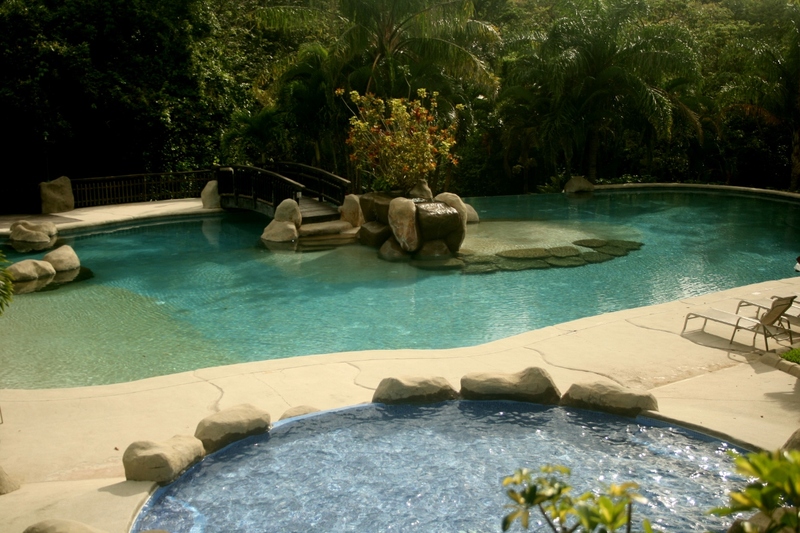 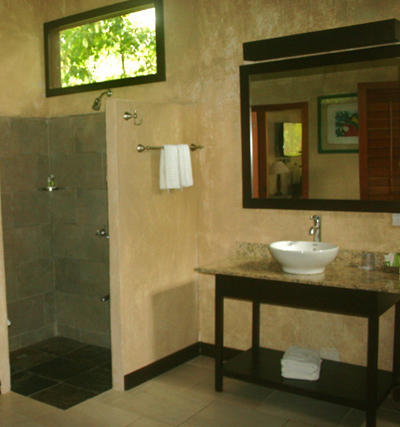 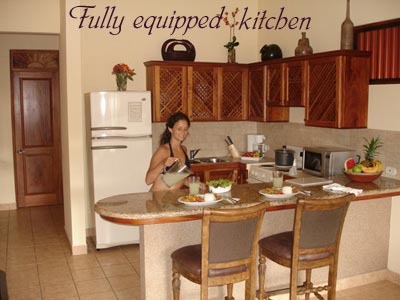 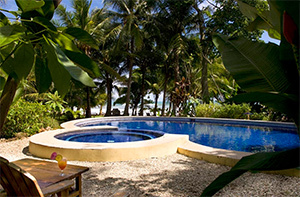 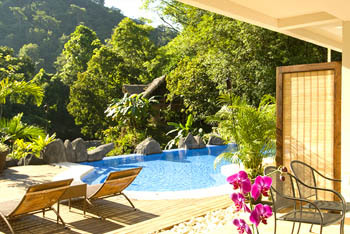 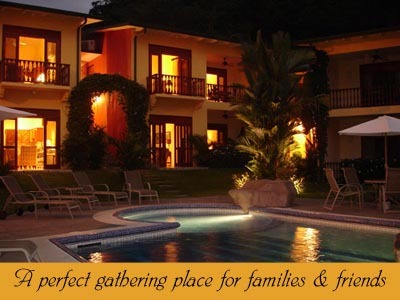 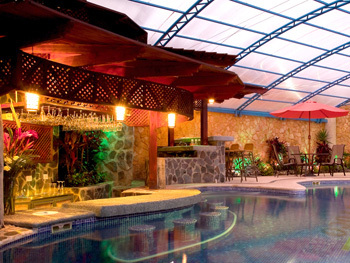 Buena Vista Luxury Villas and Tulemar Bungalows is “the exclusive” place to stay in all of Manuel Antonio. 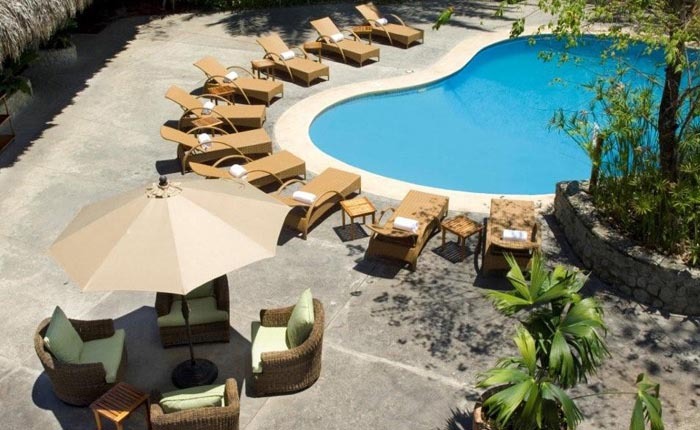 The resort is set amid the peaceful 33-acre gated Tulemar Gardens property that slopes down to its own exclusive sandy beach. 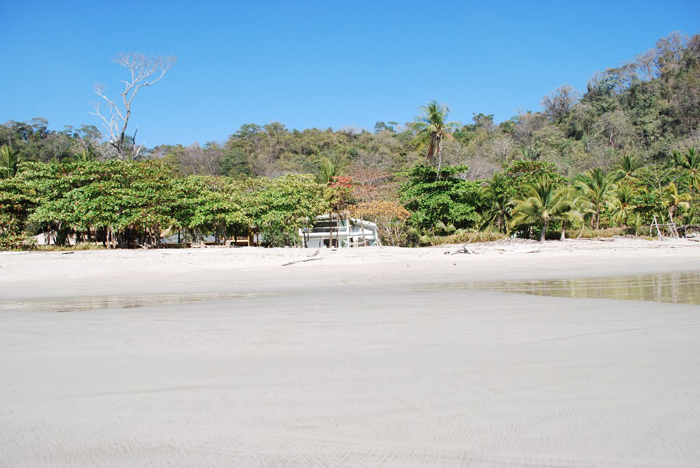 Tulemar Beach is located in a protected bay allowing you to take advantage of the various water activities without having to worry about undertows or riptides. 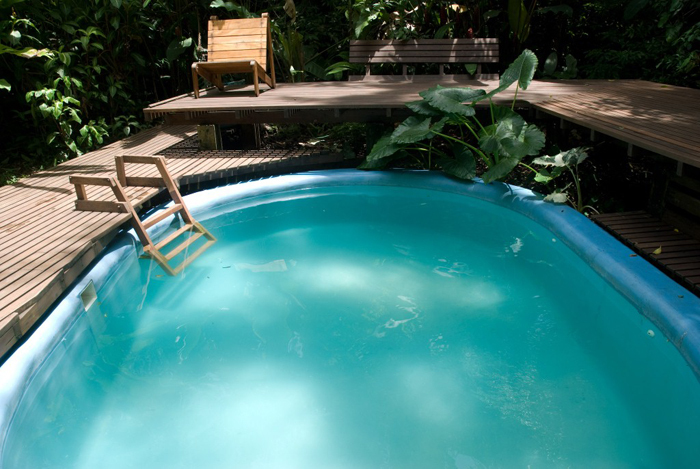 As a guest at Buena Vista Luxury Villas or Tulemar Bungalows, kayaks and boogie boards are available for your exclusive use. 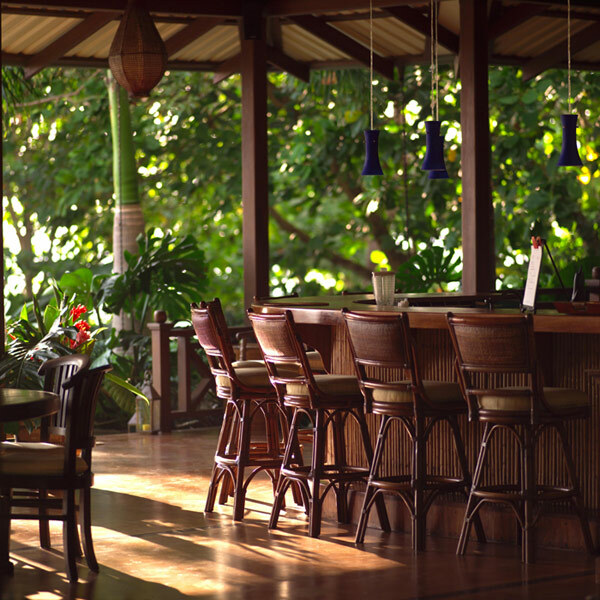 The beverage service ensures that you don’t have to go far to order your favorite cocktail or satisfy the rumbling in your stomach while you relax and unwind at the beach. 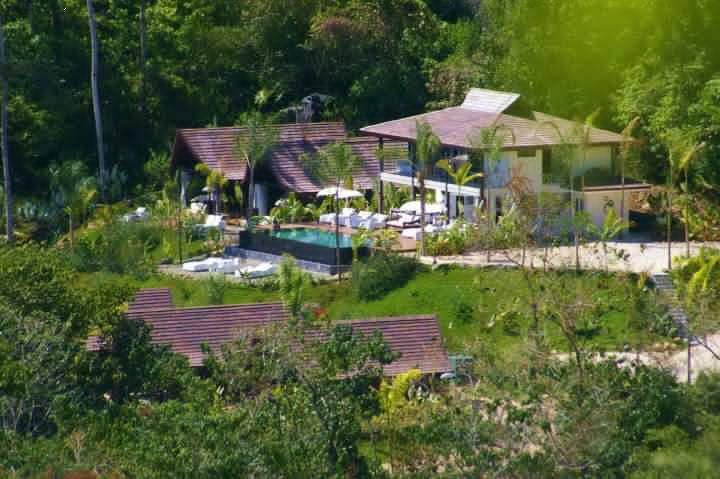 At Buena Vista you will enjoy the luxury and privacy of your very own luxurious villa, with the amenities of a high end resort, including concierge service, daily maid service, three pools to chose from, rancho bar, spa services and our renowned sister restaurant Victoria’s. 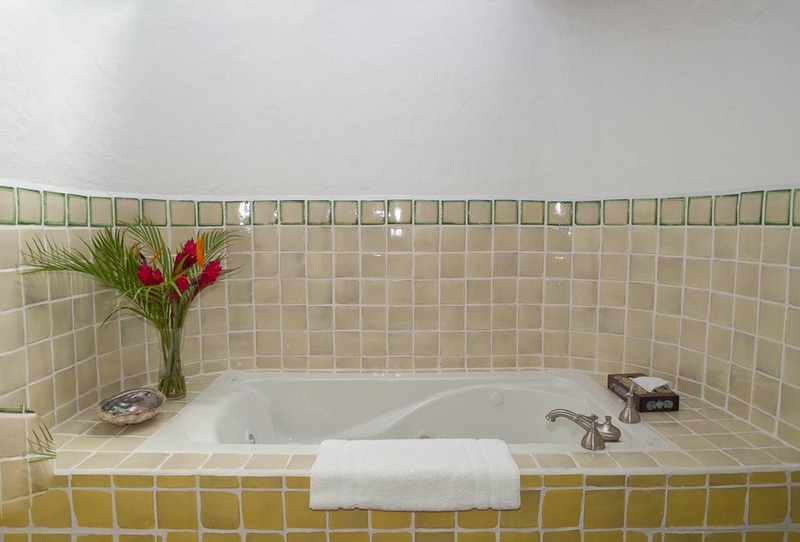 The Tulemar Bungalows, one of the original boutique hotels, offers a comfortable alternative with some of the same amenities at a reduced price. 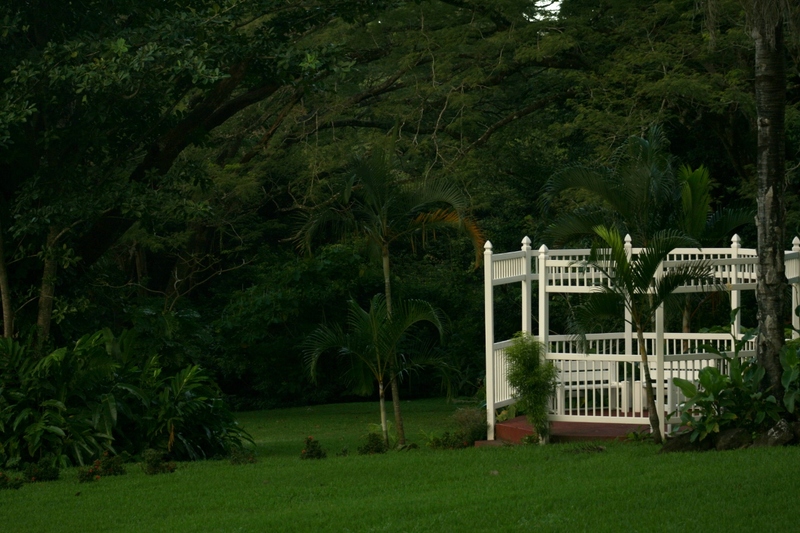 and hummingbirds bustle about the garden. 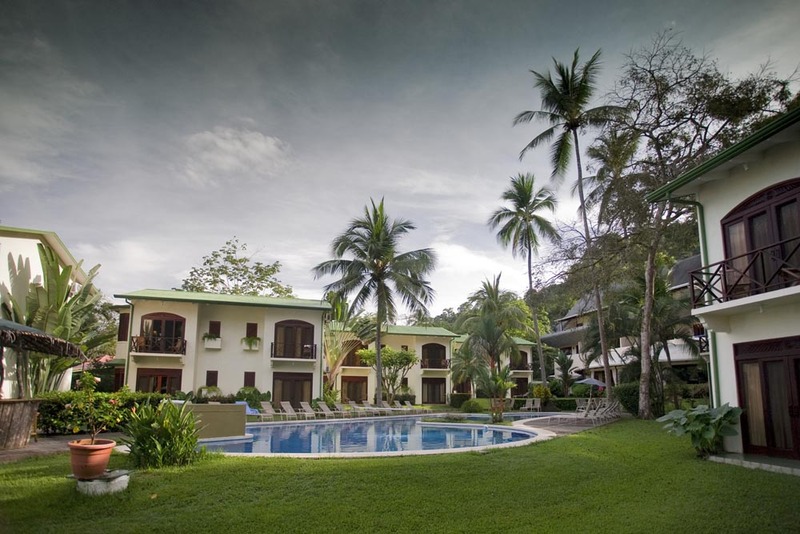 Hotel Costa Verde is located on a coastal rainforest bluff overlooking the Pacific beaches of Manuel Antonio National Park near Quepos . 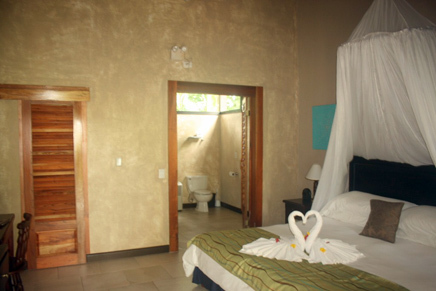 Its many amenities make Costa Verde a perfect destination for those seeking adventure travel, ecotourism, sports fishing or just the tranquility of white sand beaches and magnificent ocean views. 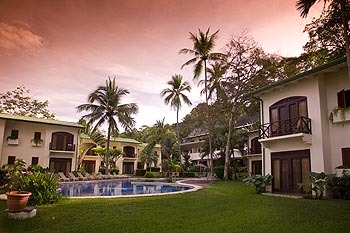 Three hundred yards from the beach and Manuel Antonio National Park, the Hotel Costa Verde features two cliff side pools with sundecks and spacious rooms and balconies, all offering a bird’s-eye view of the Park’s coastline plus rainforest canopy vistas dotted with native birds and monkeys. 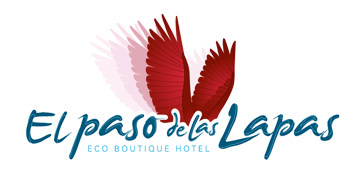 A couples only hotel. 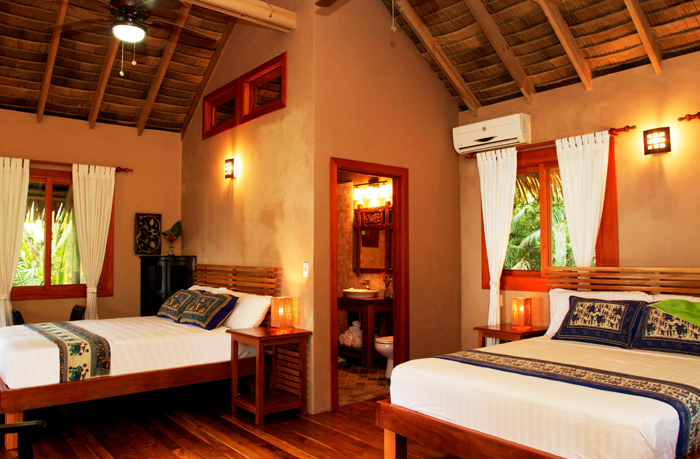 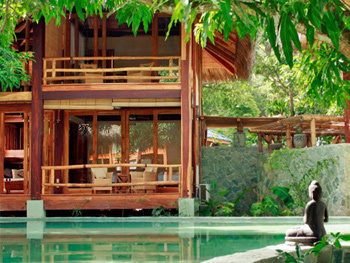 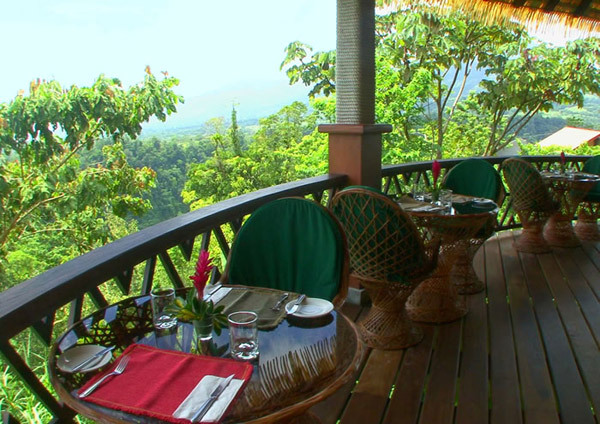 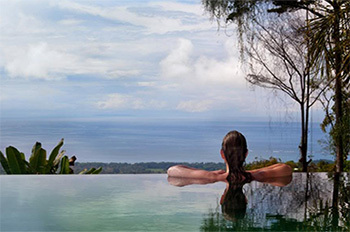 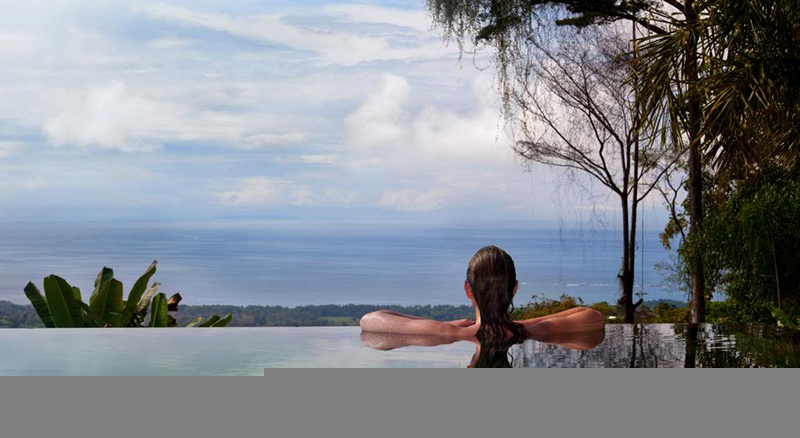 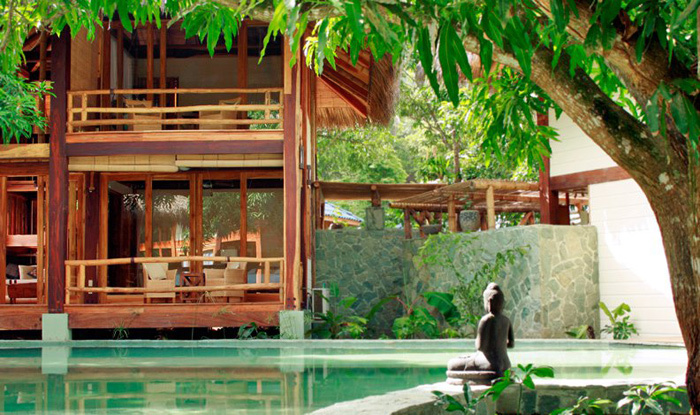 Oxygen Jungle Villas is a small-scale, exclusive and privately owned Balinese style boutique resort hotel. 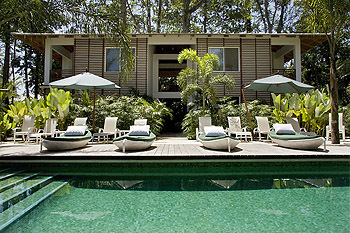 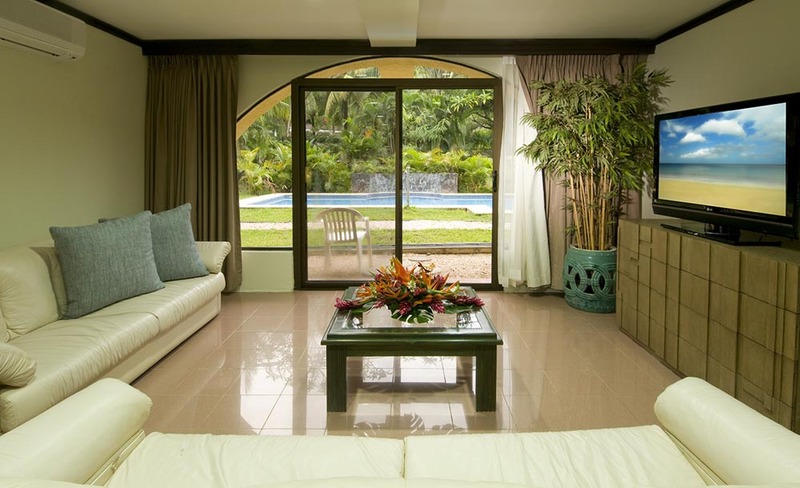 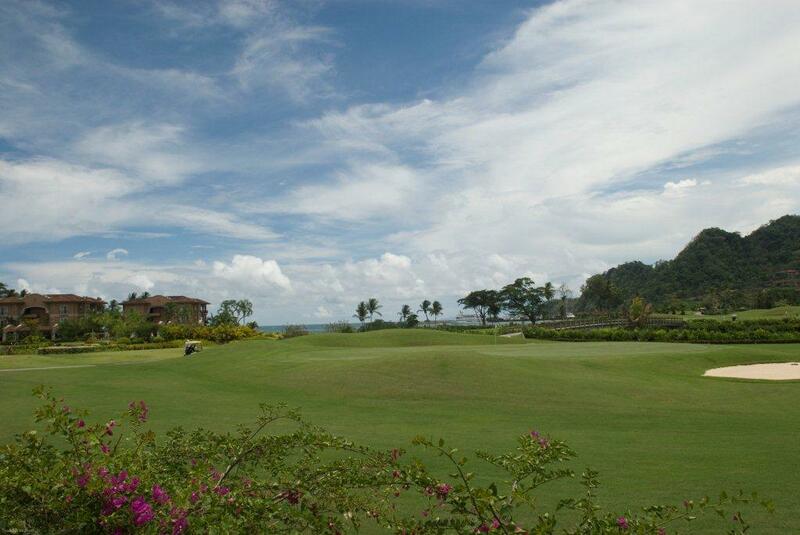 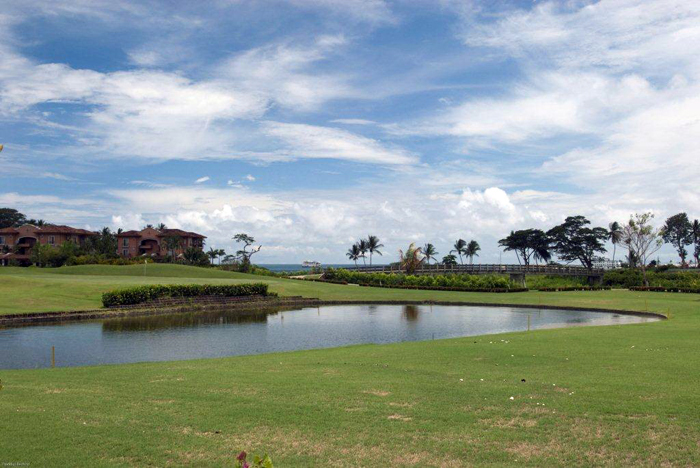 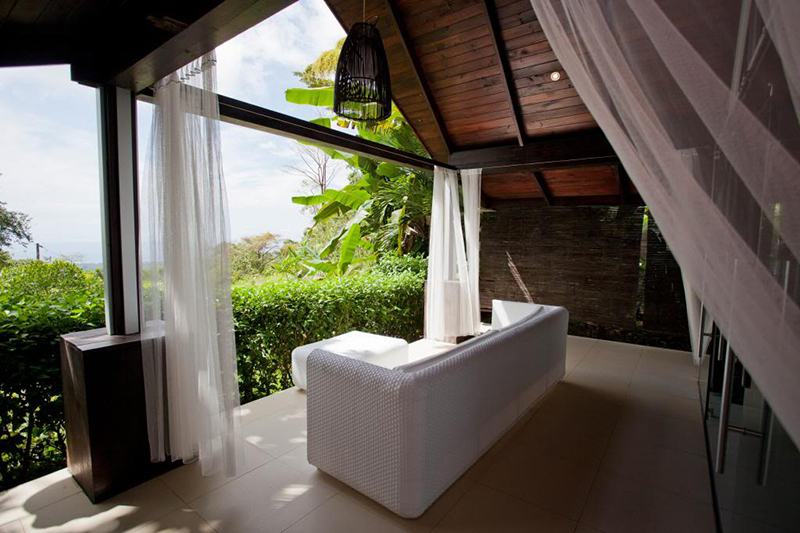 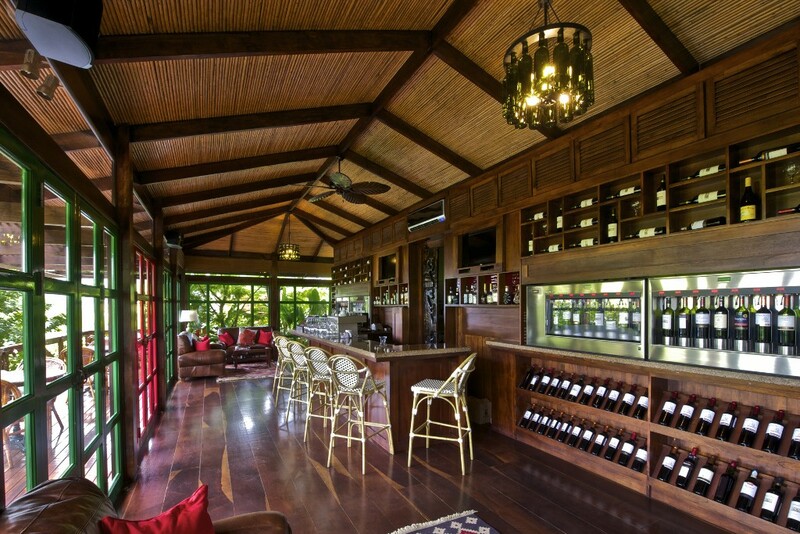 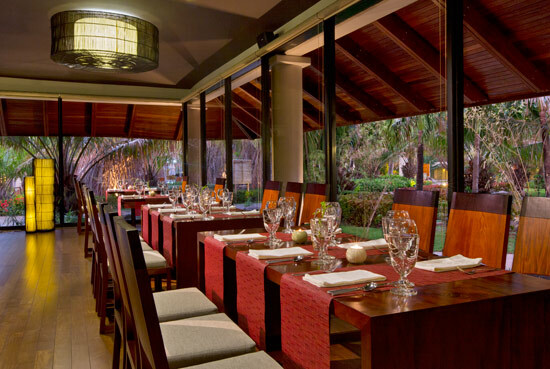 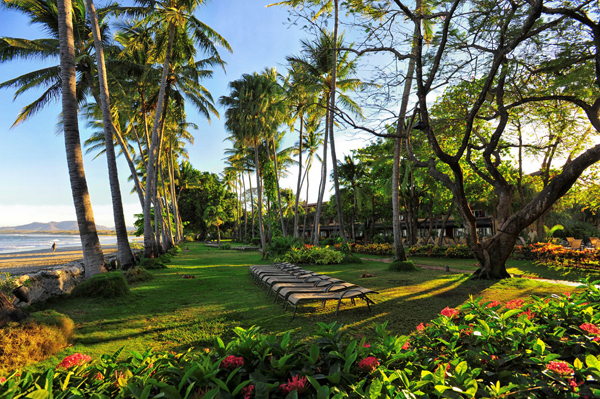 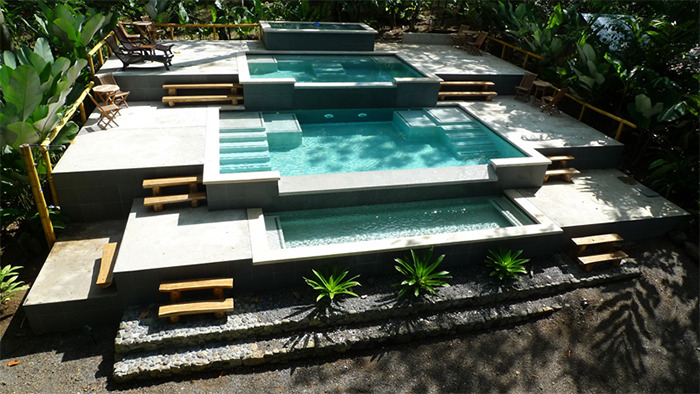 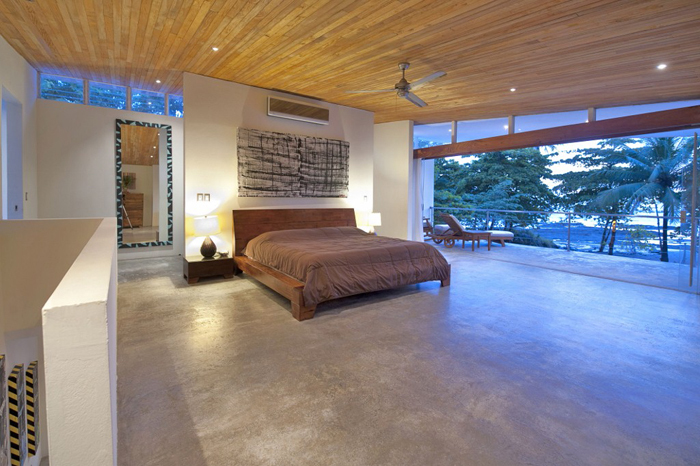 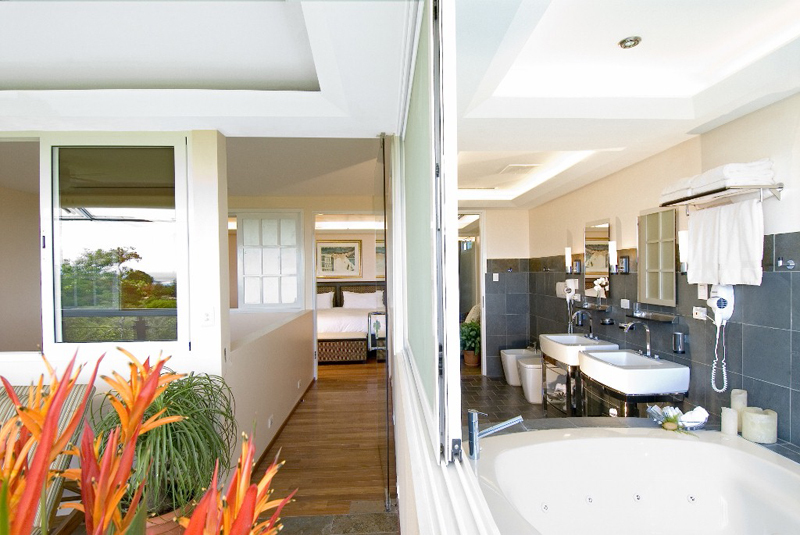 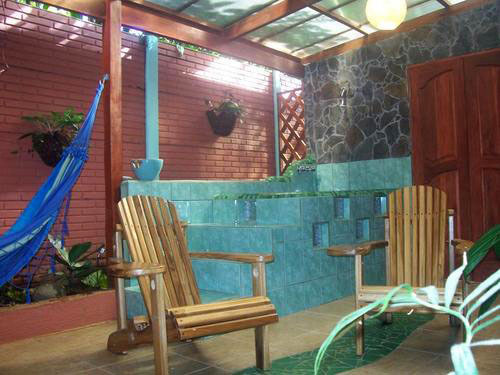 Located in Uvita, in the middle of the Costa Ballena, Costa Rica’s South Pacific hotspot. 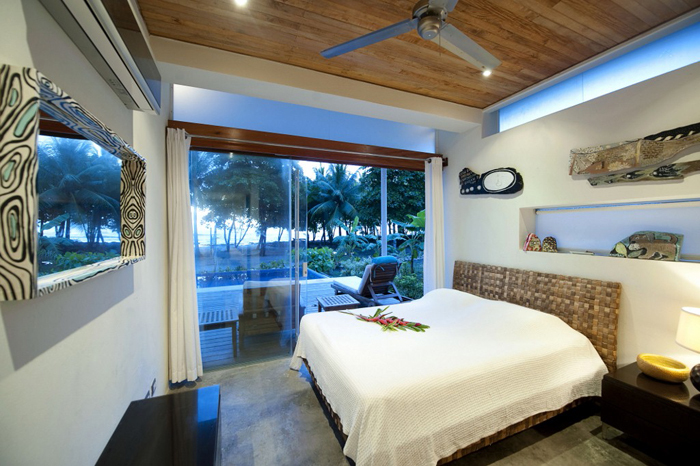 Here you will find an individual and personalized service, a maximum of 24 guests at all time, staying at one of the only 12 luxury one-bedroom villas on the Oxygen estate. 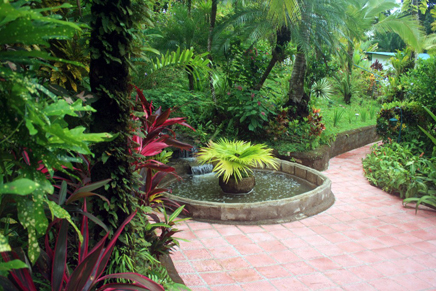 Los Sueños Resort is surrounded by exotic native plants, banana trees, orchids and native wildlife; you’ll experience breath- taking natural beauty while staying in a Los Sueños luxury vacation rental. 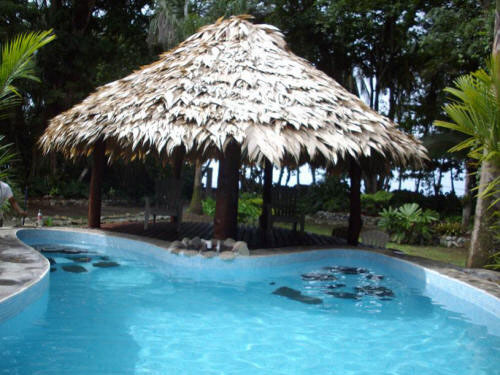 Located in a quiet cove at the south end of Jaco Beach you can experience both the Costa Rican rainforest and a sand beach with clear warm water. 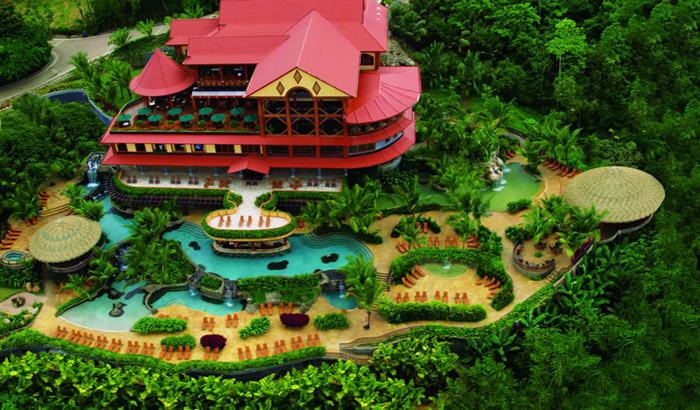 Surf, explore the rainforest, walk on the beach or sign up for an adventure tour. 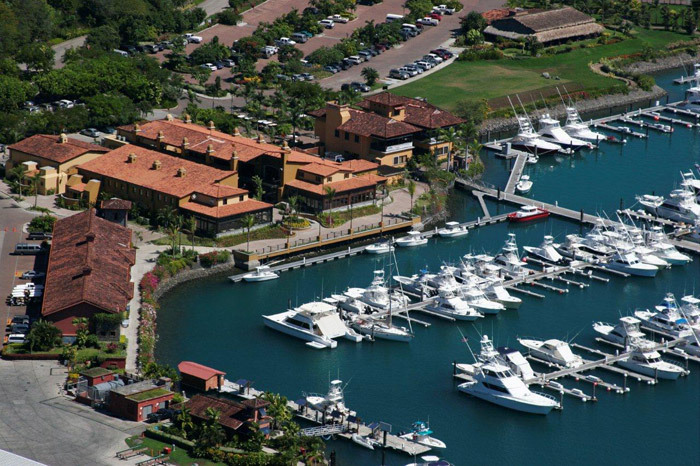 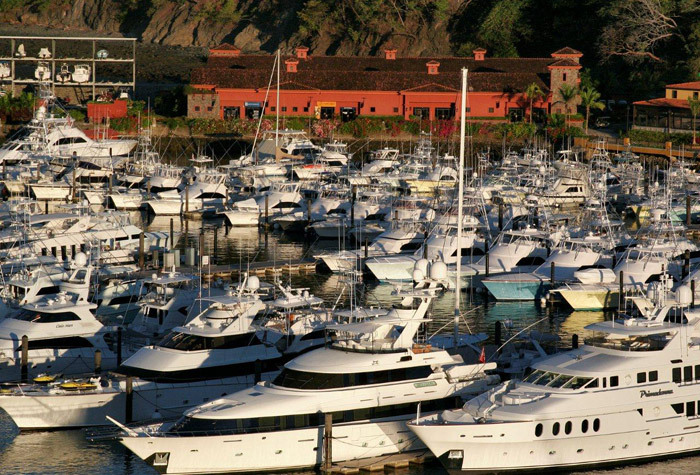 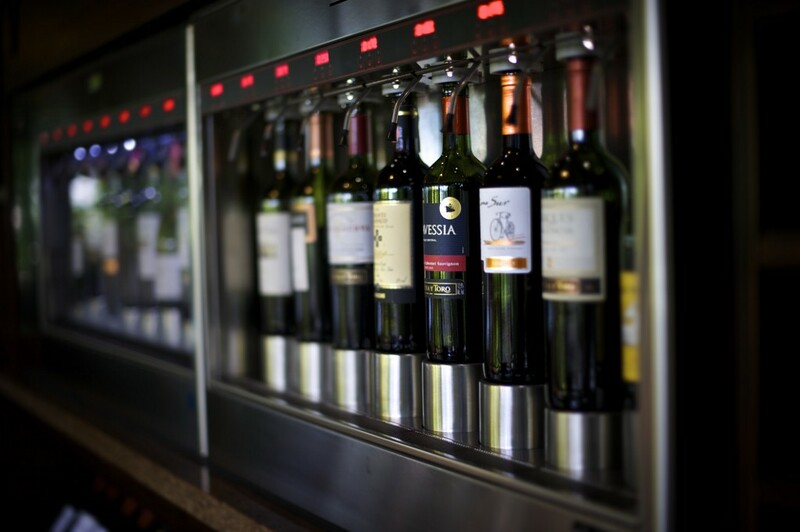 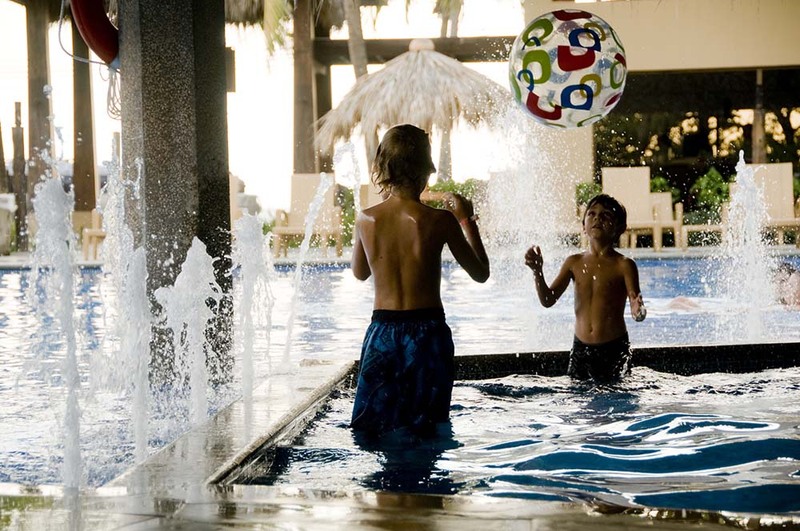 It is all within reach at the Hotel Club del Mar. 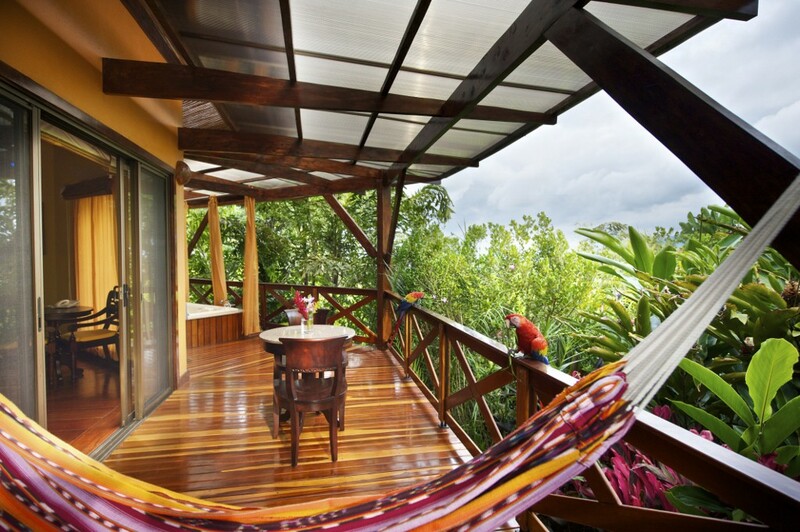 Strategically located in Pueblo Nuevo, Jacó, this facility is an exclusive Eco Boutique Hotel with 10 spacious suites with terraces or balconies and a spectacular view of a private forest reserve offering glimpses of mystical and beautiful Scarlet Macaws and Toucans. 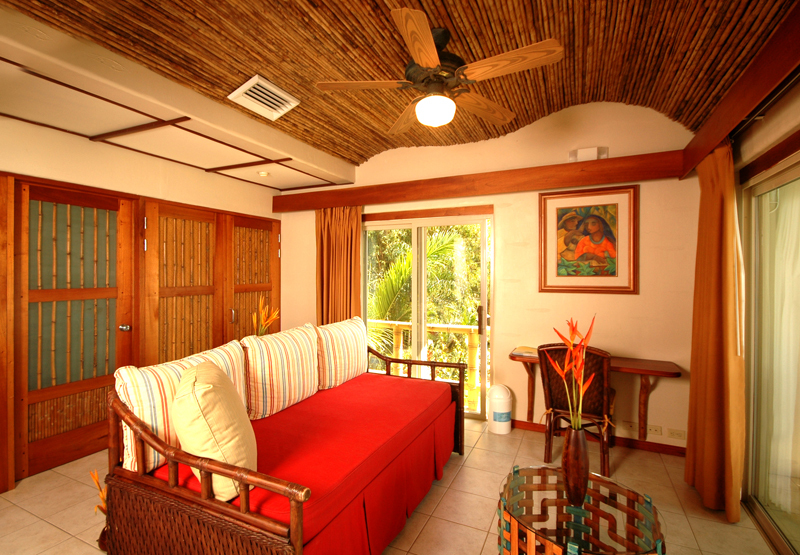 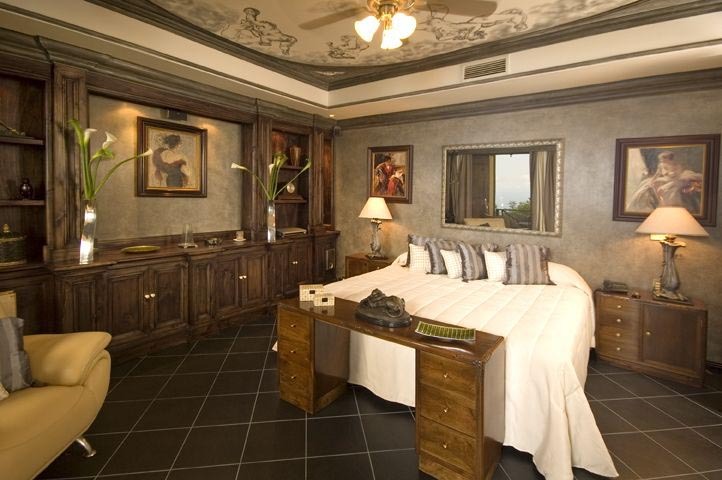 Choose one of 10 fully equipped suites (5 people per). 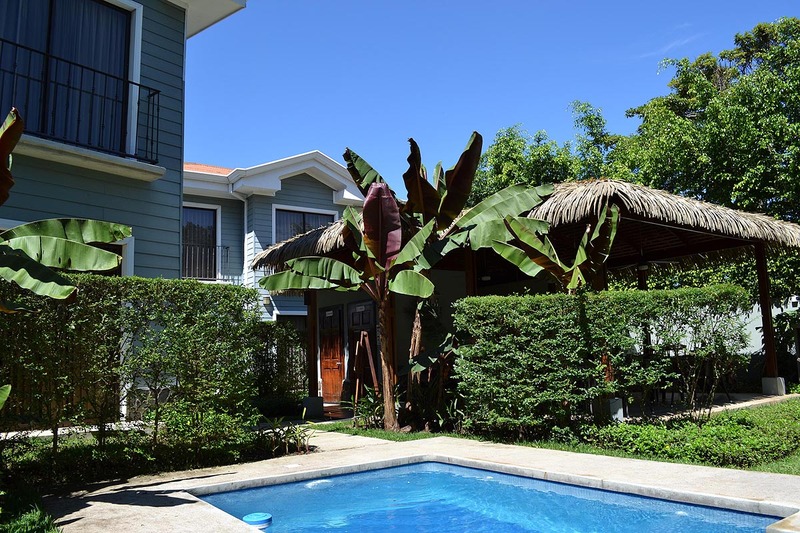 Located on the south end of Jaco beach, just 90 minutes from the San Jose airport, is a gated property of 16 magnificent condominiums just one block from the beachfront. 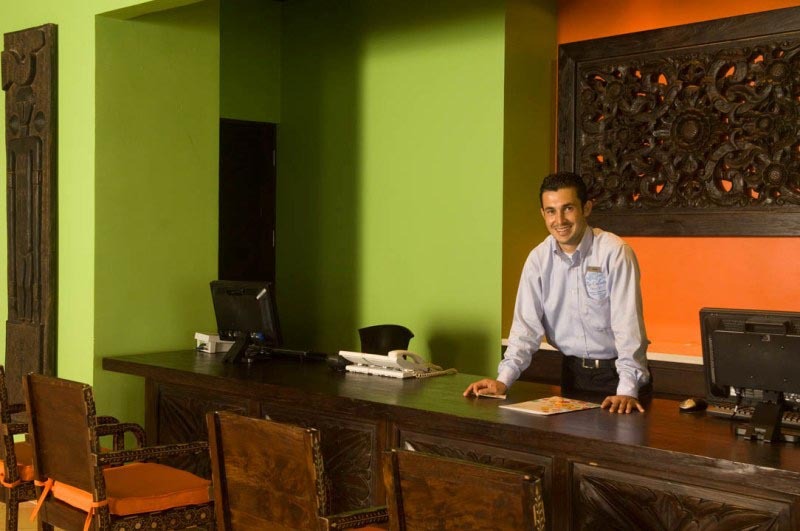 You’ll enjoy hotel style service provided by our friendly, bilingual staff. 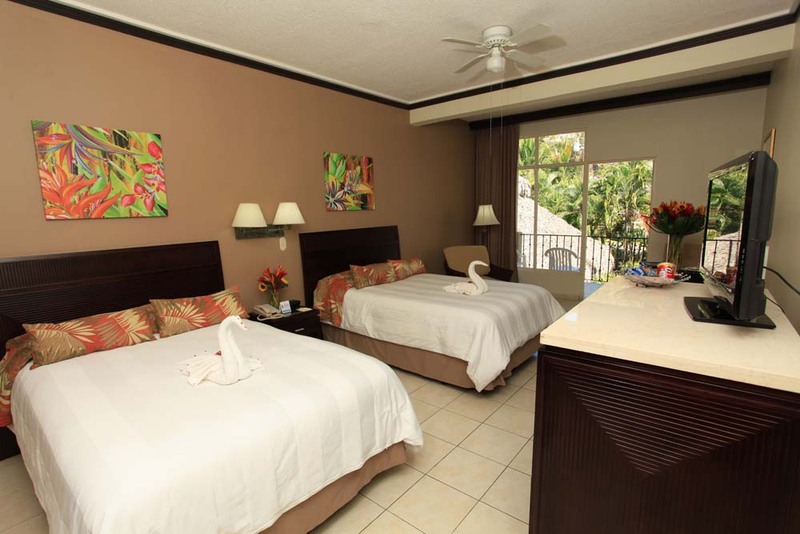 Club del Sol is minutes from beaches with world-class surf. 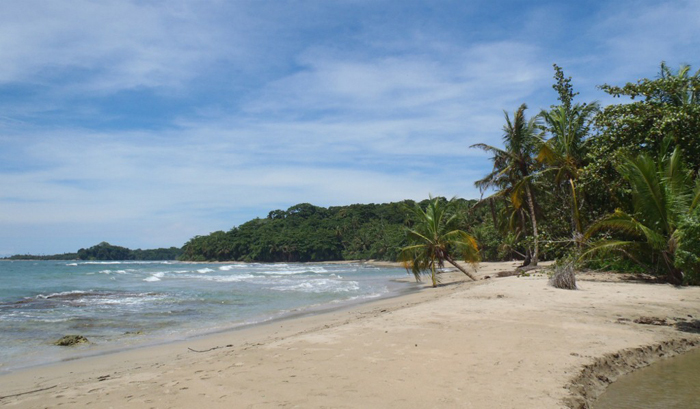 The medium size waves on Jaco beach bring surfers from around the world. 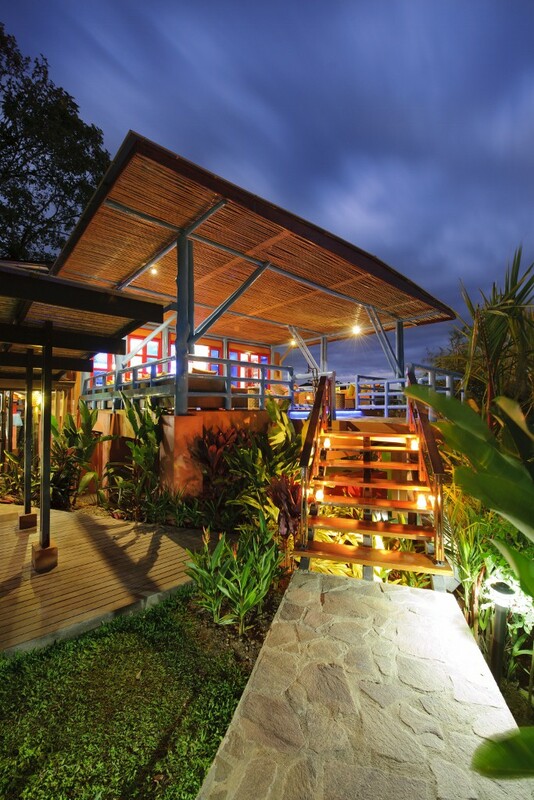 Surfboard rentals, lessons, and boogie boards are available. 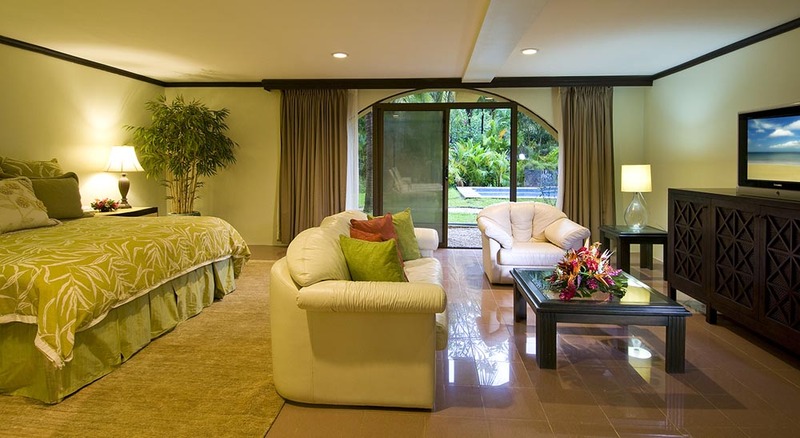 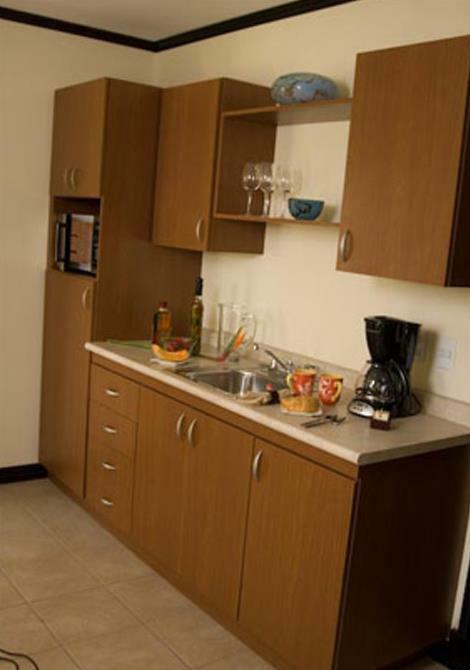 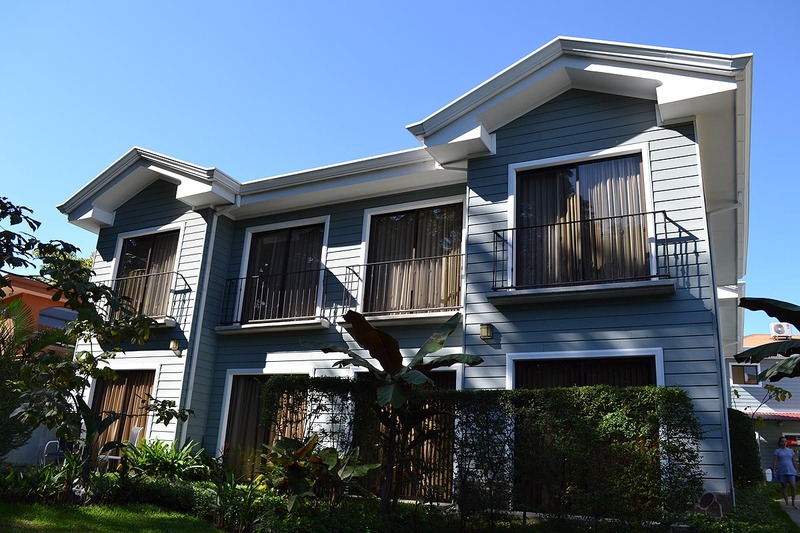 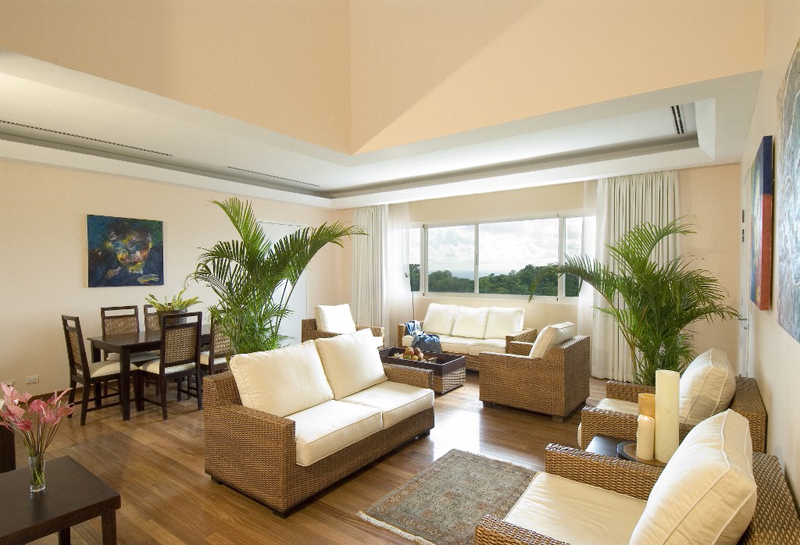 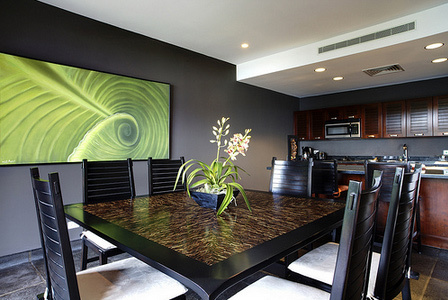 Luxurious one and two bedroom condominiums can accommodate up to six people. 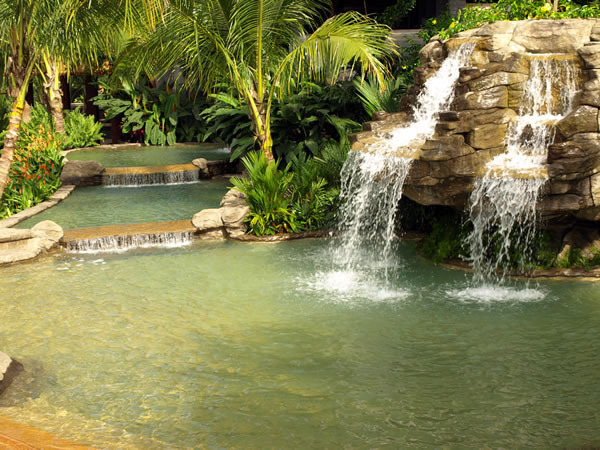 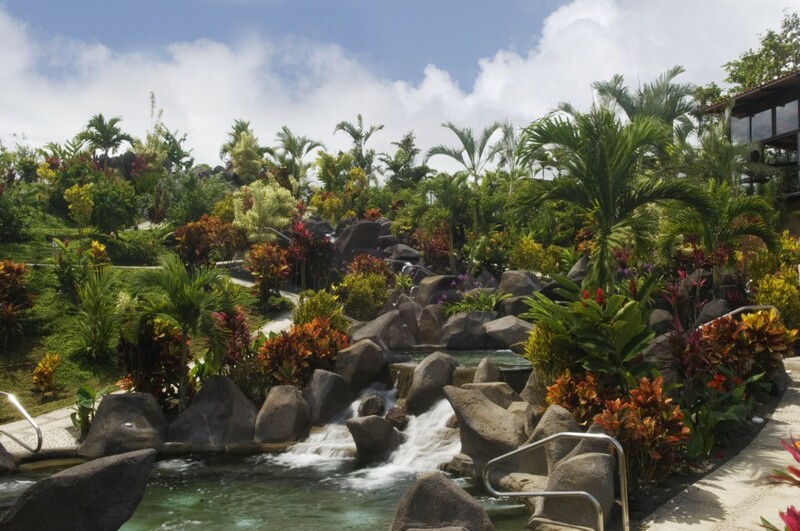 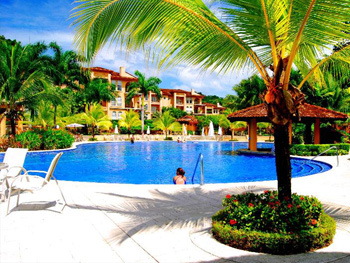 All condominiums are steps from the private swimming pool and waterfall. 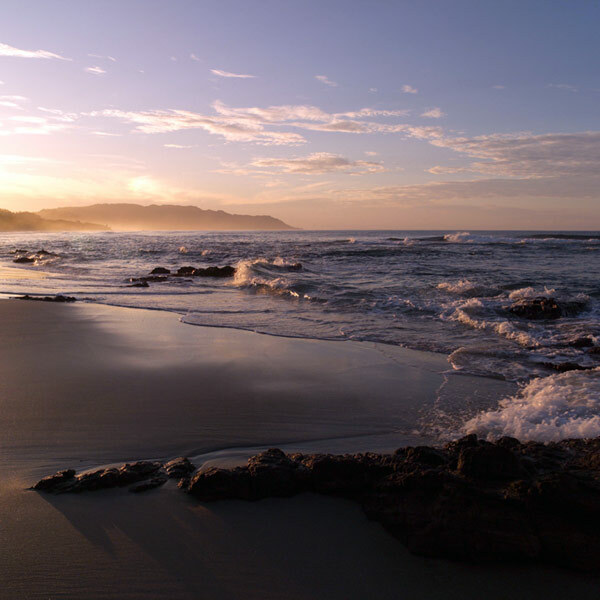 Discover some of the most breath-taking and accessible beaches, literally stretching as far as the eye can see. 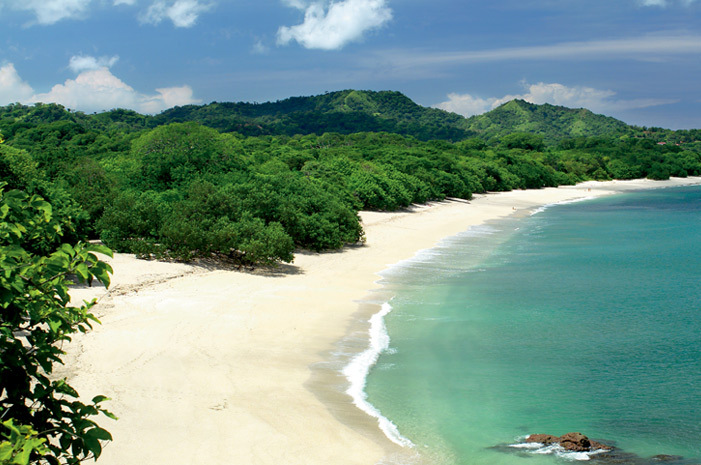 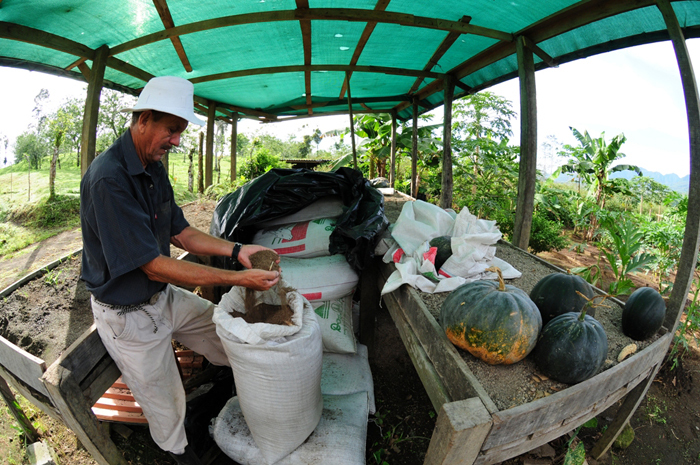 With the shortest green season, the northwest Pacific area of Guanacaste is the driest region in Costa Rica. 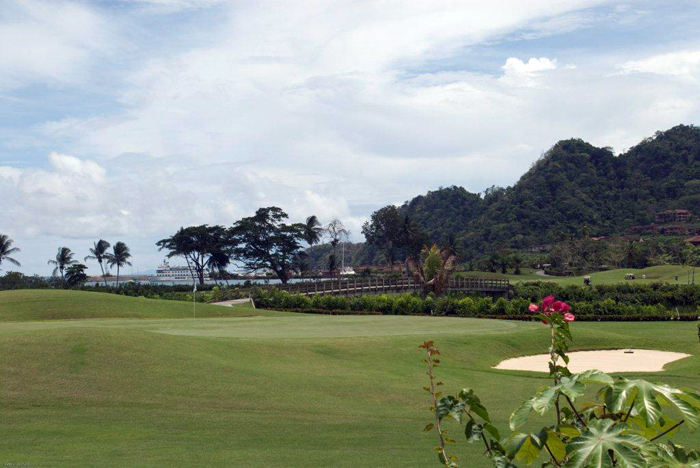 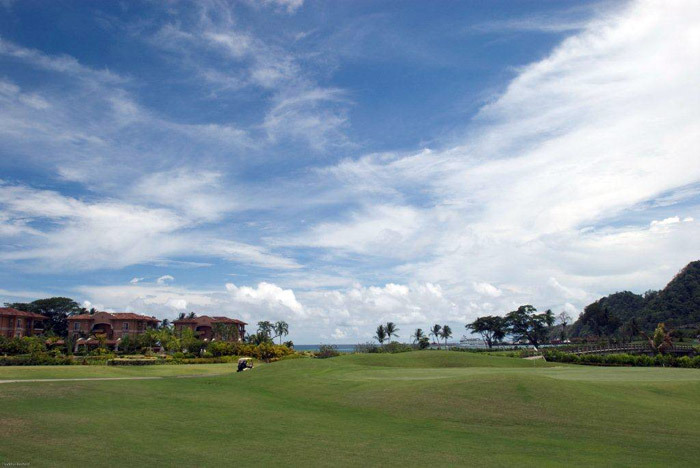 So it’s the perfect destination if you want to unwind at some of the world’s most inviting luxury resorts and golf courses. 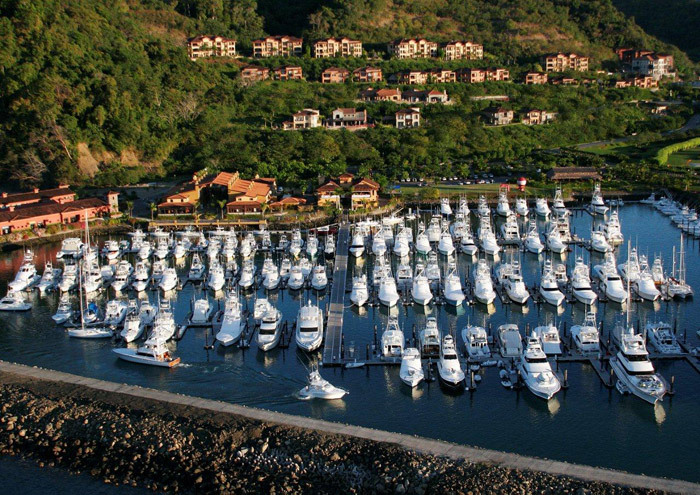 Test your sport fishing and sailing skills or hang ten at one of best surf spots you’ll find anywhere. 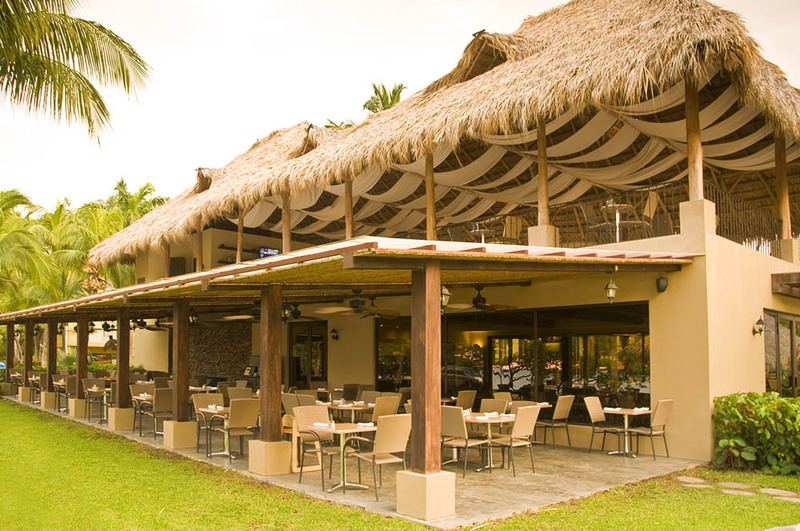 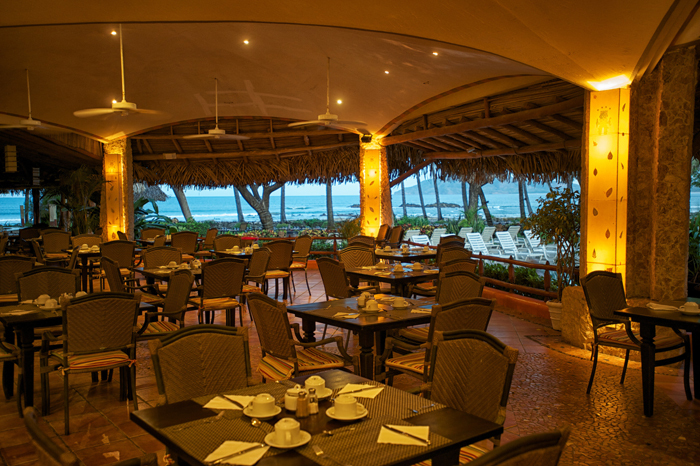 Tamarindo Diria Beach & Golf Resort sets its self apart from all others because it’s the only hotel located on the white sand of the world famous Tamarindo Beach. 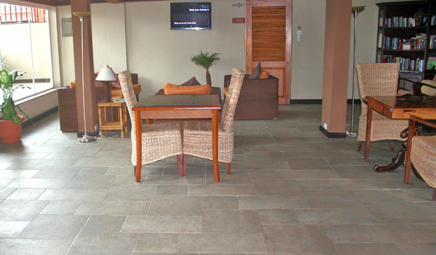 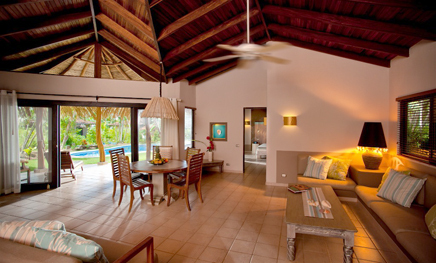 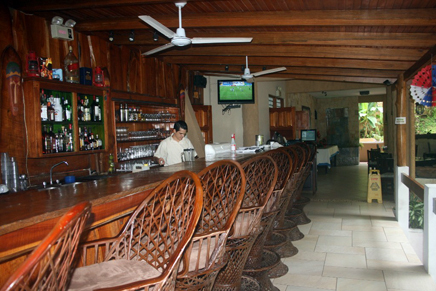 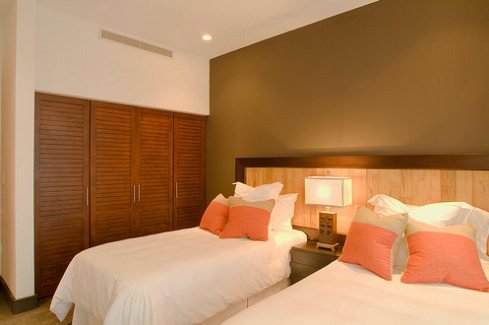 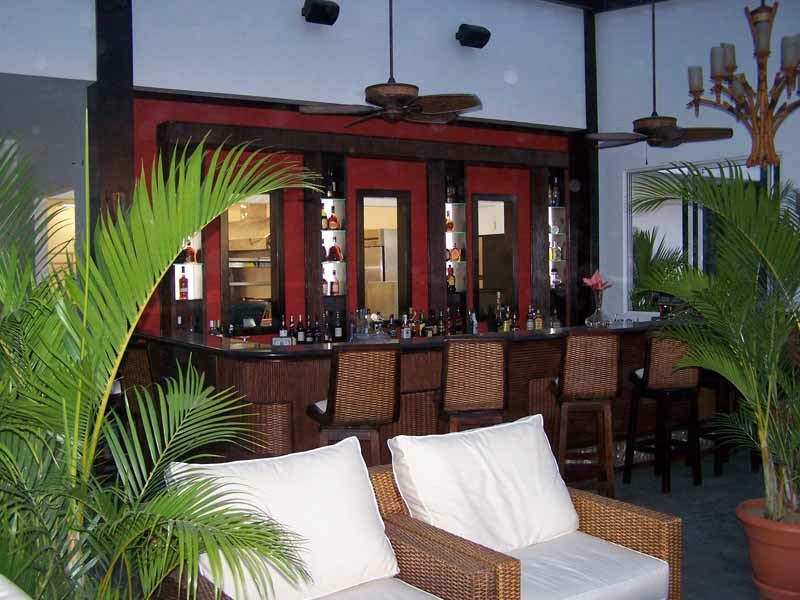 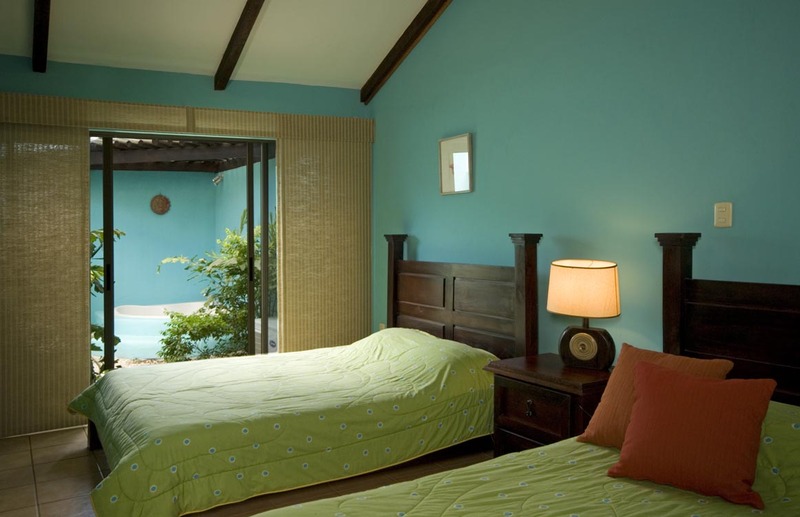 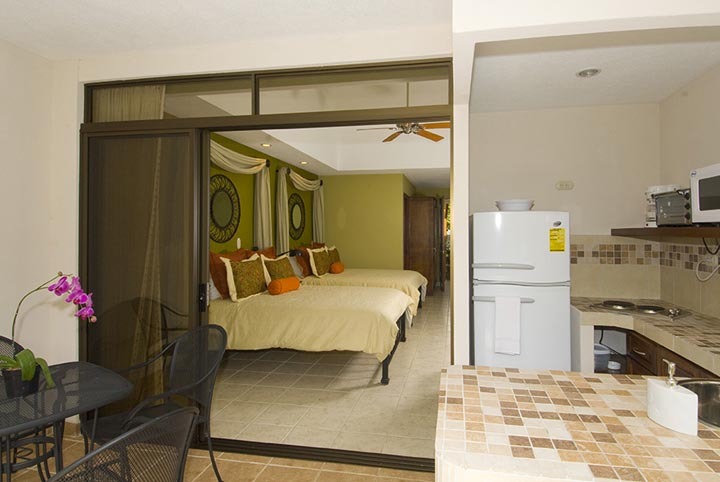 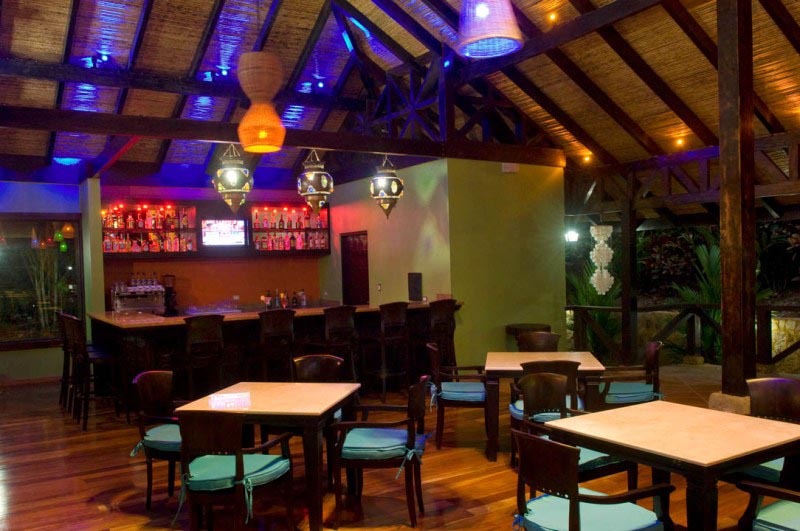 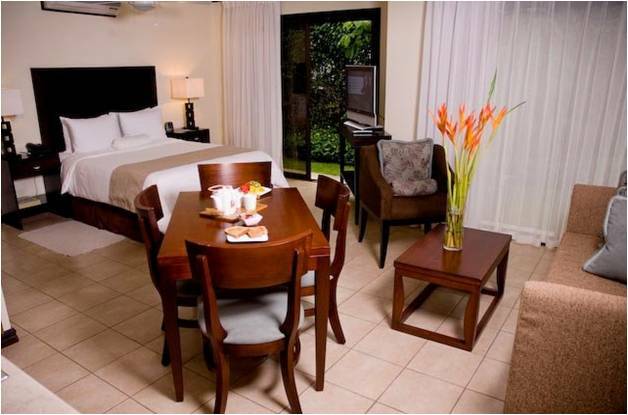 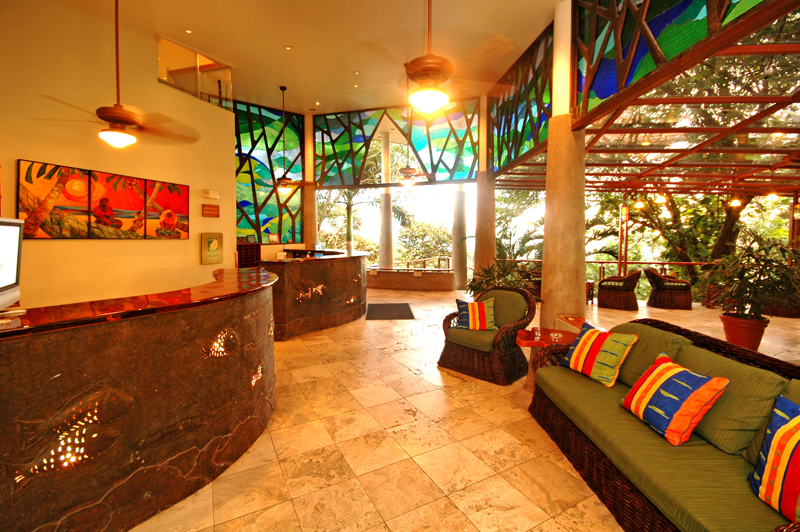 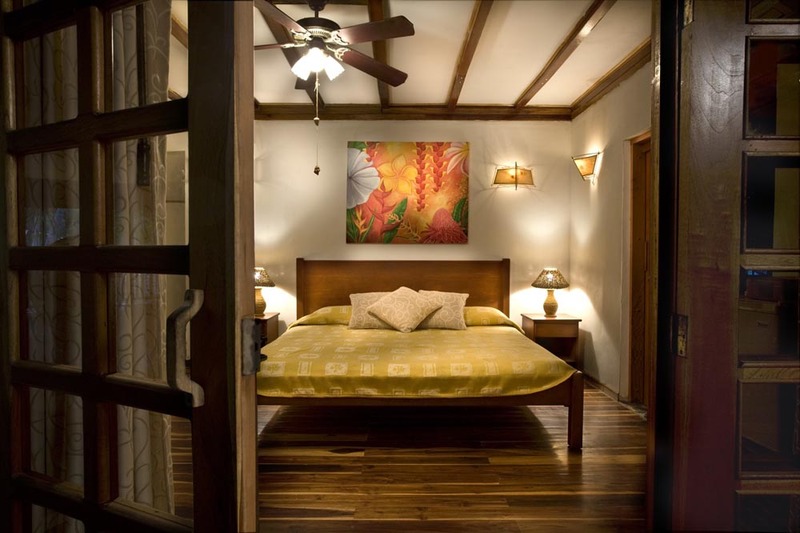 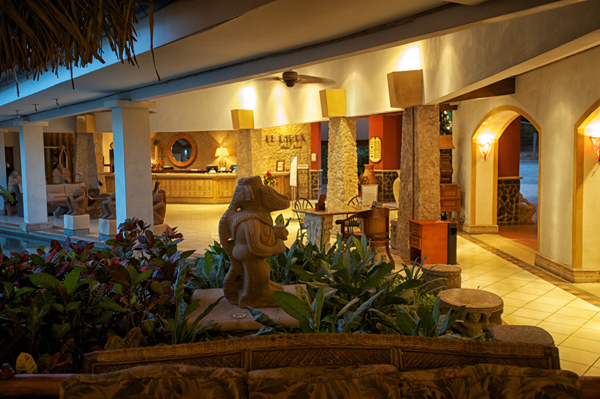 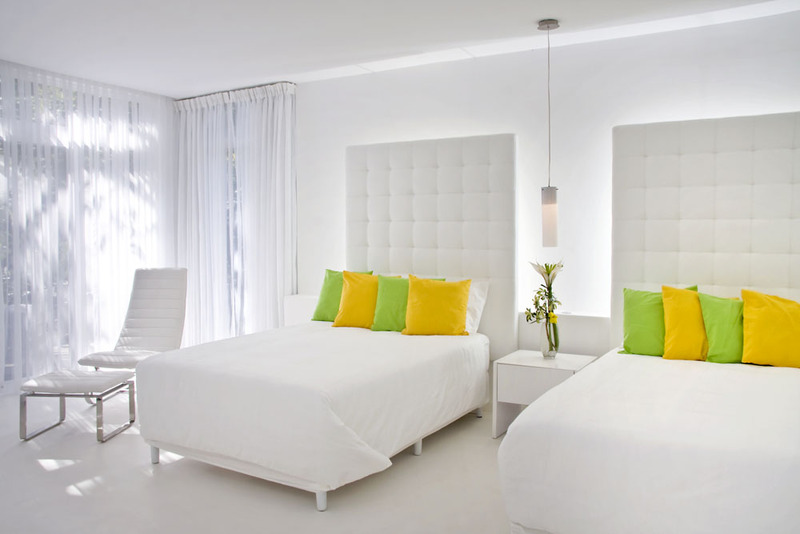 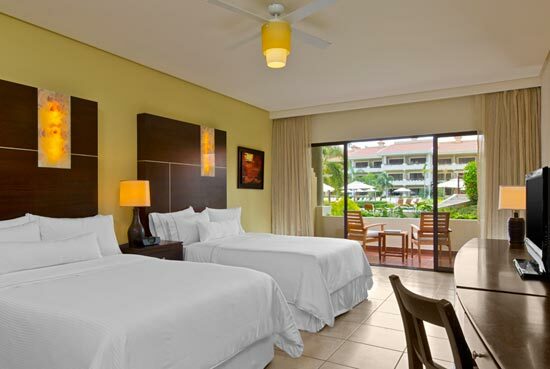 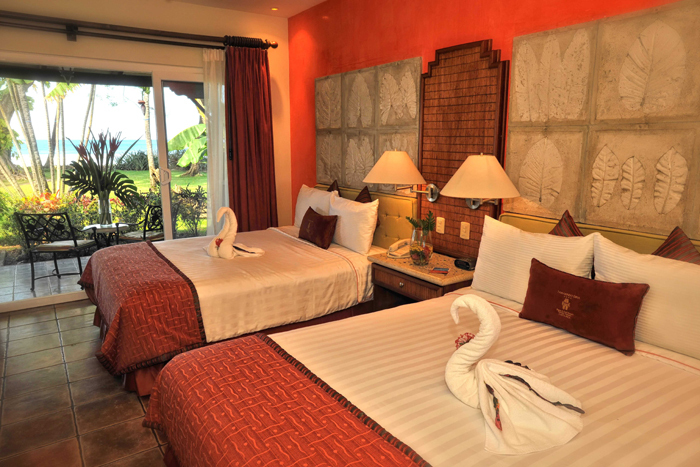 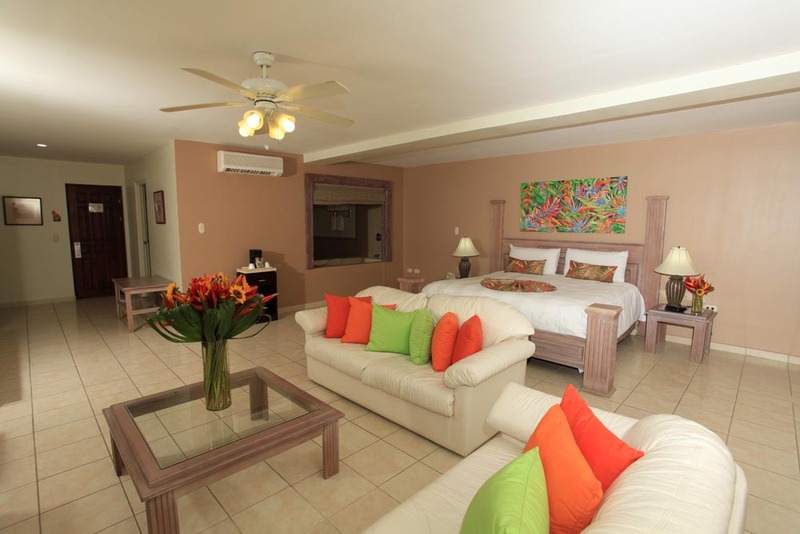 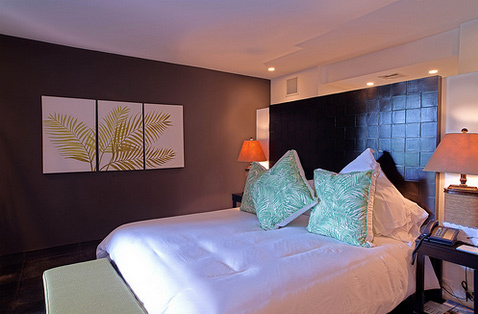 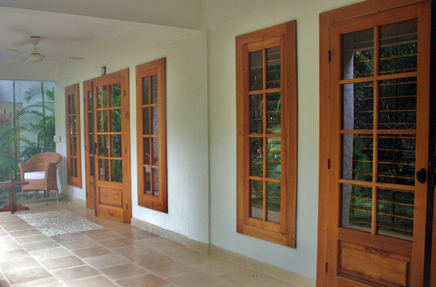 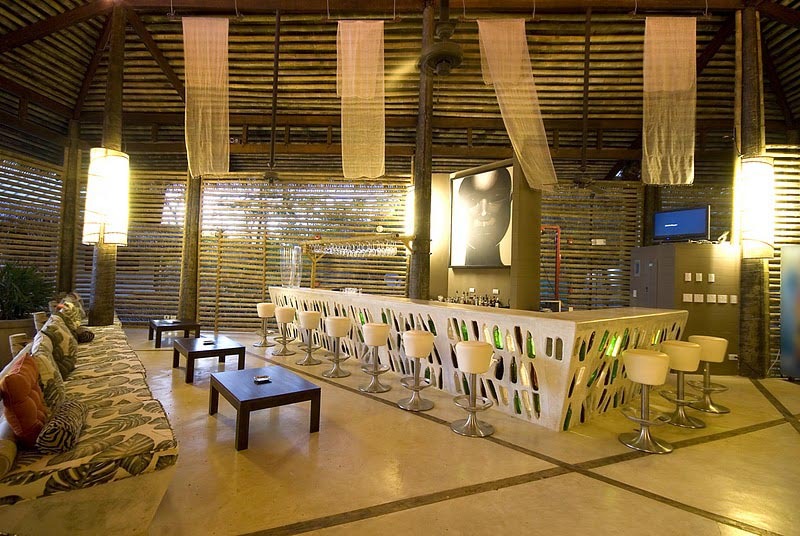 As Tamarindo´s first hotel, this is the beaches’ premier lodging facility, offering guests 30 years of hospitality. 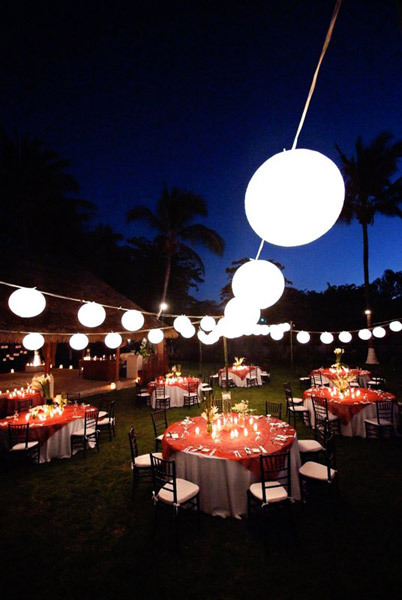 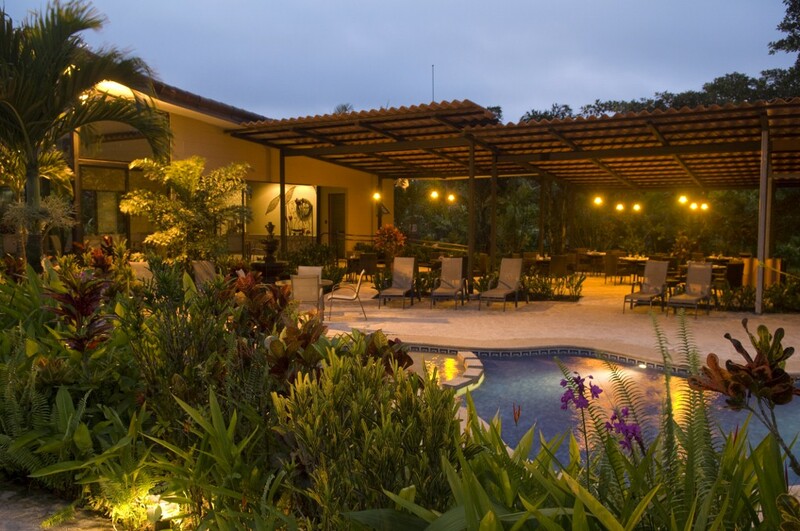 Spread out over 5 acres, Tamarindo Diria Beach & Golf Resort is surrounded by exotic and beautifully maintained lush tropical gardens that offer guests the natural beauty of Costa Rica right outside their doors. 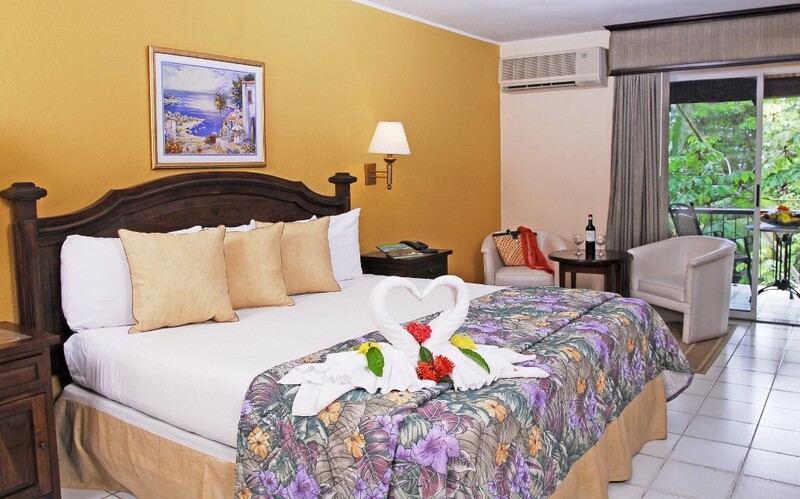 The majority of rooms offer incredible ocean views, picturesque sunsets, and access to Tamarindo Beach just a few steps from your hotel room. 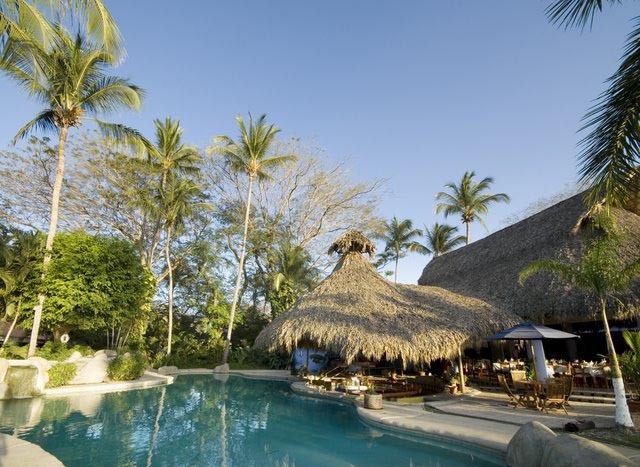 The Hotel Bahia del Sol is located in Potrero Beach, a beautiful beach of warm tranquil waters on the Pacific Coast of Guanacaste. 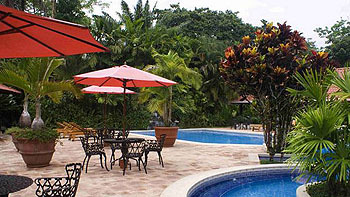 The Hotel offers the guests the quality of a 4 Star Beach Hotel with all the comforts, including Pool, Jacuzzi, and a Spa, framed in an impressive setting that includes tropical artistic gardens with centennial trees, a Tropical Garden with Native & Exotic plants , and an extensive beach front. 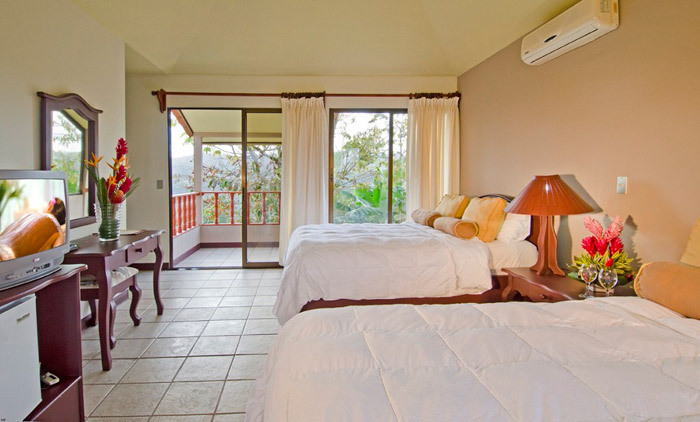 The location is perfect for soaking in breathtaking views of the tranquil Potrero Bay, romantic long walks on the golden sands, basking in the rich sun and watching the spectacular sunsets of the Pacific Coast. 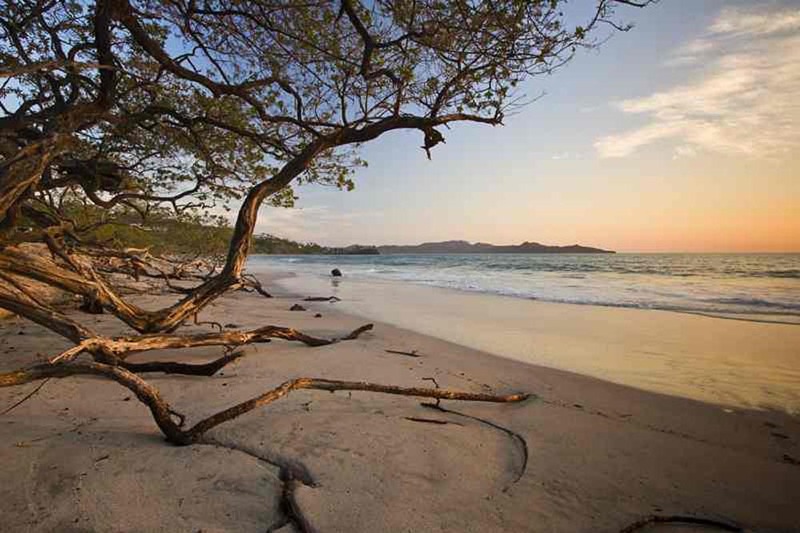 With miles of uncrowded beaches, stunning coves and undiscovered inlets, Costa Rica’s natural environment speaks to your soul. 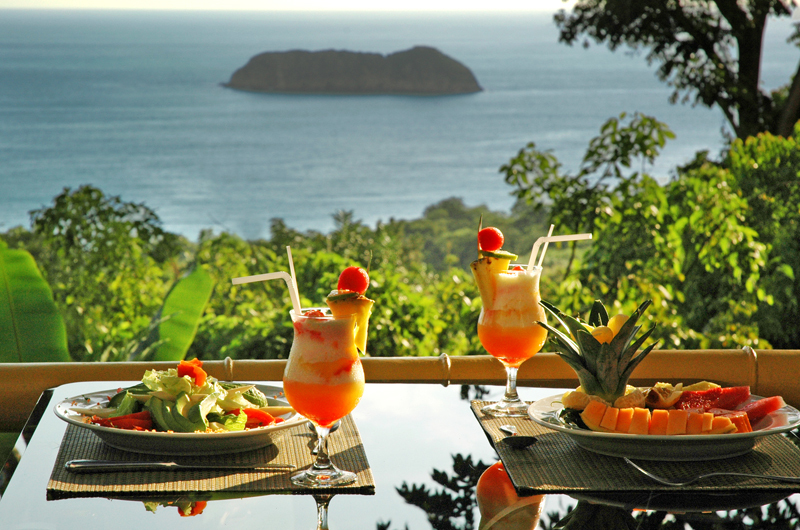 Spend your time unwinding on a luxurious Bali bed by the pool, treating yourself to our world-class cuisine, or indulging your adventurous side by exploring one of the nearby Costa Rican national parks. 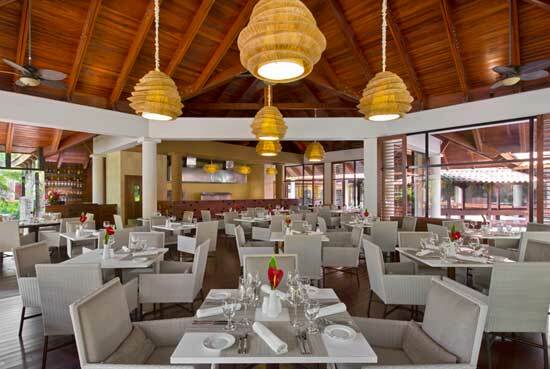 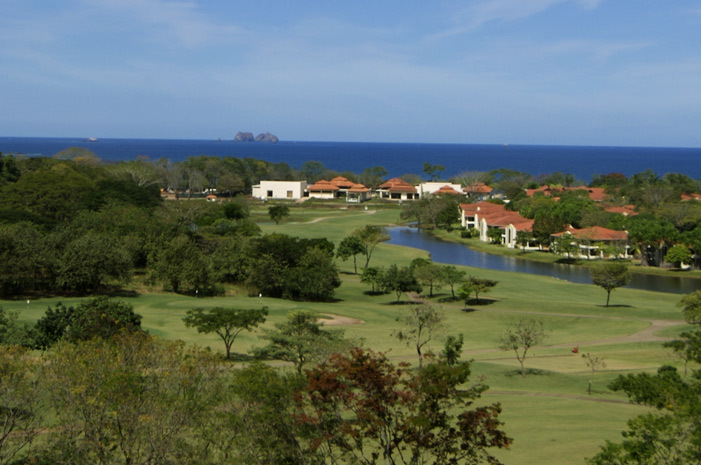 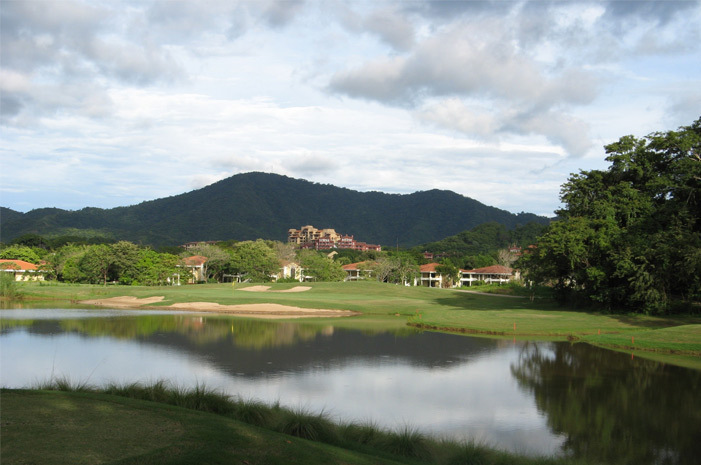 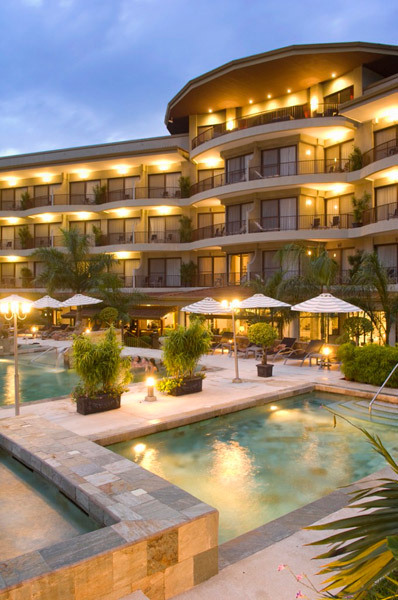 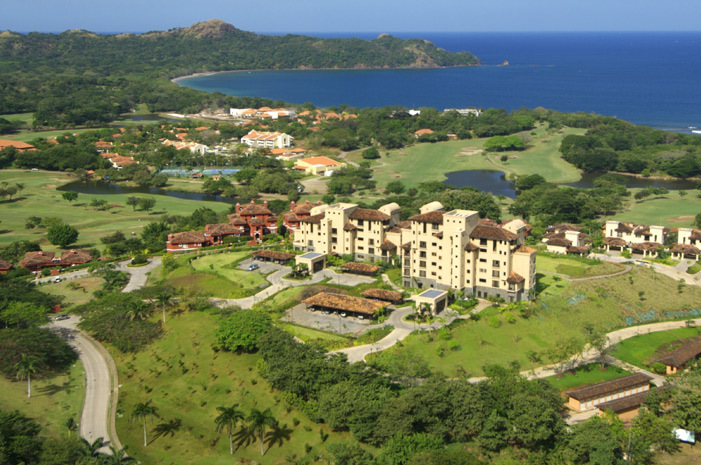 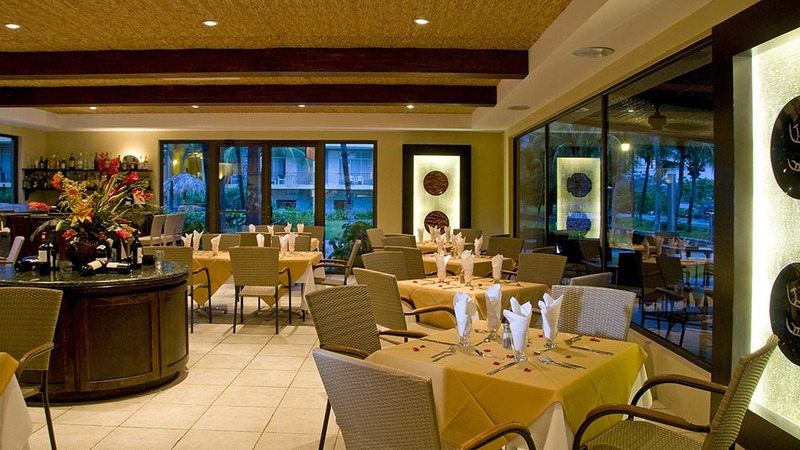 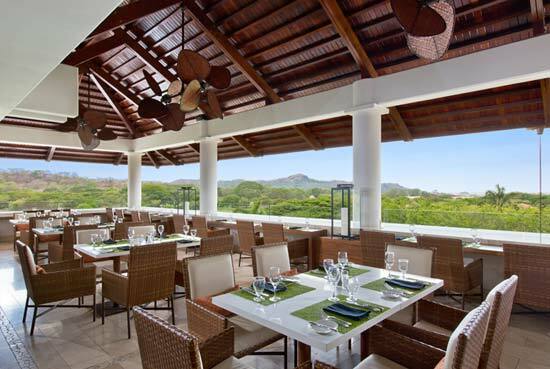 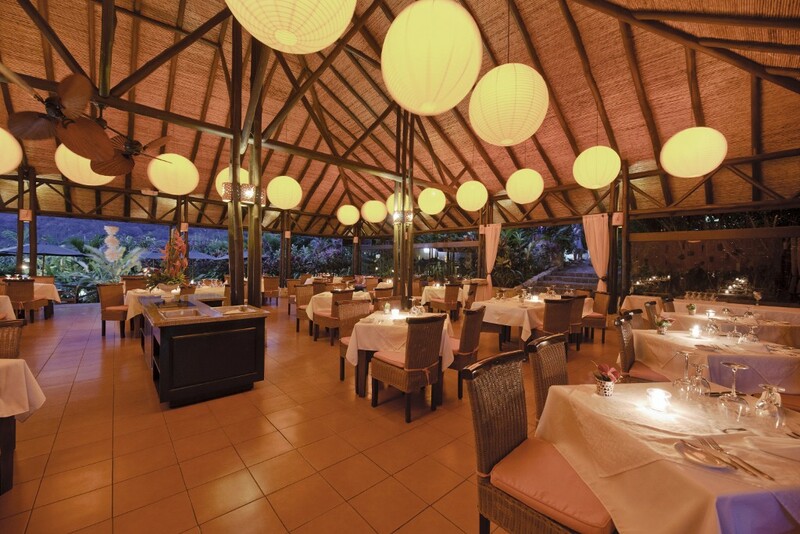 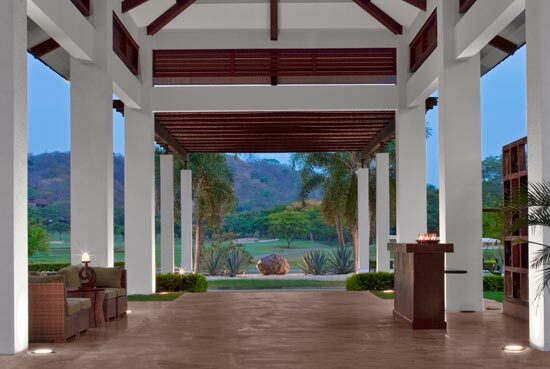 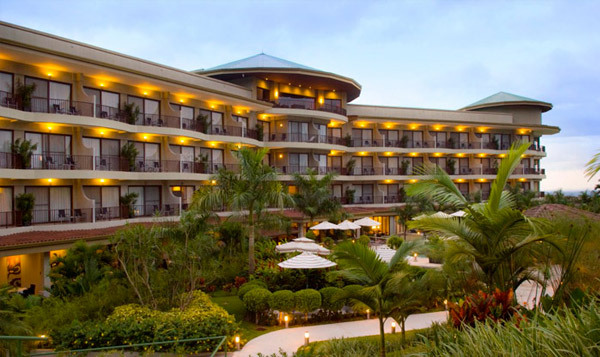 The Westin Golf Resort & Spa, Playa Conchal is conveniently located 45 minutes (60km) from Liberia International Airport, and 15 minutes from Tamarindo local airport. 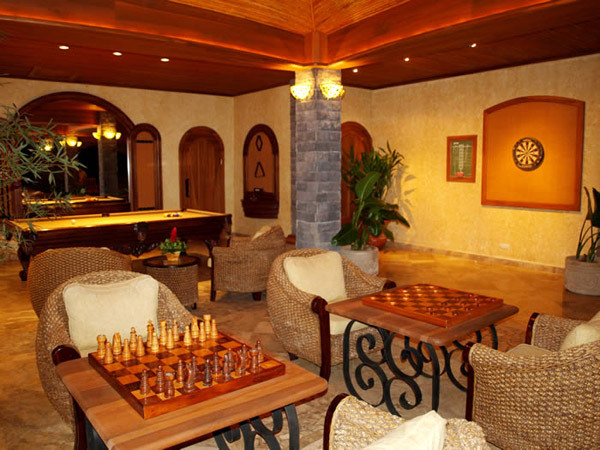 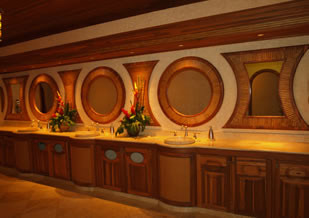 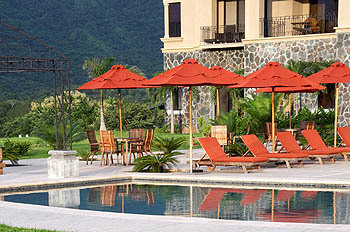 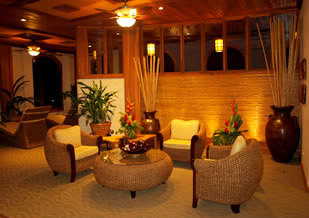 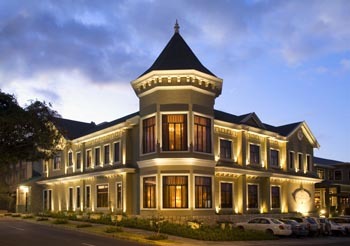 The unique and exclusive Reserva Conchal Club and Spa, was designed by Costa Rican renowned architect Antonio Cardona, of San José. 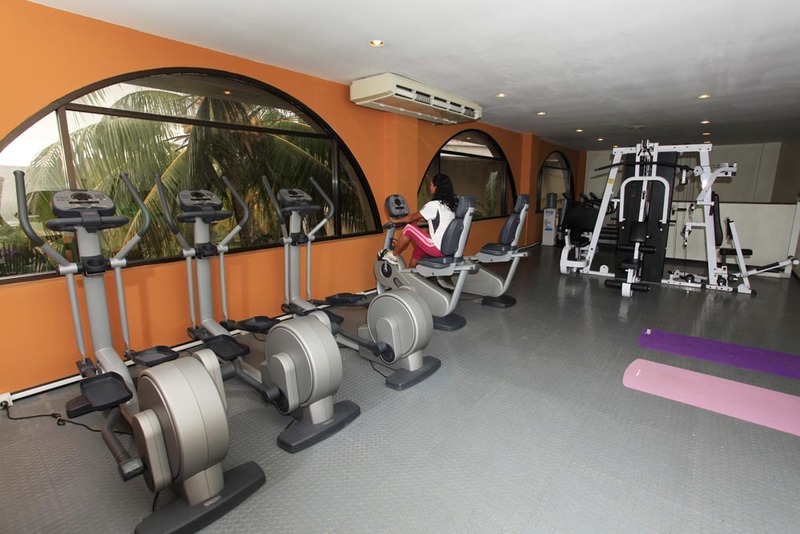 This roomy 60,000 ft2 (5,500 m2) club is undoubtedly the resort’s hub of activity, a central gathering place for dining and relaxing, exercising and tanning, socializing and entertaining. 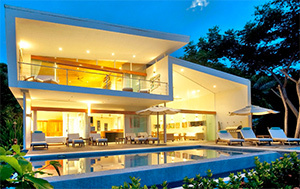 A contemporary Swimming Pavilion of a 200 feet (60 meter) pool connects the restaurant and spa section of the facility. 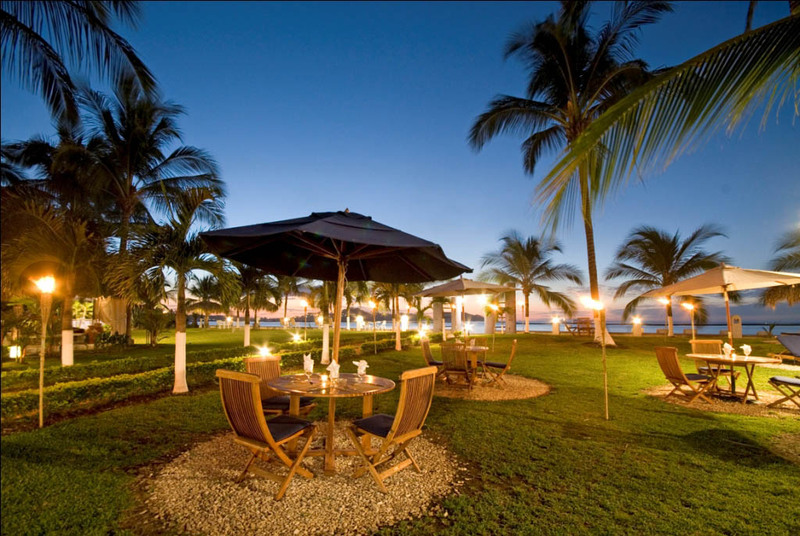 A variety of beach activities are offered, including kayaks, jet skis, kite and windsurfing, sailing, pedal boats and wakeboarding. 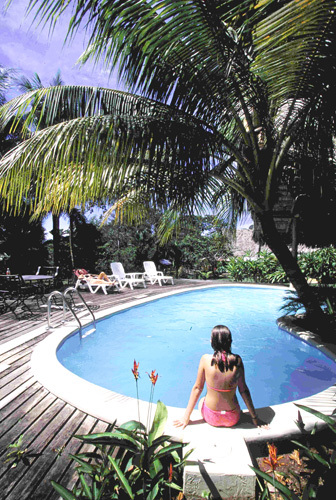 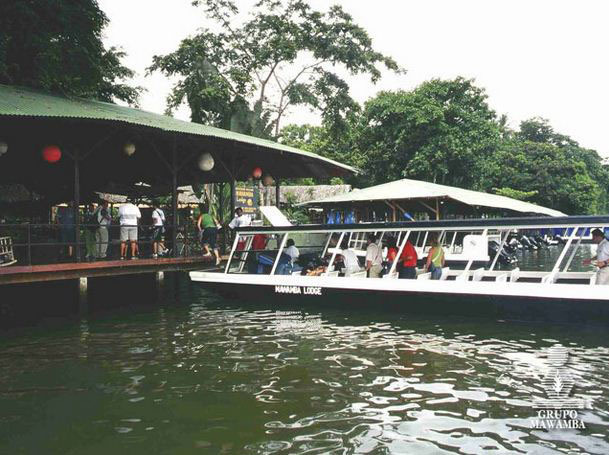 Scuba and snorkeling trips, fishing excursions and canopy tours can also be arranged here, and the concierge is always happy to accommodate special requests from members and guests. 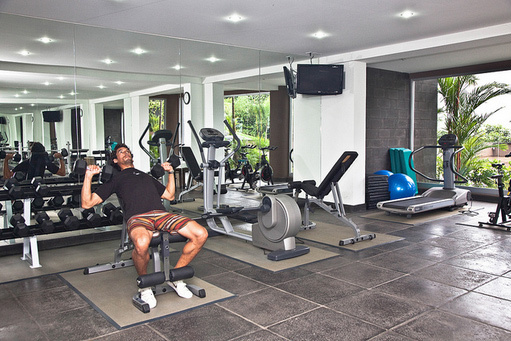 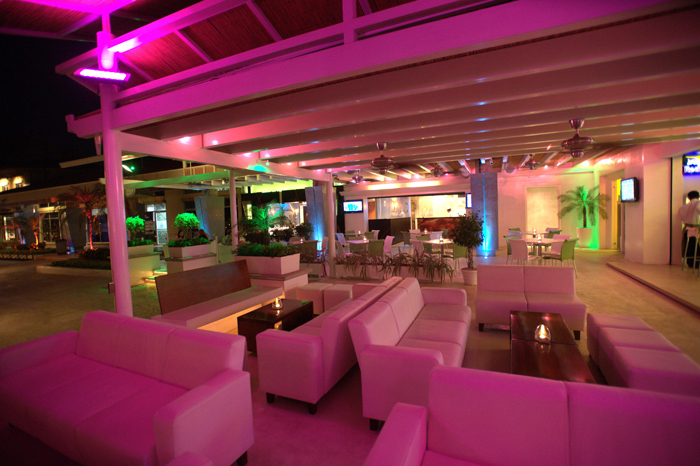 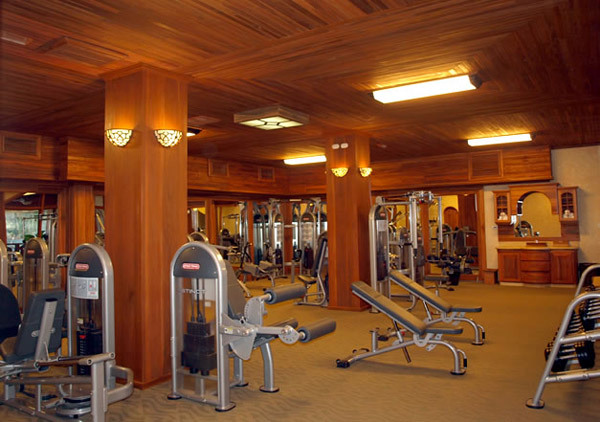 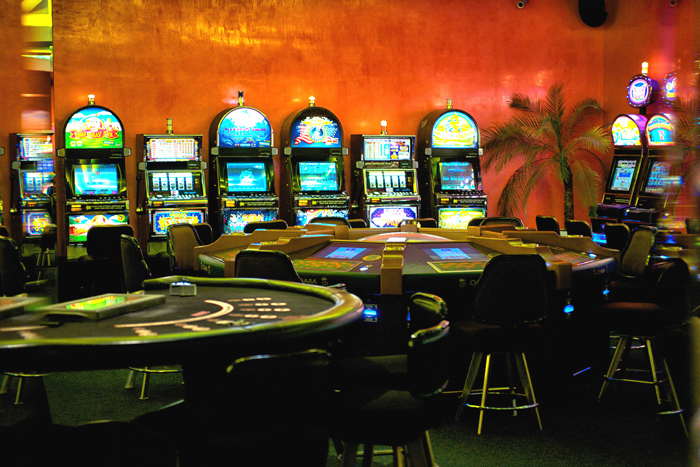 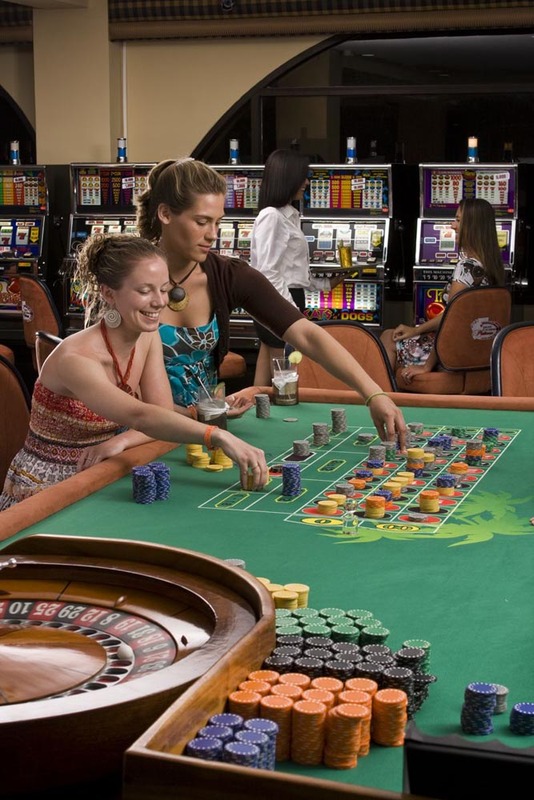 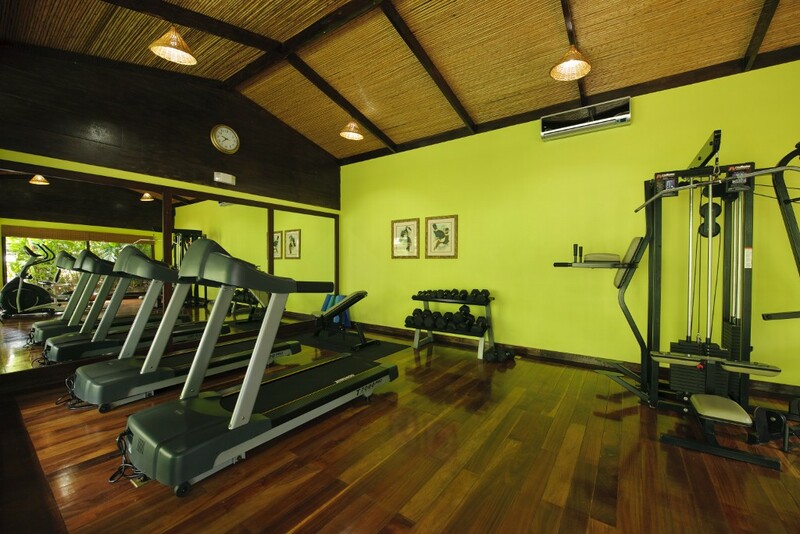 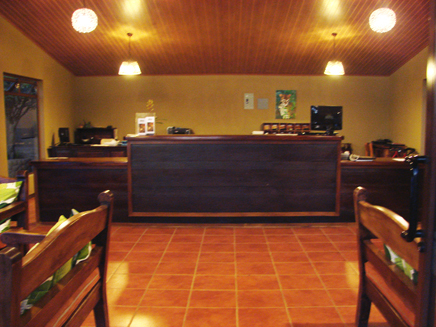 A professionally staffed and fully equipped medical center is also located within the Club. 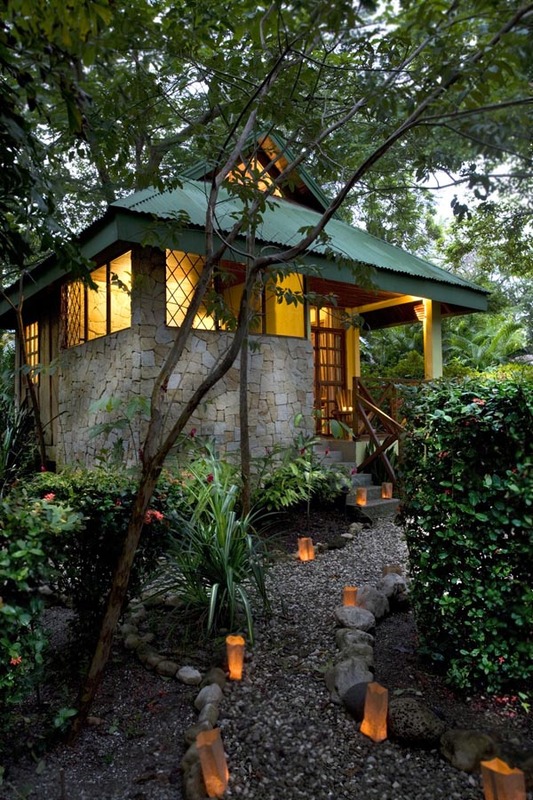 This is the perfect destination for travelers seeking an enchanting escape. 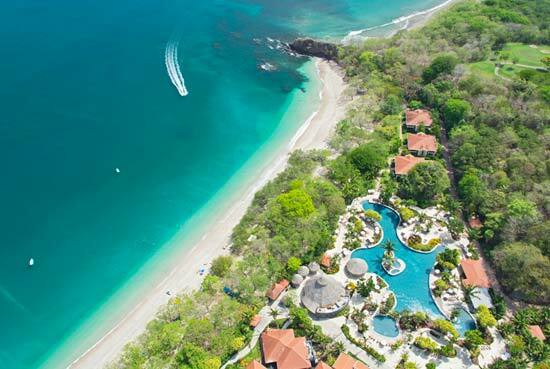 Here, you’ll lounge on the pristine golden sands of one of the most beautiful beaches in Costa Rica, framed by the deep blue Pacific Ocean and lush mountain foliage. 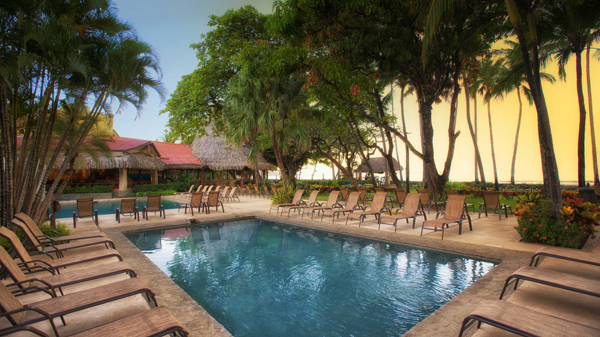 Use this relaxing, rejuvenating setting as your base to enjoy a wonderful array of adventure tours, engage in a wealth of available water sports such as diving, snorkeling, and deep-sea fishing, and explore spectacular national parks and charming villages nearby. 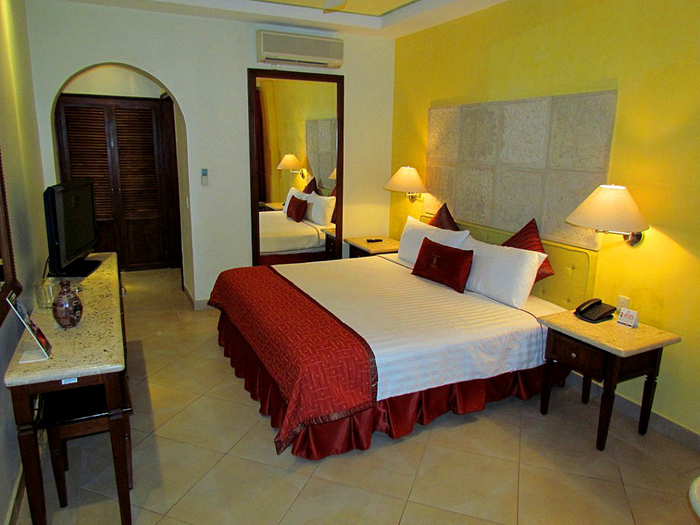 All rooms are spacious and well-appointed, and feature all of the services and amenities you’d want and expect. 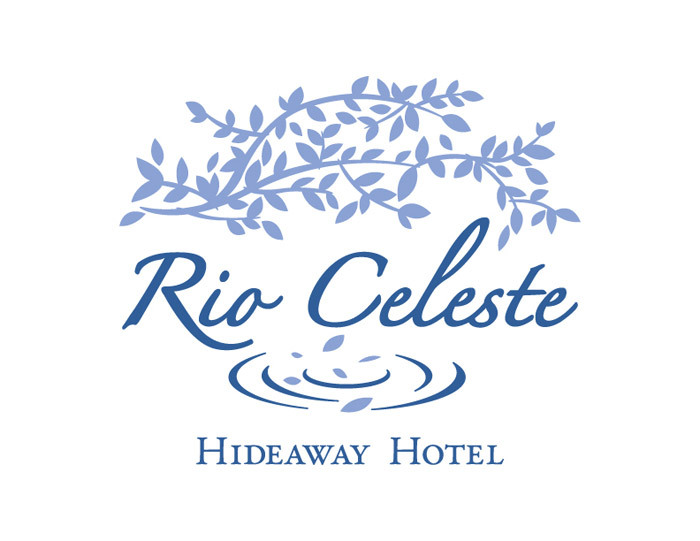 Rio Celeste Hideaway Hotel is a boutique, gourmet, ecological orientated hotel that provides a uniquely natural experience. 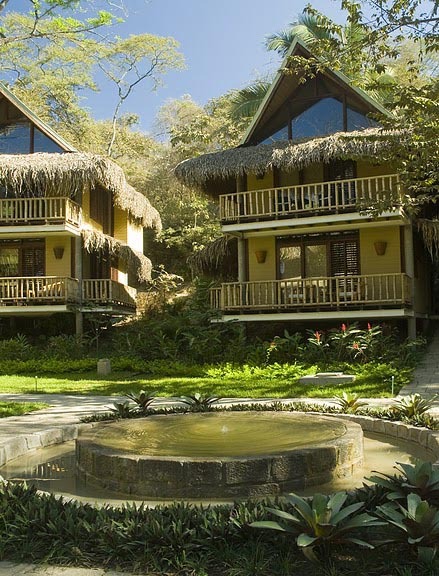 Surrounded by lush tropical rainforest, each one of the 26 spacious casitas provides an exclusive retreat in which guests can relax amidst the breathtaking Rainforest. 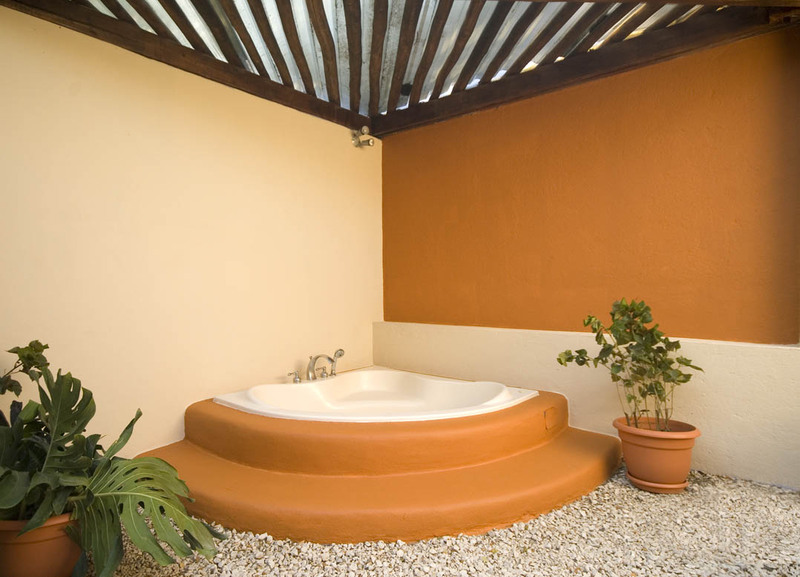 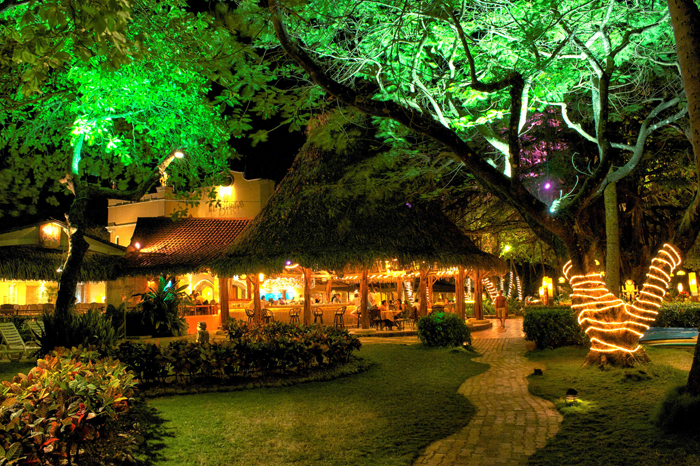 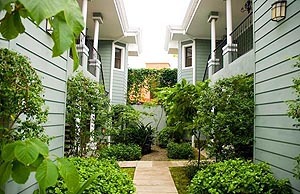 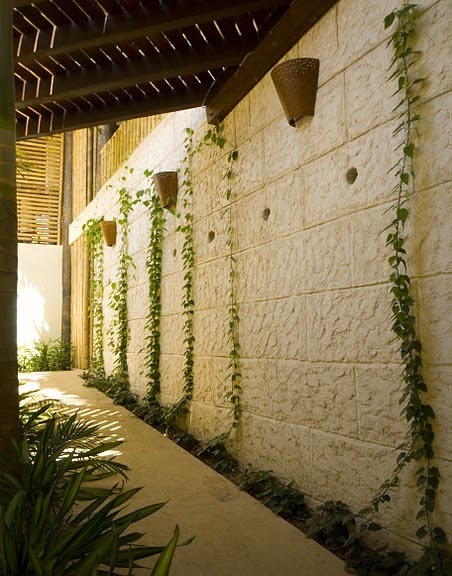 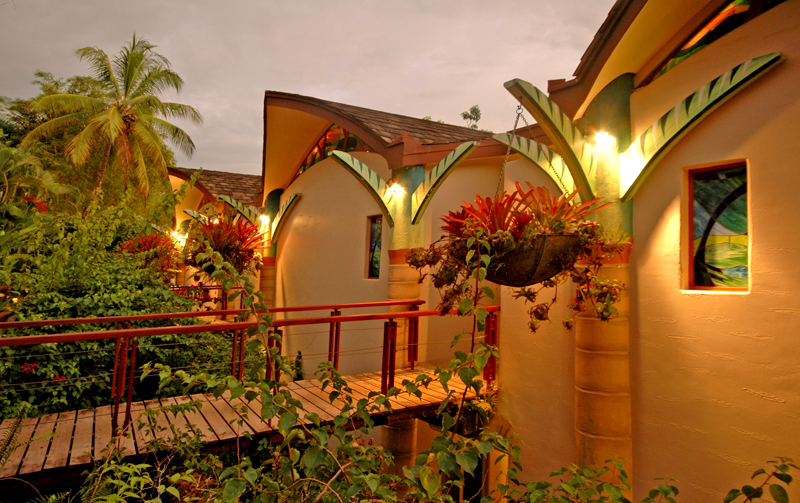 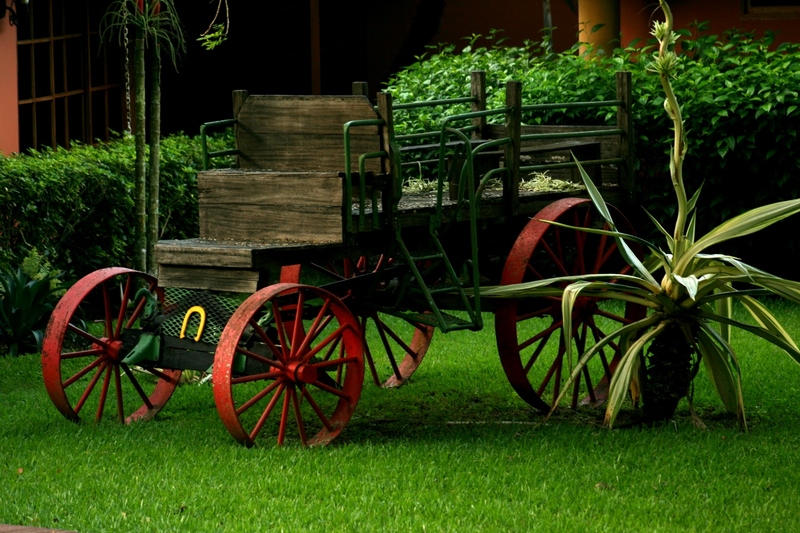 The hotel has created a unique concept of casitas separated from each other by a lush tropical landscaping. 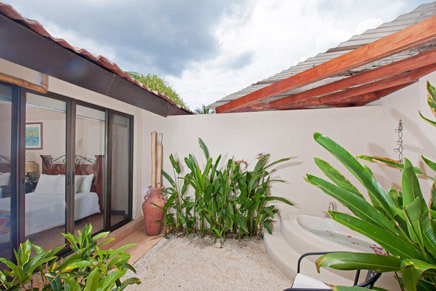 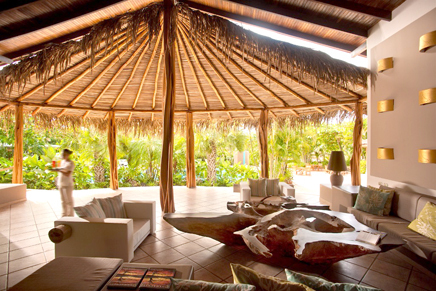 Each of the spacious casitas measures 90 square meters and offers an independent and private space. 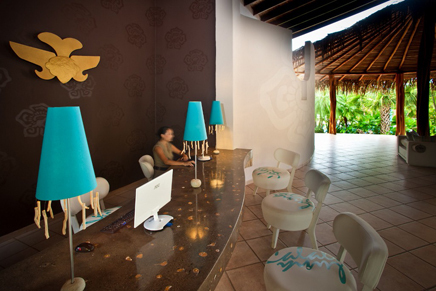 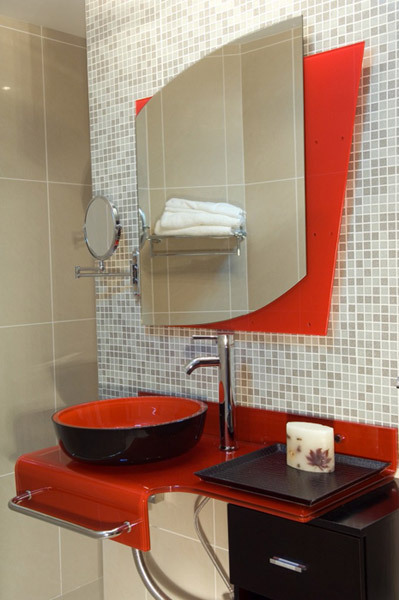 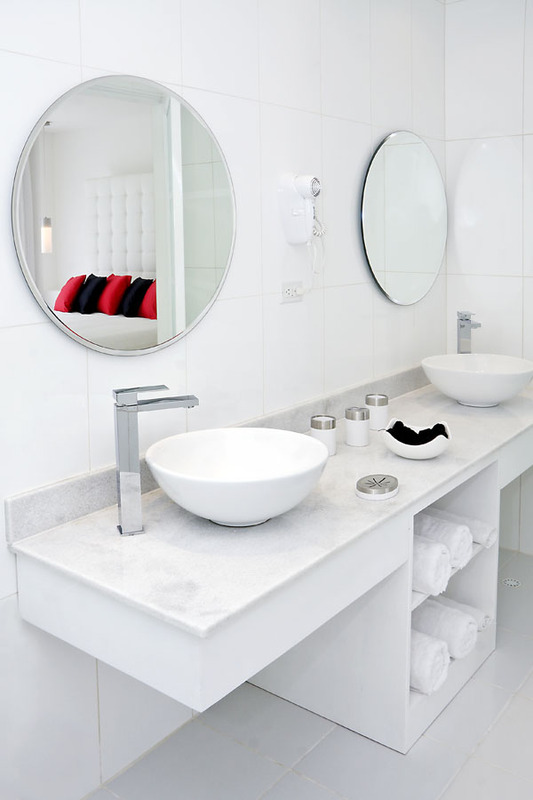 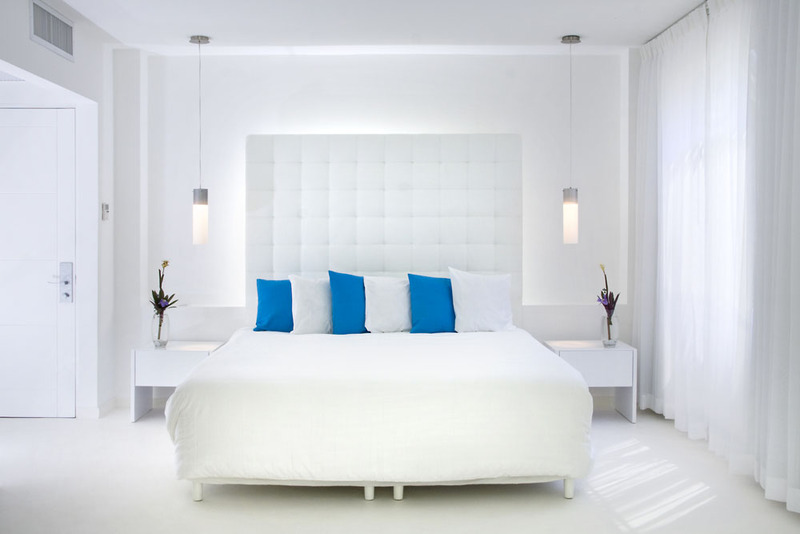 The hotel offers the perfect complement between service and luxury design. 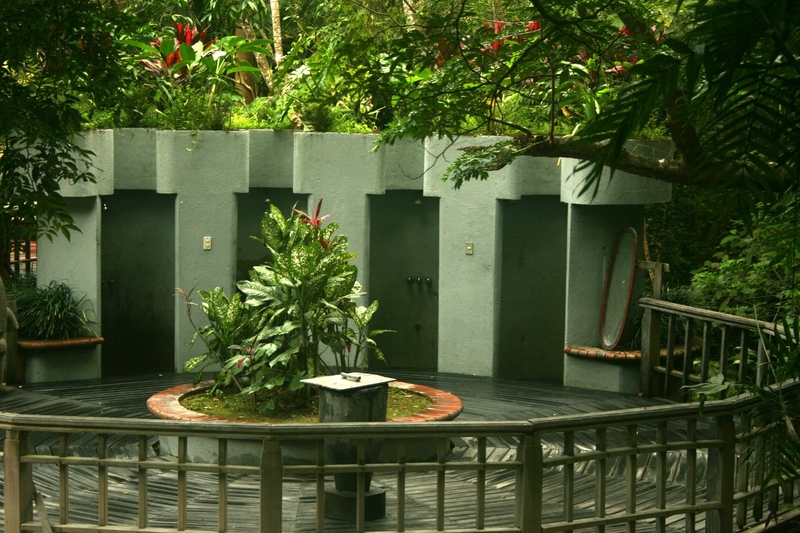 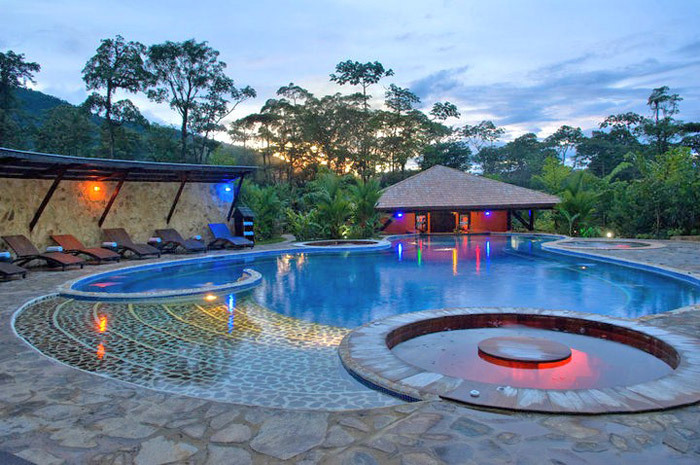 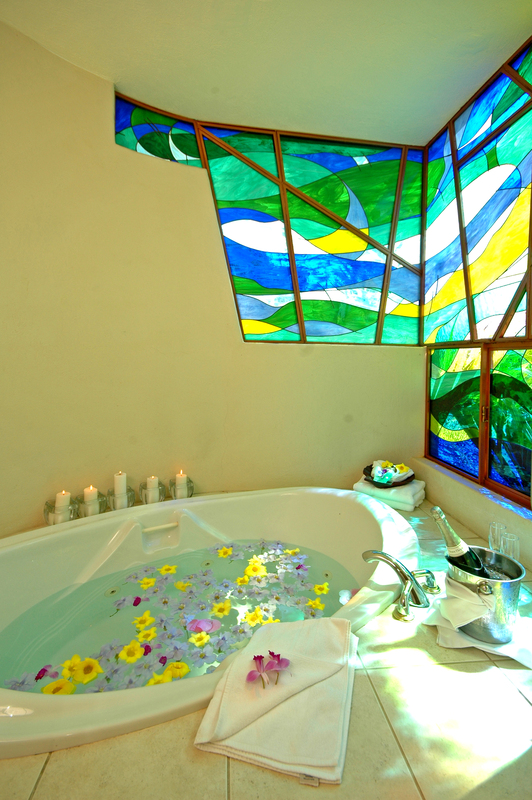 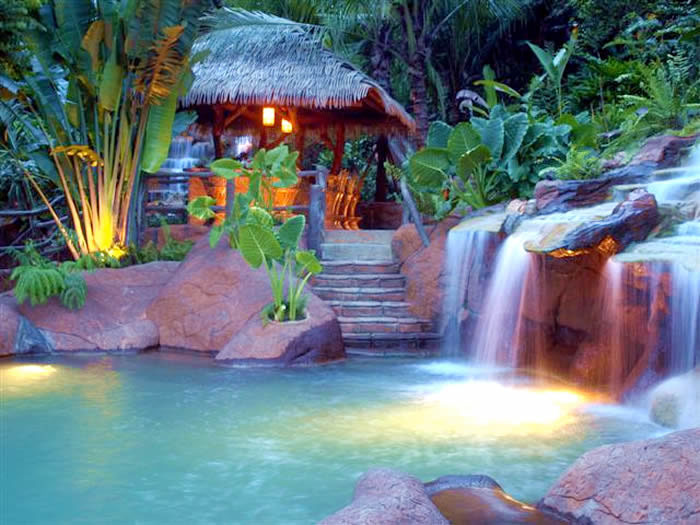 The Hot Springs Spa at Borinquen Mountain Resort is your exclusive vacation spot located in Guanacaste in the North Pacific Region of Costa Rica. 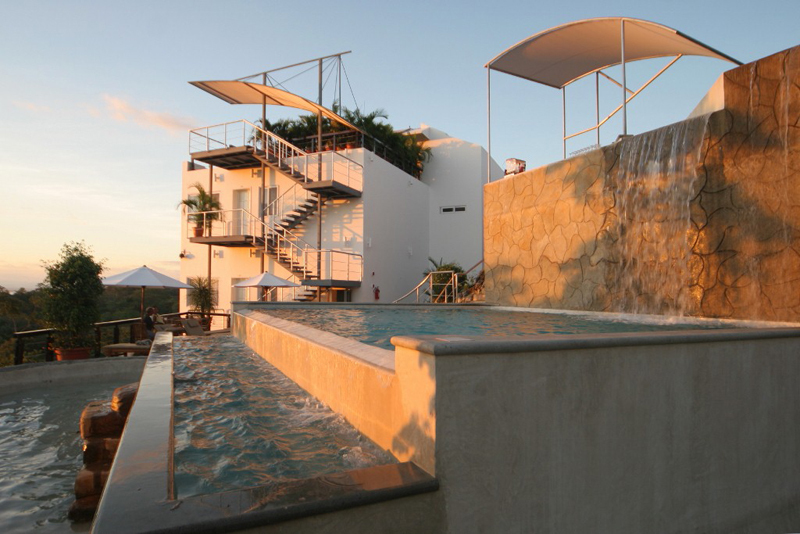 The Hotel was designed and created in 1999 with the sole purpose of unlocking the exceptional beauty of the Rincon de la Vieja countryside and bringing it to the world. 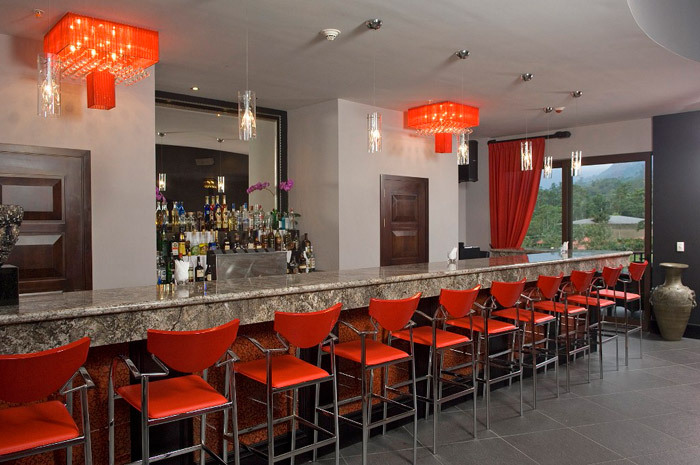 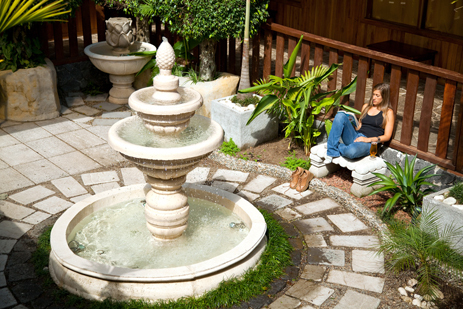 When you visit Hotel Borinquen you are literally stepping into a world apart. 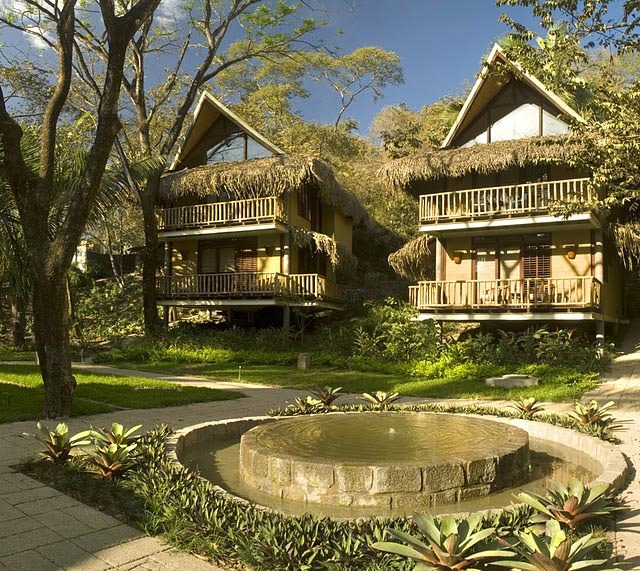 Hike or bird watch here (you may be fortunate to spot a Resplendent Quetzal, the ‘Holy Grail’ of birders), but don’t miss the magical cloud forest of Monteverde – a quiet, peaceful area first settled by Quakers. 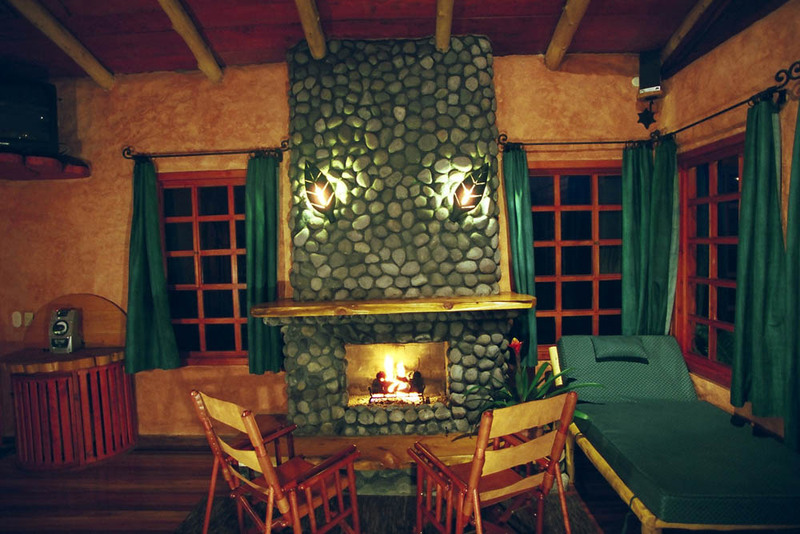 The higher elevation keeps the temperature of this unique destination crisp and cool year round. 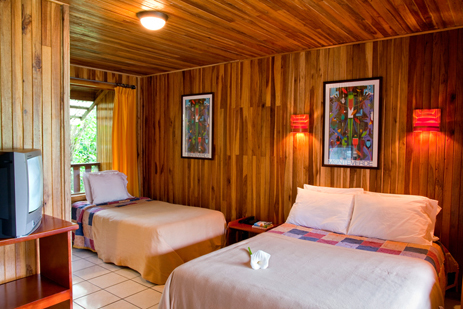 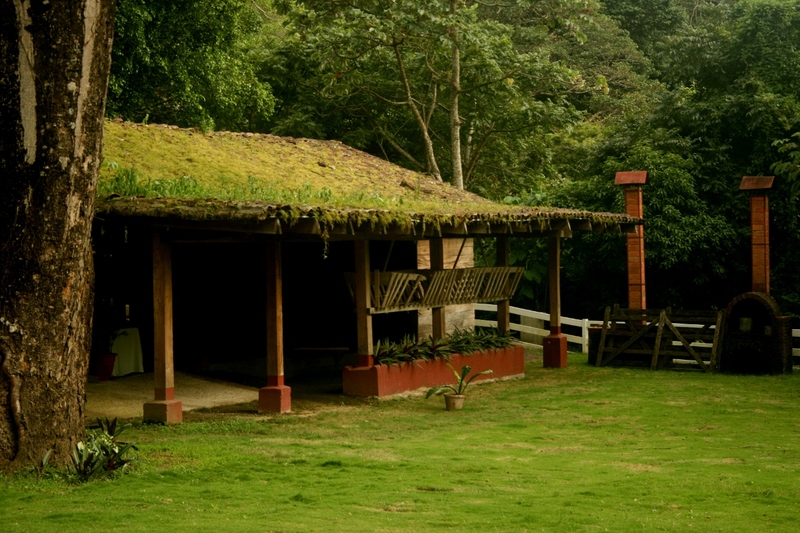 Genuine Quaker hospitality awaits you in the quaint hotel set in a private 150 acres farm (50% protected primary forest) adjacent to the Monteverde Reserve. 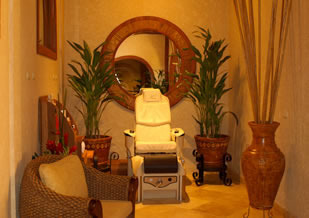 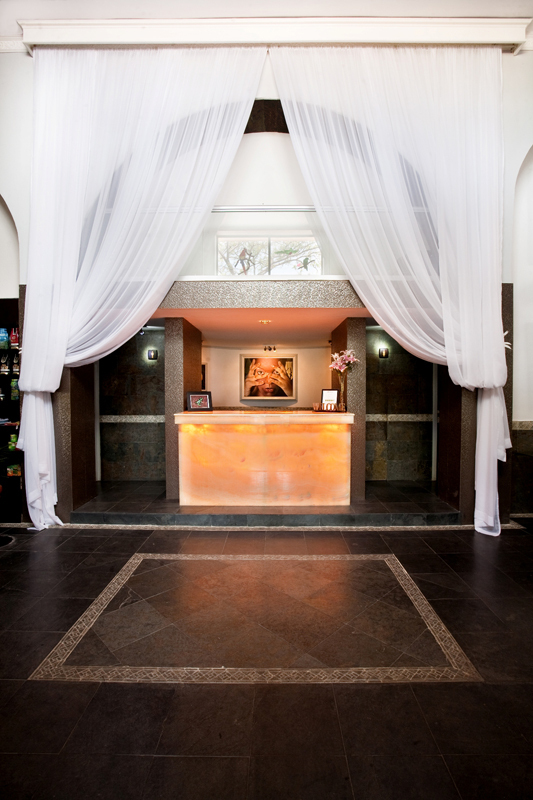 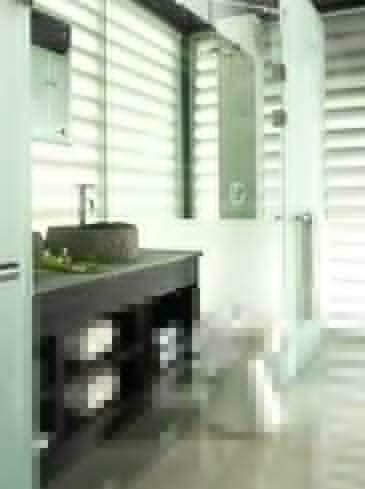 You can also find true rejuvenation at Green Leaf Spa on site. 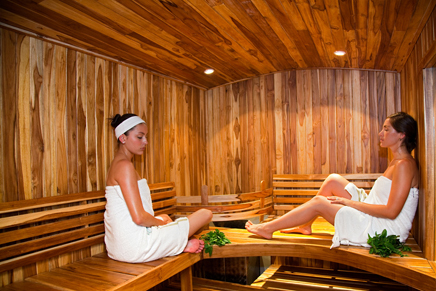 Focusing on beauty, health and your well-being, leave your daily stress behind and pamper yourself from head to toe. 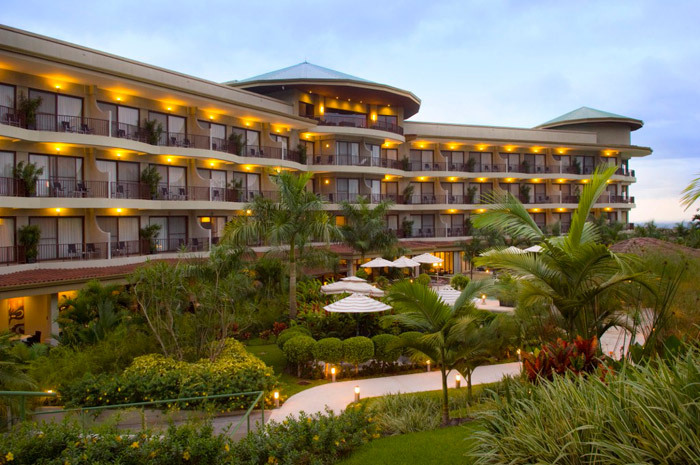 Services include: 155 Rooms, Tennis, basketball and soccer courts, 2 indoor tempered swimming pools, 2 bars, Gym, Spa, Conference Center, 2 Restaurants, Canopy Tour. 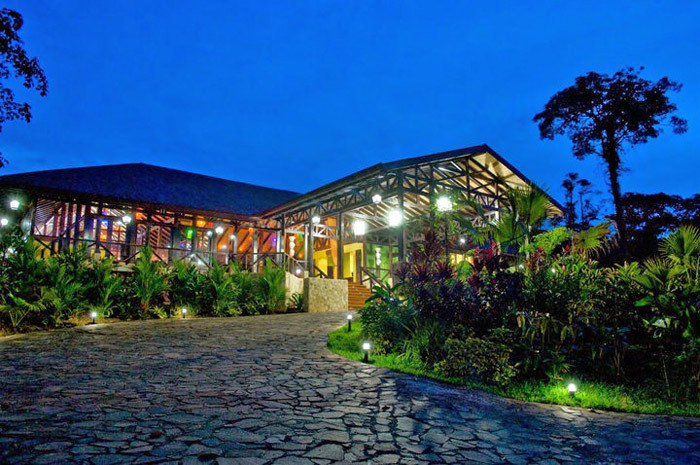 The Hotel is conveniently located just 10 minutes from one of the most famous cloud forests in the world: the Monteverde Cloud Forest Reserve. 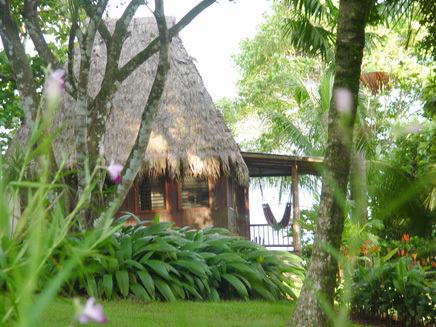 Monteverde is known as one of the most outstanding wildlife refuges in the World. 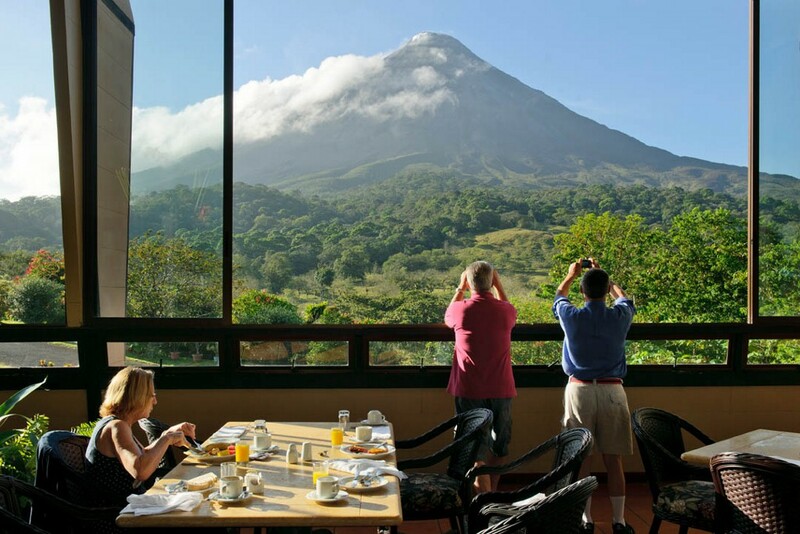 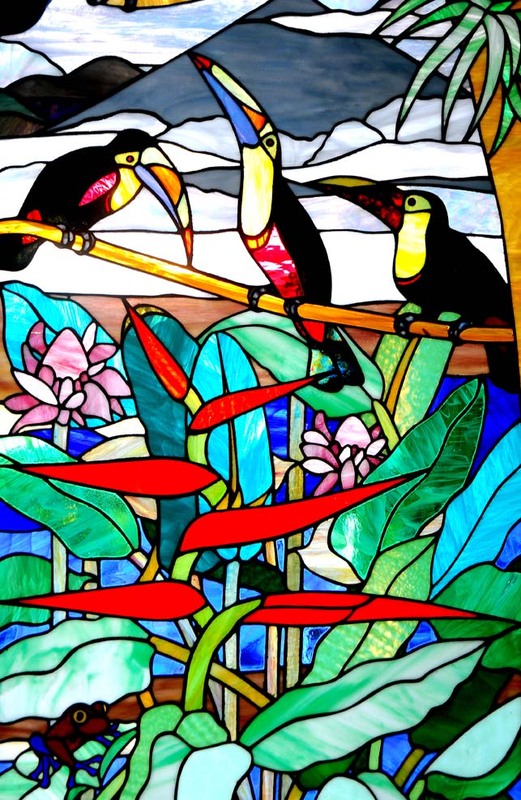 In Monteverde, you will have the chance to get a real taste of Costa Rica’s wild life and appreciate its flora and fauna, you may see lots of mammals, birds like the Quetzal, exotic insects and thousands of species of plants. 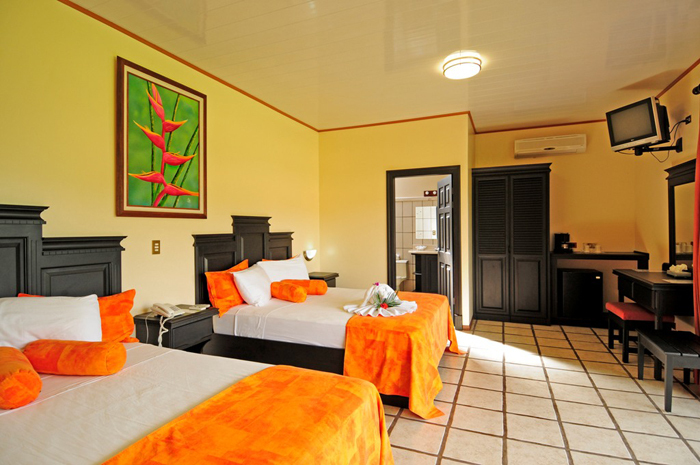 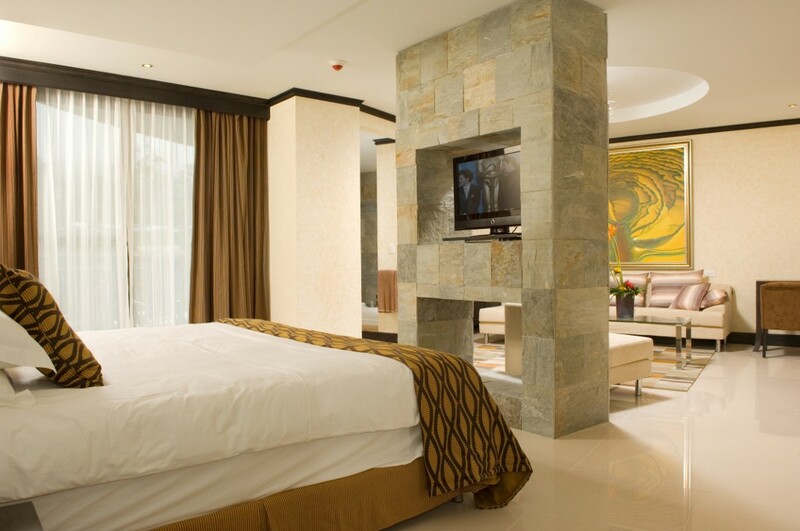 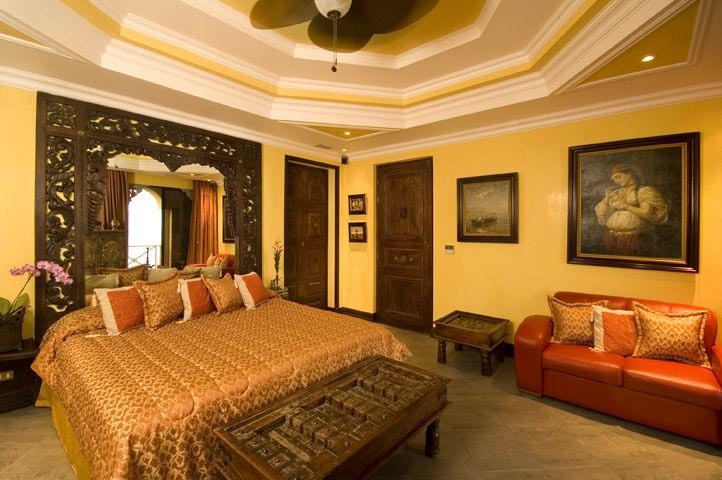 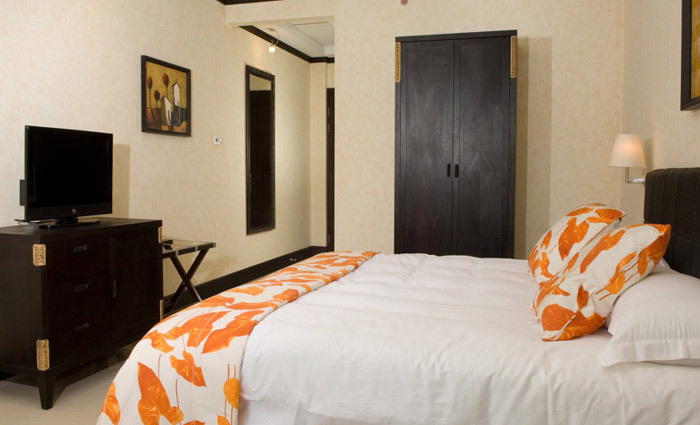 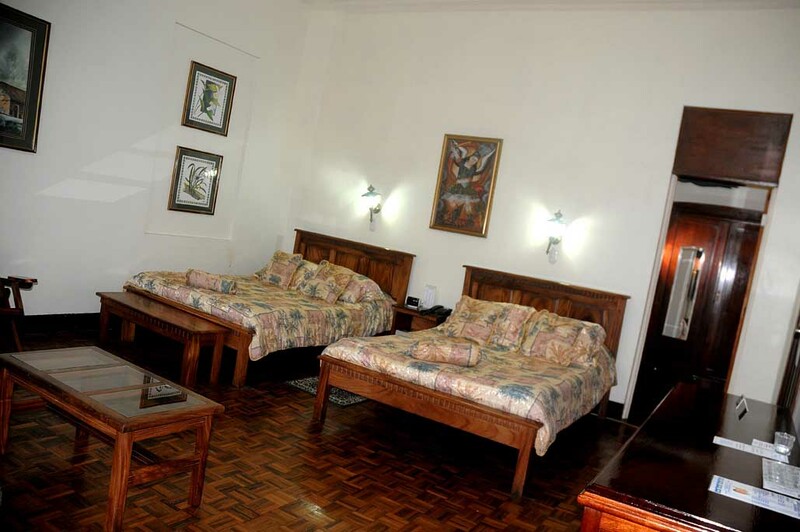 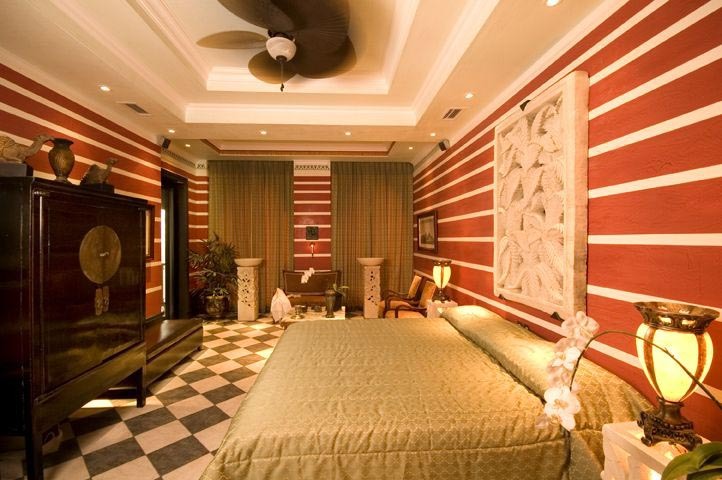 A total of 29 deluxe fully equipped rooms ranging from single to doubles, triples and quadruples. 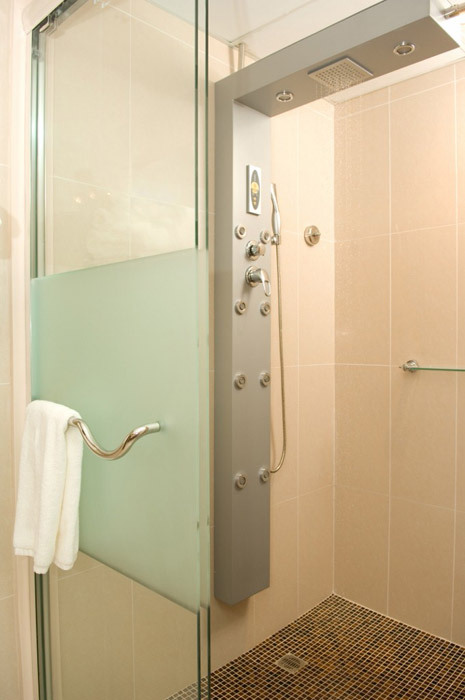 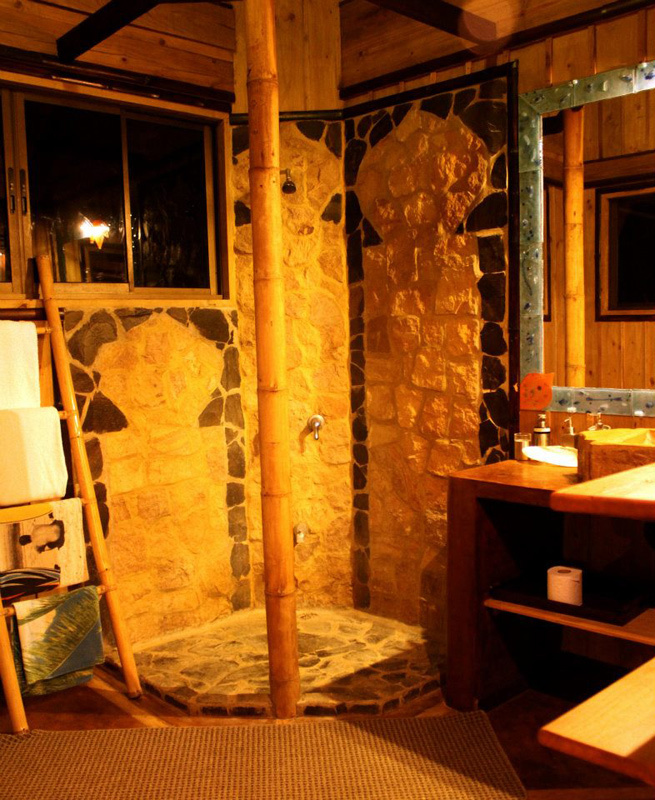 They all have a comfortable private bath with a hot water shower, bathrobes, retractable chrome clothesline, lighted wall mounted mirror and hair dryer. 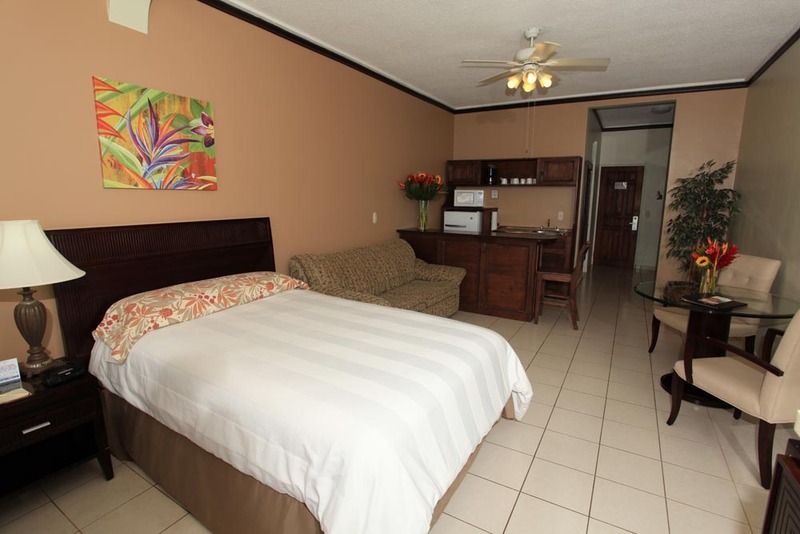 All rooms are equipped with a telephone for international calls, coffee maker, iron, cable TV, DVD player for watching movies that you may rent at our DVD shop, a safe deposit box and very comfortable orthopedic king and queen beds. 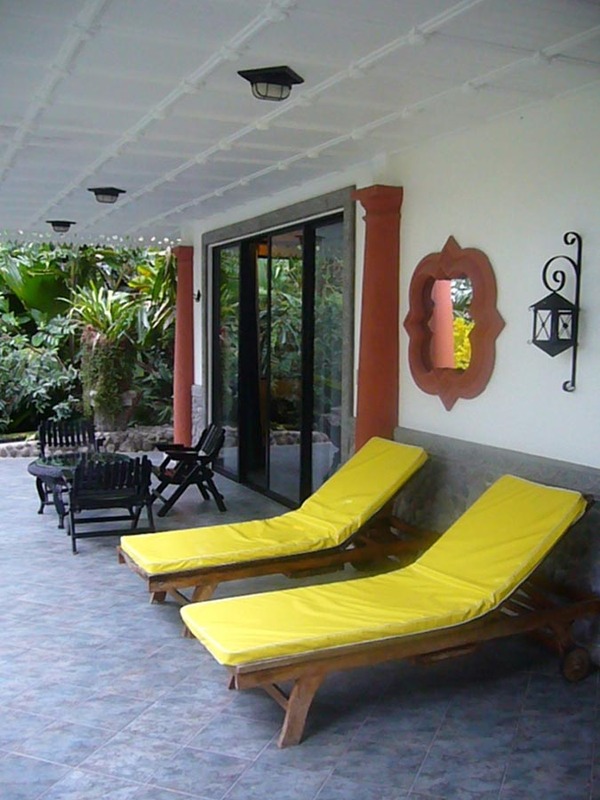 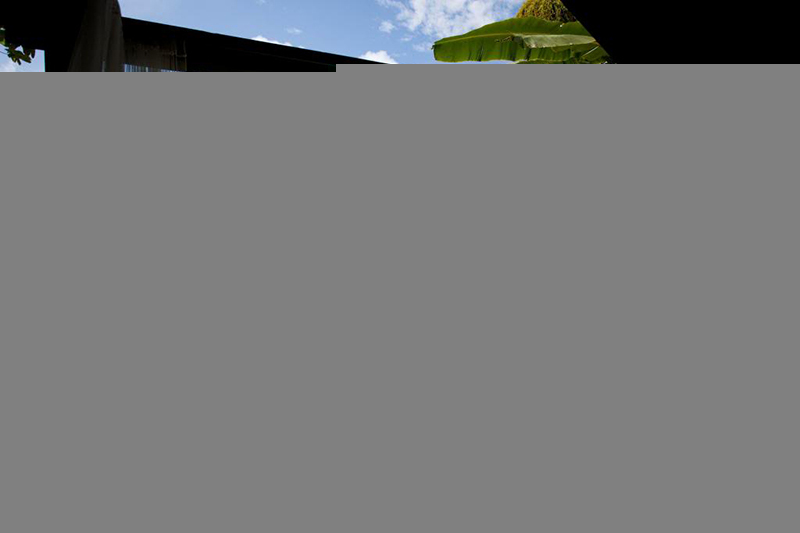 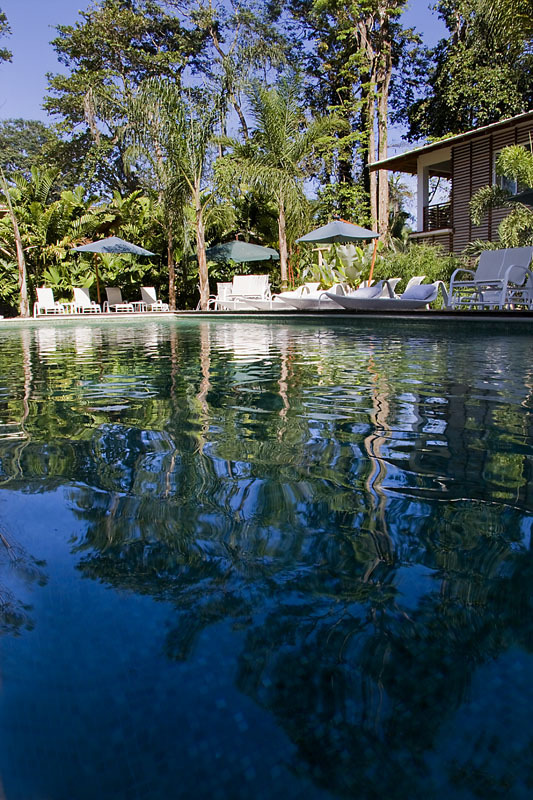 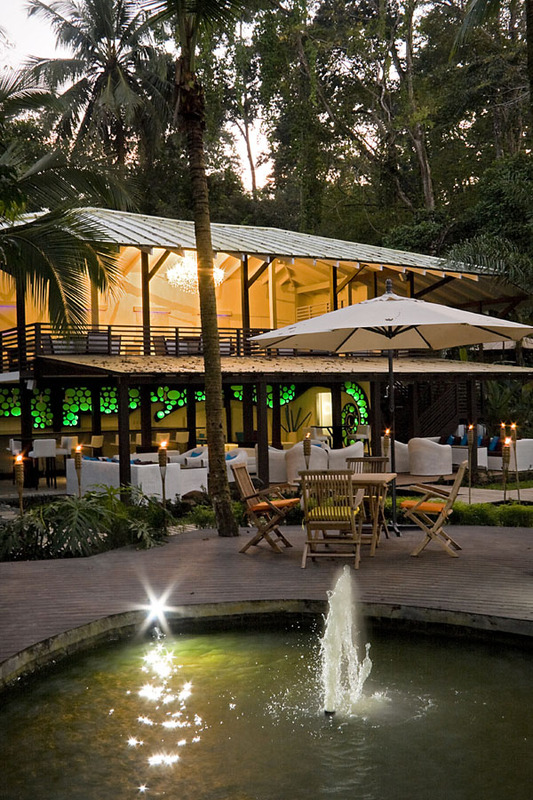 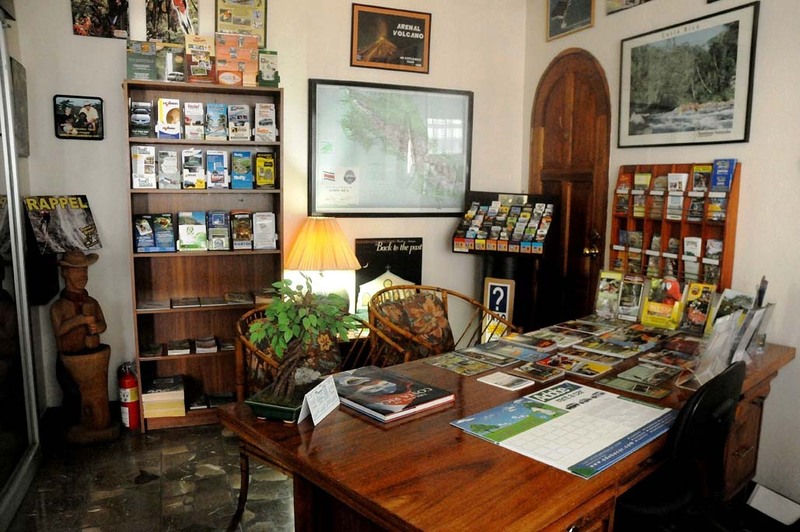 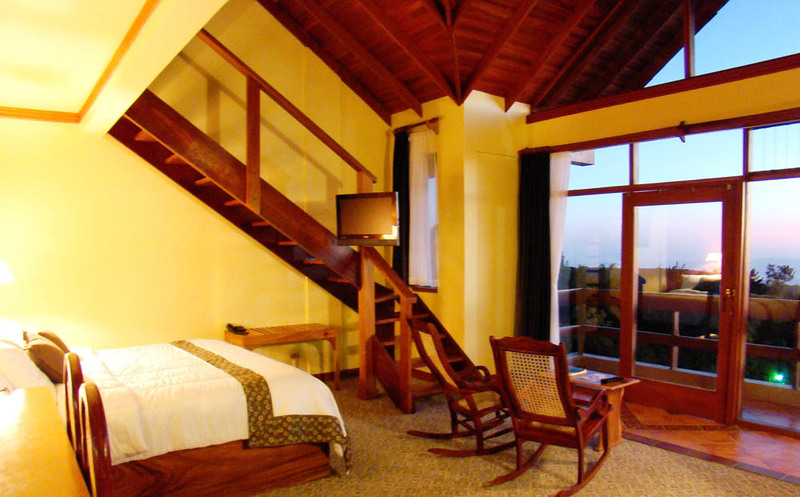 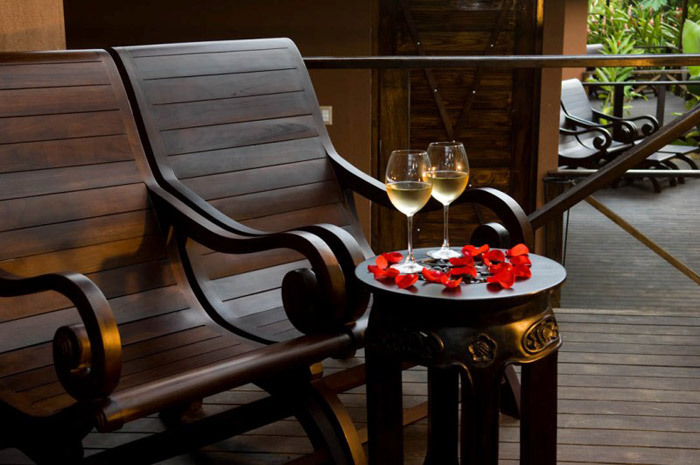 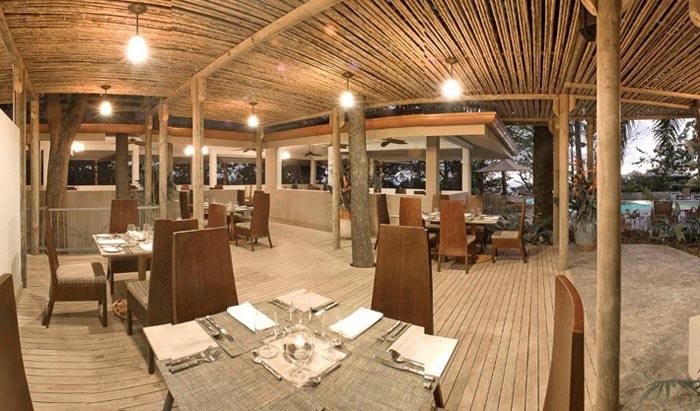 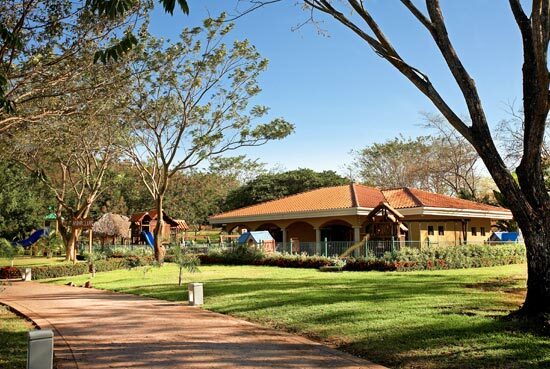 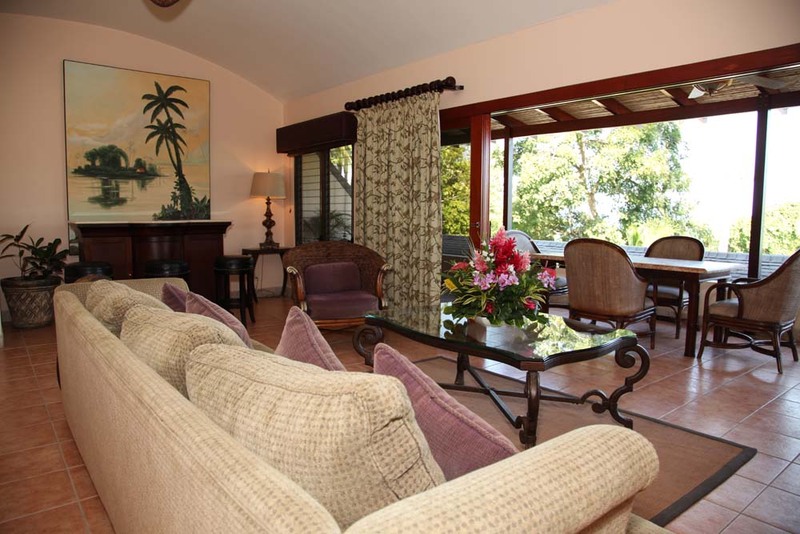 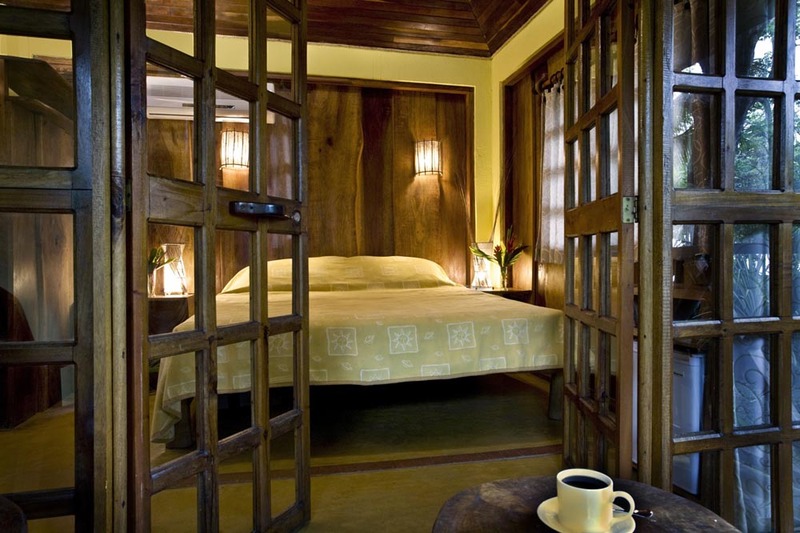 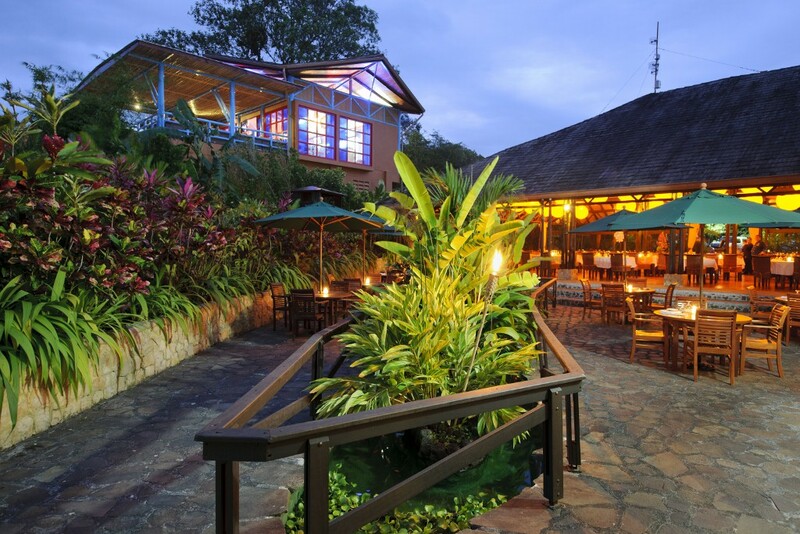 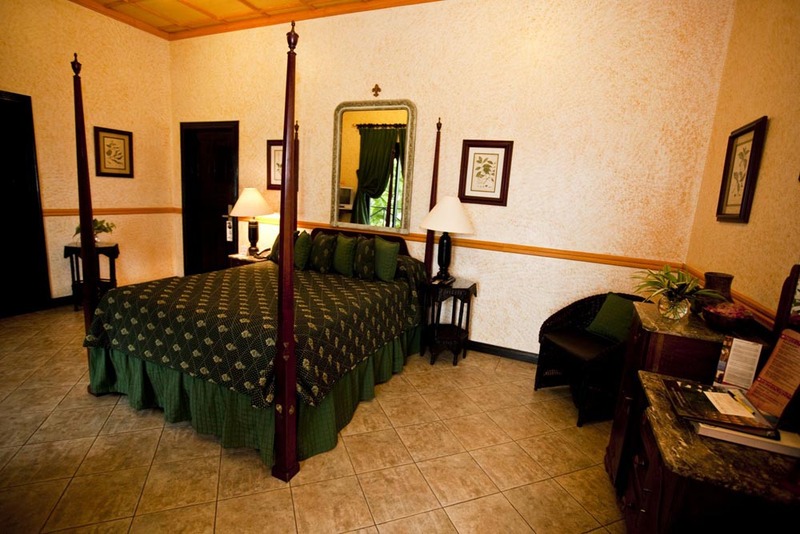 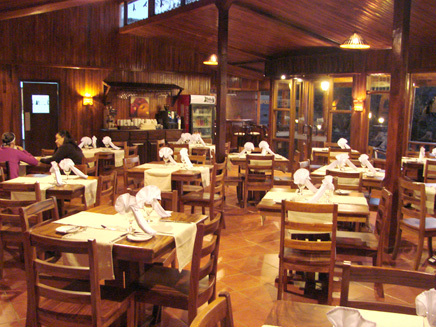 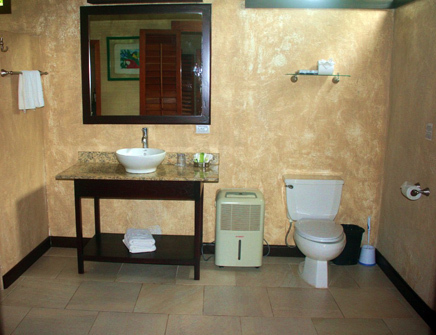 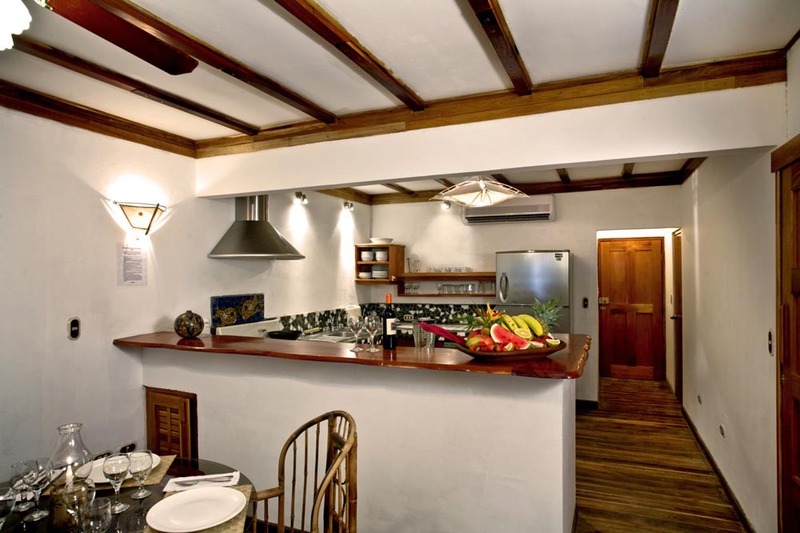 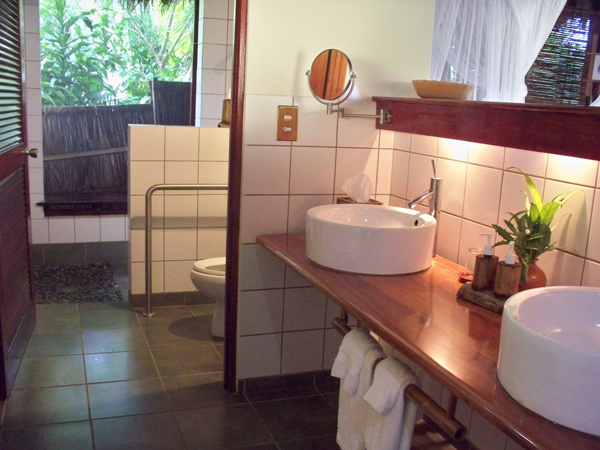 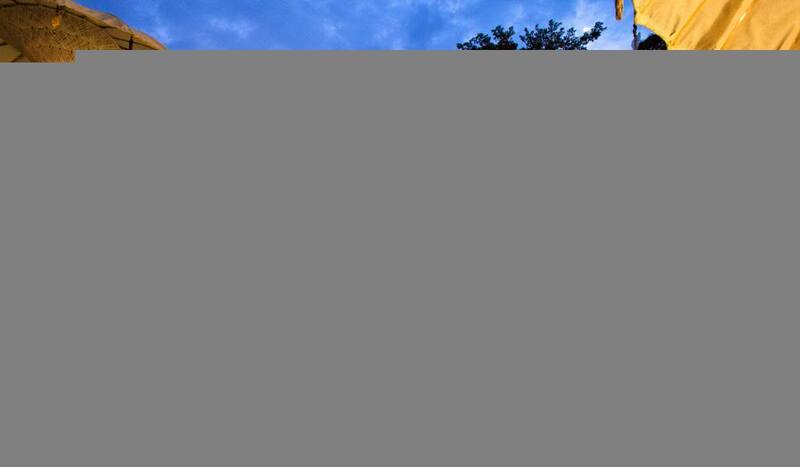 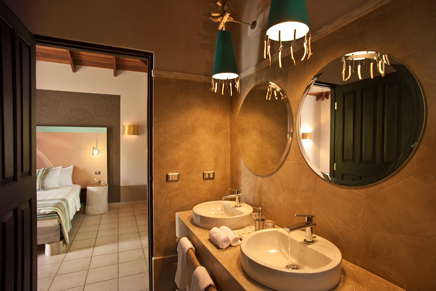 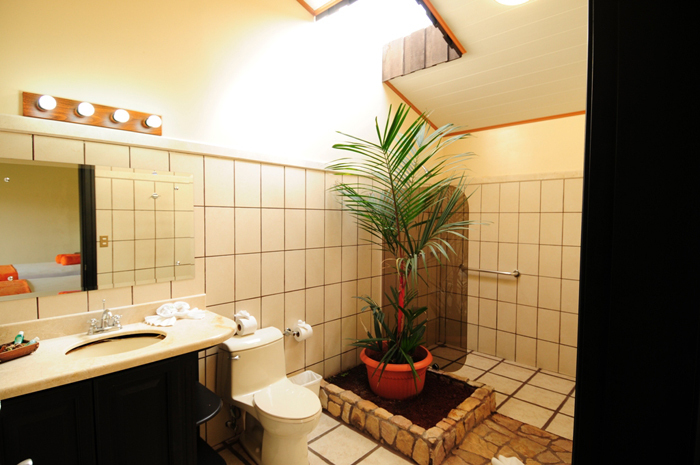 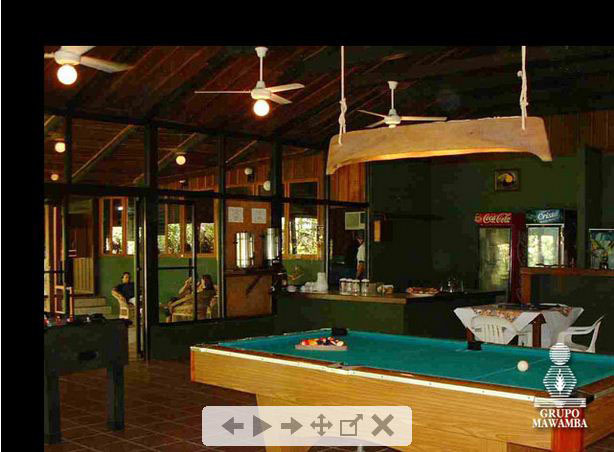 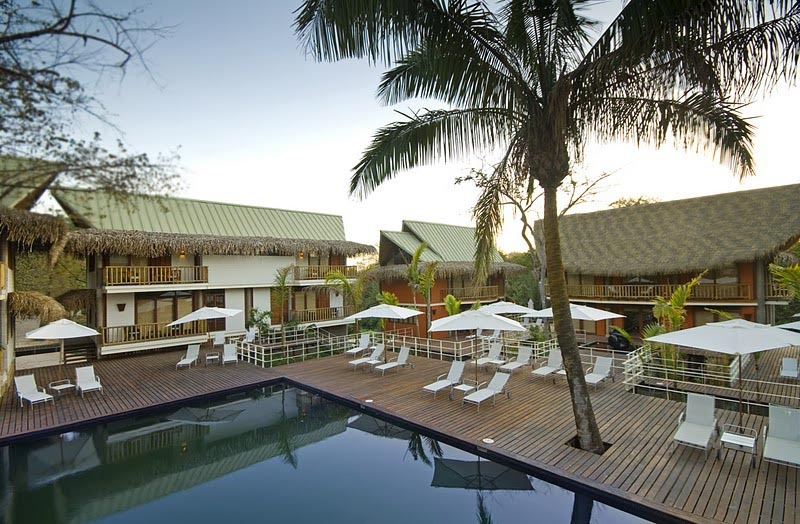 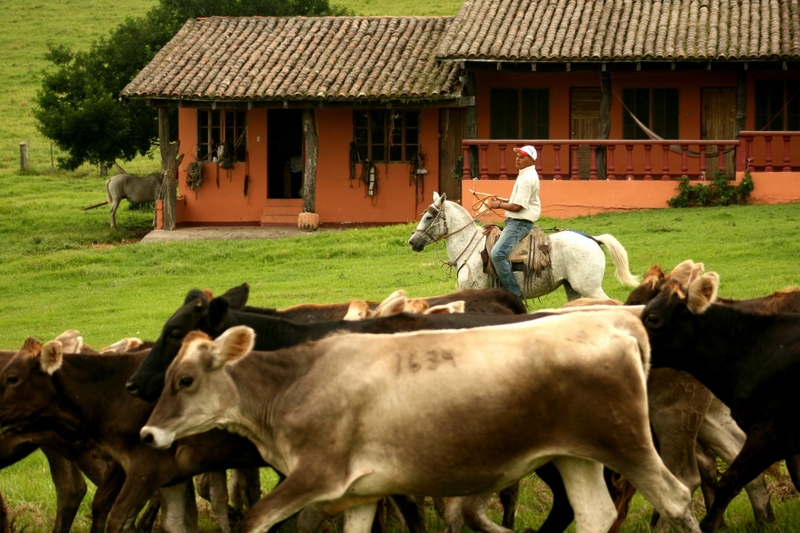 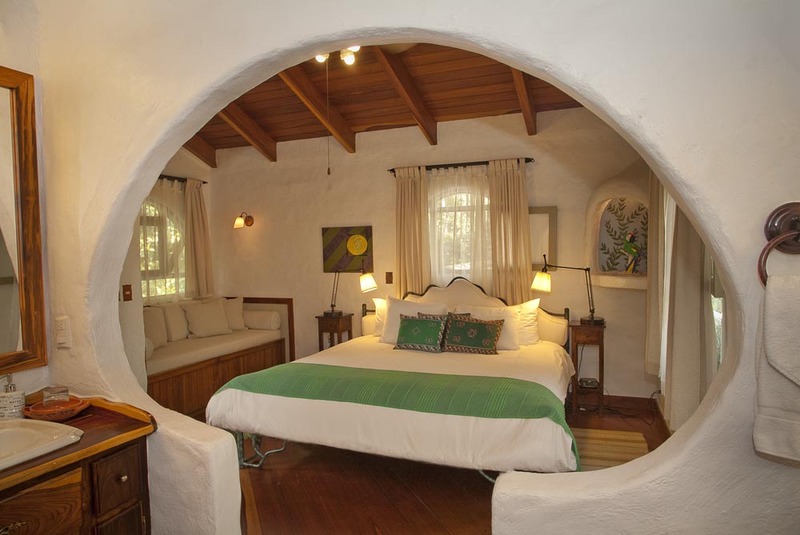 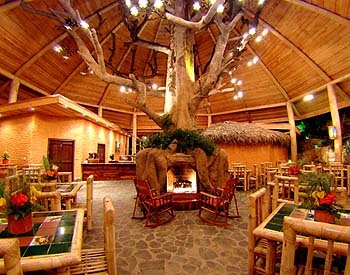 Monteverde Country Lodge is Hotel Poco a Poco´s fully renovated sister property. 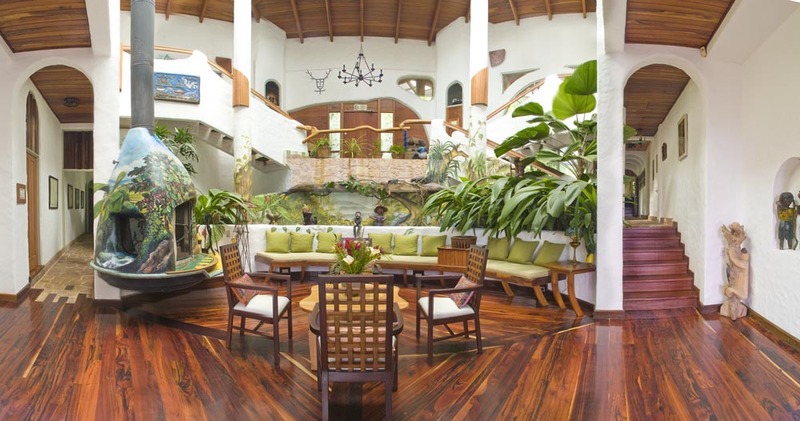 It compresses the philosophy, experience and desire to create a new lodging option where tradition and personalized service are the most appealing features. 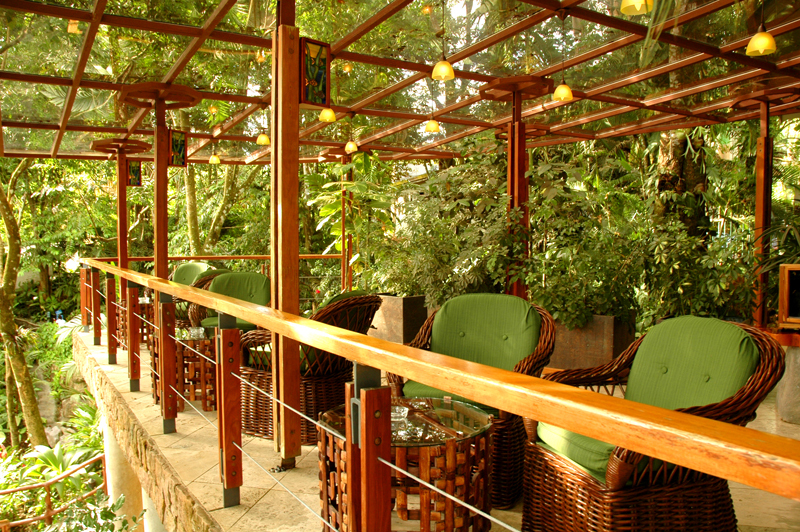 It offers the basic comforts of modern establishments with the rusticity, refinement and concepts of the Monteverde from 20/ 25 years ago. 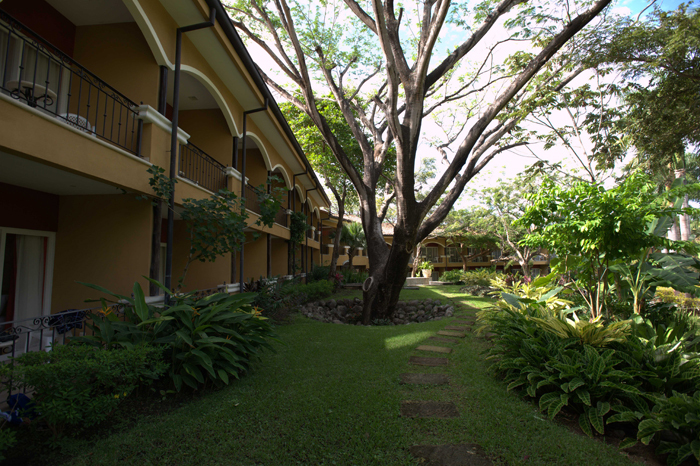 60 wooden, warm and comfortable standard rooms, guarded by front corridors on both, lower and higher levels, surrounding a patio full of fountains and gardens full of colour; provide the ideal location for relaxation and enjoyment. 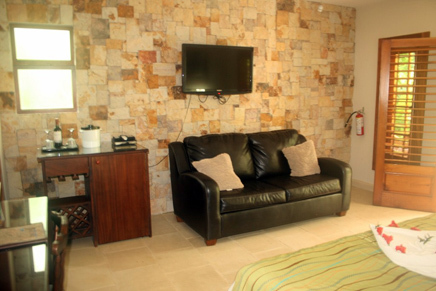 Cable tv, wireless internet access, laptops and a fully equipped meeting room are also available for those who want to stay in touch. 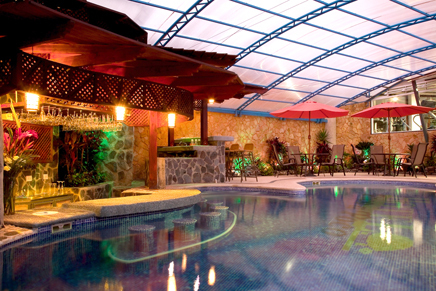 Guests have access to the temperate water indoor pool as well as the new Nova Piel Spa at Poco a Poco. 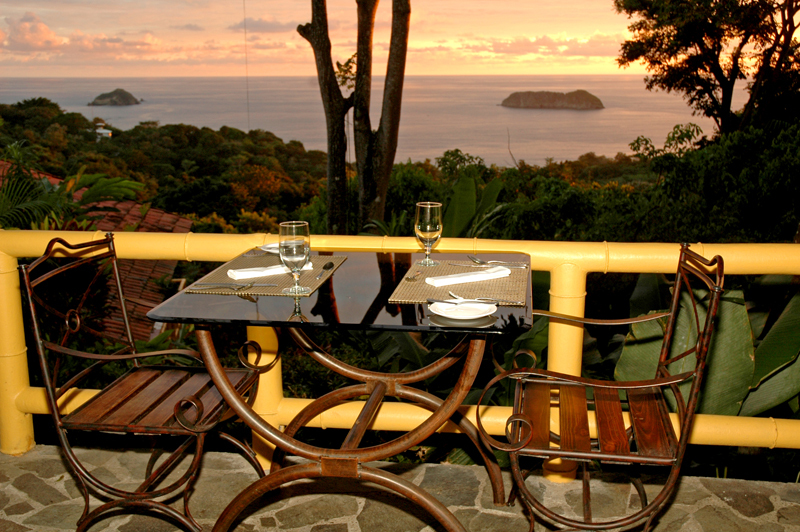 Uncover one of the best-kept secrets in Costa Rica. 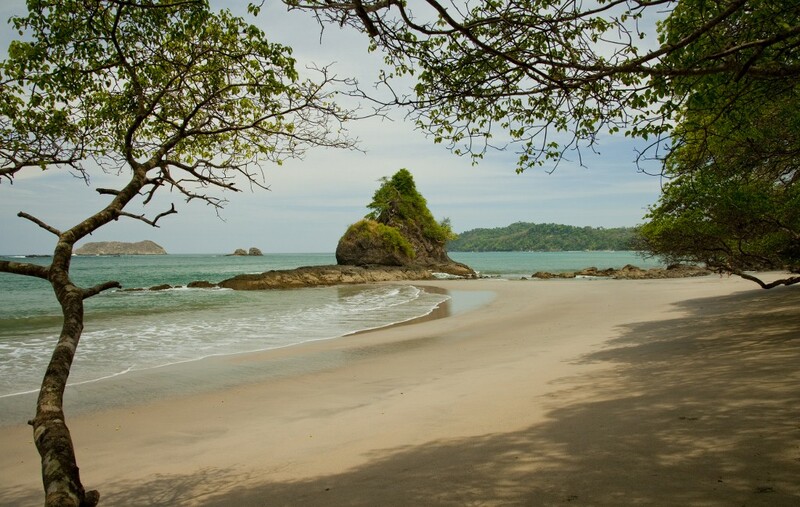 Offering long stretches of white beach, driving surf, picture-perfect sunsets and surprisingly few tourists, Nicoya is actually one of the oldest settlements in Costa Rica. 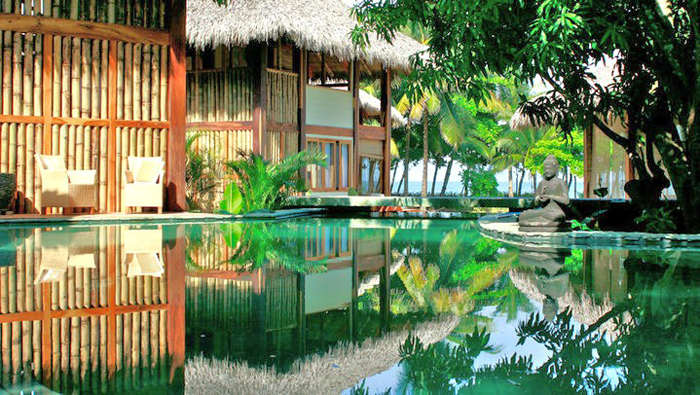 Experience something unique – from funky creative beach hotels to remarkably luxurious villas, there is something for even the most discerning traveler. 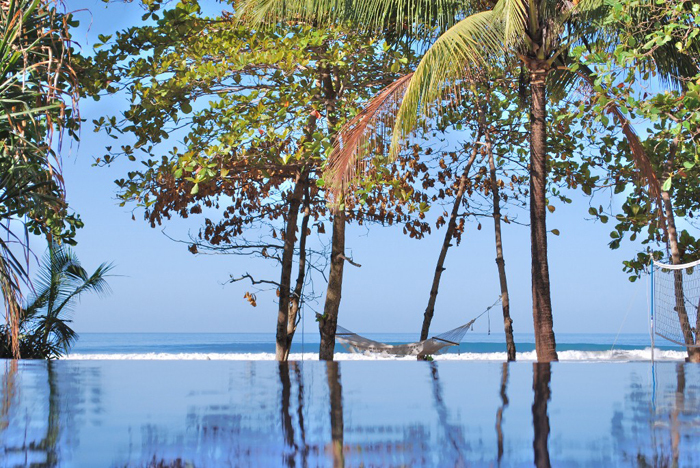 Pranamar Villas and Yoga Retreat, an intimate, consciously designed oceanfront hotel recently built on the spectacular beach of Playa Santa Teresa, offers guests tropical beauty and nature in an exotic and friendly ambience. 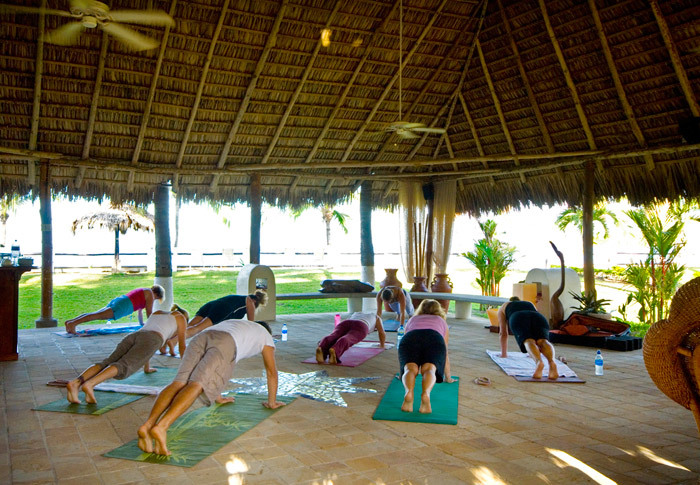 Along with world-class surfing and our top-quality yoga classes, numerous activities and adventures await you. 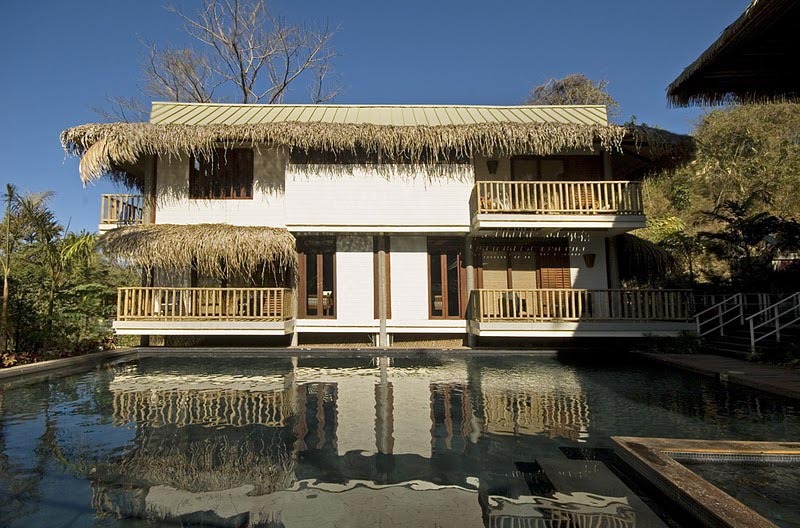 The commitment of building Pranamar with as little negative impact on the land as possible, the owners have chosen to build a chemical-free, saltwater swimming pool. 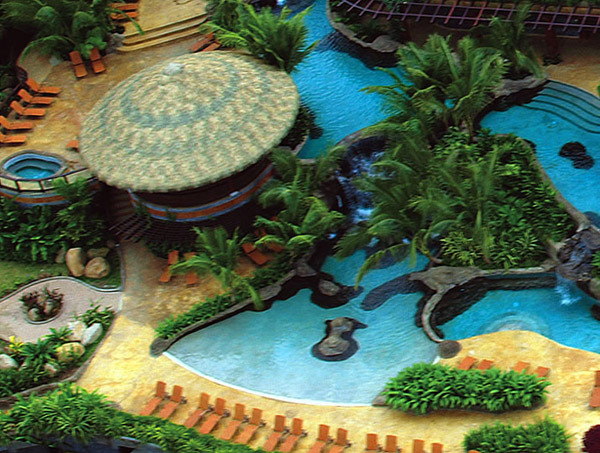 This picturesque, free-form pool is the center piece of the hotel and offers guests a refreshing place to sunbathe or cool off with a cocktail or smoothie. 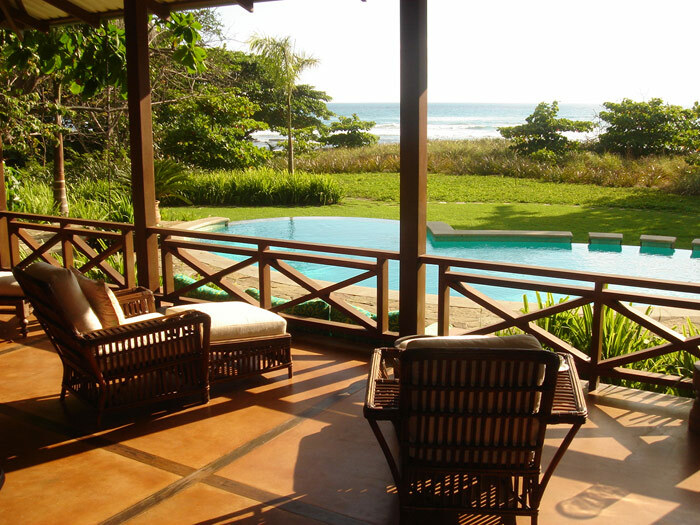 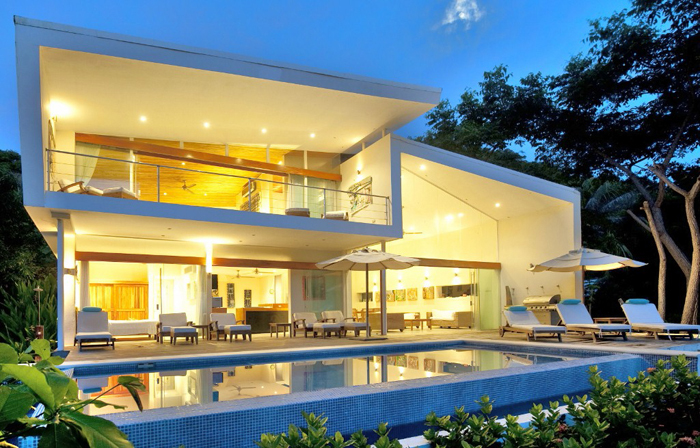 The White House is the architectural jewel of the Pacific coast located beachfront on Playa Hermosa, just a little north of Santa Teresa in the Mal Pais Area, in Puntarenas, Costa Rica. 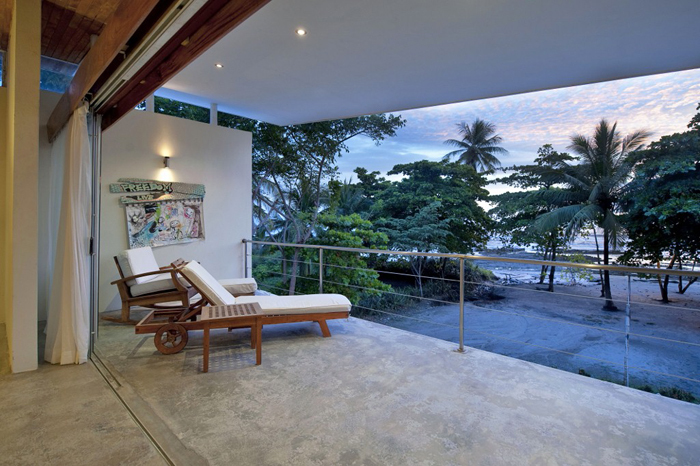 The signature home, is an architectural masterpiece directly on Playa Hermosa, built 50 yards from the high tide line (the absolute closest we could legally). 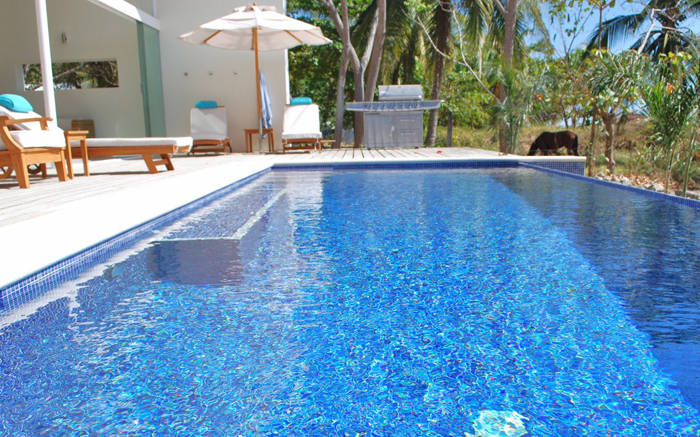 The White House has a private infinity pool. 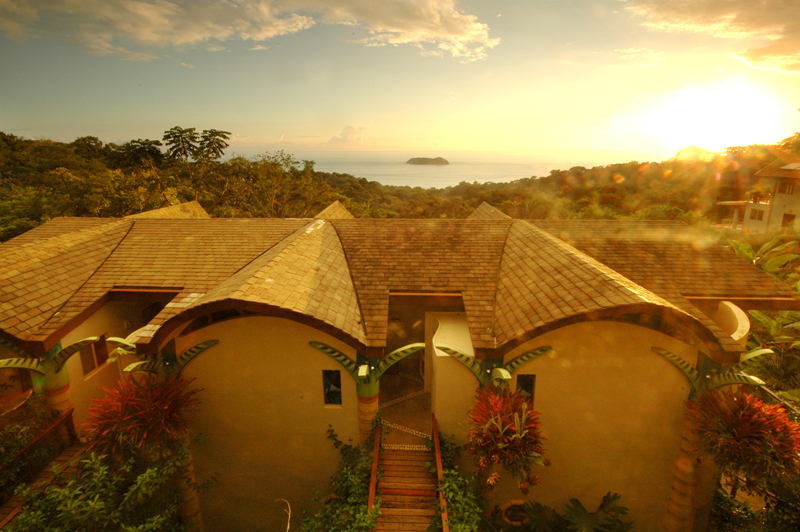 The property directly next door is the newly built Pranamar, the newest and most exclusive yoga resort in Costa Rica which opened in June of 2010. 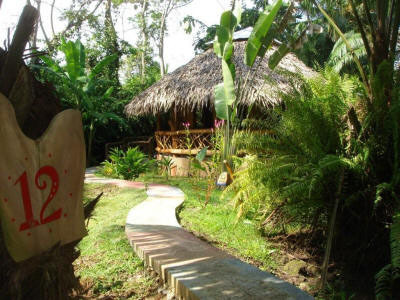 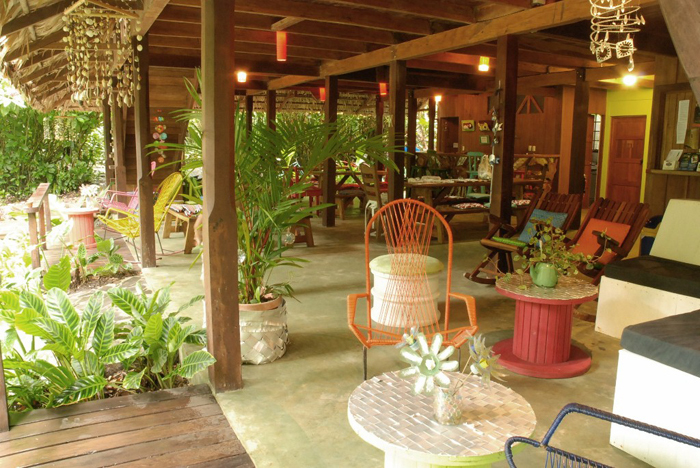 The yoga resort was built and is currently managed by the people that created the famous hotel Flor Blanca (which is 10 minutes down the road). 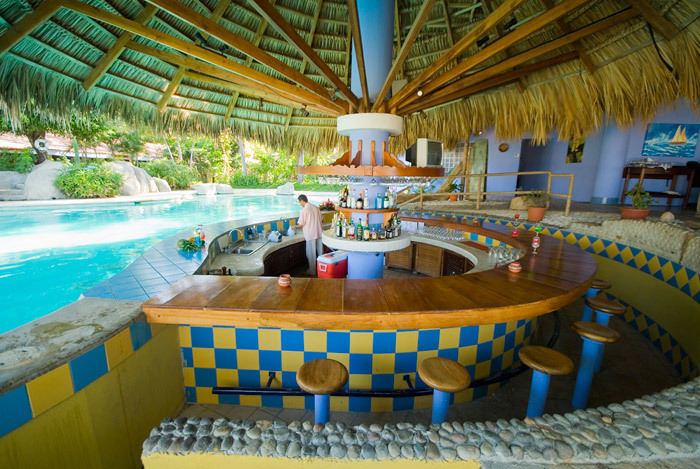 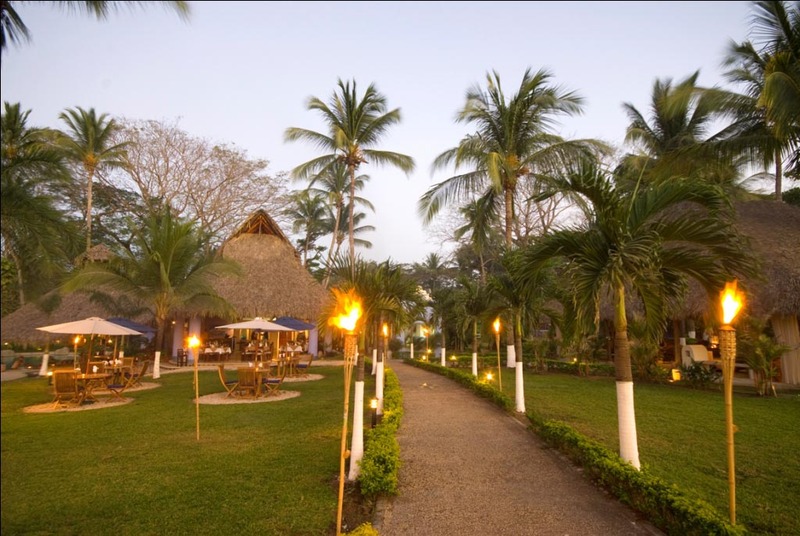 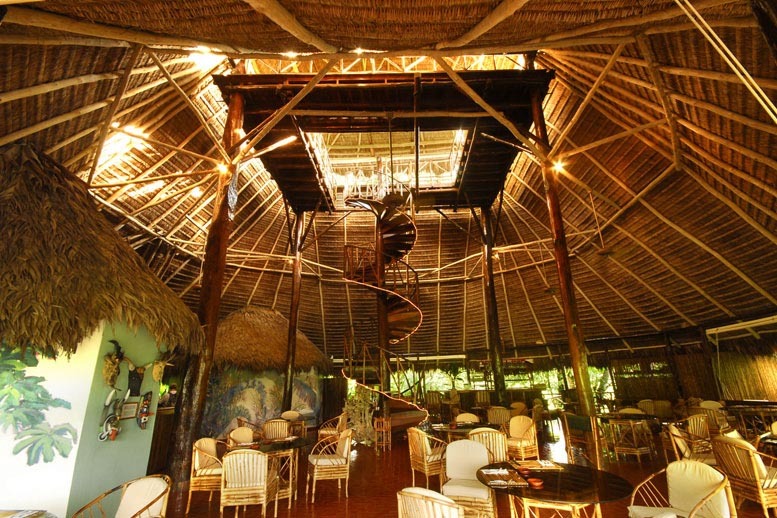 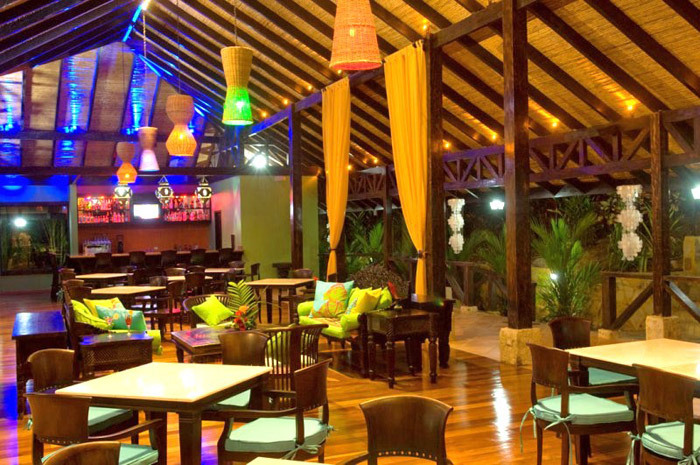 A cozy hotel, restaurant and spa located right on the beach in Santa Teresa, Mal Pais, the Hotel Tropico Latino offers something for everyone. 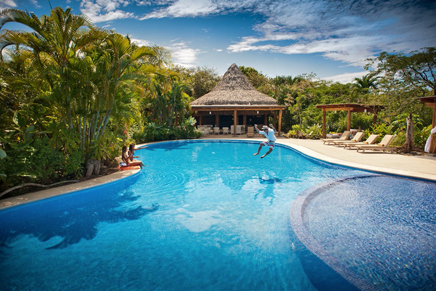 From family packages, adventures and surfing packages, to Honeymoons and wedding service, this hotel gives the energetic traveler something to do every moment of the day. 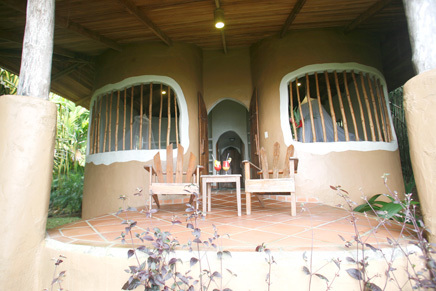 At Playa Guiones in beautiful Nosara a nature lover’s community awaits you offering a delightful environment in balance with the creative energies of nature. 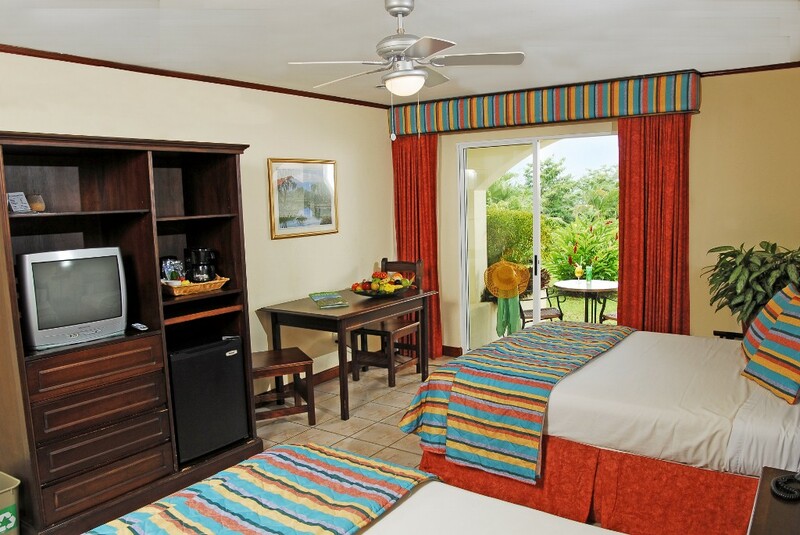 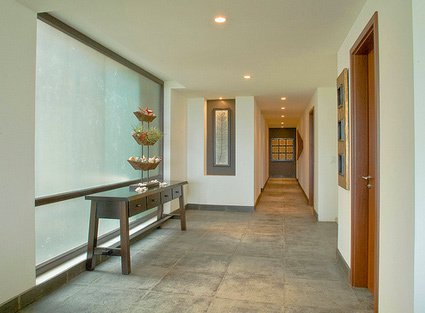 Feel yourself unwind when doing something as simple as walking to your suite. 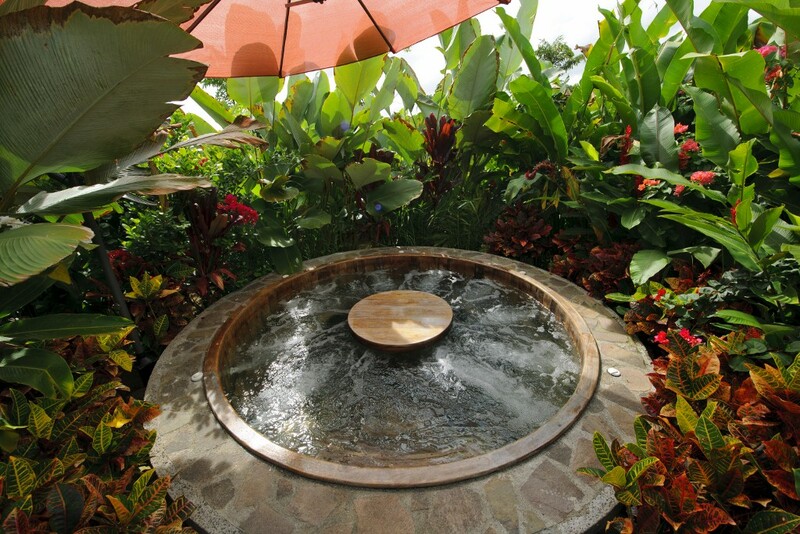 Is it the fragrance of exotic plants and flowers, the sight of beautiful birds, the sound of water, or a combination of it all that accounts for your new state of mind? 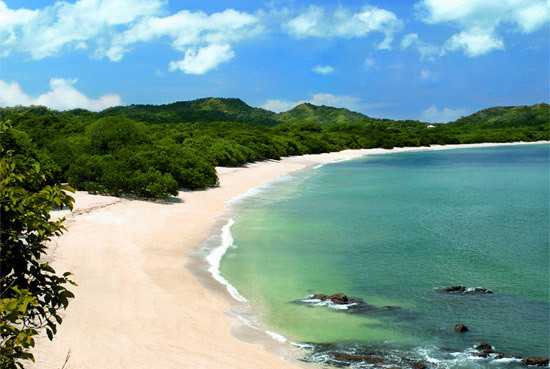 Here a one kilometer walk rewards you with a fine white sand beach. 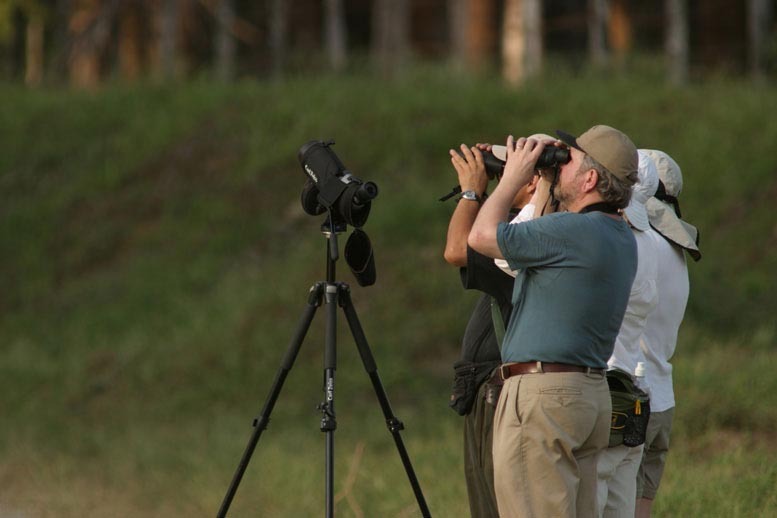 Take a short drive to Ostional National Wildlife Refuge where 3 species of turtles lay their eggs. 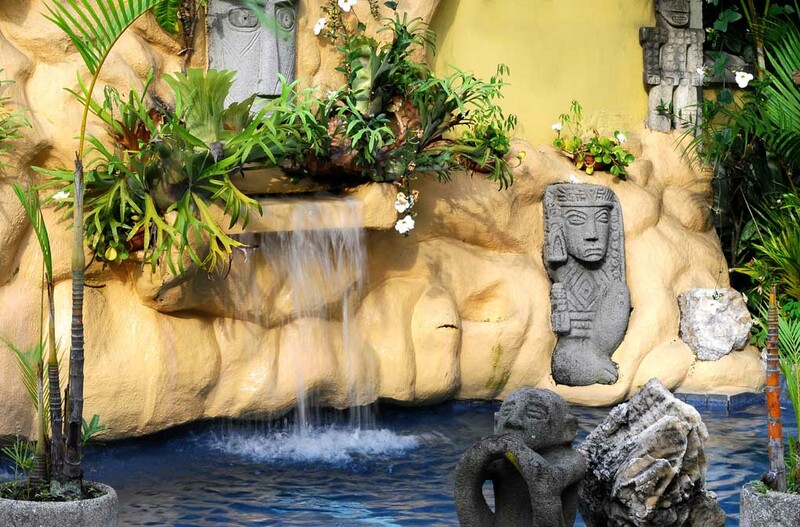 The Hotel shows a very authentic architectonic ¨Bali Style¨, which harmonizes with an exclusive decoration representing the fusion of diverse ethnic elements from around the world, creating a high end and comfortable atmosphere for enjoying the tropics. 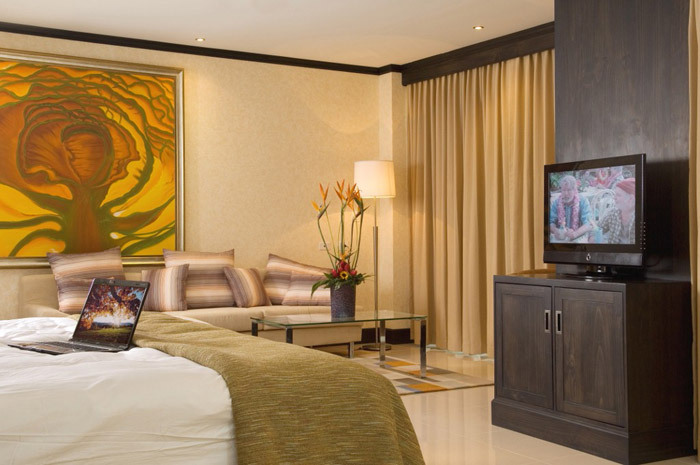 All spaces of the hotel will surprise the guests with carefully chosen art masterpieces, belonging to a private collection. 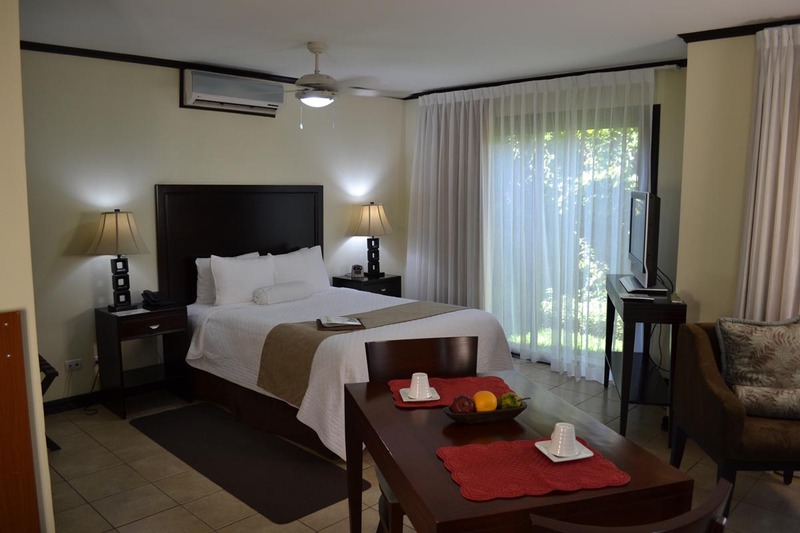 Services Include: 35 rooms, Air-conditioning, Mini-bar, Satellite TV, LCD screens, In-room safe, Hair dryer, Coffee maker, Restaurant, Bar, Swimming pools including a kiddies pool, Jacuzzi, Wireless Internet access. 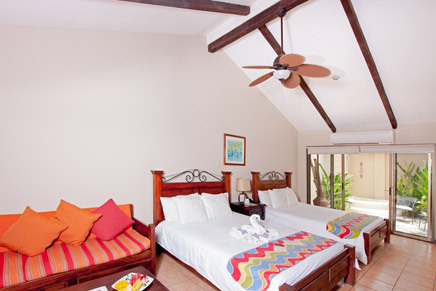 Staying at the intimate 5 casita Latitude 10 Resort is like staying with good friends at their luxury beach house, with five star personalized service and attention to every detail in a relaxed, yet classy atmosphere, with 24 hours Front Desk available in case you need anything. 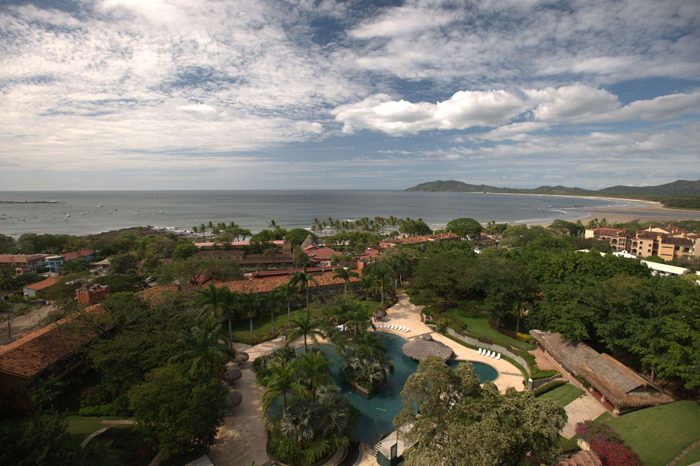 Don’t miss out on the famous Santa Teresa surf break, horseback riding excursions, tropical canopy tours, boat and fishing excursions or just a leisurely stroll along one of Costa Rica’s most beautiful white sand beaches where the lush vegetation of the rainforest melts into the Pacific Ocean. 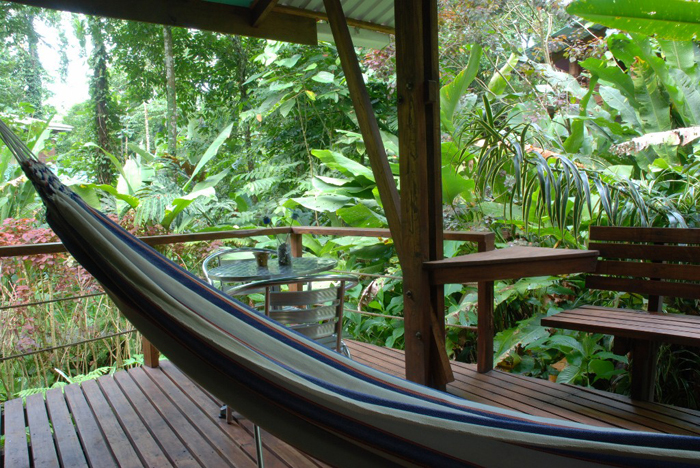 Imagine yourself in a pristine rainforest declared one of the most biologically intense places on earth by the National Geographic magazine. 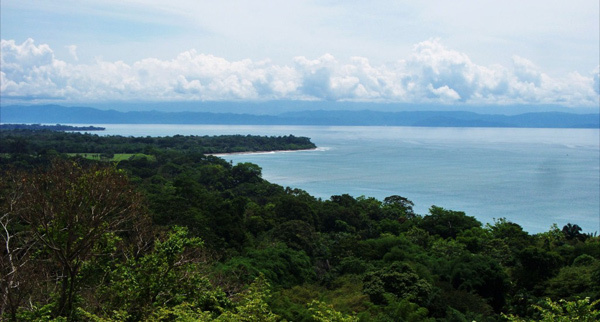 Whether you are looking for a guide for hiking in the rainforest, whale and dolphin watching tours, a beach to lie on or a dip in the pool you can find it on the Osa Peninsula. 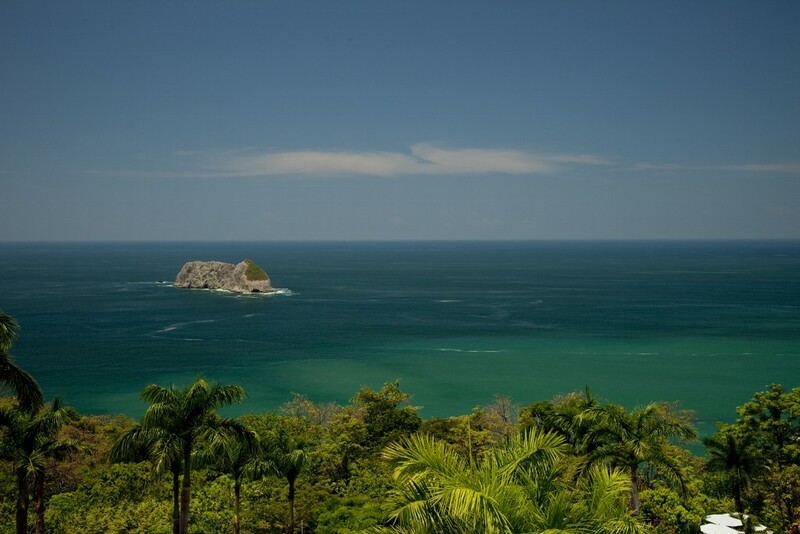 The southern most peninsula in Costa Rica, the Osa Peninsula is a secluded nature wonderland, playing home to many of the country’s rare and endangered animal and bird species including the puma, jaguar, Harpy Eagle and Scarlet Macaw. 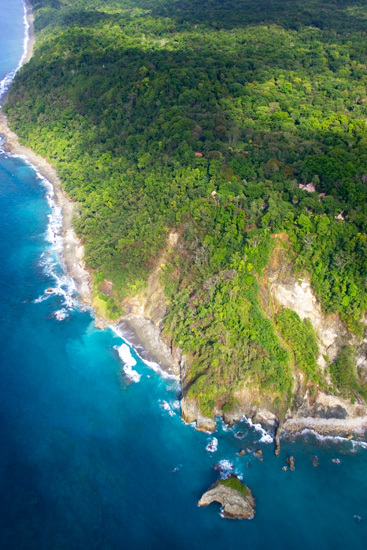 With a large chunk of the peninsula forming the Corcovado National Park, this area has the single largest expanse of a lowland tropical rainforest in Central America and is one of the tallest rainforests in the world. 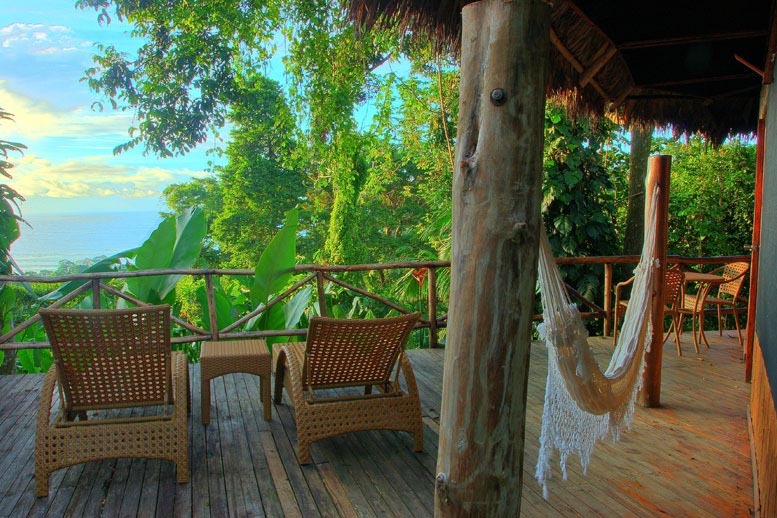 Set in a private nature reserve spread over 1,000 acres of Central America’s last remaining lowland tropical rainforest in Costa Rica, Lapa Rios Ecolodge overlooks the pristine point where the Golfo Dulce meets the wild Pacific Ocean, a destination matching everyone’s idea of paradise. 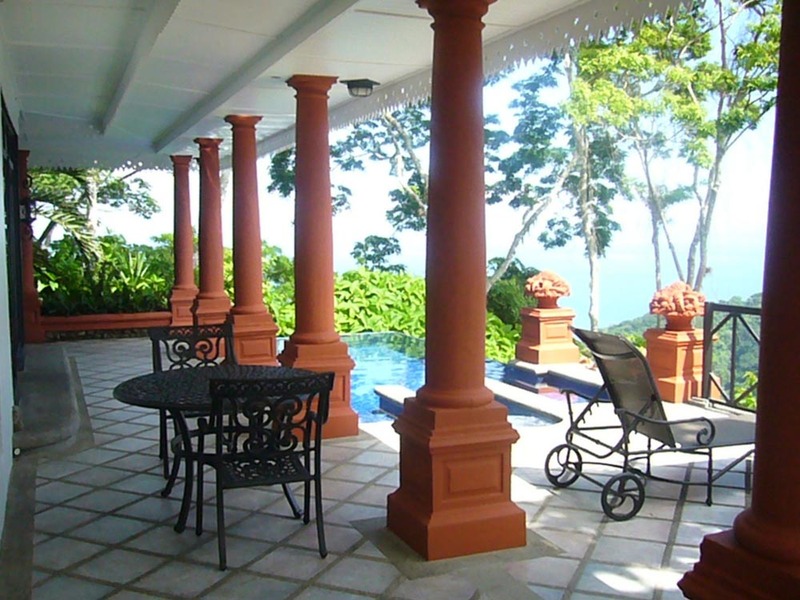 The main lodge and bungalows, built over 350 feet above the sea, line three ridges and are connected by walking paths and steps. 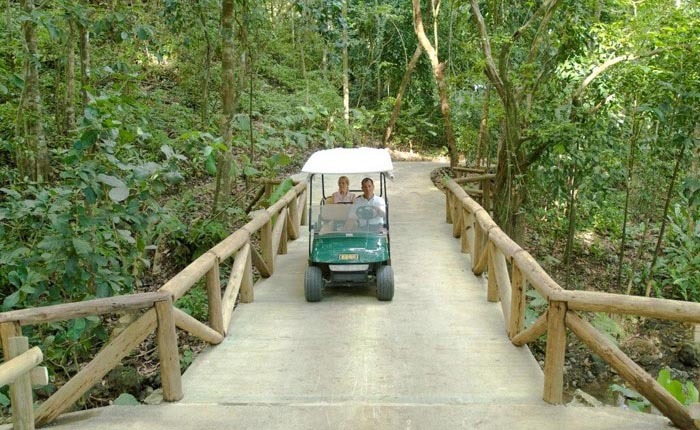 Lapa Rios is an ideal vacation for people who enjoy adventure in nature and want to be a part of conservation and local culture (often called Geotourism). 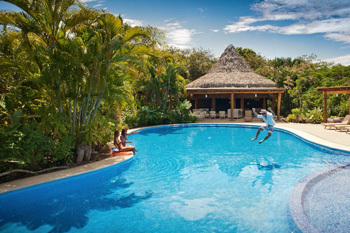 The majority of guests are active couples, honeymooners and families (children over 6 years) looking for a more active and uniquely personal experience. 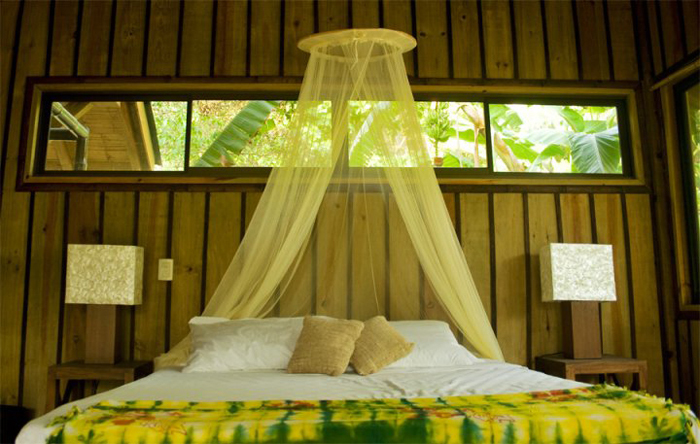 Bosque del Cabo is a premier Costa Rica Eco Lodge offering a romantic rainforest getaway and a naturalist’s dream come true. 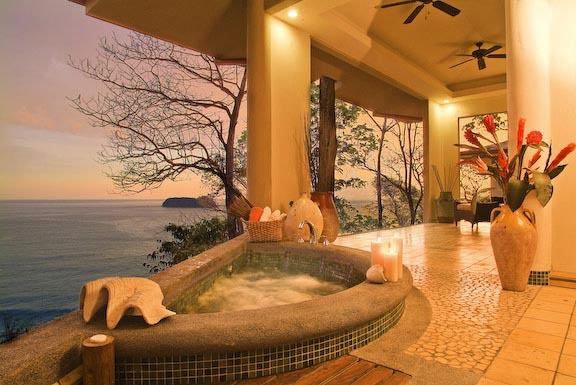 Located in a unique and fortunate position at the very tip of the Osa Peninsula in the southern Pacific region of Costa Rica, this 750+ acre forest reserve features private, spacious bungalows and gorgeous houses perched atop the cliffs of Cabo Matapalo. 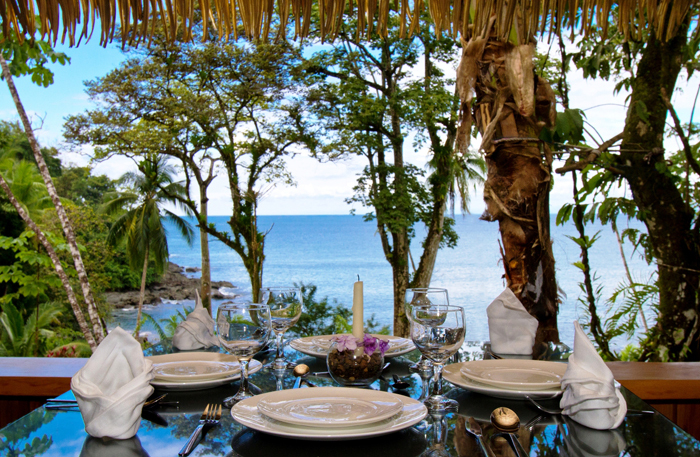 Copa De Arbol Beach and Rainforest Resort is a remote, eco-conscious beachfront resort set among 70 acres of pristine rainforest reserve. 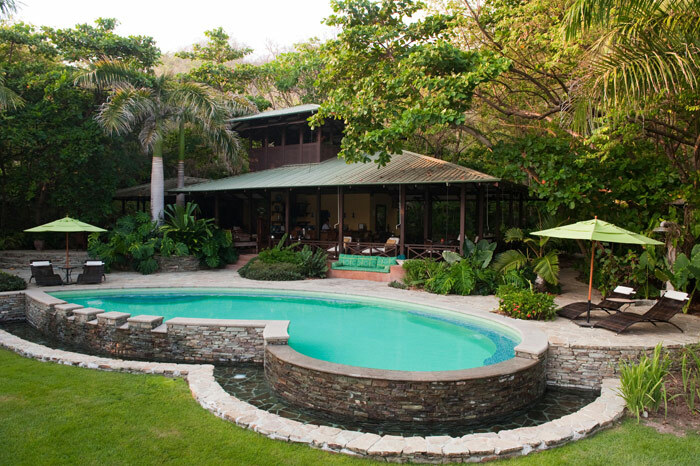 We are located in Southern Pacific Costa Rica on the Osa Peninsula, perfectly situated between Drake Bay and the Corcovado National Park in an area known as “Caletas” (small coves). 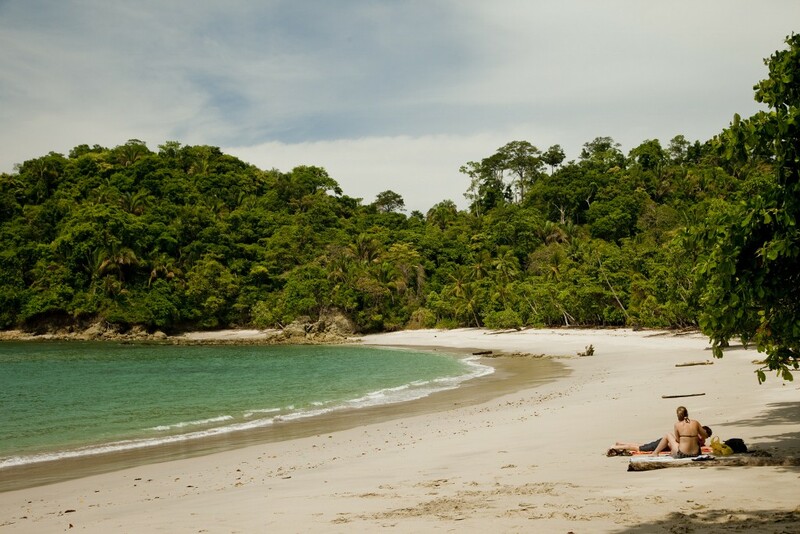 This area of the Osa Peninsula is accessible by boat only and is one of the most remote and untouched places on Costa Rica’s entire Pacific coastline. 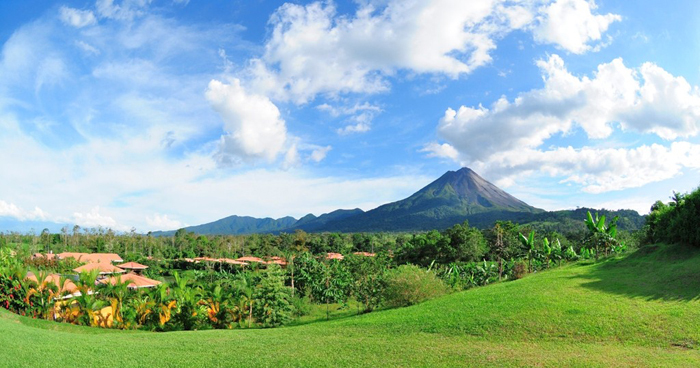 Start and end your Costa Rica experience here. 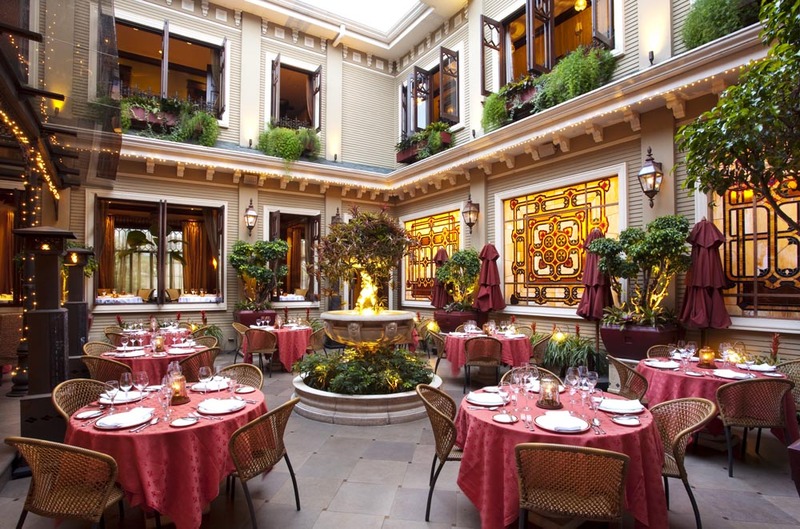 Nestled in a picturesque valley between majestic mountains, the San Jose and Central Valley region has a number of intriguing places to explore. 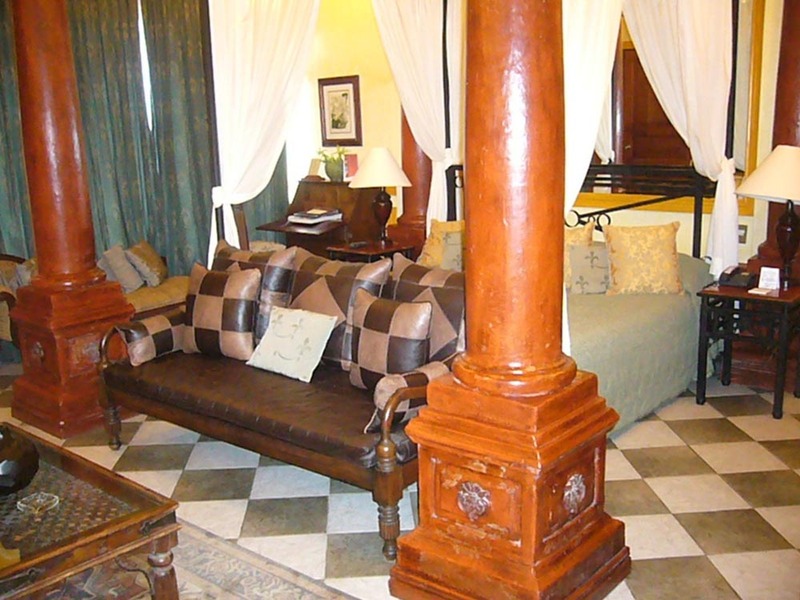 A day tour of the capital city reveals museums, a grand theatre and the lively Central Market. 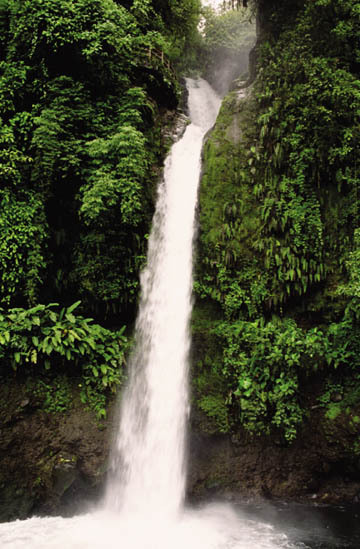 This diverse region offers waterfalls, coffee plantations, the artisan village of Sarchi, and the Poas Volcano. 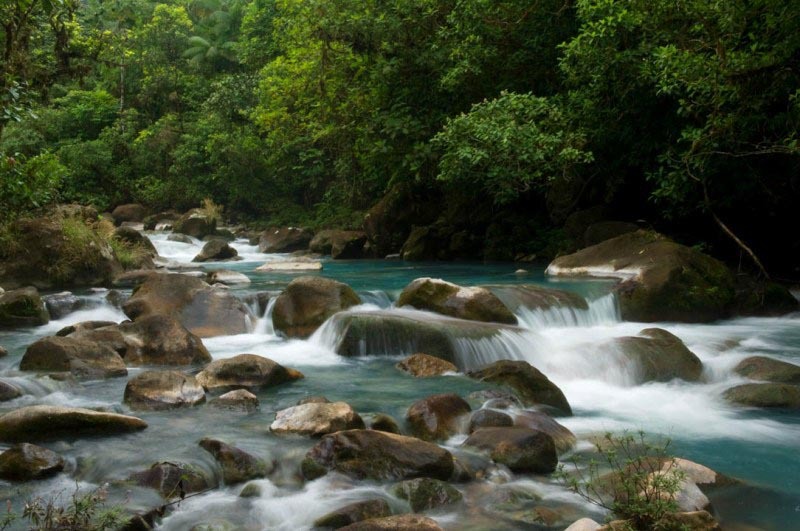 If adventure is more to your liking, white water rafting is a must. 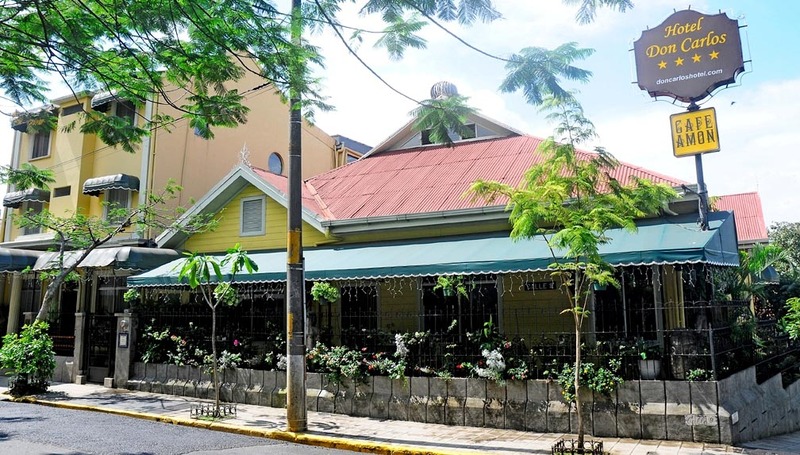 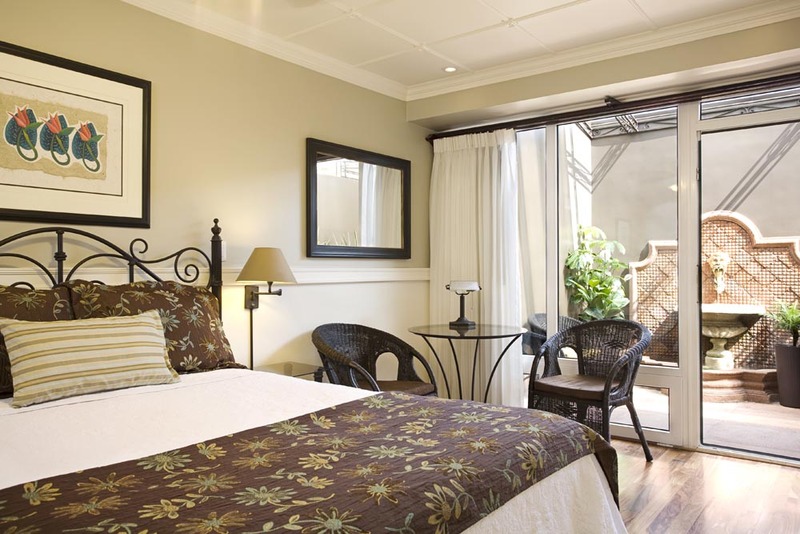 Situated on a shady street just off Paseo Colon, San Jose’s main thoroughfare, Hotel Grano de Oro is a true oasis, a sanctuary in the heart of the city. 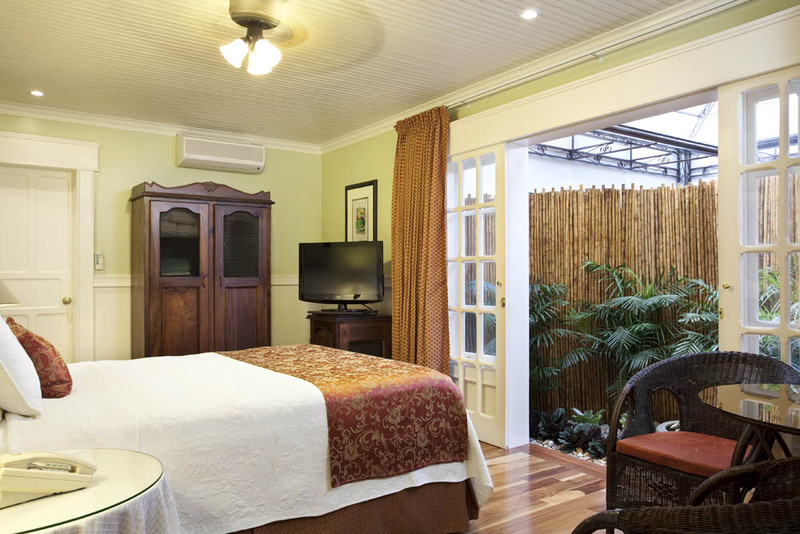 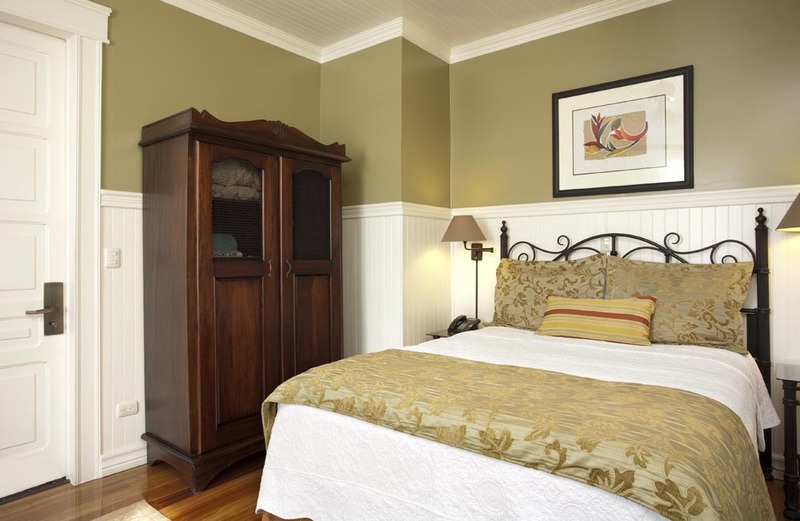 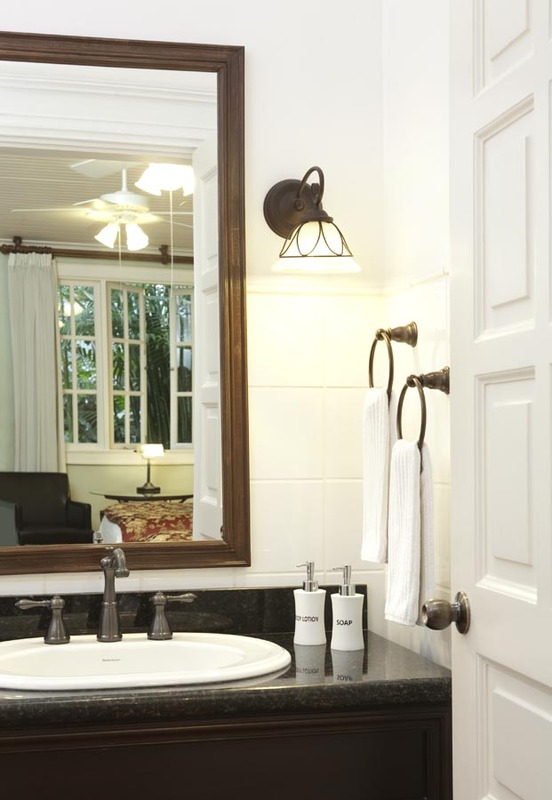 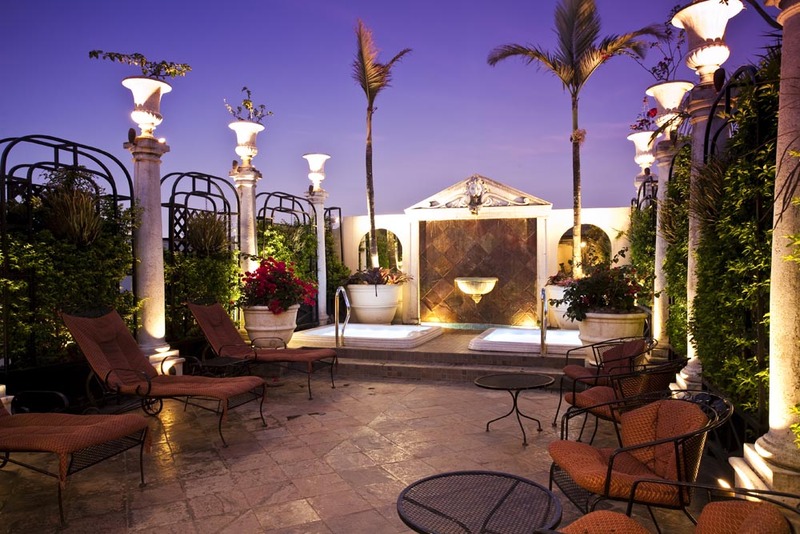 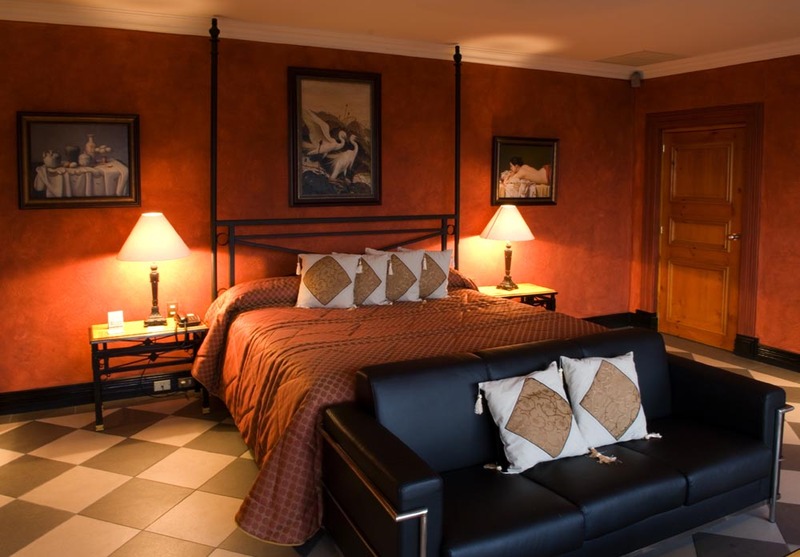 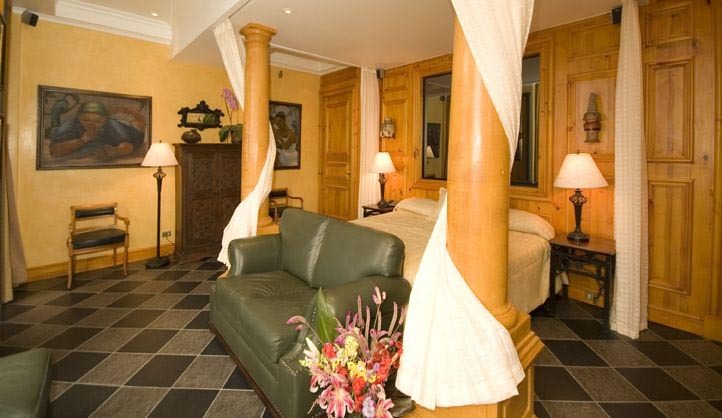 Converted from a Tropical Victorian mansion, the 40-room hotel maintains the warmth and comfort of a private home. 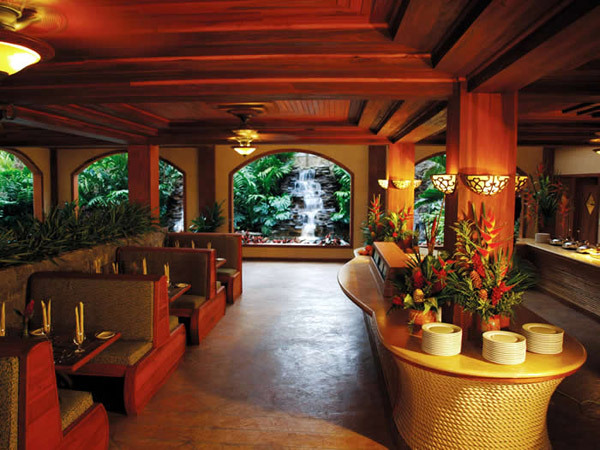 Hallways lined with period photographs and original art meander through the building and present lush tropical flower arrangements and luxurious plants at every turn. 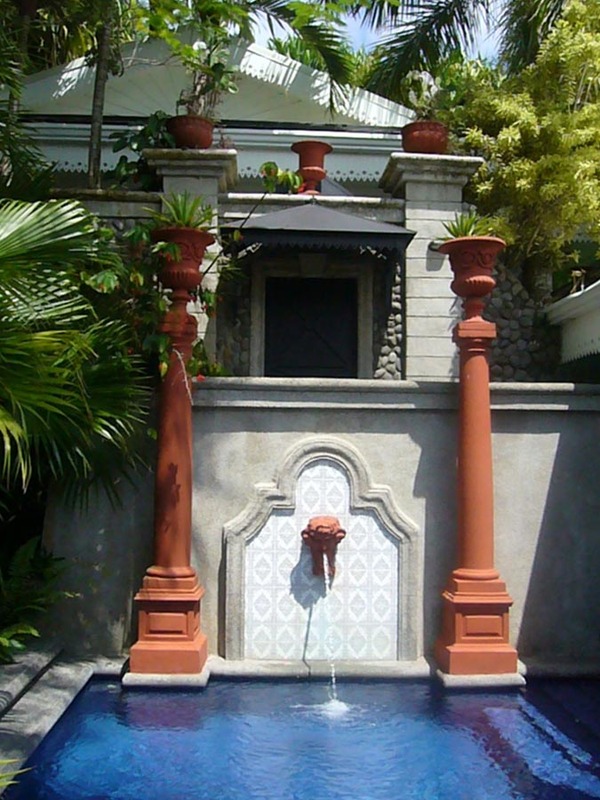 Spanish tile fountains grace intimate atriums, ensuring that one is never far from the soothing melody of falling water. 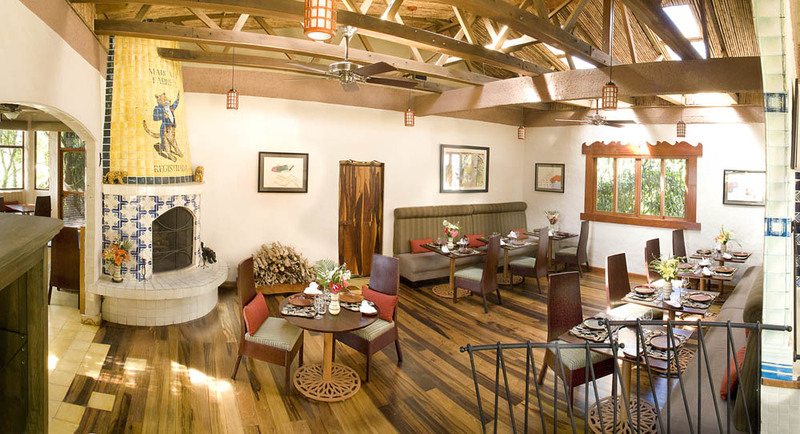 The onsite restaurant has evolved into one of San Jose’s finest dining establishments, frequented by locals and tourists alike. 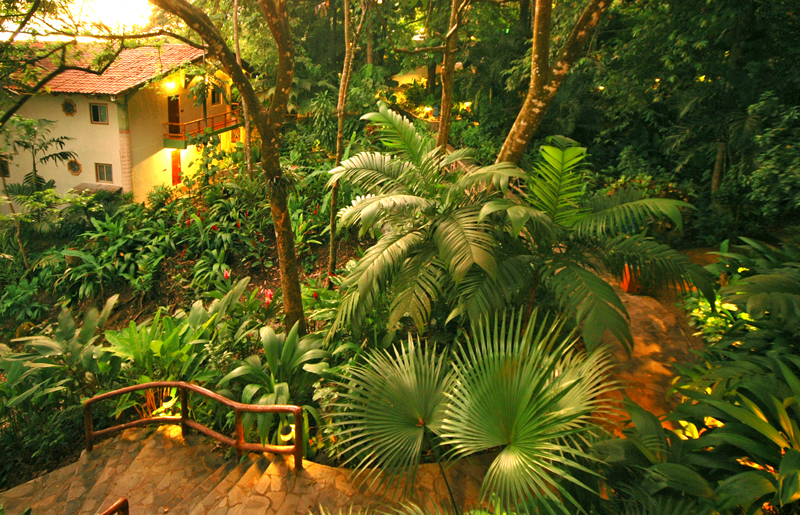 A truly unique mountain lodge the Peace Lodge is located on the grounds of the La Paz Waterfall Gardens Nature Park. 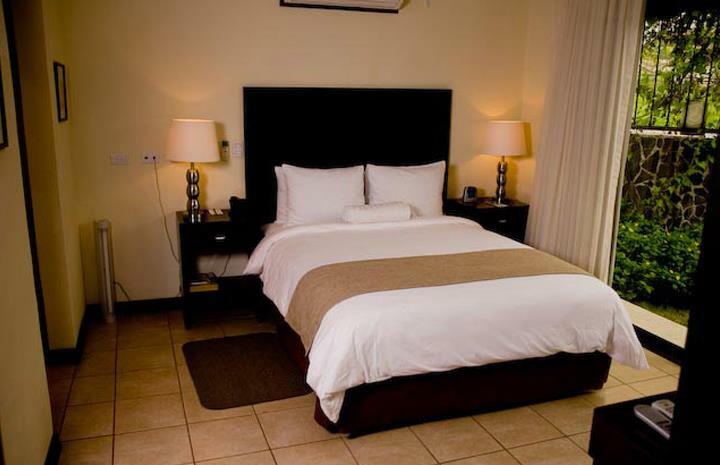 With the San José International Airport just an hour away you do not need to spend any extra time in the city. 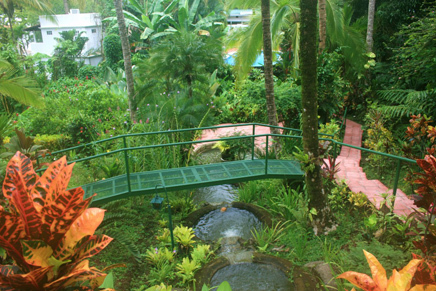 Imagine a rain and cloud forest just outside of the city. 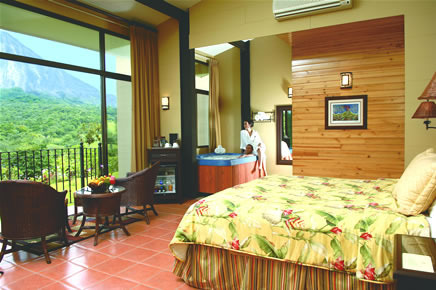 The accommodations are upscale but are uniquely themed to complement the inherent beauty of its rain and cloud forest setting and the detailed architecture exudes a natural elegance and sophistication with every room boasting a Jacuzzi tub and stone fireplace along with showers that transform into waterfalls with the turn of a knob. 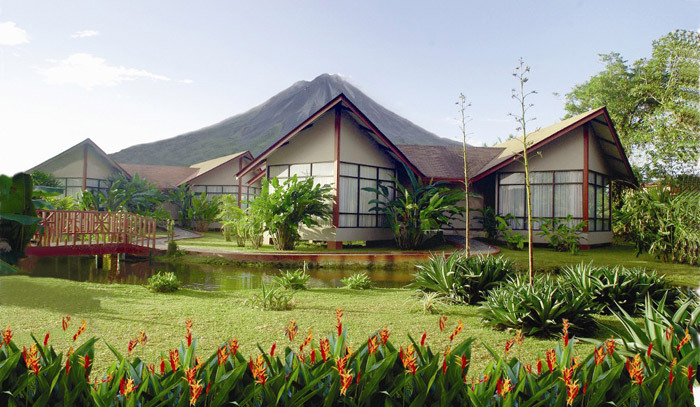 Picture perfect views of the La Paz River Valley and the towering Poás Volcano complete the experience. 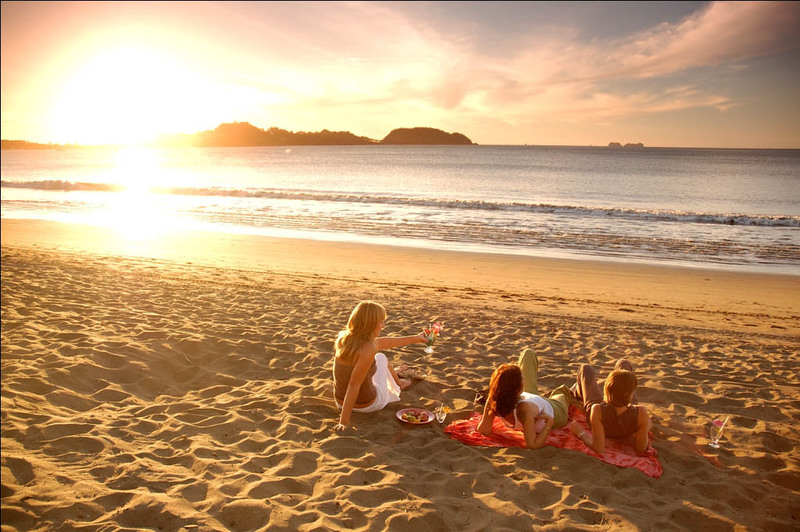 Being this close to an airport never felt so good. 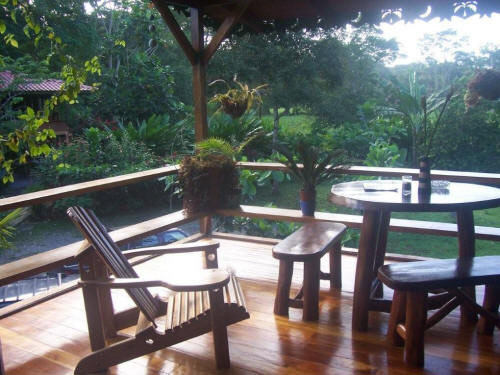 Finca Rosa Blanca Coffee Plantation and Inn is an organic shade grown coffee plantation with a world class 13 room Inn located in the middle of lush colorful gardens framed by awe inspiring views of the Central Valley below. 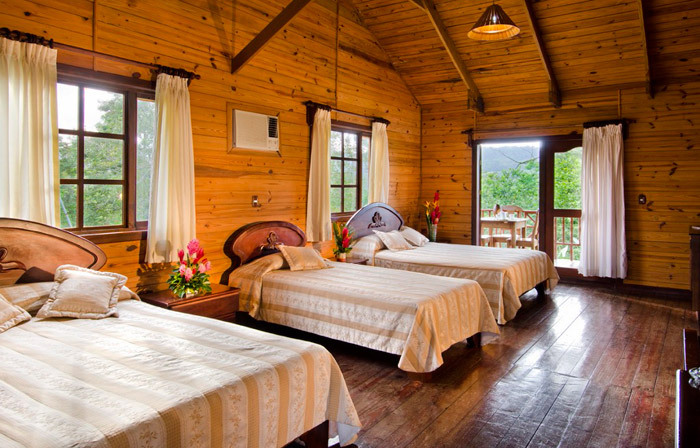 The recipient of numerous awards and accolades for its extraordinary quality and as a global leader in responsible tourism, Finca Rosa Blanca Coffee Plantation and Inn is the perfect choice for discerning and knowledgeable travelers who want to combine luxury with certified sustainability. 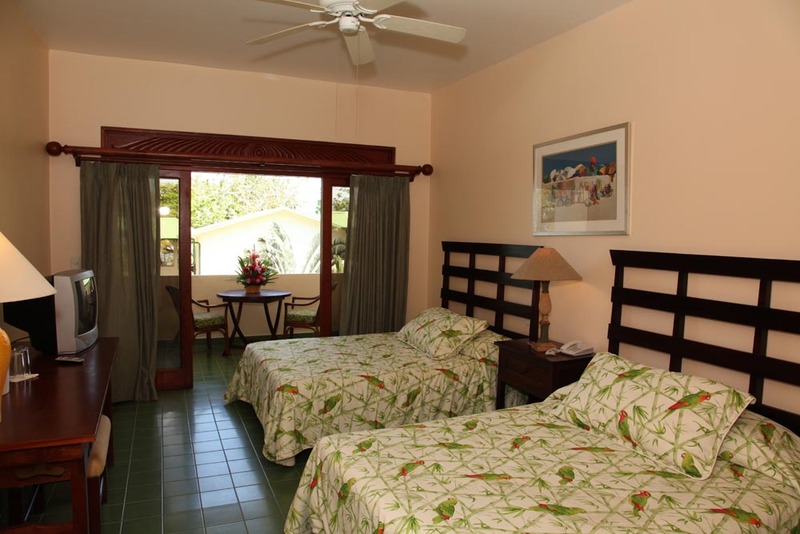 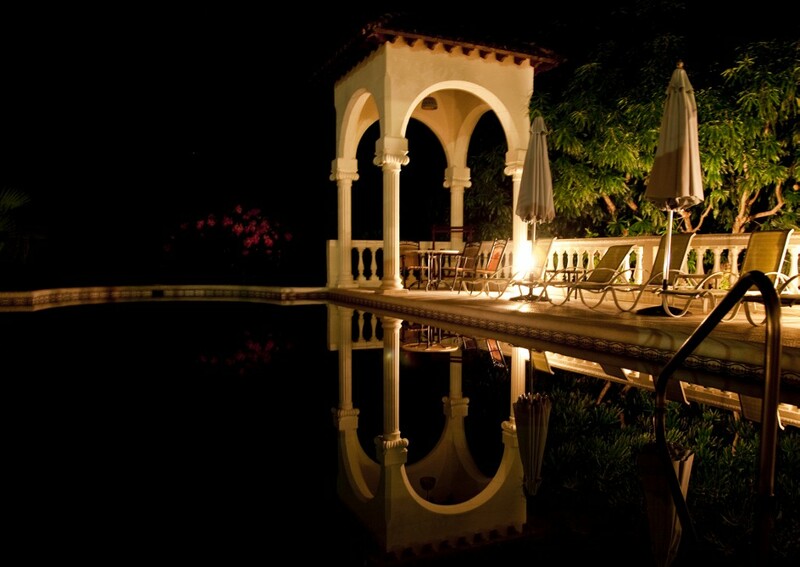 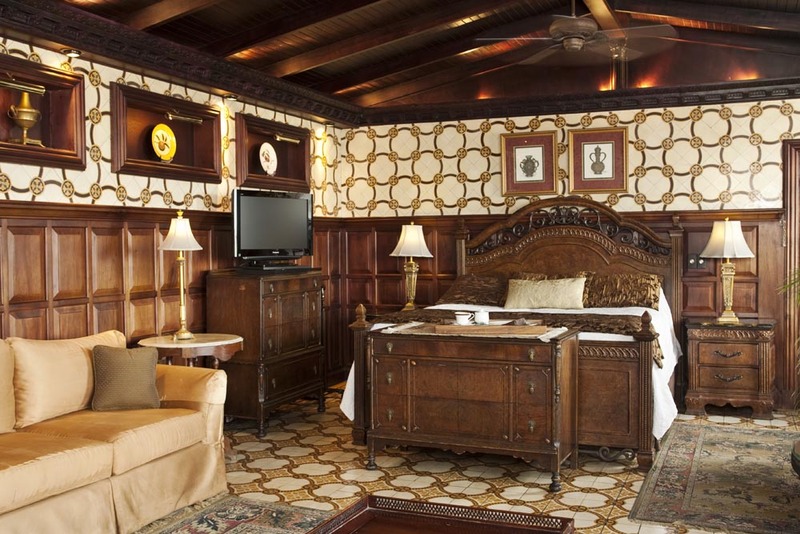 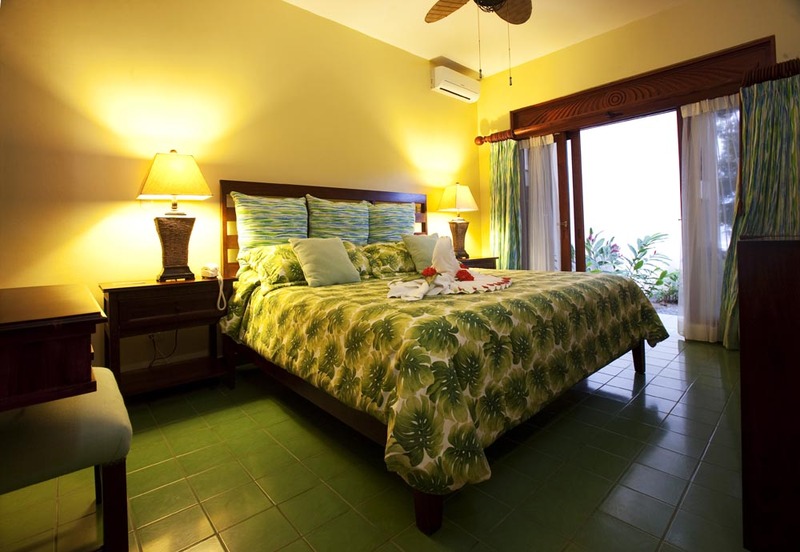 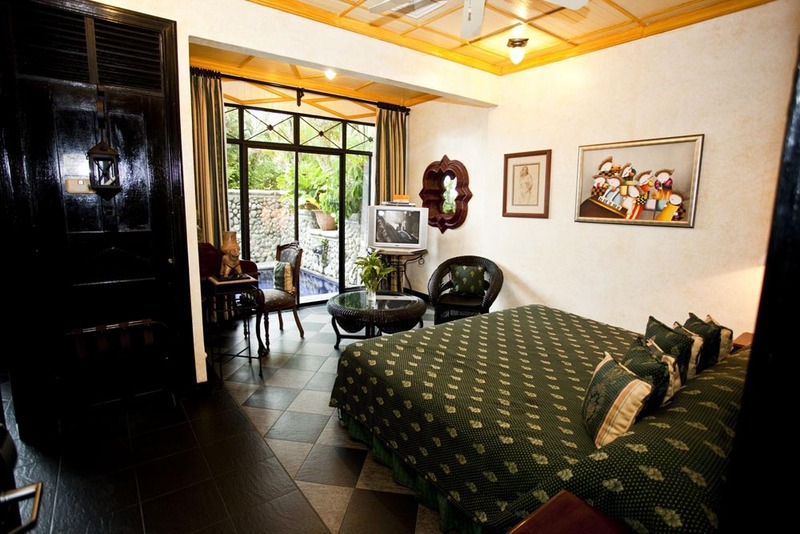 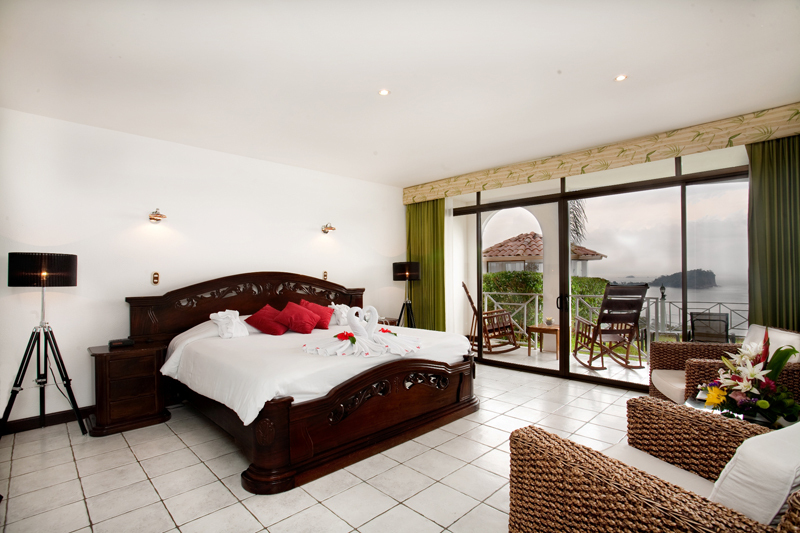 Villas Los Candiles Hotel is known for its beautiful Victorian style. 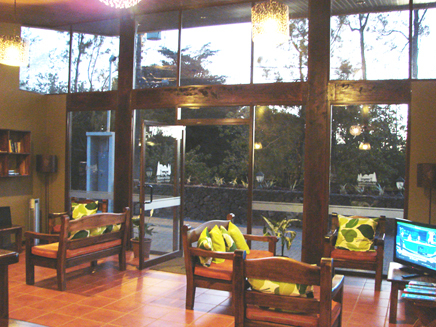 This style of construction was brought by the first coffee exporters that were influenced by the wave of Victorian style of that time. 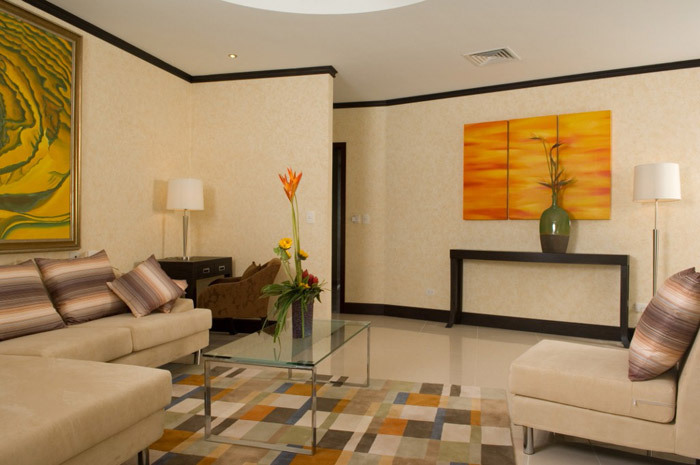 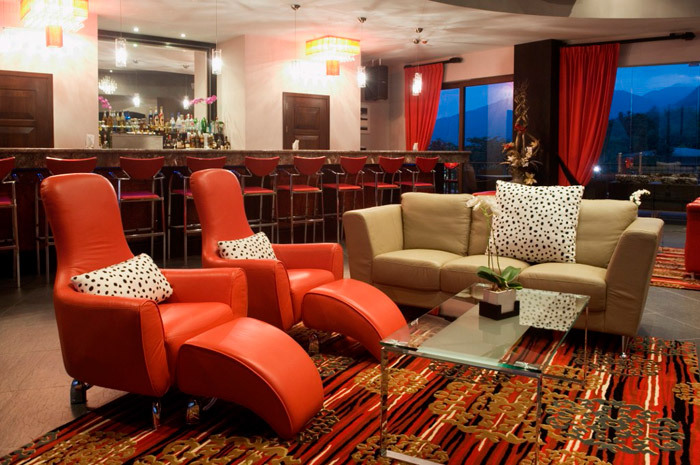 The warmth and elegance of the building is complemented by the best, most comfortable and modern furnishings. 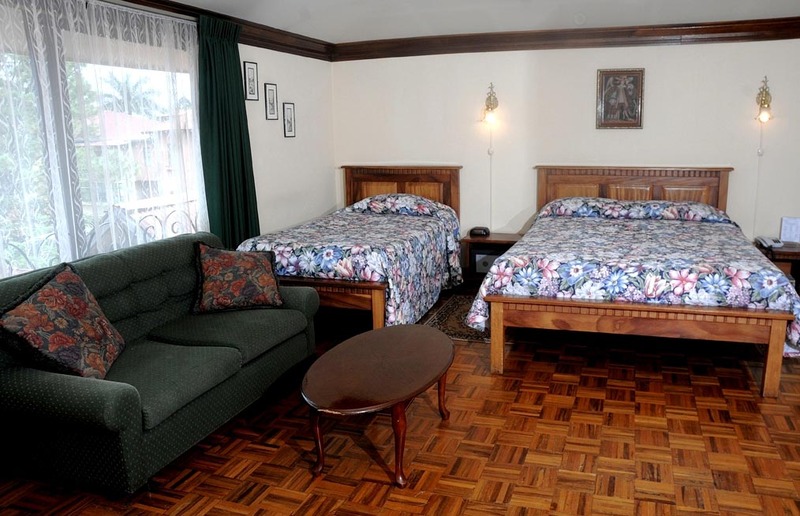 The hotel has 10 rooms in 4 different styles: Standard Room, Junior Suite, Executive Suite and Family Suite, all equipped with air conditioning and private bathroom. 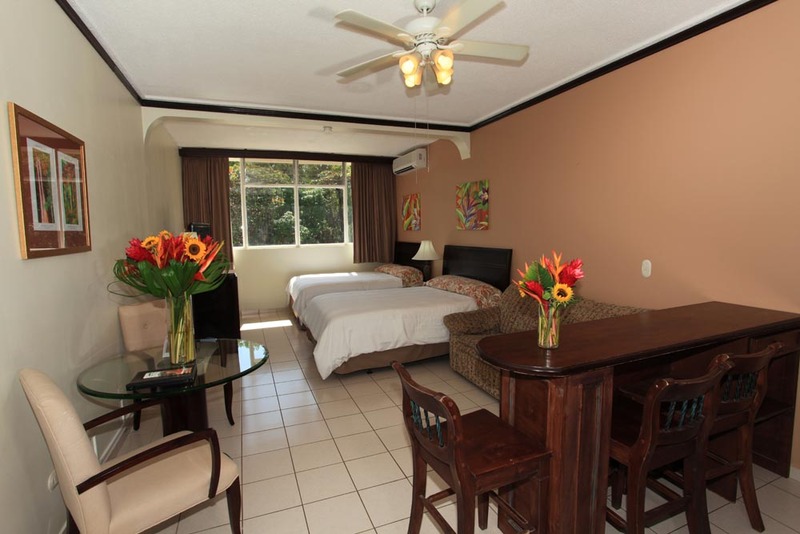 In addition to being perfectly located in a quiet and safe area, the Hotel Villa Los Candiles is very close to the main business centers, hospitals and shopping centers. 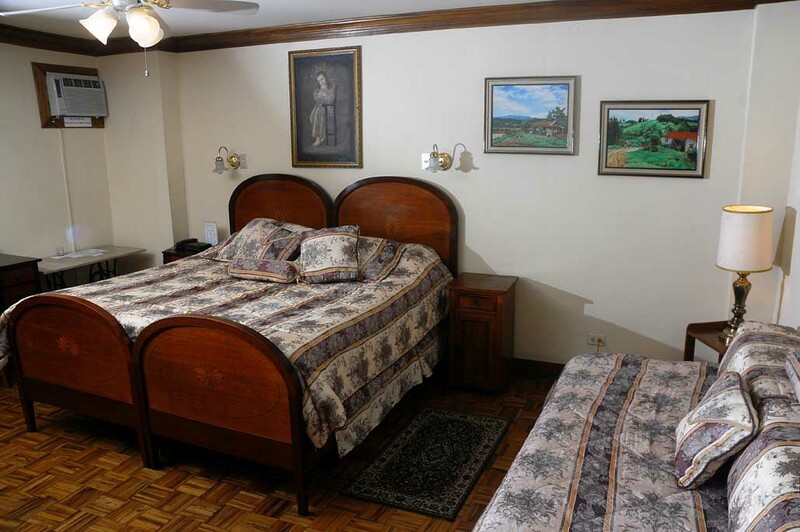 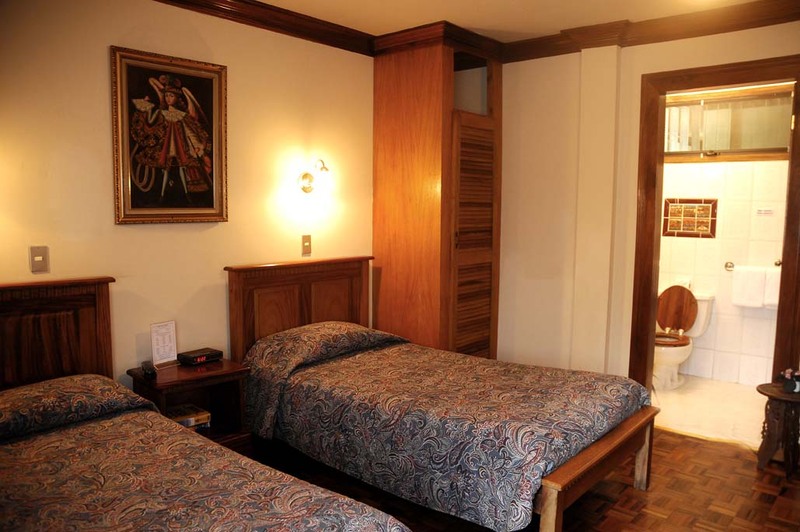 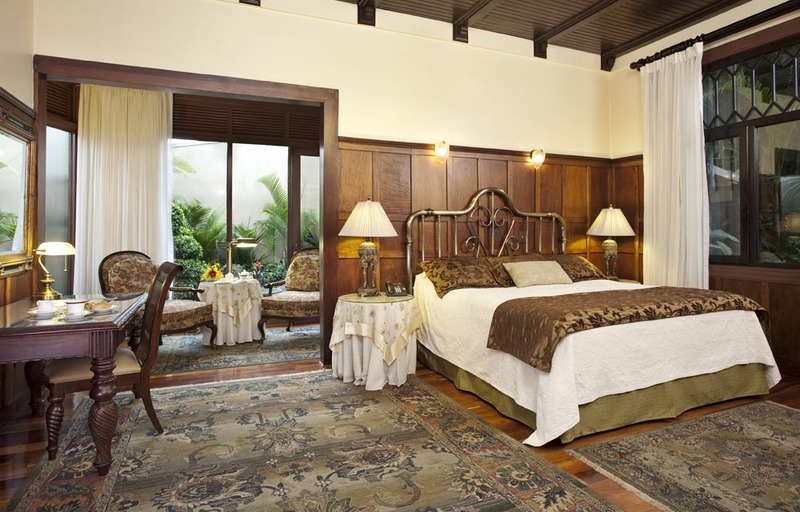 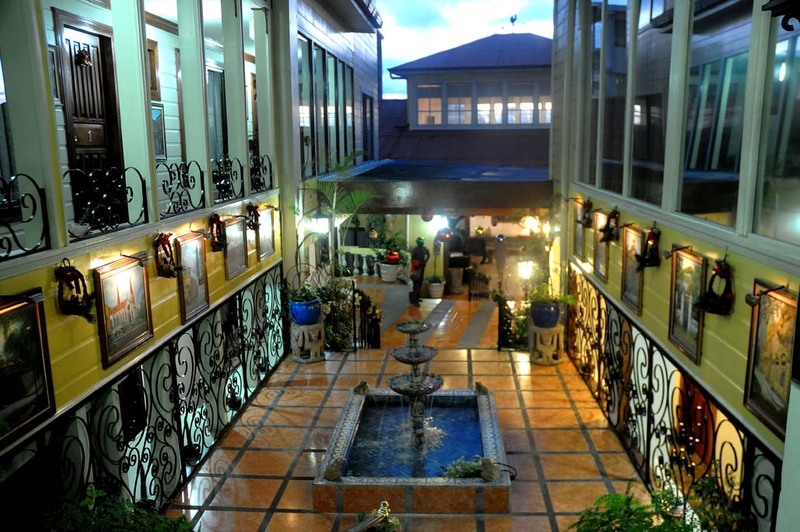 Located in the oldest historical section of San José,the ‘Four Star’ Hotel Don Carlos is a small, but significant part of Costa Rica’s rich heritage. 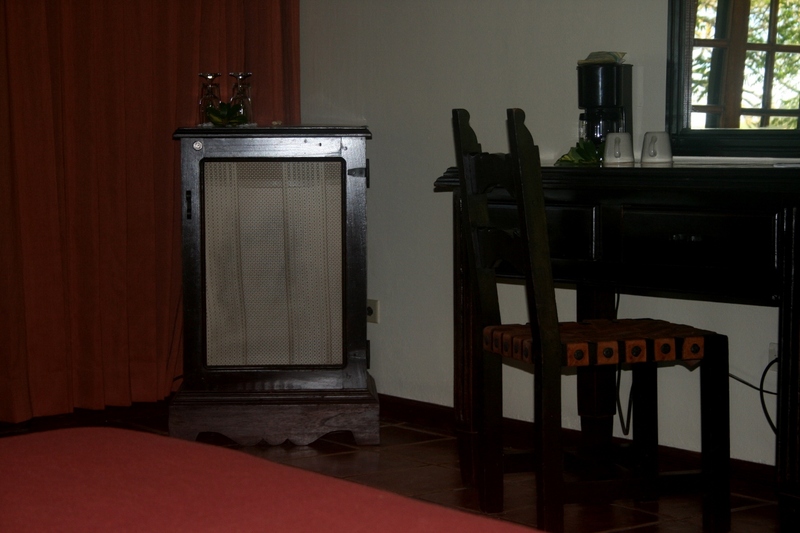 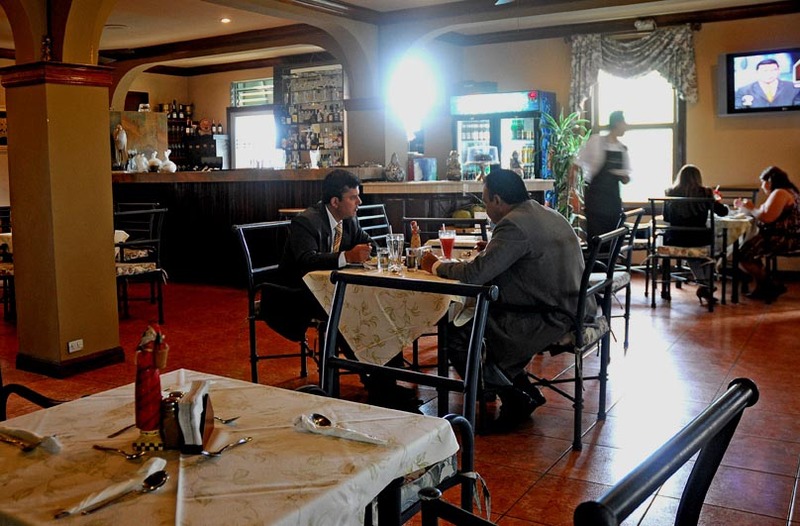 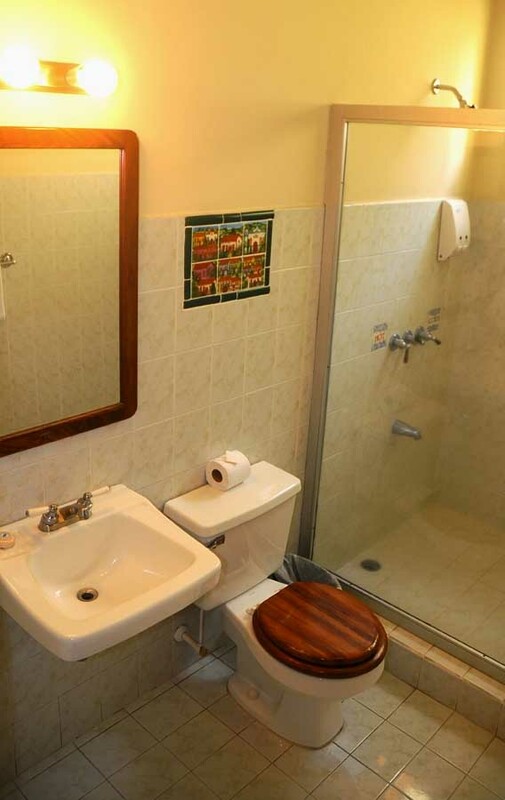 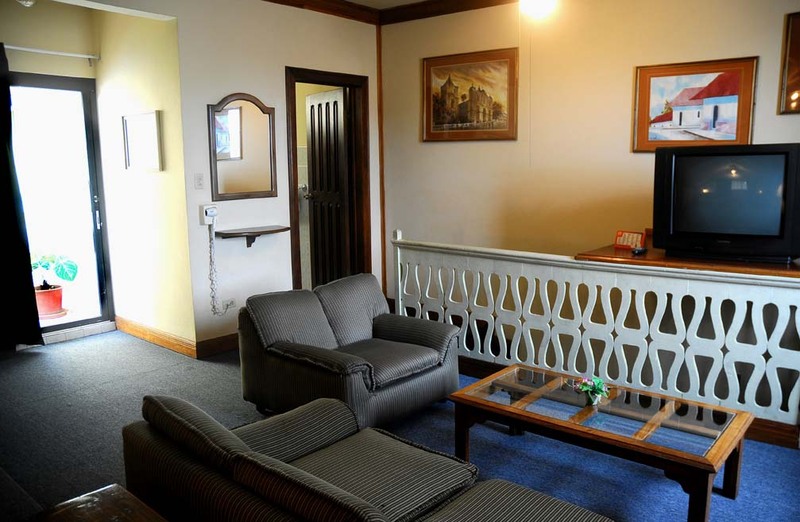 The hotel is well known for its courteous English speaking service and thirty-three, comfortably appointed rooms. 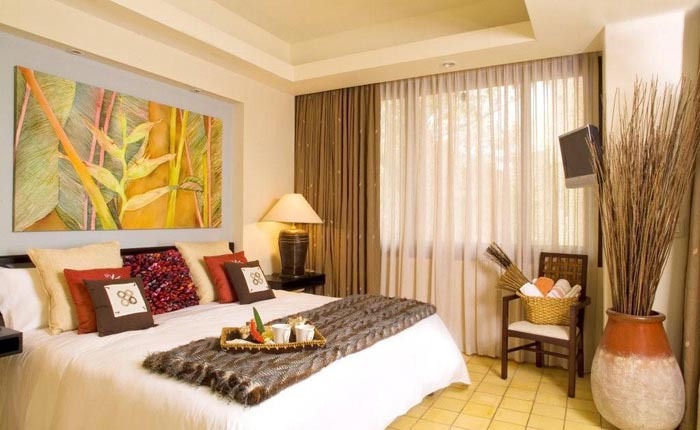 Best of all, it’s within minutes of downtown, the Zoo, the pre-Columbian Jade Museum, the National Museum, the Gold Museum, a variety of interesting and beautiful city parks and of course a wide selection of restaurants, casinos, nightlife and the spirit of San José.